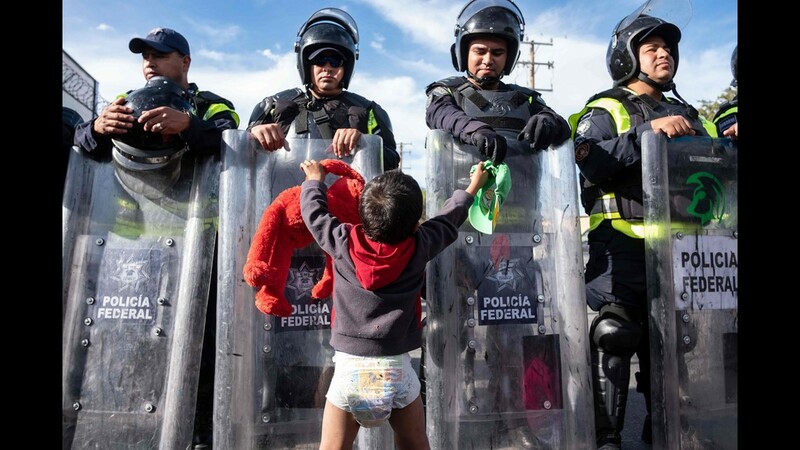 Women, men and children are stopped by Mexican Federal Police after they tried to peacefully march to the El Chaparral pedestrian point of entry on Nov. 29, 2018 in Tijuana, Baja California, Mexico. 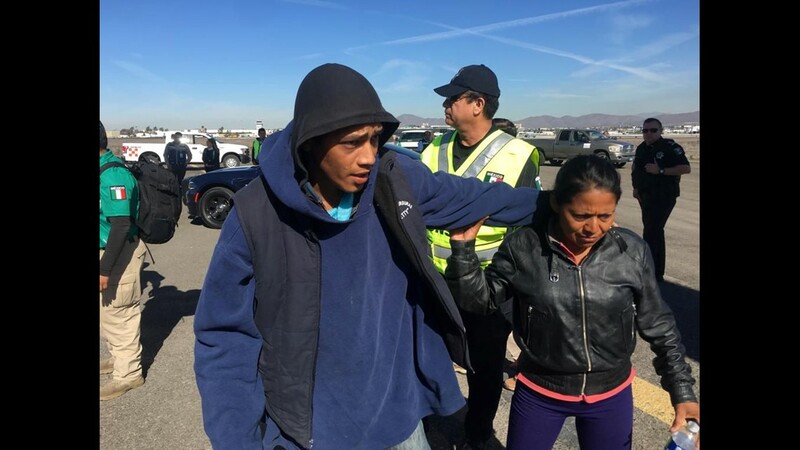 The group intended to call for a hunger strike to bring changes to the current protocols of asylum in the U.S.
An immigrant awakes while camped out outside a closed migrant camp on Dec. 5, 2018 from Tijuana, Mexico. Hundreds of members of the migrant caravan continue to stay outside the closed camp next to the U.S.-Mexico border fence. 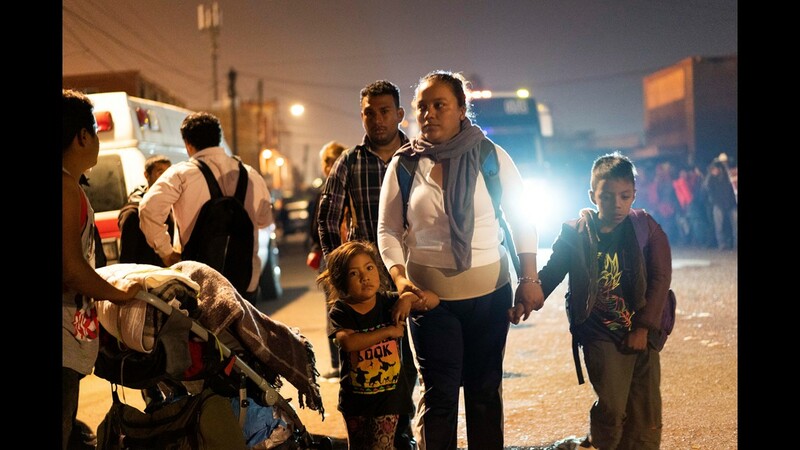 After traveling more than 6 weeks from Central America, thousands of immigrants from the migrant caravan remain in Tijuana, many awaiting asylum interviews and others deciding whether to cross illegally into the United States. 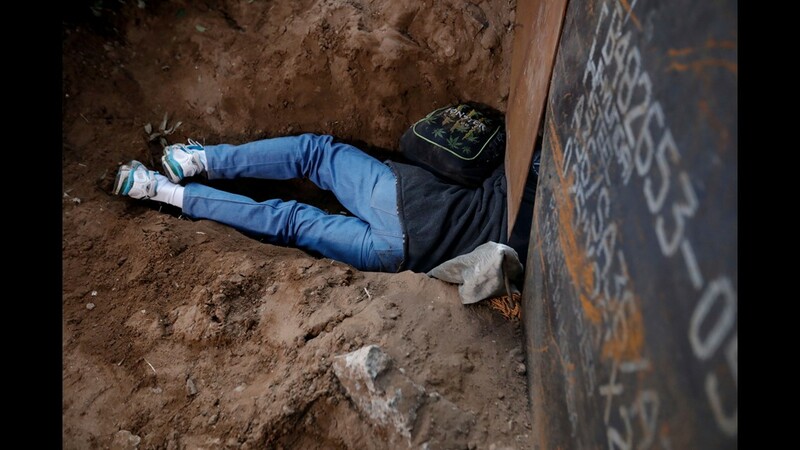 A Honduran migrant crawls through a hole under the U.S. border fence in Playas de Tijuana, Mexico, Tuesday, Dec. 4, 2018. 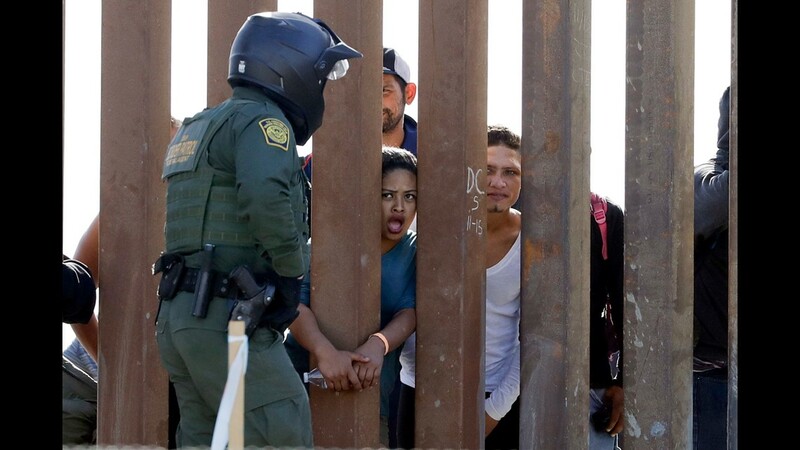 Discouraged by the long wait to apply for asylum through official ports of entry, many Central American migrants from recent caravans are choosing to cross the U.S. border wall and hand themselves in to border patrol agents. 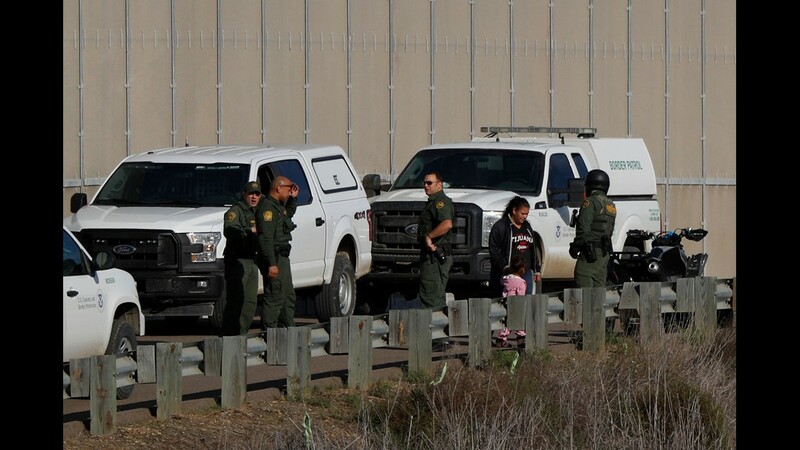 Honduran migrant Rachel Rivera, 19, and her 3-year-old daughter Charlot Andrea are detained by U.S. border patrol after they crossed under the U.S. border wall from Playas de Tijuana, Mexico, Tuesday, Dec. 4, 2018. 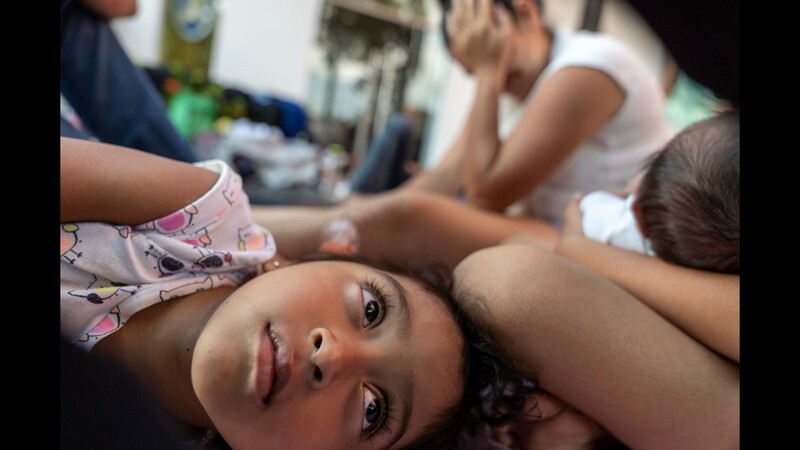 Weeping as she stayed behind in Tijuana with her Mexican husband, Rivera's mother Yesenia said her daughter and granddaughter had joined the migrant caravan to flee an abusive husband back in Honduras. 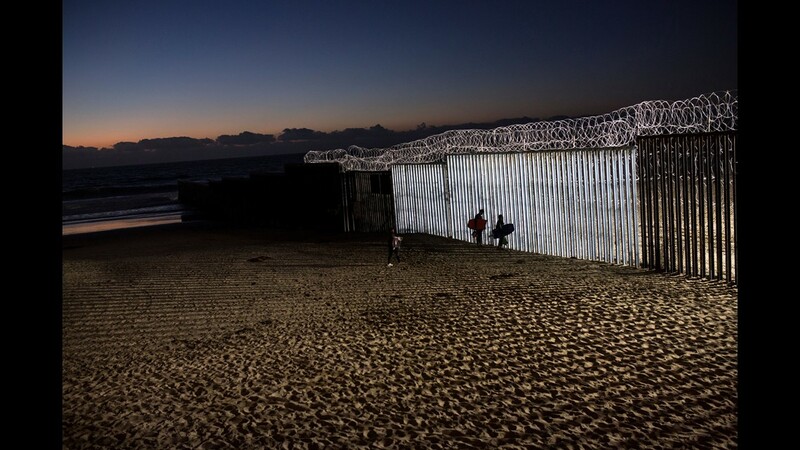 Tourists visit the beach alongside the U.S. border wall in Playas de Tijuana, Mexico, Tuesday, Dec. 4, 2018. Children part of the Central American migrants caravan, play on the street, while camping near a closed temporary shelter a few meters from the US-Mexico border in Tijuana, Baja California State, Mexico, Dec. 4, 2018. 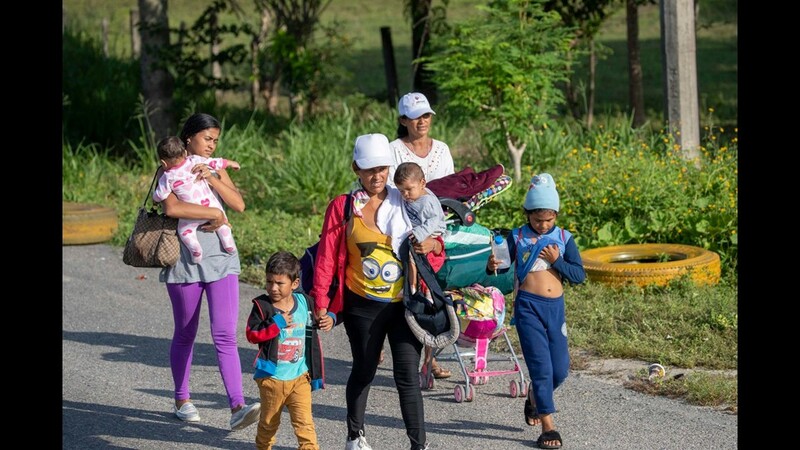 Thousands of Central American migrants, mostly Hondurans, have trekked for over a month in the hopes of reaching the United States. 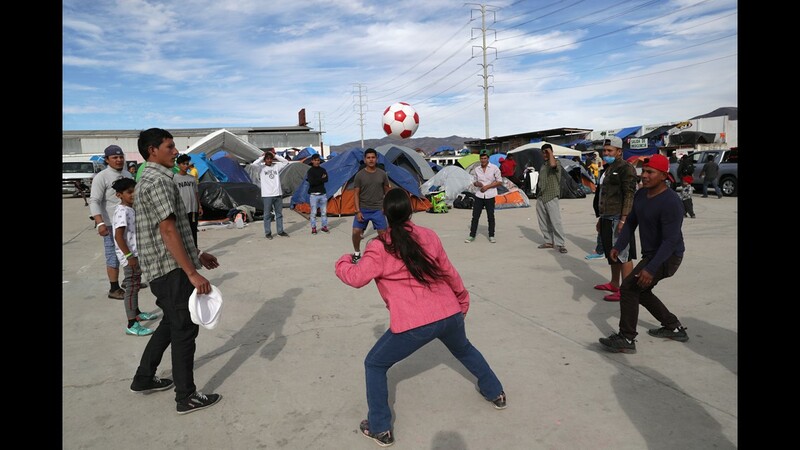 Immigrants spend the afternoon at the Barretal migrant camp on Dec. 4, 2018 from Tijuana, Mexico. 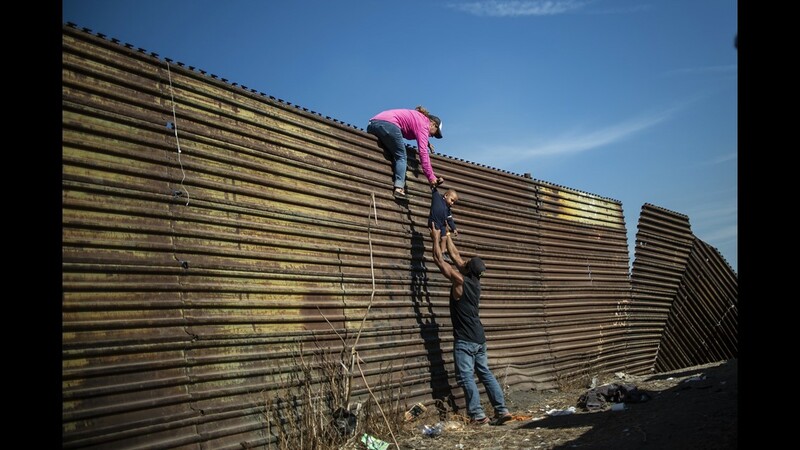 A man pulls himself up onto the U.S. border wall as he and other migrants climb over to San Ysidro, Calif., in order to surrender to the U.S. Border Patrol, in Playas de Tijuana, Mexico, Monday, Dec. 3, 2018. 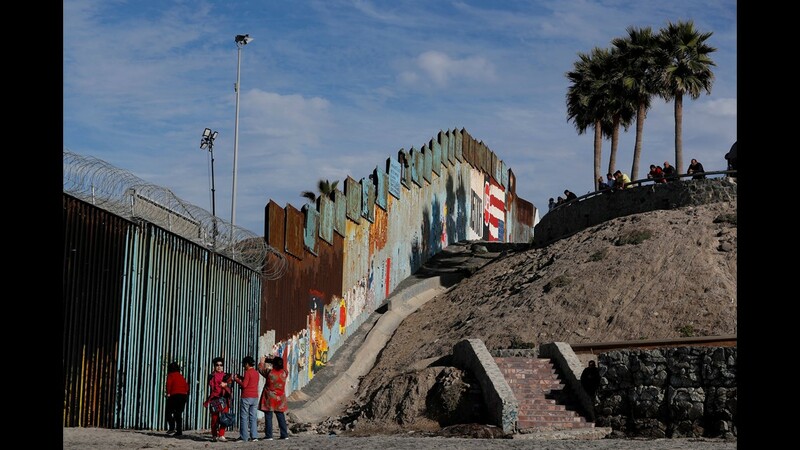 Nearly 150 Central American migrants seeking political asylum in the United States are detained by the Border Patrol, after entering the US through the Rio Grande, along the border with Ciudad Juarez, Chihuahua state, Mexico, on Dec. 3, 2018. Migrants depart on a bus from a temporary shelter where they were staying, on their way to a new shelter on the eastern side of the city, on Nov. 30, 2018 in Tijuana, Mexico. 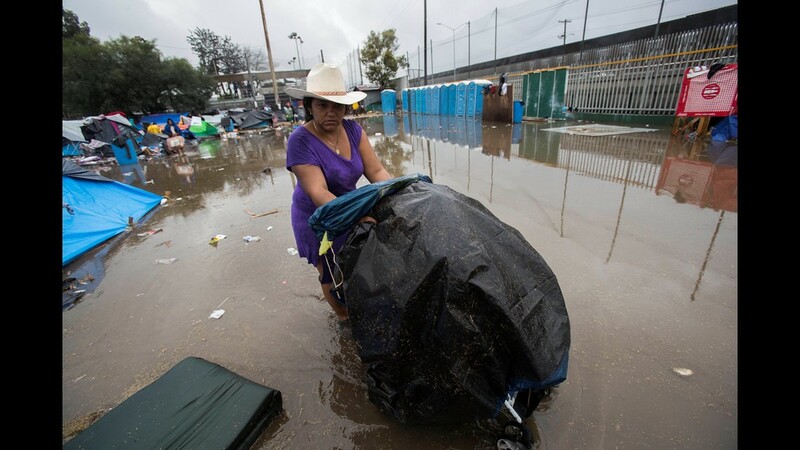 Rains yesterday in Tijuana brought flooding to sections of the old shelter, which is located in a soccer complex. Officials hope to re-locate at least 3,000 of the migrants, many from the 'migrant caravan', to the new shelter. 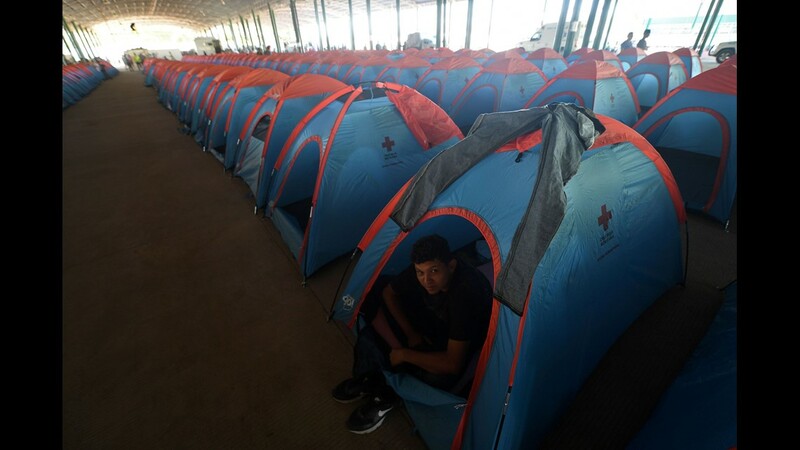 Around 6,000 migrants from Central America were crowded into the original shelter which was intended to hold 3,000. 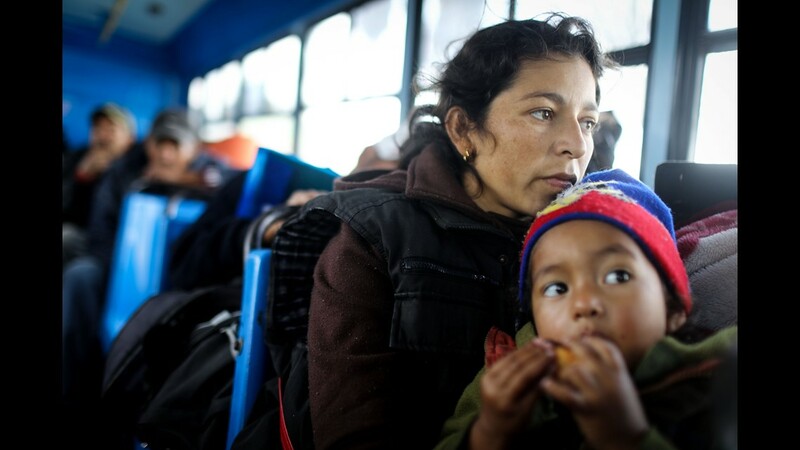 A migrant mother and daughter from Honduras depart on a bus from a temporary shelter where they were staying, on their way to a new shelter on the eastern side of the city, on Nov. 30, 2018 in Tijuana, Mexico. 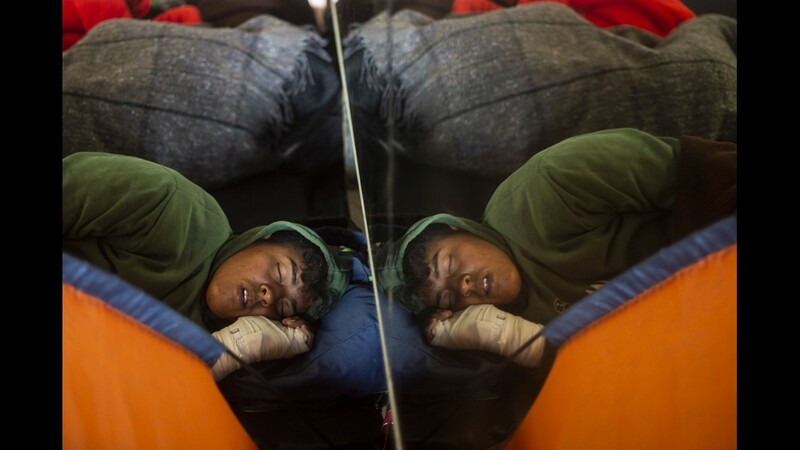 Central American migrants -mostly from Honduras- traveling in a caravan to the United States, rest after being relocated at a new temporary shelter in east Tijuana, Baja California State, Mexico, in the border with the US on Nov. 30, 2018. 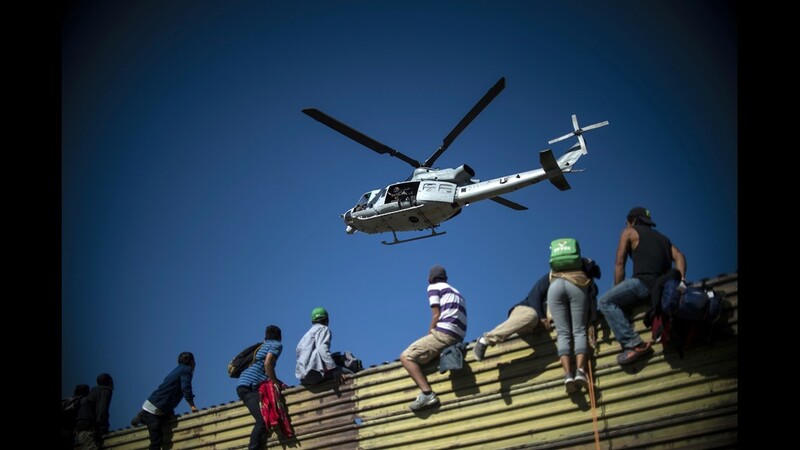 Members of the US border patrol take part in a drill in Sundland Park, United States, on Nov. 30, 2018, as seen from Tijuana, in the Mexico-US border. 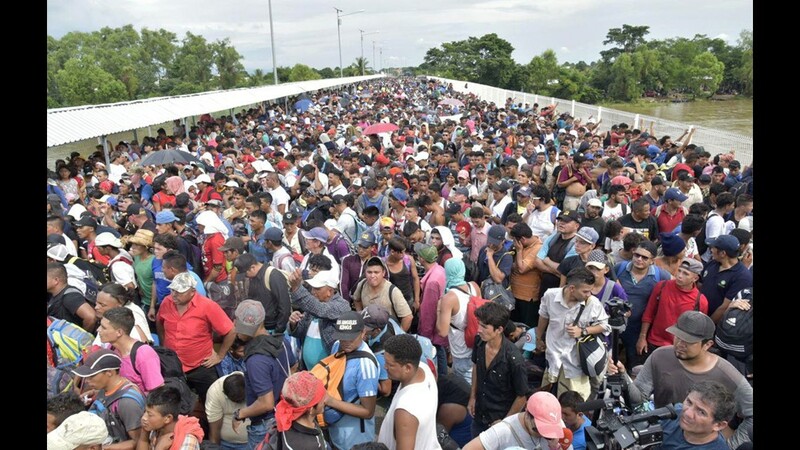 - Approximately 5,600 active-duty troops -part of a contentious mission ordered by President Donald Trump- are currently supporting to assist short-handed border patrol agents deal with the arrival of large groups of migrants in so-called "caravans". 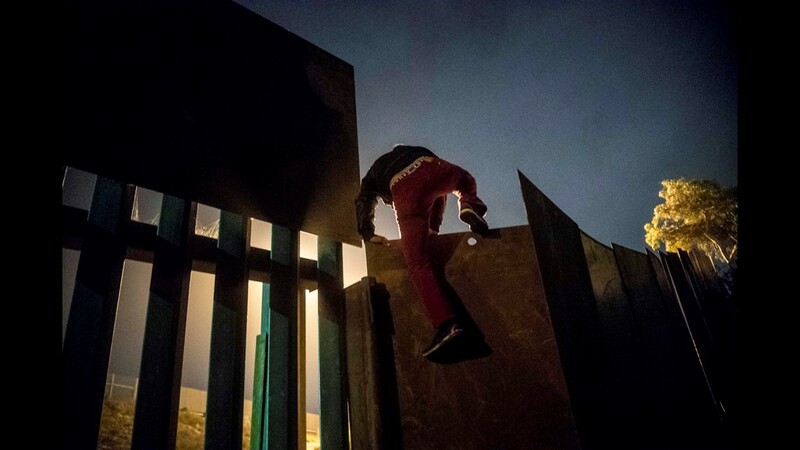 A Central American migrant who trekked for over a month across Central America and Mexico with a caravan in the hopes of reaching the United States, climbs the US-Mexico border fence to cross illegally from Playas de Tijuana, Baja California State, Mexico, to San Diego, Calif., US, on Nov. 30, 2018. 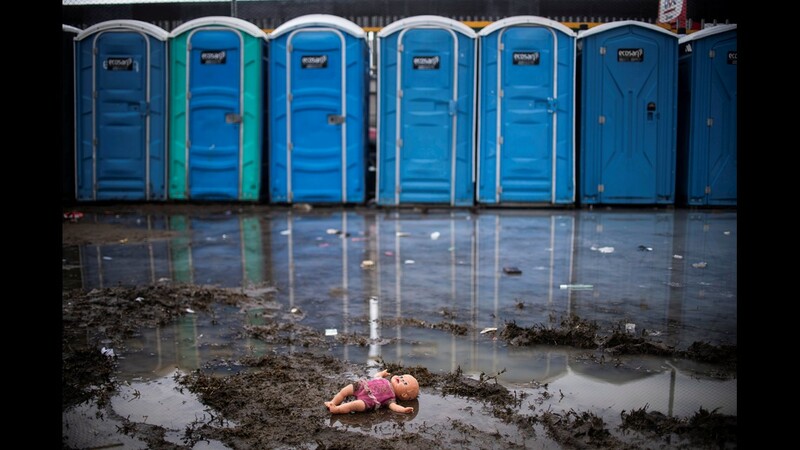 A doll is seen next to chemical toilets at a temporary shelter where Central American migrants trying to reach the US are staying in Tijuana, Baja California State, Mexico, in the border with the US, on Nov. 29, 2018. 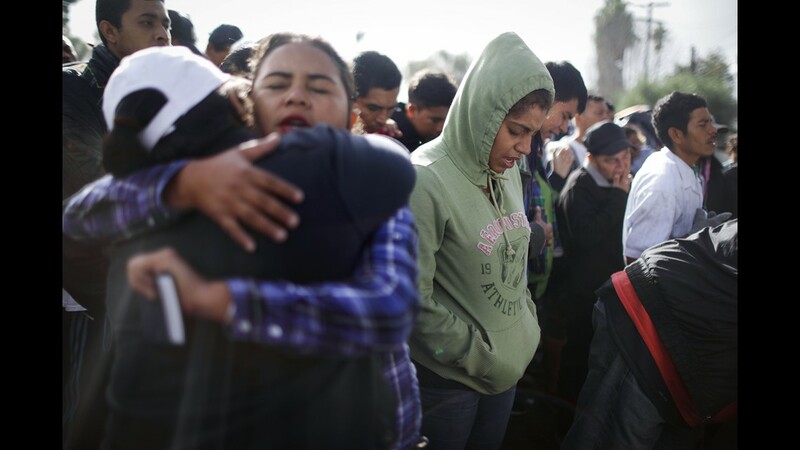 Migrants worship during a street prayer outside the Benito Juarez temporary shelter on Nov. 30, 2018 in Tijuana, Mexico. 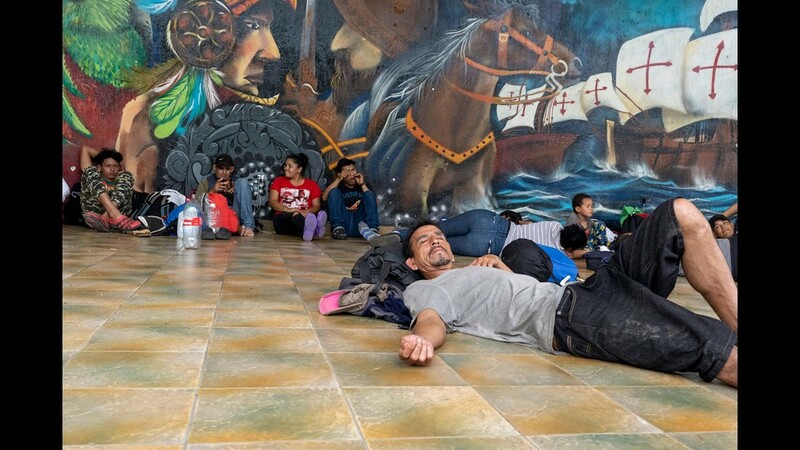 Migrants in a shelter in the border city of Tijuana, Mexico on Nov. 29, 2018. 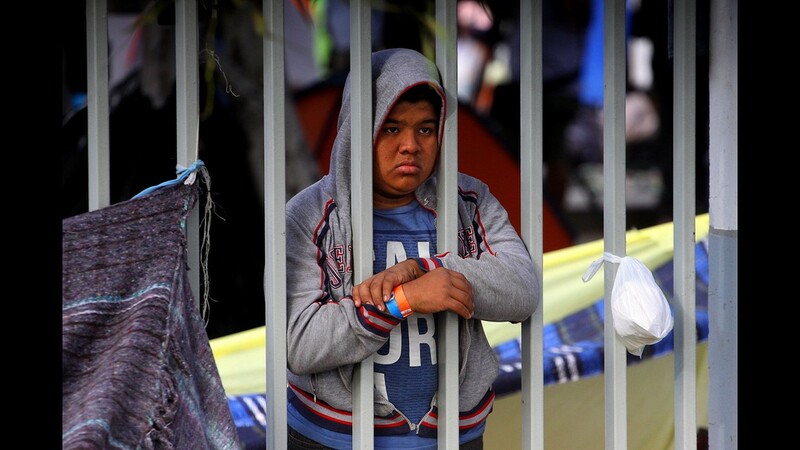 Migrants stationed in the Mexican city of Tijuana today announced a hunger strike starting on Thursday, as a form of pressure to request that the United States Government increase the number of asylum requests that it processes daily. A migrant women carries her belongings through water using a baby carrier at the Benito Juarez sports complex in Tijuana, Mexico on Nov. 29, 2018. 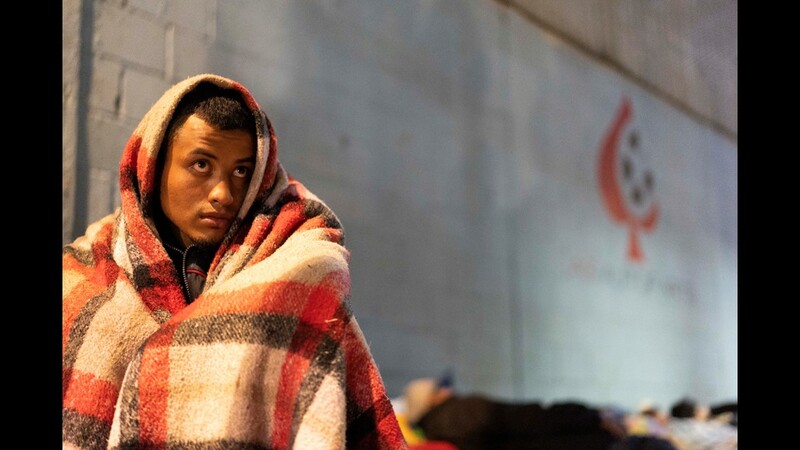 A migrant man from El Salvador contemplates his situation at the Benito Juarez sports complex in Tijuana, Mexico on Nov. 29, 2018. 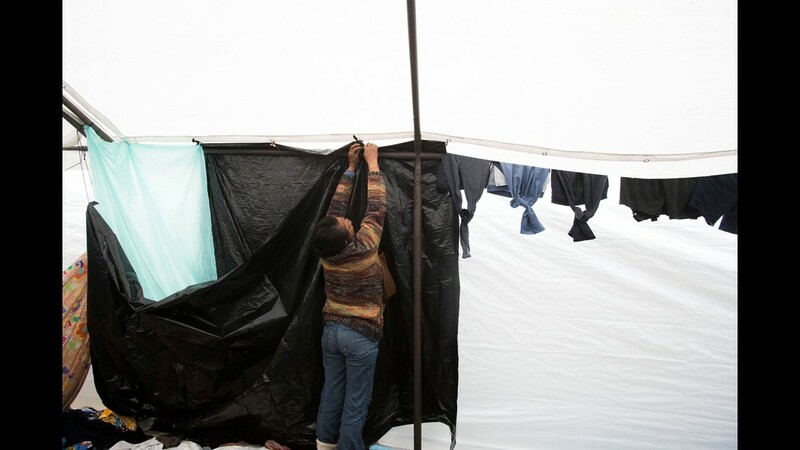 A migrant man uses a tarp to try to prevent more water from entering his tent at the Benito Juarez sports complex in Tijuana, Mexico on Nov. 29, 2018. 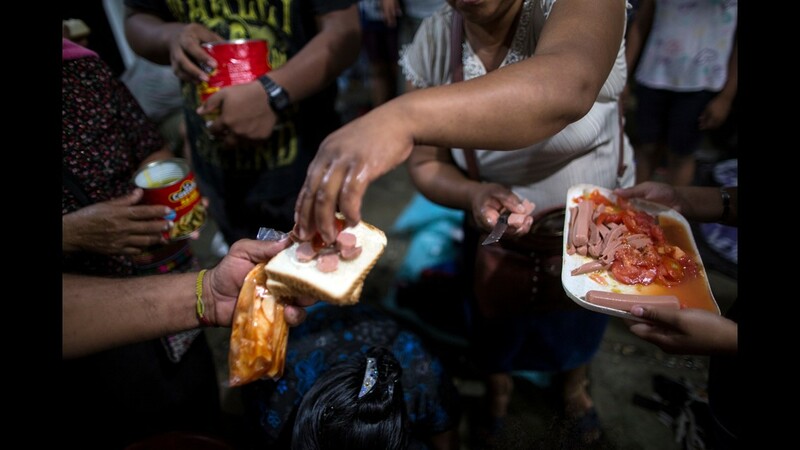 Migrant men line up for food as they try to stay dry using anything possible at the Benito Juarez sports complex in Tijuana, Mexico on Nov. 29, 2018. 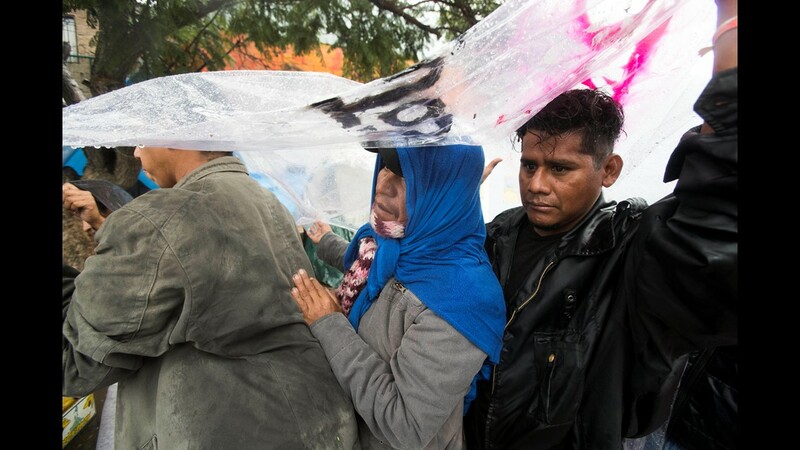 A migrant woman tries to stop the rain from entering her living area at the Benito Juarez sports complex in Tijuana, Mexico on Nov. 29, 2018. 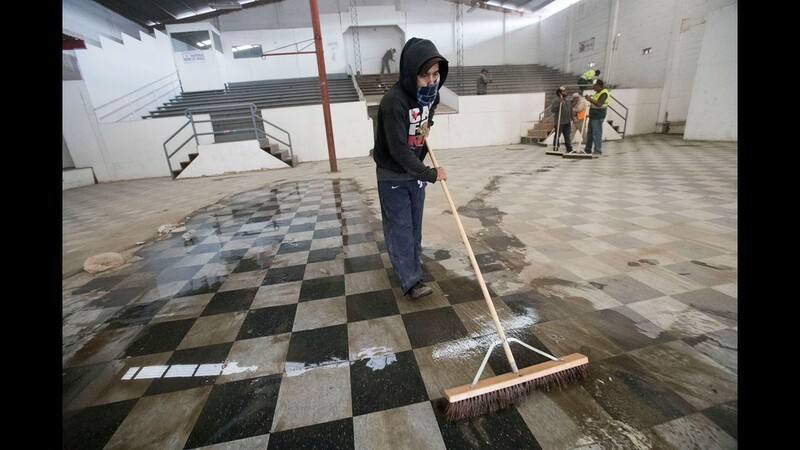 Crews clean up a building where a second shelter may be opened for the caravan migrants on Nov. 28, 2018. If the migrants agree to move to the new shelter, they would be moved 11 kilometers from the San Ysidro Port of Entry to the new shelter. 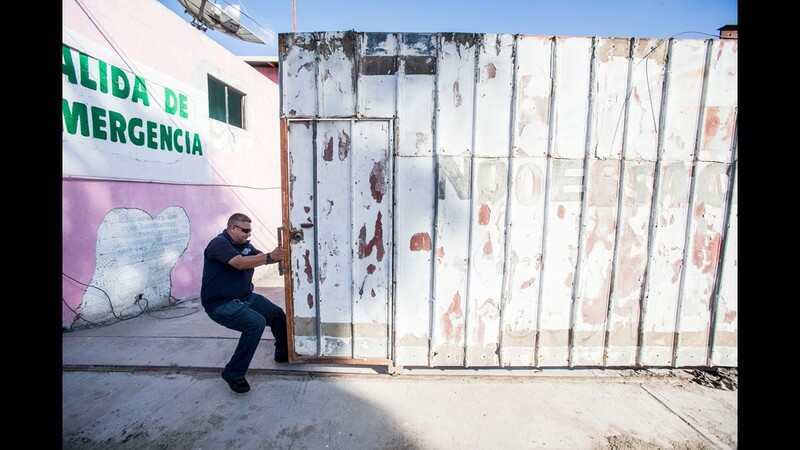 A Tijuana municipal employee keeps members of the press from entering what could be the second shelter for the caravan migrants on Nov. 28, 2018. 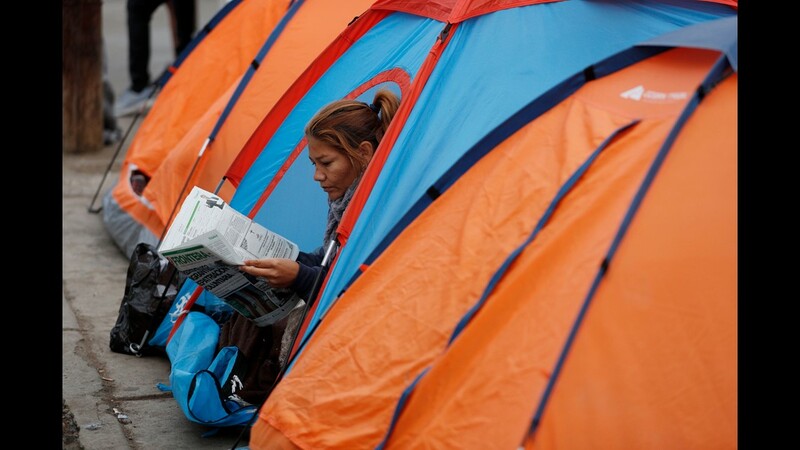 A woman reads a newspaper inside her tent as migrants camp out on the street outside an overflowing sports complex on Nov. 28, 2018, where more than 5,000 Central American migrants are sheltering in Tijuana, Mexico. A migrant, part of the migrant caravan, crosses a flooded area after bathing at a sports complex on Nov. 28, 2018, where more than 5,000 Central American migrants are sheltering in Tijuana, Mexico. 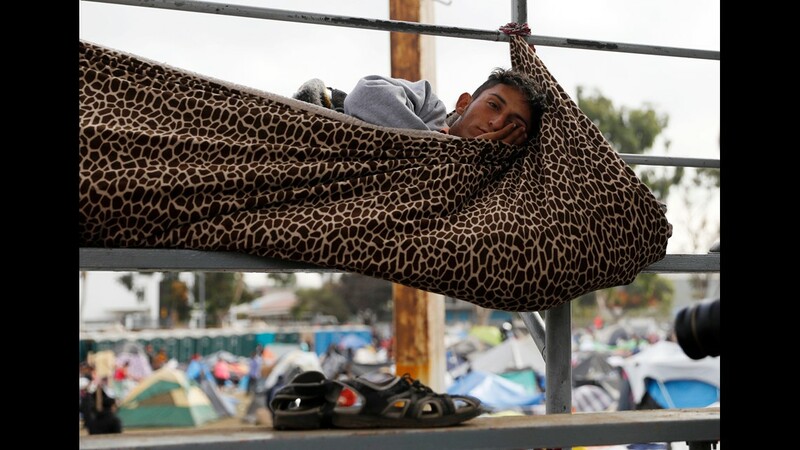 A migrant rests inside a blanket cocoon tied to keep him from rolling off the spectator stands while sleeping, at a sports complex on Nov. 28, 2018, where more than 5,000 Central American migrants are sheltering, in Tijuana, Mexico. 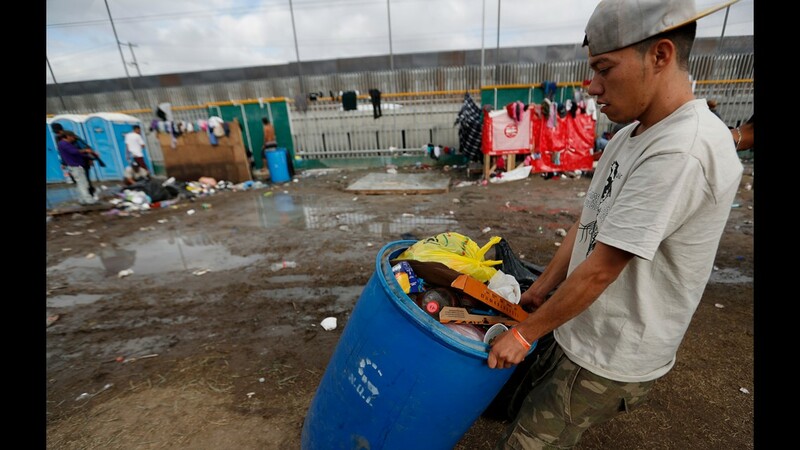 A migrant volunteer hauls trash out past a muddy section inside an overflowing sports complex on Nov. 28, 2018, where more than 5,000 Central American migrants are sheltering, in Tijuana, Mexico. 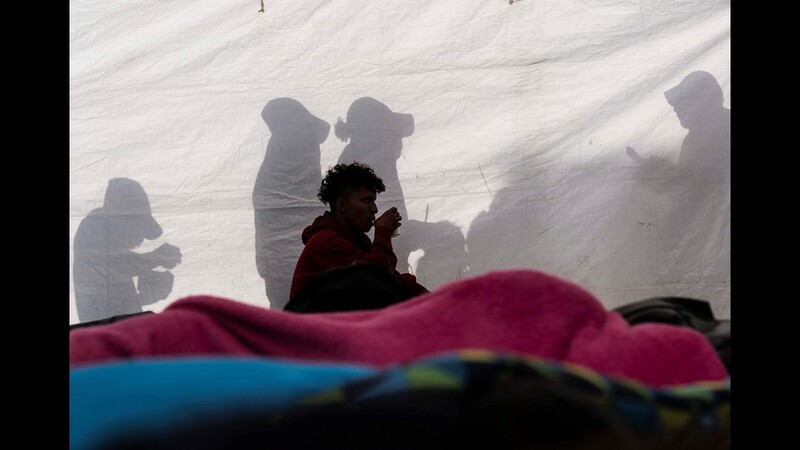 Migrants wait to receive donated food and water outside a temporary shelter set up on Nov. 28, 2018, in Tijuana, Mexico. 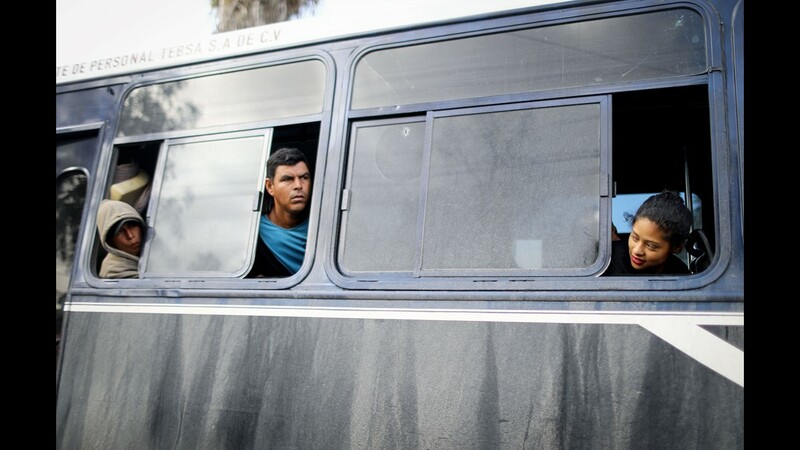 A migrant man listens to his peers on Nov 26, 2018, as they discuss the possibility of returning back to Honduras outside the Benito Juarez shelter, which houses more than 5000 migrants in Tijuana, Mexico. Central American migrants, mostly from Honduras, arrive at a temporary shelter in Tijuana, Baja California State, Mexico, at the US-Mexico border on Nov. 27, 2018. Honduran migrants are escorted to a Mexican Federal Police airplane in Tijuana, Mexico that is headed to Mexico City where they will be processed for repatriation to Honduras on Nov. 27, 2018. 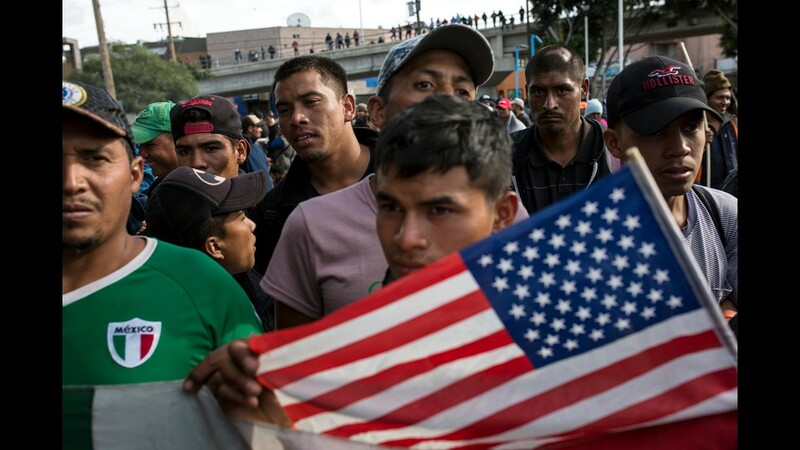 The migrants were part of the migrant caravan that arrived in the city of Tijuana, Mexico but decided to voluntarily return to their country. 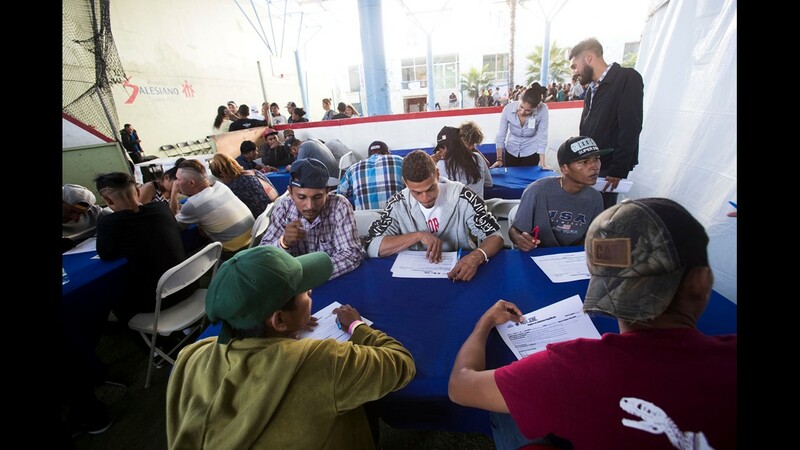 Migrants from Honduras fill out work applications on Nov. 27, 2018, during a job fair sponsored by the Tijuana Municipal Government for those migrants wishing to remain in Tijuana, Mexico. A migrant man listens to Honduran ambassador to Mexico, Alden Rivera Montes on Nov. 27, 2018, during a job fair sponsored by the Tijuana Municipal Government for those migrants wishing to remain in Tijuana, Mexico. 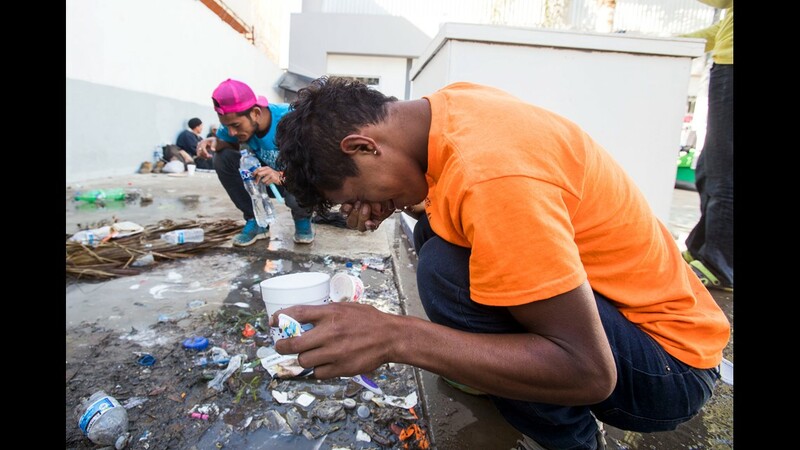 A migrant washes his teeth at the Benito Juarez sports complex shelter, Nov. 27, 2018, in Tijuana, Mexico. 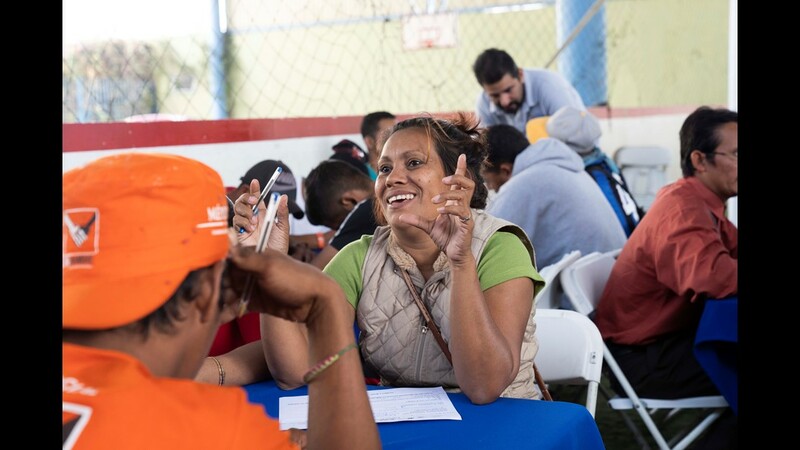 The shelter has a maximum capacity of housing 3000 and is currently housing 5851 migrants inside the sports complex turned shelter. 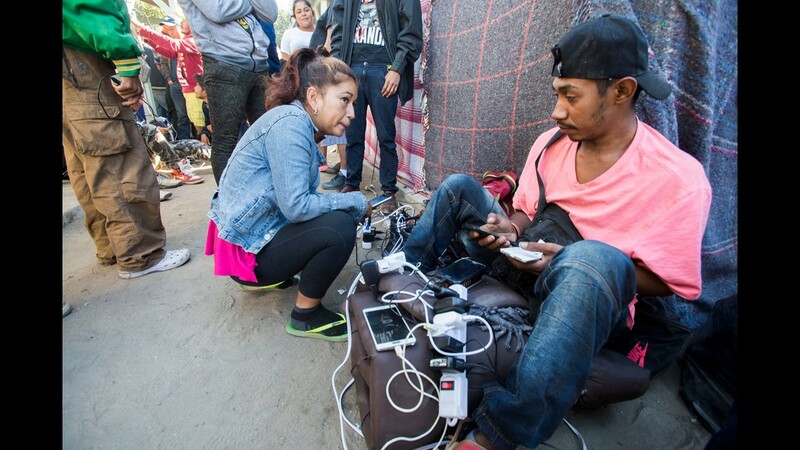 Migrants charge their phone batteries at the Benito Juarez sports complex shelter, which is housing more than 5000 migrants in the city of Tijuana, Mexico on Nov. 27, 2018. Migrants wash their face and brush their teeth at the only water station in the Benito Juarez sports complex shelter, Nov. 27, 2018, in Tijuana, Mexico. 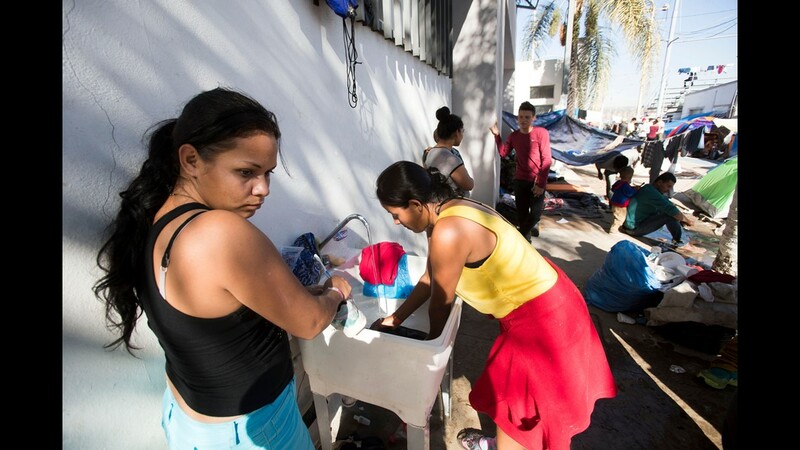 Women and men take turns to wash clothes in one of two sinks at the Benito Juarez sports complex shelter, Nov. 27, 2018, in Tijuana, Mexico. 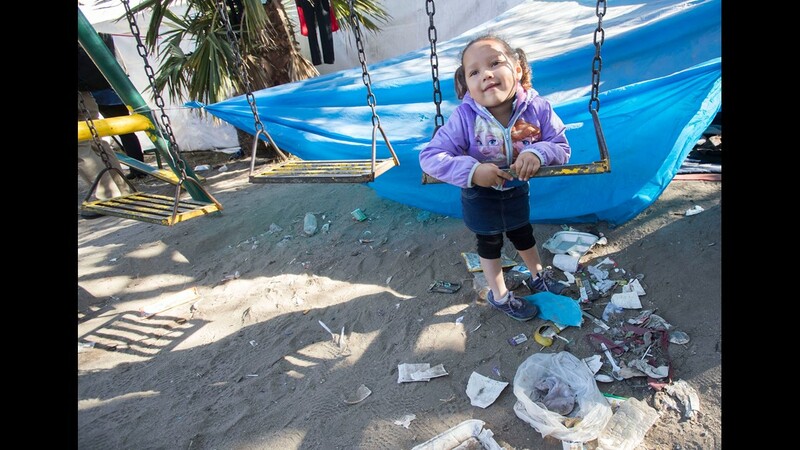 Marbella Figueroa, a three-year-old, plays on a swing as thrash sits at her feet at the Benito Juarez sports complex shelter, Nov. 27, 2018, in Tijuana, Mexico. 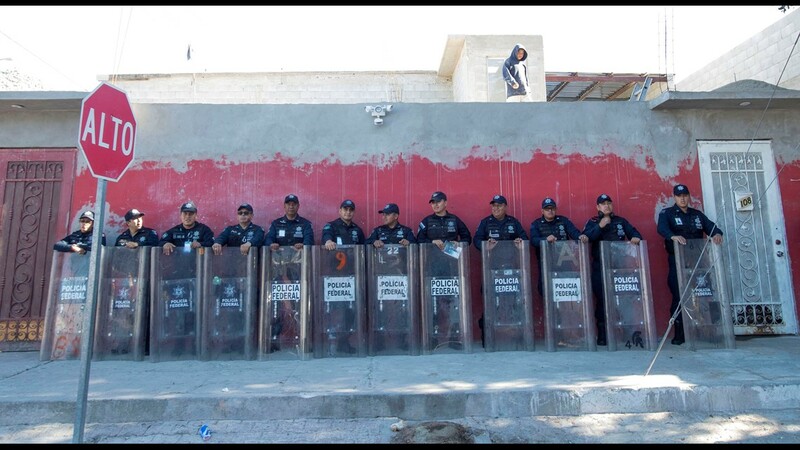 Mexican Federal Police await two blocks away from the Benito Juarez sports complex shelter, Nov. 27, 2018, in Tijuana, Mexico. 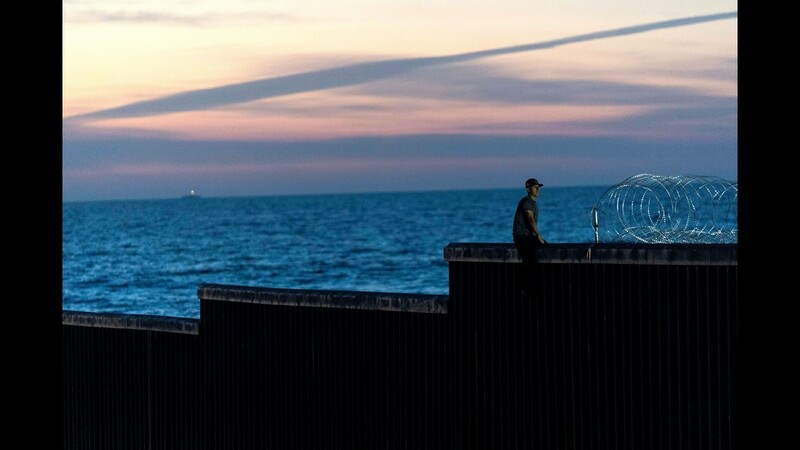 U.S. Border Patrol agents stand watch on the U.S. side of the U.S.-Mexico border fence on Nov. 26, 2018 in Tijuana, Mexico. Marlen Castillo looks for head lice on her daughter, Belen, while they stand in line to receive food at the Benito Juarez Sports Center in Tijuana, Mexico on Nov. 26, 2018. 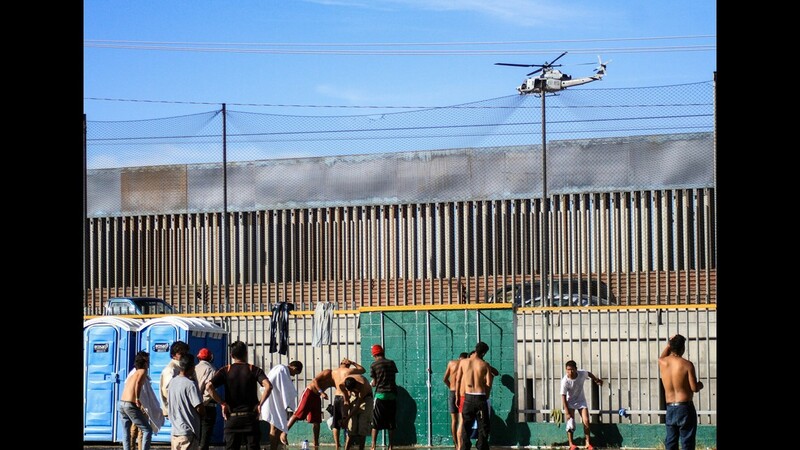 Central American migrants wanting to reach the United States, remain at a temporary shelter in Tijuana, Baja California State, Mexico, near the US-Mexico border fence, on Nov. 26, 2018. 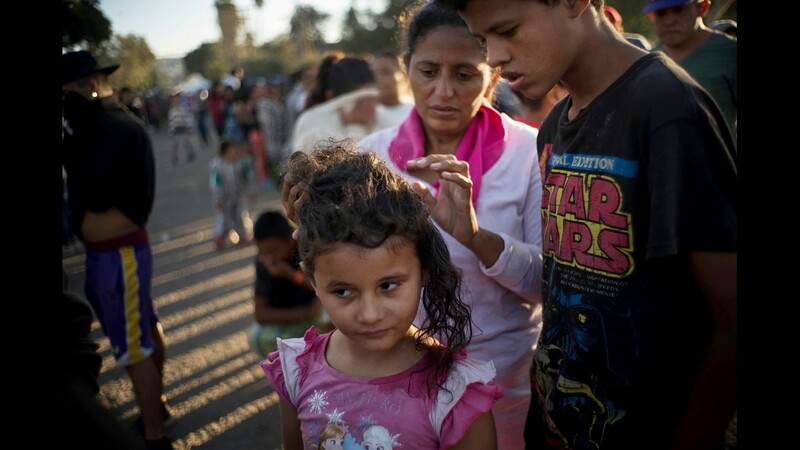 Members of the International Organization of Migration, right, speak with people wishing to return to their Central American countries on Nov. 26, 2018, in Tijuana, Mexico. 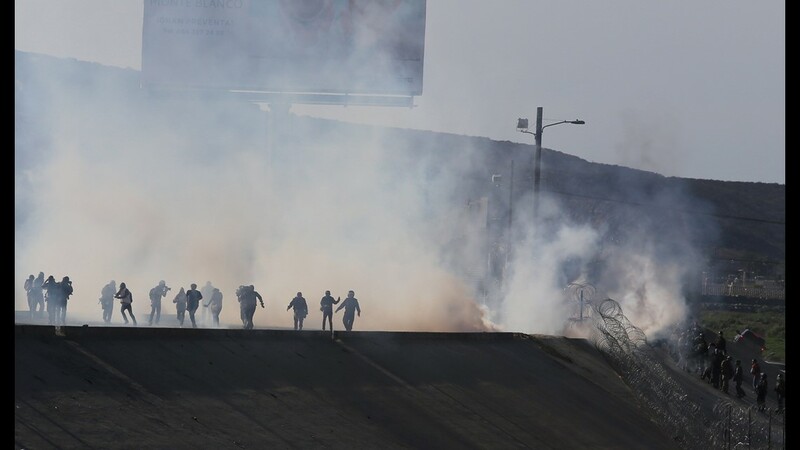 Tear gas is used by border police to prevent groups of people from crossing El Chaparral, in Tijuana, Mexico, Nov. 25, 2018. 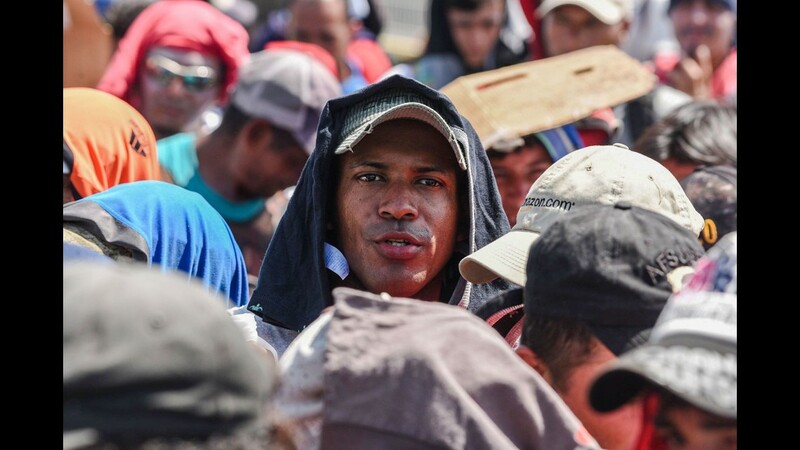 A group of migrants from the caravan of Central Americans who advanced towards the San Ysidro gateway deviated from the planned route to try to cross the border wall by other points. A group of Central American migrants cross the almost dry riverbed of the Tijuana River in an attempt to get to El Chaparral port of entry, in Tijuana, Mexico, near the U.S.-Mexico border on Nov. 25, 2018. A man traveling with a caravan of Central American migrants walks along a barricade set by the U.S. Border Patrol along the Tijuana River, near the El Chaparral border crossing in Tijuana, Mexico, on Nov. 25, 2018. 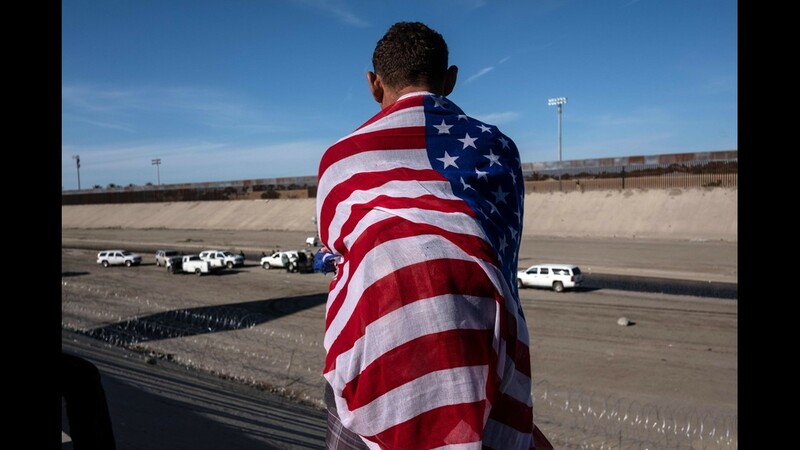 A Central American migrant wrapped in a U.S. flag looks at the almost dry riverbed of the Tijuana River near the El Chaparral border crossing near U.S.-Mexico border in Tijuana, Mexico, on Nov. 25, 2018. Mexican police block the way to Central American migrants wanting to reach the El Chaparral border crossing close to the Mexico-U.S. border, in Tijuana, Mexico, on Nov. 25, 2018. 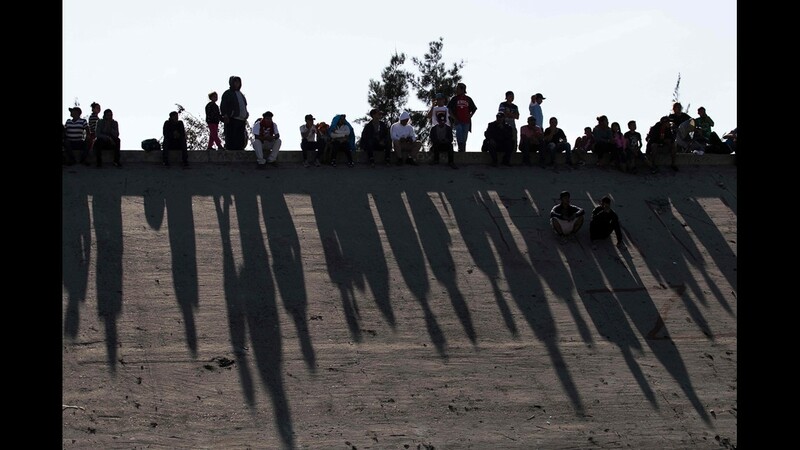 Central American migrants sit along the concrete waterway of the bordering Tijuana River right across the El Chaparral border crossing point in Tijuana, Mexico, on Nov. 25, 2018. Migrants from Central America yell through a border wall at a U.S. Border Patrol agent after he pulled down a banner on Nov. 25, 2018, in San Diego. A migrant wipes his face after U.S. border agents fired tear gas at a group of migrants who had pushed past Mexican police at the Chaparral border crossing in Tijuana, Mexico on Nov. 25, 2018. 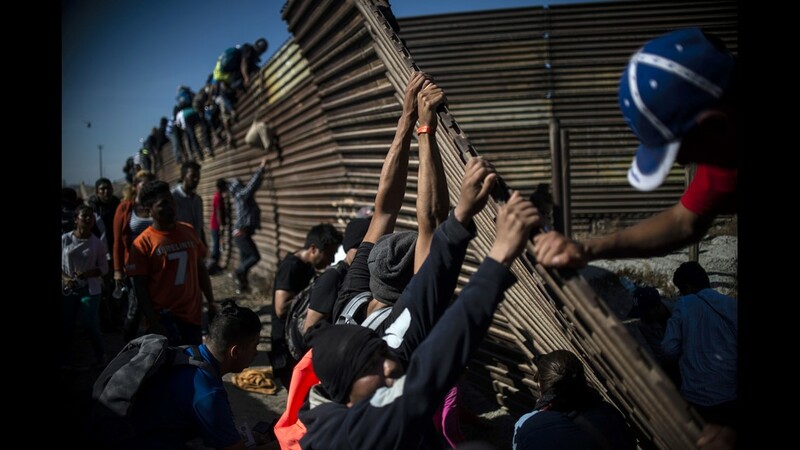 A group of Central American migrants climb the border fence between Mexico and the United States as others try to bring it down, near El Chaparral border crossing, in Tijuana, Baja California State, Mexico, on Nov. 25, 2018. 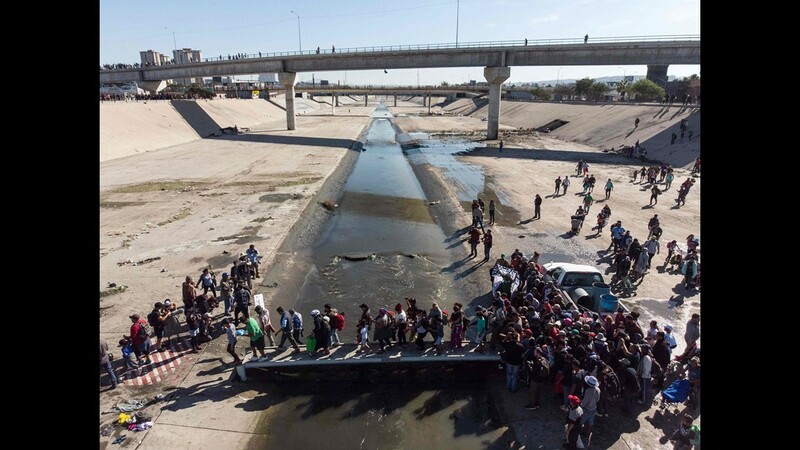 A group of Central American migrants cross the almost dry riverbed of the Tijuana River in an attempt to get to El Chaparral port of entry, in Tijuana, Baja California State, Mexico, near US-Mexico border on Nov. 25, 2018. .
A Central American migrant is stopped by U.S. agents who order him to go back to the Mexican side of the border, after a group of migrants got past Mexican police at the Chaparral crossing in Tijuana, Mexico on Nov. 25, 2018. 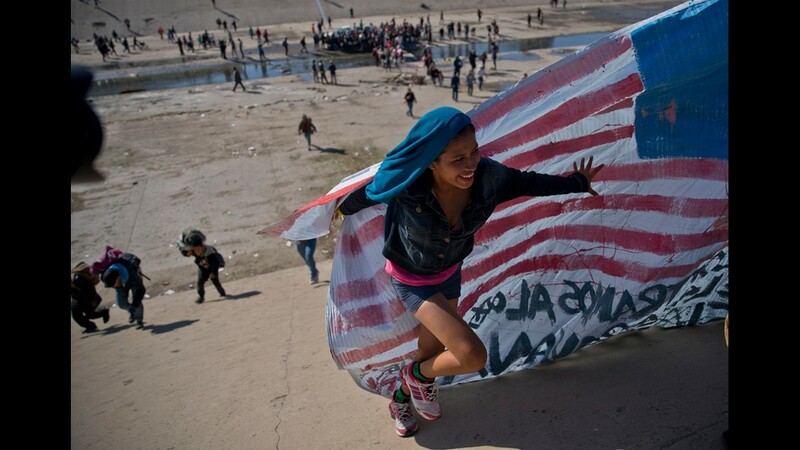 Migrants walk up a riverbank at the Mexico-U.S. border after pushing past a line of Mexican police at the Chaparral border crossing in Tijuana, Mexico, on Nov. 25, 2018, as they try to reach the U.S.
A migrant woman helps carry a handmade U.S. flag up the riverbank at the Mexico-U.S. border after getting past Mexican police at the Chaparral border crossing in Tijuana, Mexico, Sunday, Nov. 25, 2018, as a group of migrants tries to reach the U.S. 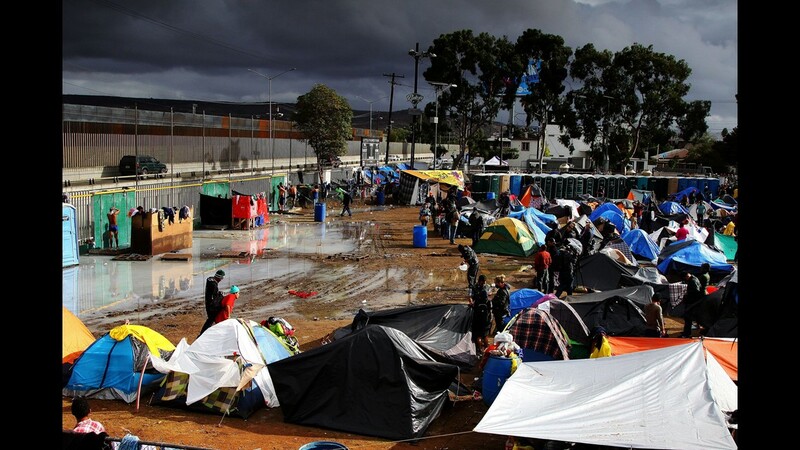 The mayor of Tijuana has declared a humanitarian crisis in his border city and says that he has asked the United Nations for aid to deal with the approximately 5,000 Central American migrants who have arrived in the city. 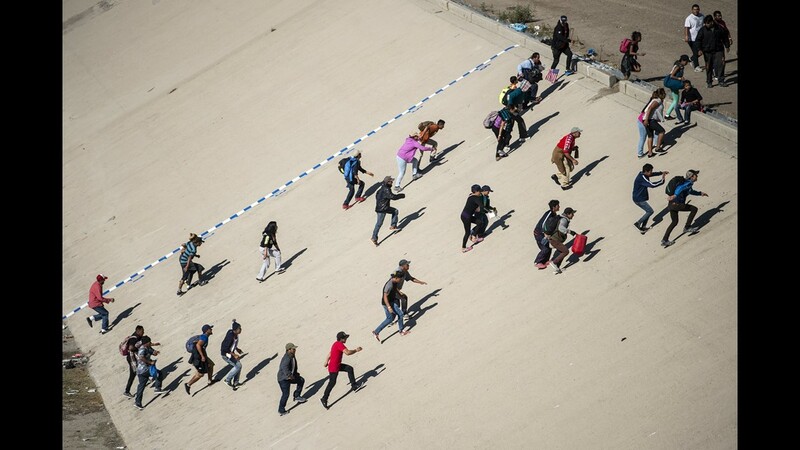 A group of Central American migrants run along the dry riverbed of the Tijuana River in an attempt to get to El Chaparral port of entry, in Tijuana, Mexico, near the US-Mexico border, Nov. 25, 2018. 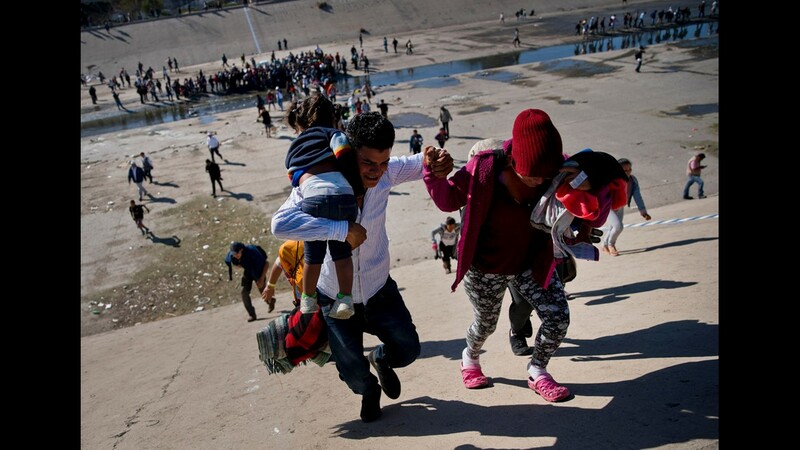 Hundreds of migrants attempted to storm a border fence separating Mexico from the U.S. on Sunday amid mounting fears they will be kept in Mexico while their applications for a asylum are processed. 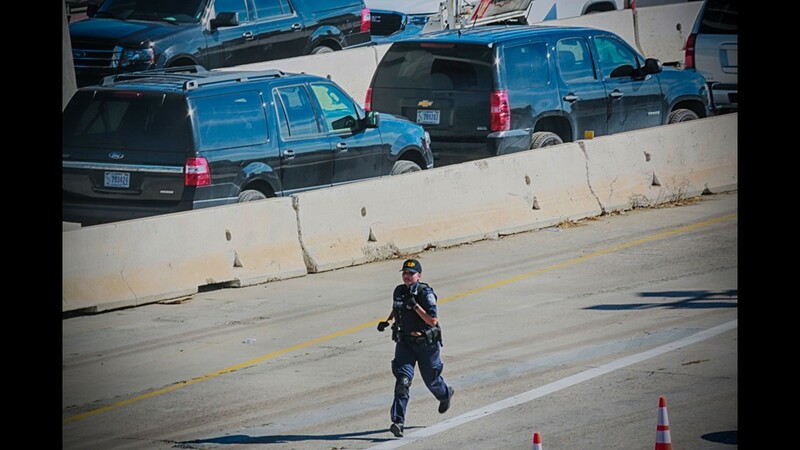 A U.S. Customs and Border Patrol agents is seen running after the closing of the U.S.-Mexico border was ordered on Nov. 25, 2018 at the San Ysidro border crossing point south of San Diego. 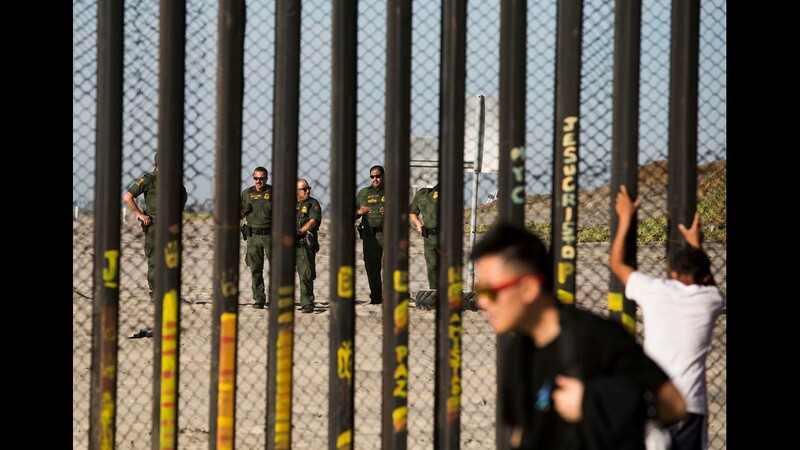 U.S. officials closed a border crossing in southern California on Sunday after hundreds of migrants tried to breach a border fence from the Mexican city of Tijuana. 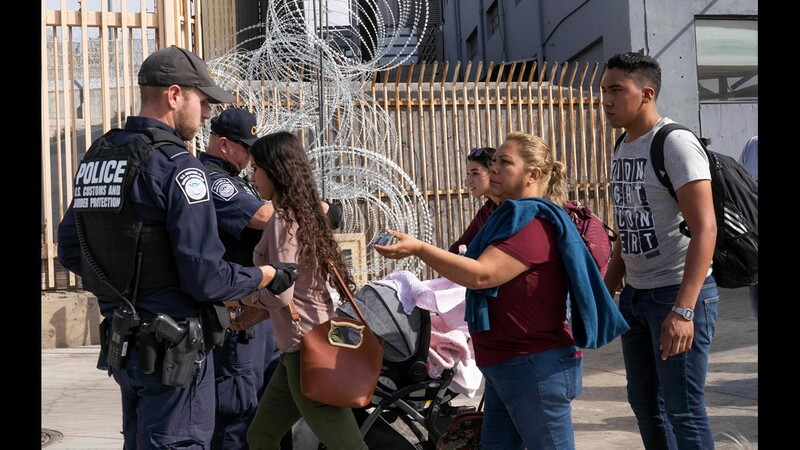 The U.S. Customs and Border Protection office in San Diego, California, said on Twitter that it had closed both north and south access to vehicle traffic at the San Ysidro border post, before also suspending pedestrian crossings. 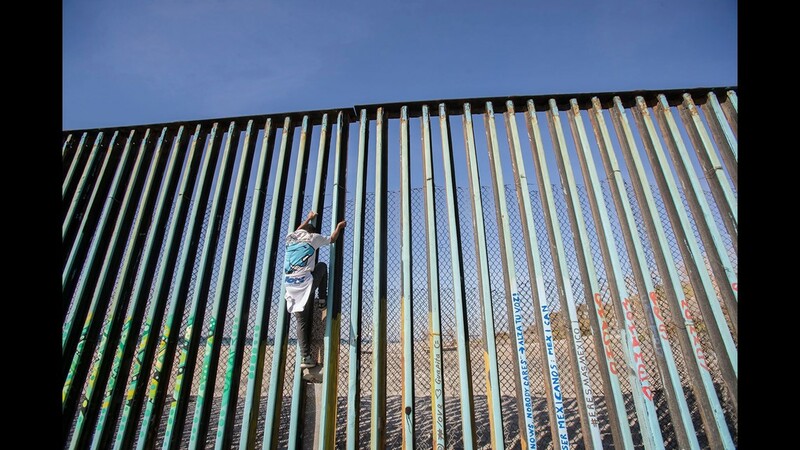 A group of Central American migrants climb the border fence between Mexico and the United States, near El Chaparral border crossing, in Tijuana, Mexico, on Nov. 25, 2018. 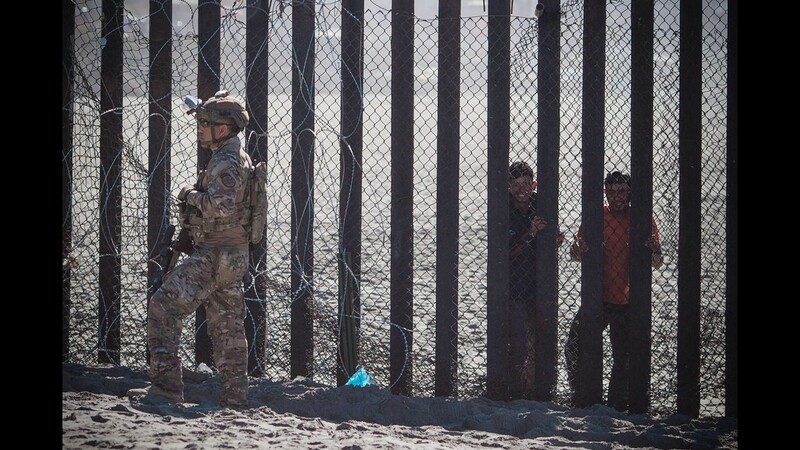 U.S. military personnel and Border Patrol agents secure the U.S.-Mexico border on Nov. 25, 2018 at the San Ysidro border crossing point south of San Diego. 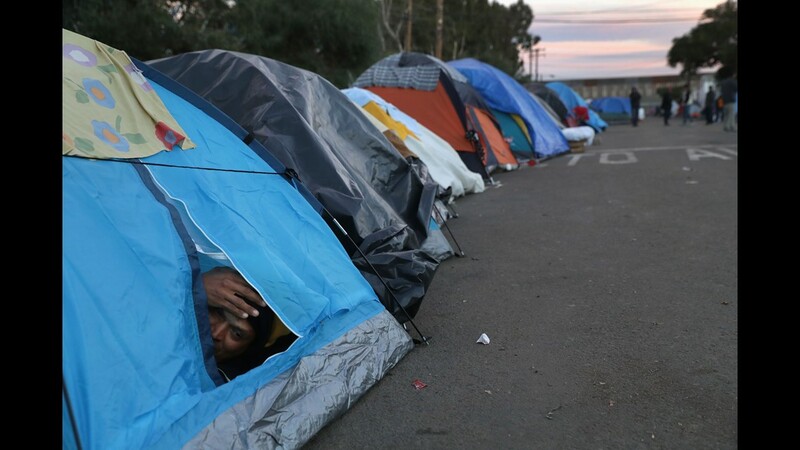 Members of the 'migrant caravan' wait in line to receive breakfast outside a temporary shelter set up for members of the caravan on November 24, 2018 in Tijuana, Mexico. 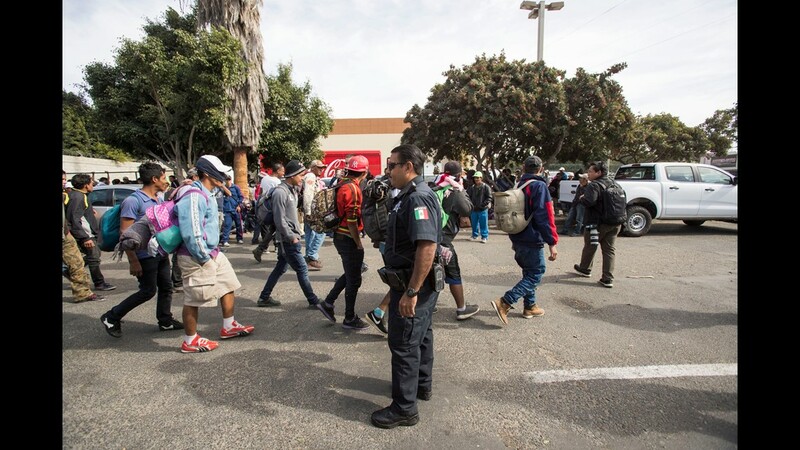 Around 6,000 migrants from Central America have arrived in the city with the mayor of Tijuana declaring the situation a 'humanitarian crisis'. Most migrants in the caravan say they plan to petition for asylum in the U.S. 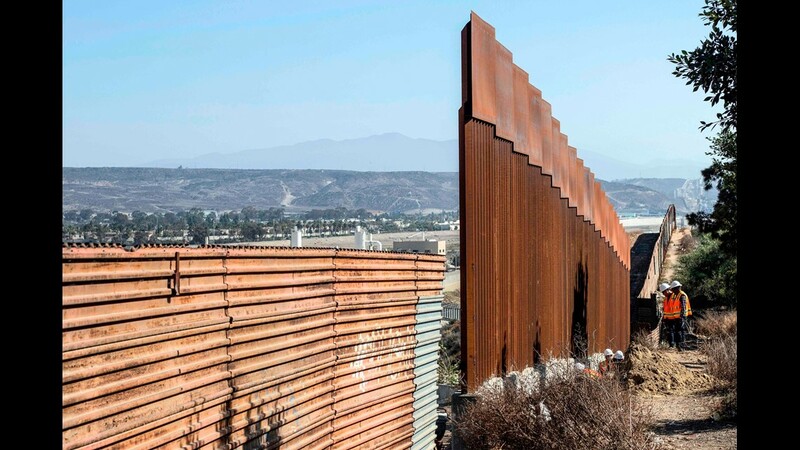 The incoming government in Mexico will reportedly support a new Trump administration policy requiring migrants asking for asylum in the U.S. to remain in Mexico while their cases are processed. 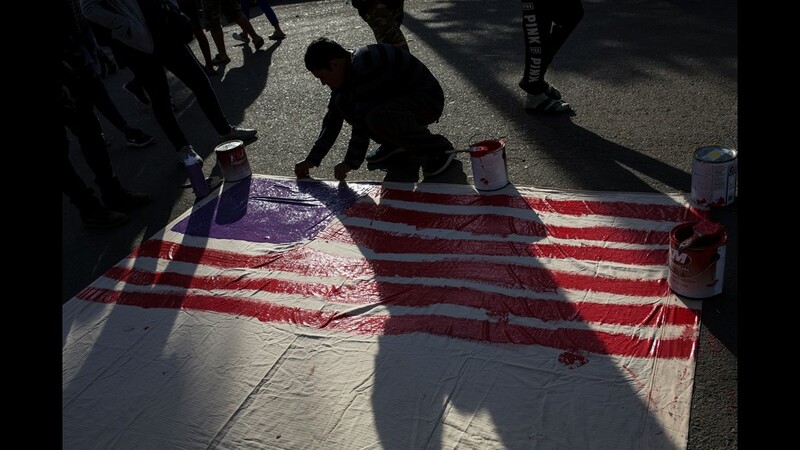 A man paints a sign with the U.S. flag outside a migrant shelter in Tijuana, Mexico, Friday, Nov. 23, 2018. 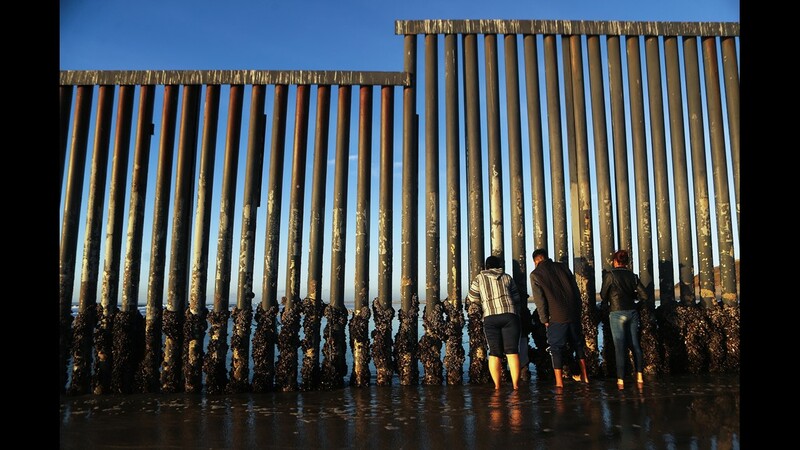 People peer through the U.S.-Mexico border fence, towards San Diego, at the Pacific Ocean, on Nov. 23, 2018 in Tijuana, Mexico. 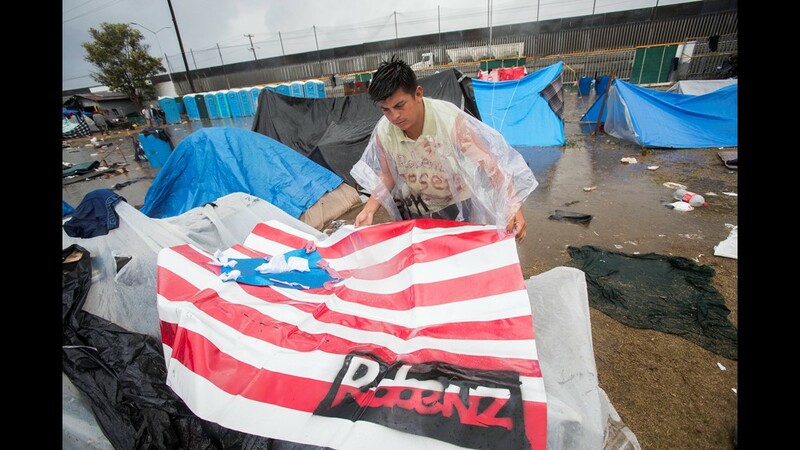 A banner painted by migrants in the colors of the U.S. flag is displayed outside a temporary shelter set up for members of the 'migrant caravan' at a soccer complex on Nov. 23, 2018 in Tijuana, Mexico. 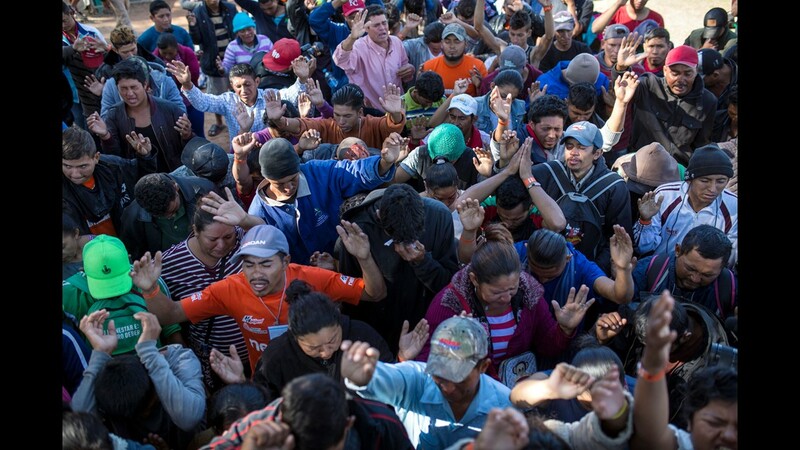 Members of the 'migrant caravan' worship during a street worship service outside a temporary shelter set up for members of the caravan on Nov. 23, 2018 in Tijuana, Mexico. 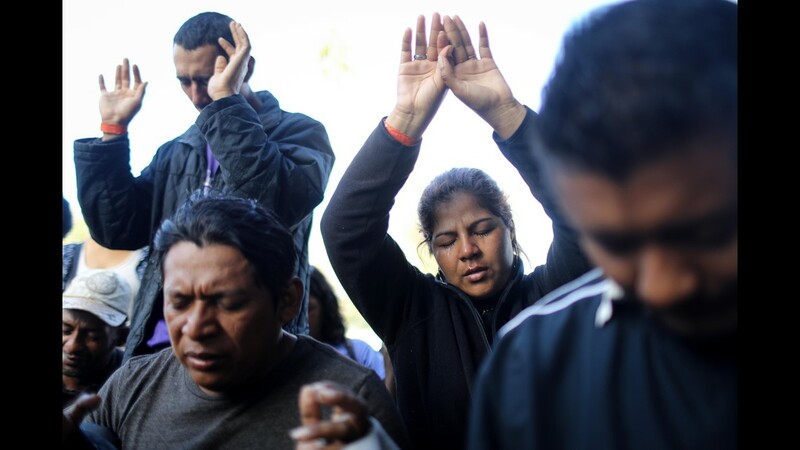 Members of the 'migrant caravan' worship, reflected in a car window, during a street worship service outside a temporary shelter set up for members of the caravan on Nov. 23, 2018 in Tijuana, Mexico. 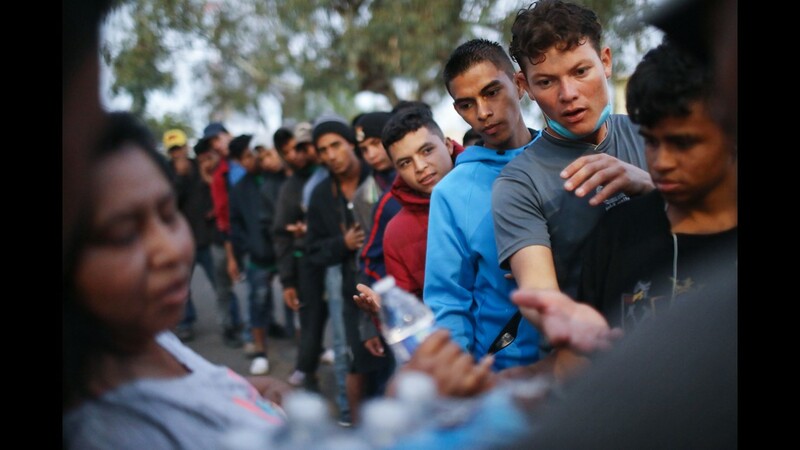 Around 5,000 migrants from Central America have arrived in the city with the mayor of Tijuana declaring the situation a 'humanitarian crisis'. 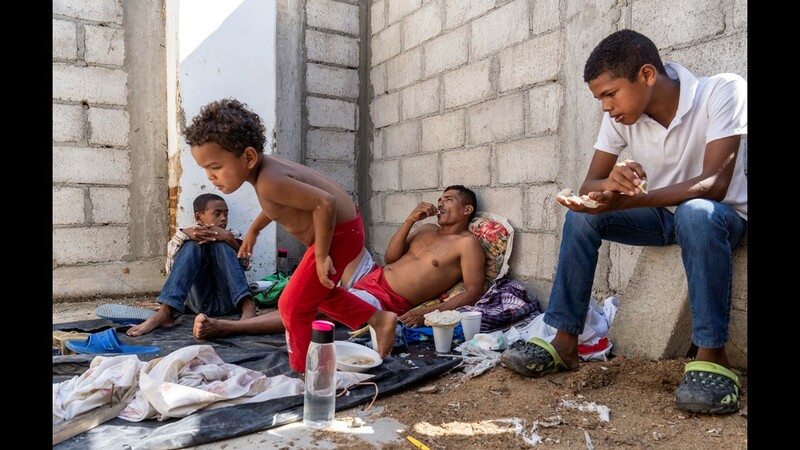 Some migrants have chosen to sleep in the streets due to poor conditions in the main temporary shelter located in a mostly outdoor soccer complex. 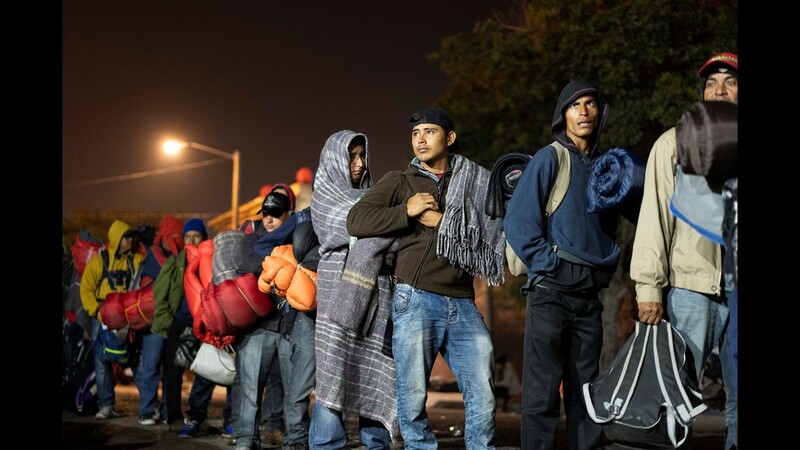 Parts of the migrant caravan have been arriving to Tijuana after traveling for more than a month through Central America and Mexico to reach the U.S. border. 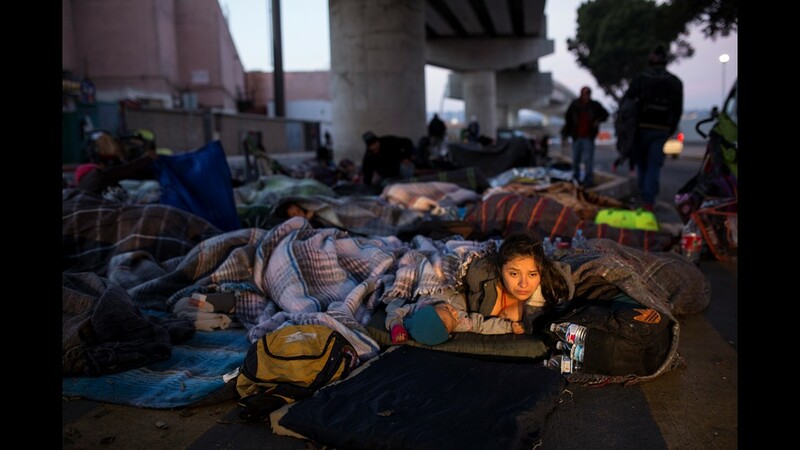 Early morning light illuminates the face of a migrant woman and her child as she wakes after sleeping under a bridge at the Chaparral border crossing in Tijuana, Mexico, Friday, Nov. 23, 2018. 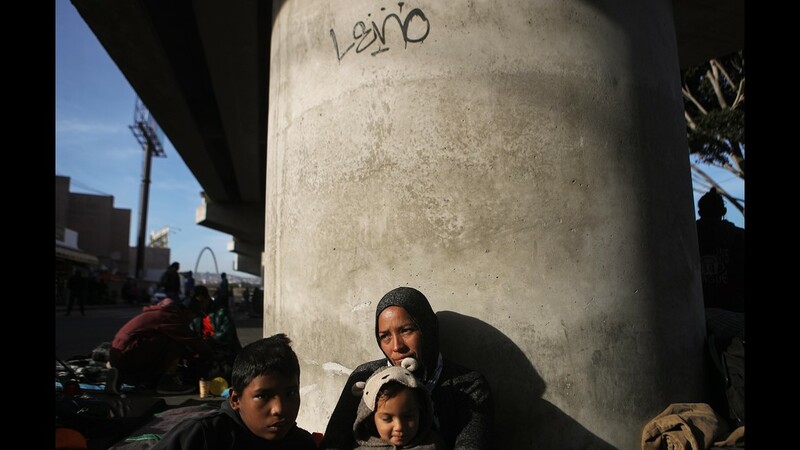 Honduran mother Lorena sits on the street with two of her four children, Yasir, left, and Maria, who all traveled together for more than one month in the 'migrant caravan', on Nov. 23, 2018 in Tijuana, Mexico. 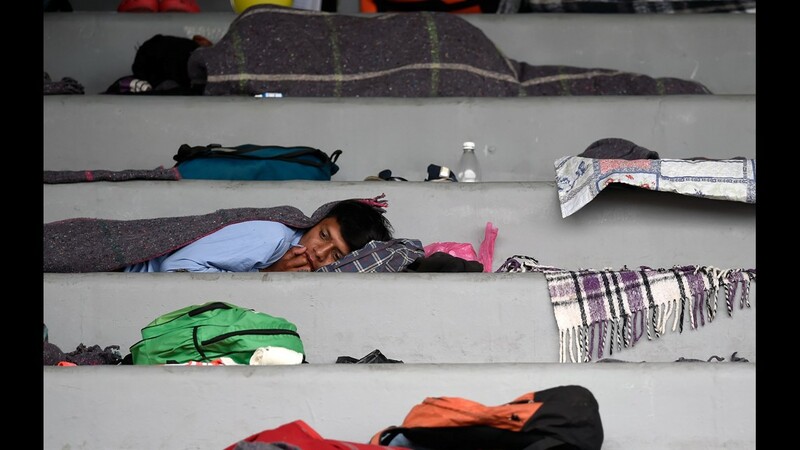 Central American migrants remain in a shelter at the Sports Center Benito Juarez, in Tijuana, Mexico, Nov. 22, 2018. 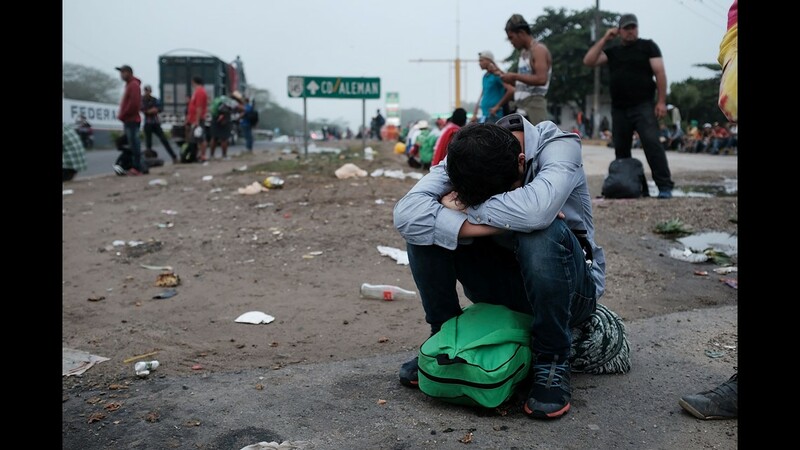 Dozens of Central Americans from the migrant caravan are faced with the dilemma of pursuing asylum in the USA and Canada or seeking refuge in Mexico. 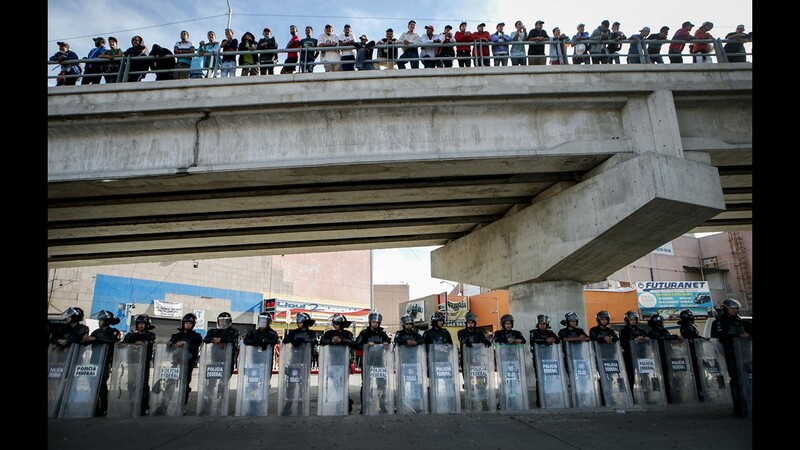 Mexican riot police keep watch beneath onlookers on a bridge as members of the 'migrant caravan' rally outside the El Chaparral port of entry on Nov. 22, 2018 in Tijuana, Mexico. Parts of the migrant caravan have been arriving to Tijuana after traveling for more than a month through Central America and Mexico to reach the U.S. border. 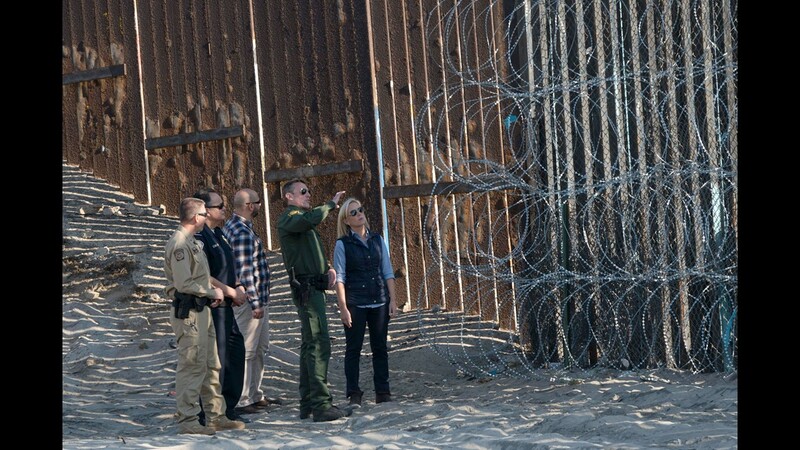 President Donald Trump today threatened to close the U.S.-Mexico border if the arrival of migrants leads to a loss of 'control' on the Mexican side. 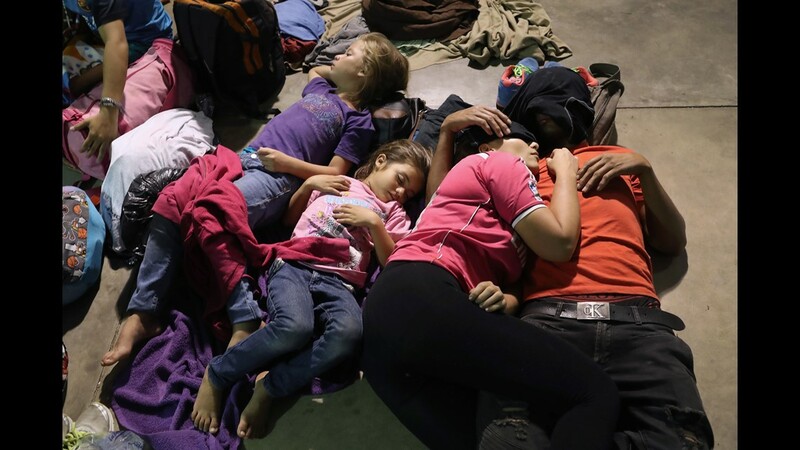 Central American migrants rest at a shelter near the U.S.-Mexico border fence in Tijuana, Baja California state, Mexico, on Nov. 22, 2018. 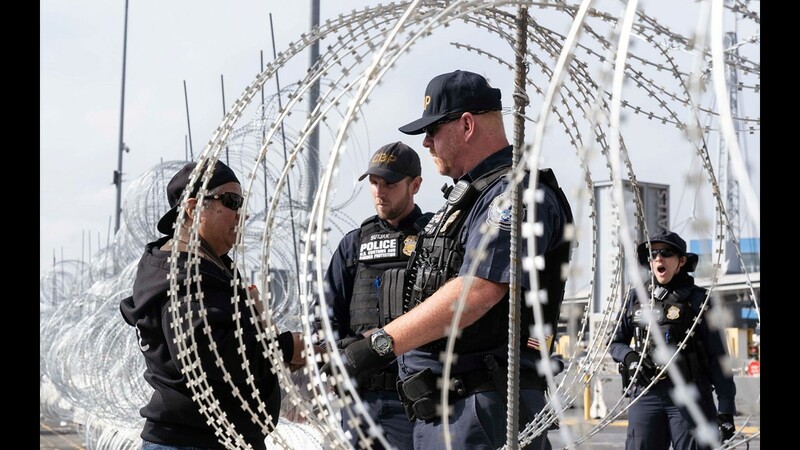 U.S. Customs and Border Protection (CBP) agents take part in an operational readiness exercise at the San Ysidro port of entry in the U.S., as seen from Tijuana, Baja California State, Mexico, on Nov. 22, 2018. 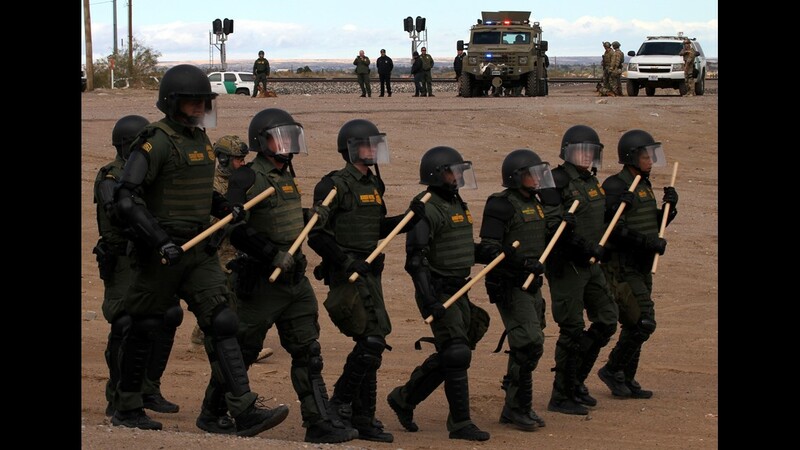 Border Patrol Agents and other law enforcement officials take part in a training exercise at the U.S. 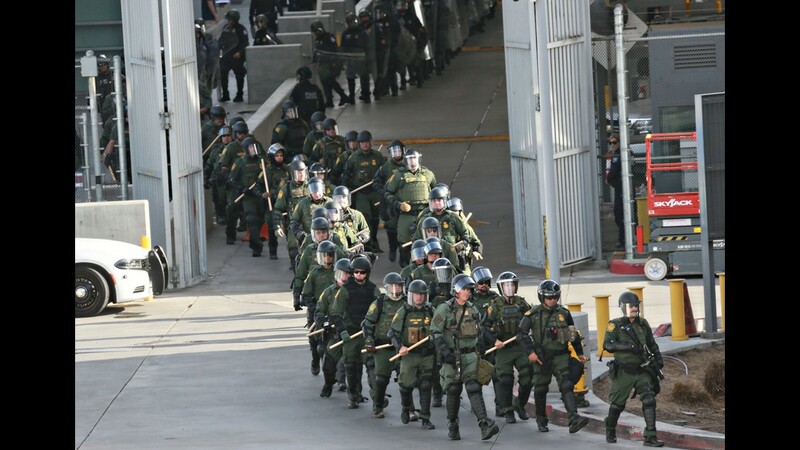 Port of Entry in San Ysidro, Calif. on Nov. 22, 2018. Migrant children, part of the Central American migrants, play with Mexico's Federal police at El Chaparral port of entry on the U.S.-Mexico border in Tijuana, Baja California state, Mexico on Nov. 22, 2018. 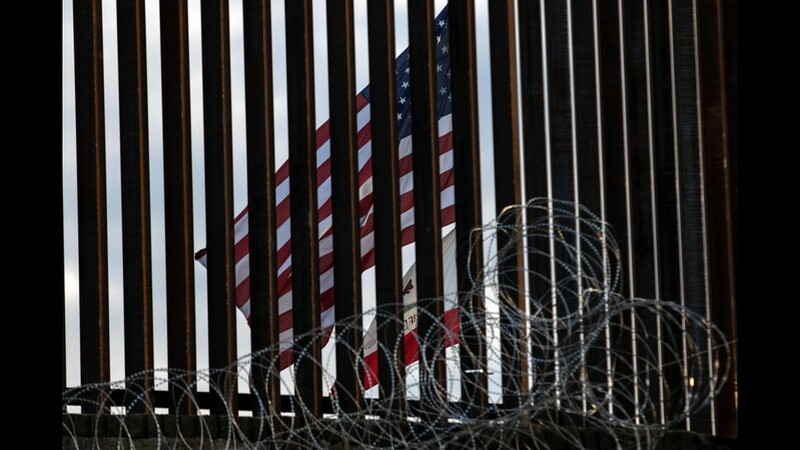 A migrant man holds a U.S. flag as he is confronted by a line of Mexican police in riot gear, when they tried to cross the border at the Chaparral border crossing in Tijuana, Mexico on Nov. 22, 2018. 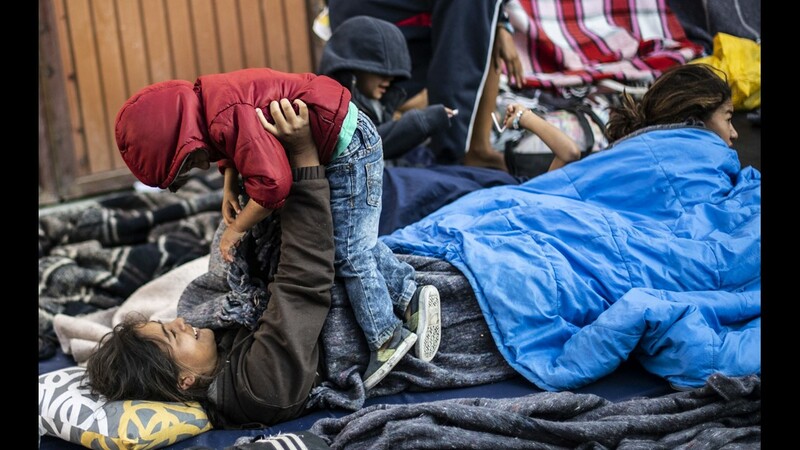 The group marched peacefully to the border crossing to demand better conditions and pushed to enter the U.S.
Maria del Carmen Mejia holds her daughter Britany Sofia while standing in a line outside a migrant shelter in Tijuana, Mexico, on Nov. 22, 2018. 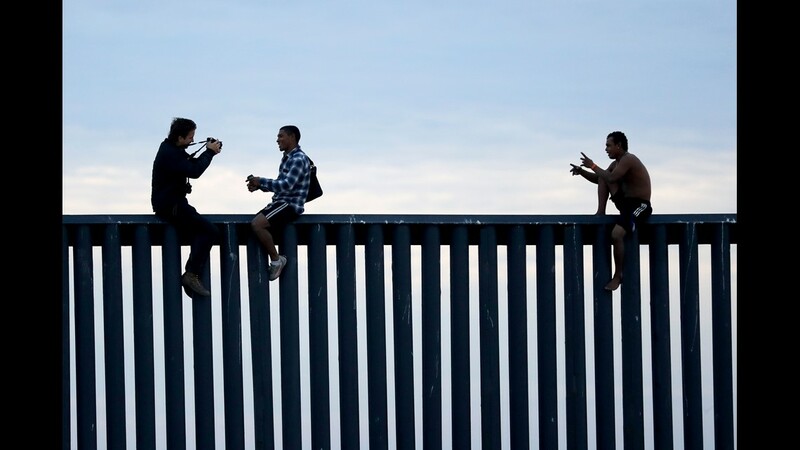 Two Honduran men pose as a photographer, at left, takes their picture after the group climbed the border wall separating Tijuana, Mexico, and San Diego, before climbing back down on the Mexican side on Nov. 21, 2018 as seen from San Diego. Several charter buses carrying migrants arrive at the Unidad Deportiva Benito Juarez sports complex in Tijuana, Mexico in the early morning hours on Nov. 21, 2018. 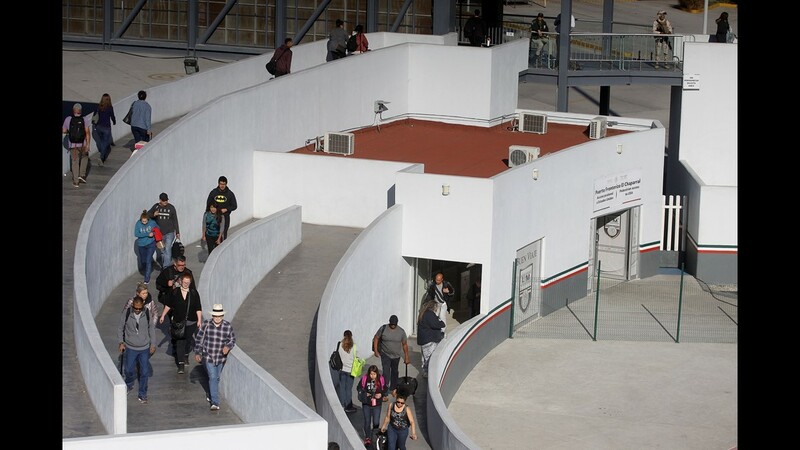 The city of Tijuana is using the sports complex as a shelter for the migrants. A migrant takes shelter at the Unidad Deportiva Benito Juarez sports complex in Tijuana, Mexico on Nov. 21, 2018. 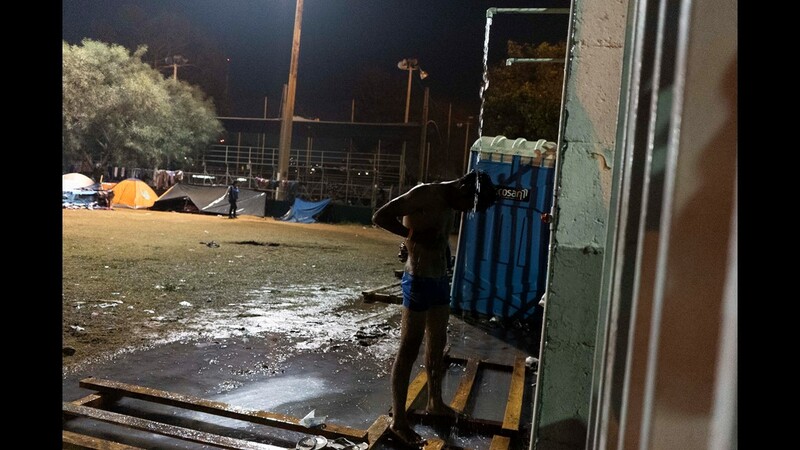 A man showers at makeshift shelter for migrants in Tijuana, Mexico. 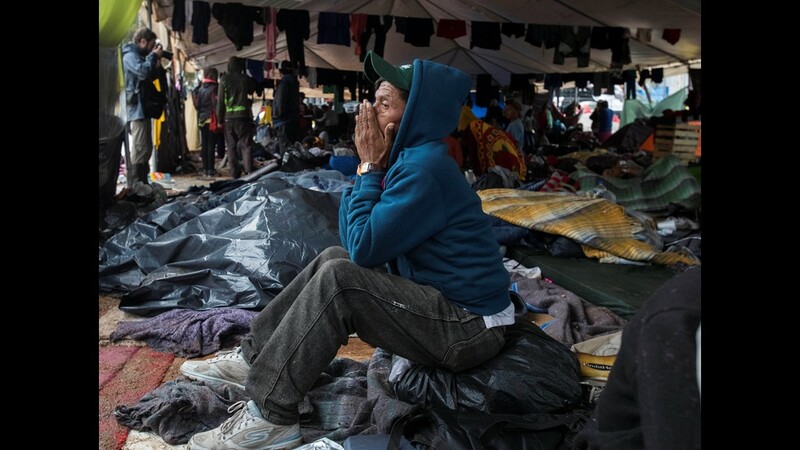 Over 2,500 Central American migrants live at the Unidad Deportiva Benito Juarez, a makeshift shelter, in Tijuana, Mexico on Nov. 20, 2018. 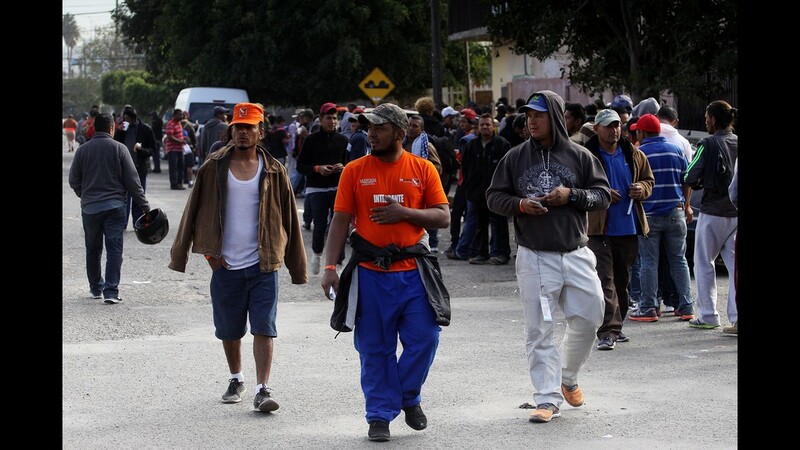 Migrants set up camp around the baseball stadium. 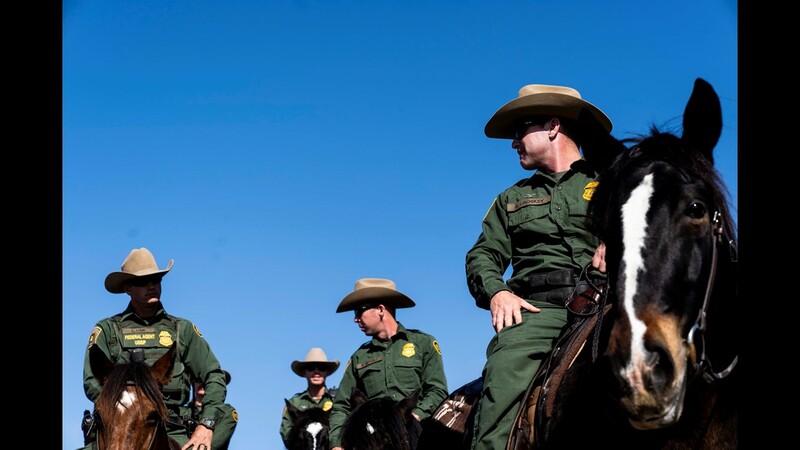 U.S. Customs and Border Protection agents patrol before Department of Homeland Security Secretary Kirstjen Nielsen tours the U.S.-Mexico border in San Diego on Nov. 20, 2018. 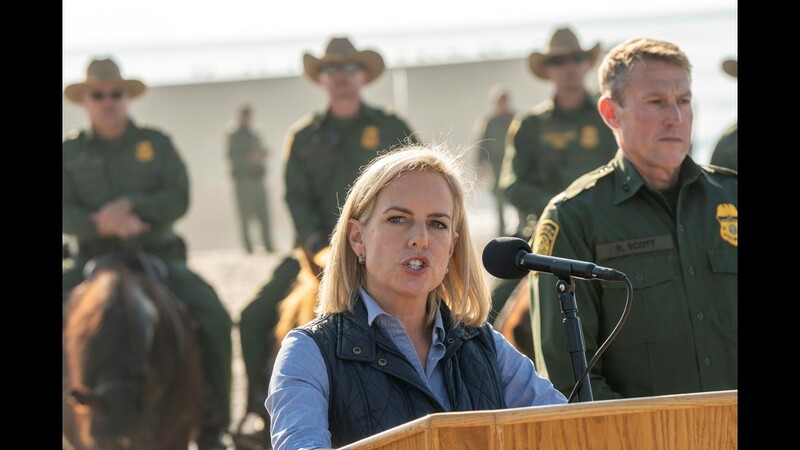 Department of Homeland Security Secretary Kirstjen Nielsen visits the border in San Diego on Nov. 20, 2018. 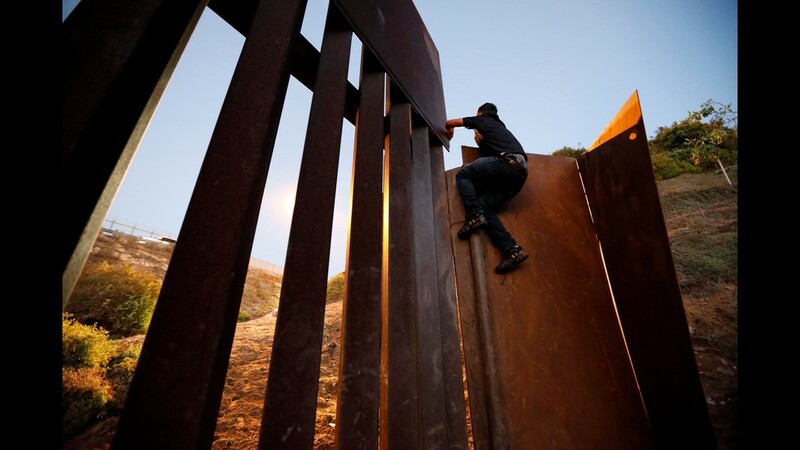 A man tries to climb over the U.S.-Mexico border fence at Playas de Tijuana, Mexico on Nov. 18, 2018. Maritza Lara, a migrant from Honduras, jumps at the chance to find a job in Mexico in order to move out of the shelter where she lives in Tijuana on Nov. 19, 2018. 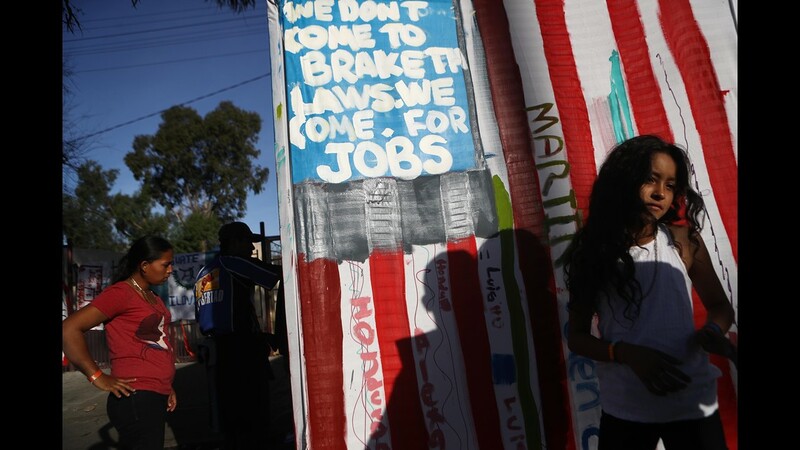 Government and business leaders organized a month-long job fair aimed at helping migrants stay in Mexico, rather than pursue asylum claims in the United States. 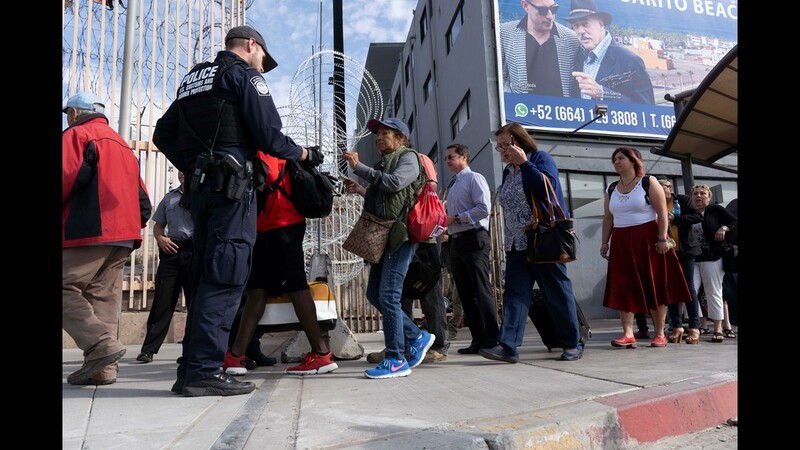 U.S. Customs and Border Protection officers check the IDs of pedestrians crossing into the United States after reopening the San Ysidro port of entry on Nov.19, 2018, in Tijuana, Mexico. 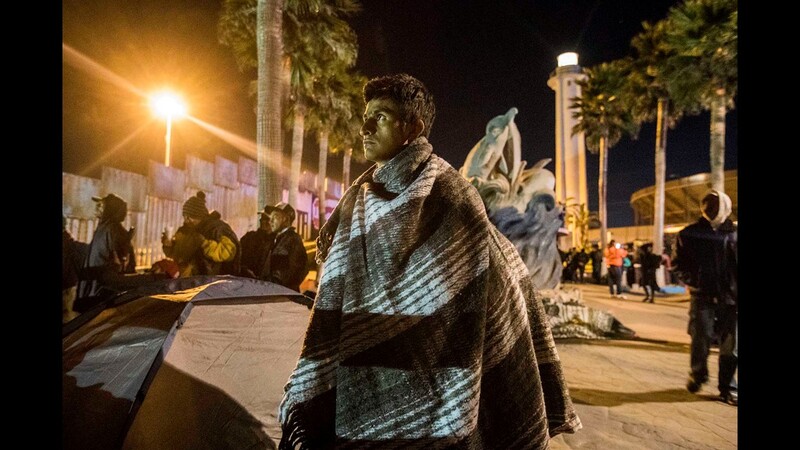 Over 2,500 mostly Central American migrants are currently staying at the Unidad Deportiva Benito Juarez, a makeshift shelter, in Tijuana, Mexico on Nov. 18, 2018. Migrants set up camp around the baseball stadium, propping up tents using whatever materials they have available. Bathrooms and outdoor showers were installed in the outfield. 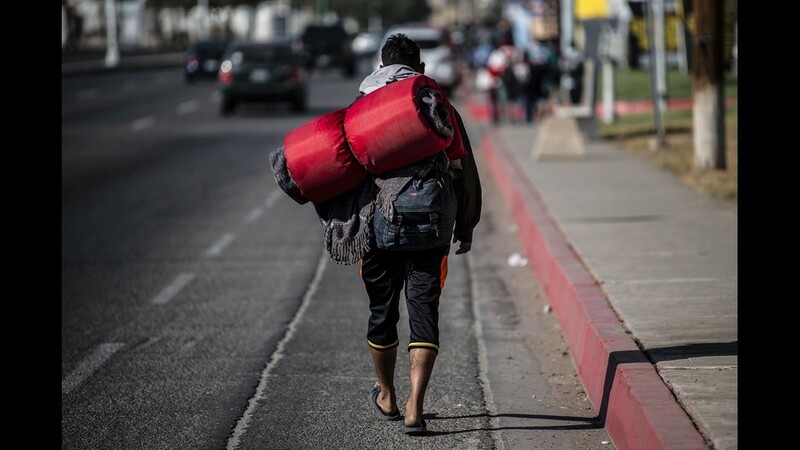 A Central American migrant walks towards the United States, through Mexicali, Mexico, on Nov. 18, 2018. 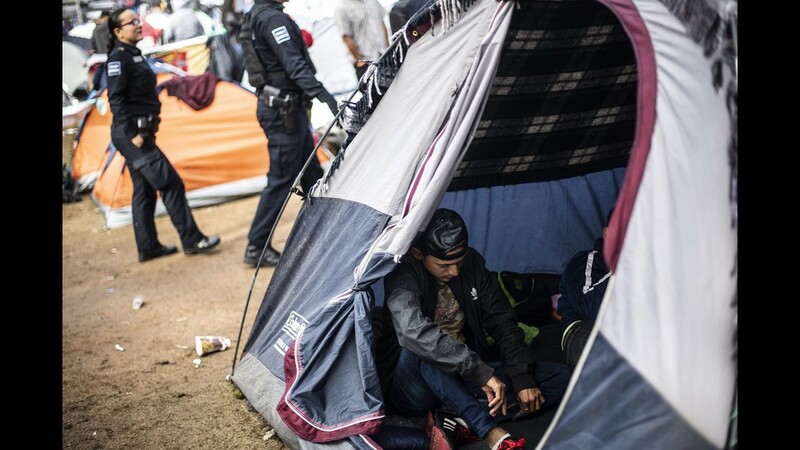 The Central American migrant caravan faced a desperate situation Friday as its numbers swelled at the US-Mexican border, where it got a cold welcome and a warning that its chances of entering the United States were "almost nil." 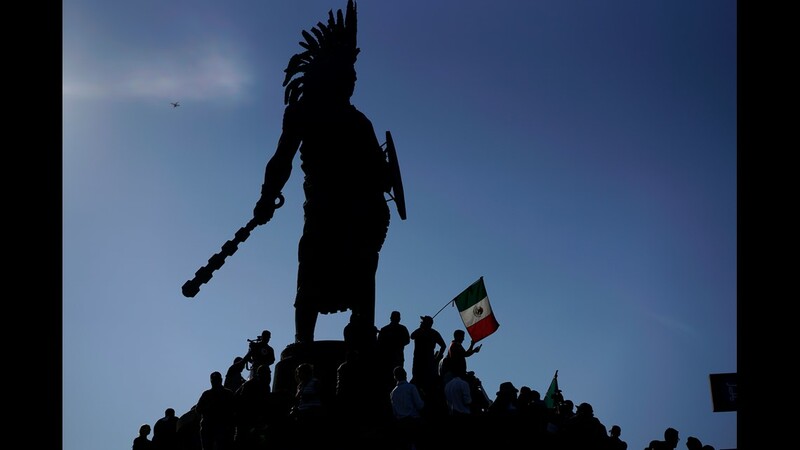 Demonstrators stand under an indigenous statue of Aztec ruler Cuauhtemoc as they protest the presence of thousands of Central American migrants in Tijuana, Mexico, Sunday, Nov. 18, 2018. Protesters accused the migrants of being messy, ungrateful and a danger to Tijuana; complained about how the caravan forced its way into Mexico, calling it an "invasion," and voiced worries that their taxes might be spent to care for the group as they wait possibly months to apply for U.S. asylum. 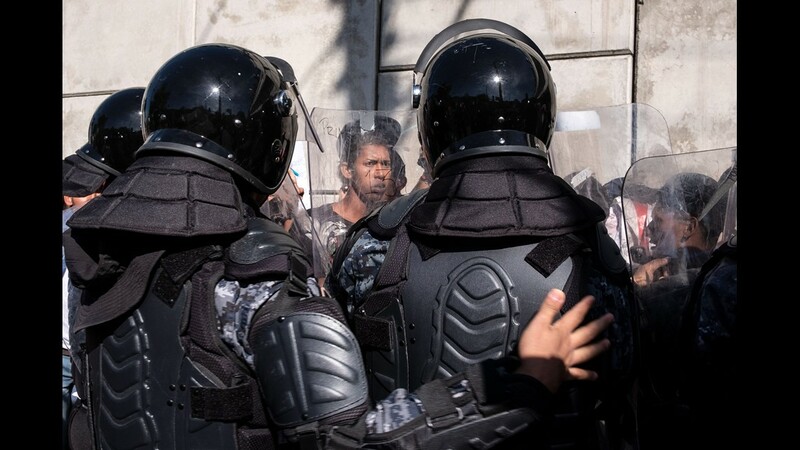 A demonstrator against the Central American migrants in Tijuana confronts riot police near a temporary shelter, on Nov. 18, 2018, in Tijuana, Mexico. 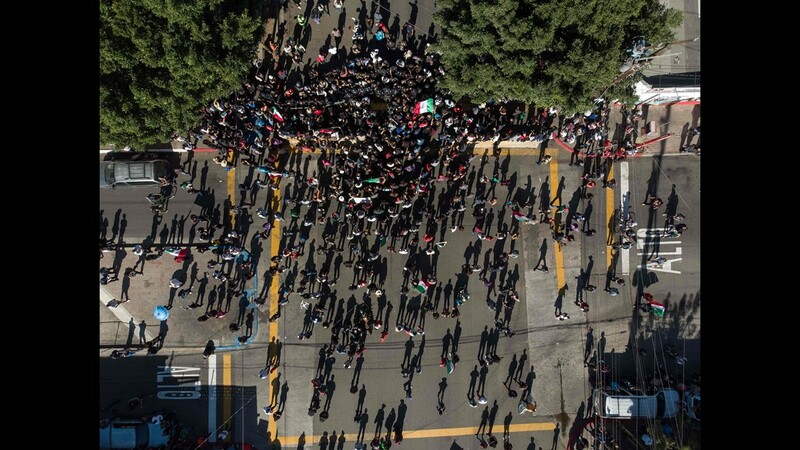 Aerial view of people demonstrating against the Central American migrants in Tijuana, blocked by riot police near a temporary shelter, on Nov. 18, 2018, in Tijuana, Mexico. 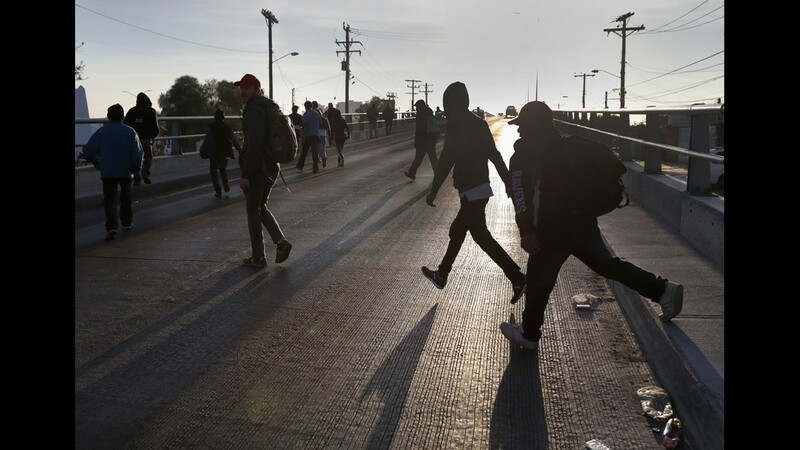 Members of the migrant caravan walk to the official border crossing to turn in requests for political asylum at the U.S.-Mexico border on Nov.17, 2018 in Tijuana, Mexico. 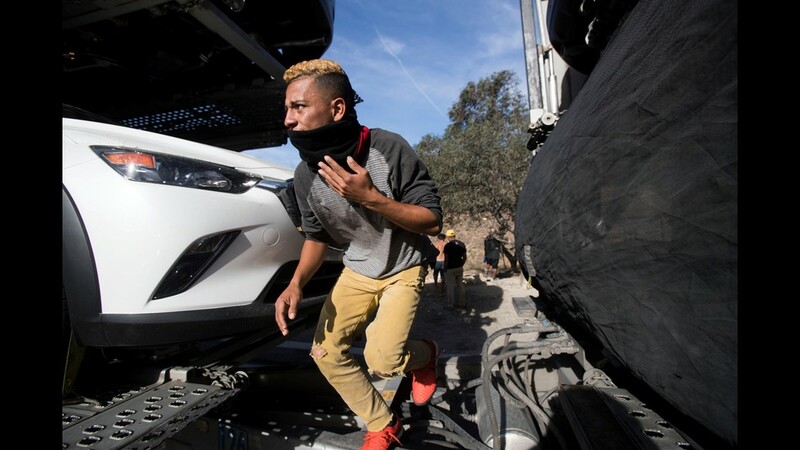 Parts of the caravan have been arriving in Tijuana at the U.S. border, after traveling more than a month through Central America and Mexico. People use a legal border crossing to walk from Tijuana, Mexico to the U.S., Sunday, Nov. 18, 2018. 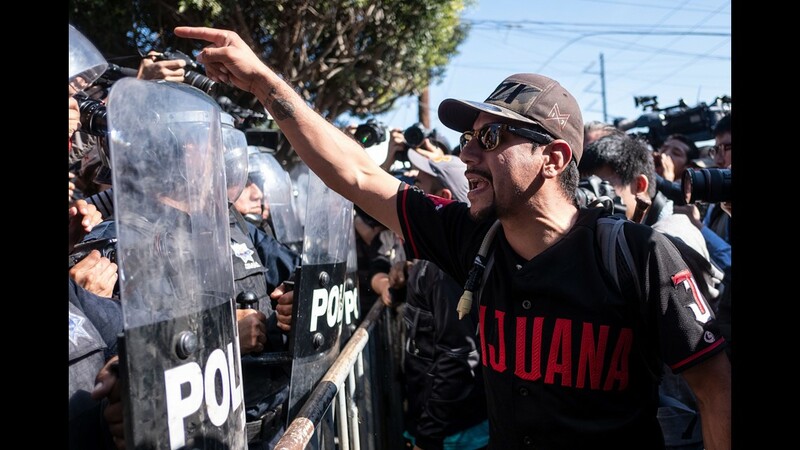 While many in Tijuana are sympathetic to the plight of Central American migrants and trying to assist, some locals have shouted insults, hurled rocks and even thrown punches at the migrants. 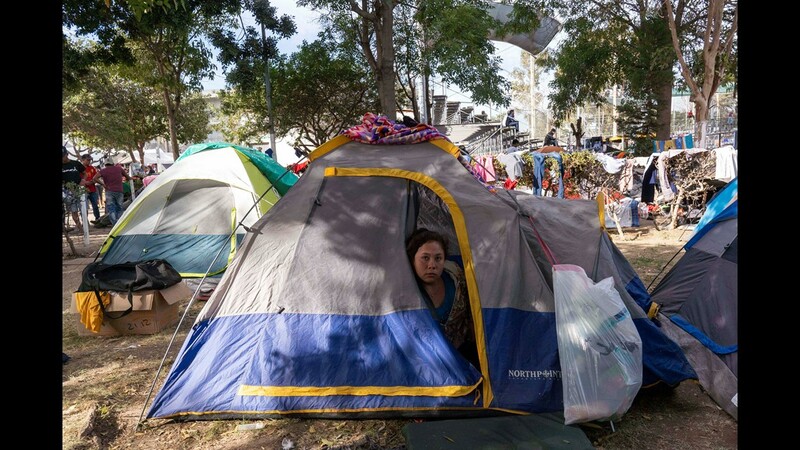 Members of the Central American migrant caravan remain at a shelter in the city of Tijuana, Mexico, Nov. 17, 2018. 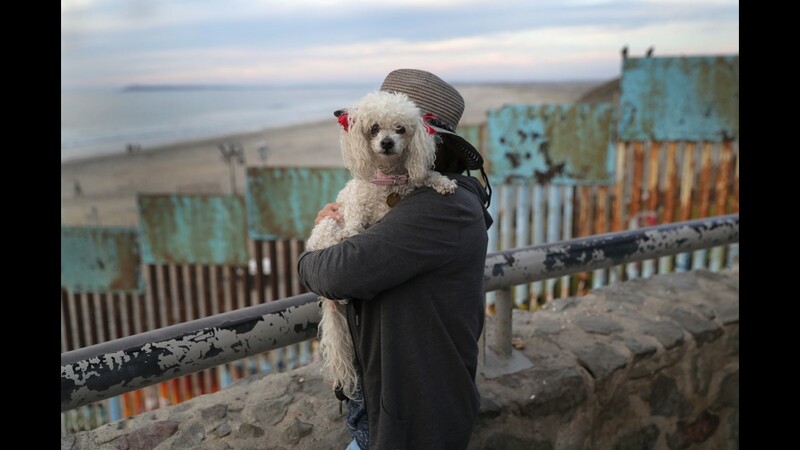 Playas de Tijuana resident Juantia Leon holds her poodle Mini while taking in the view of the Pacific Ocean next to the U.S.-Mexico border fence on Nov. 17, 2018, in Tijuana, Mexico. 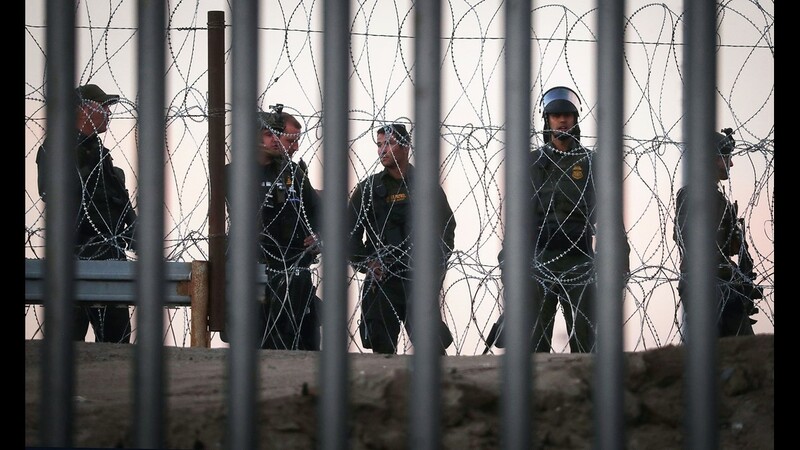 U.S. authorities have been filling the Tijuana River with sand mounds and concertina wire, at the border line between Mexico and the United States, in preparation of Central American migrants moving towards the United States, seen from Tijuana, Mexico, on Nov. 18, 2018. 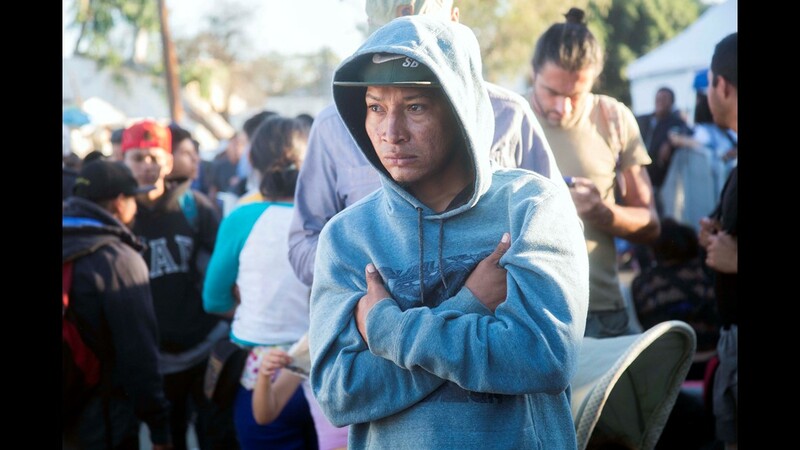 A Central American migrant moving in a caravan towards the United States in hopes of a better life, waits for food outside a shelter in Tijuana, Mexico, on Nov. 17, 2018. 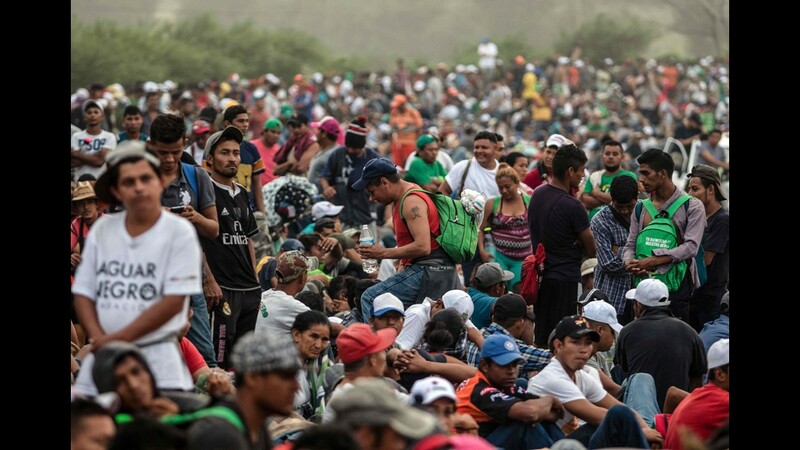 The Central American migrant caravan faced a desperate situation Friday as its numbers swelled at the US-Mexican border, where it got a cold welcome and a warning that its chances of entering the United States were "almost nil." A Central American migrant woman moving towards the United States in hopes of a better life, plays with a child at the Alfa y Omega shelter in Mexicali, Baja California state, Mexico, on Nov. 17, 2018. 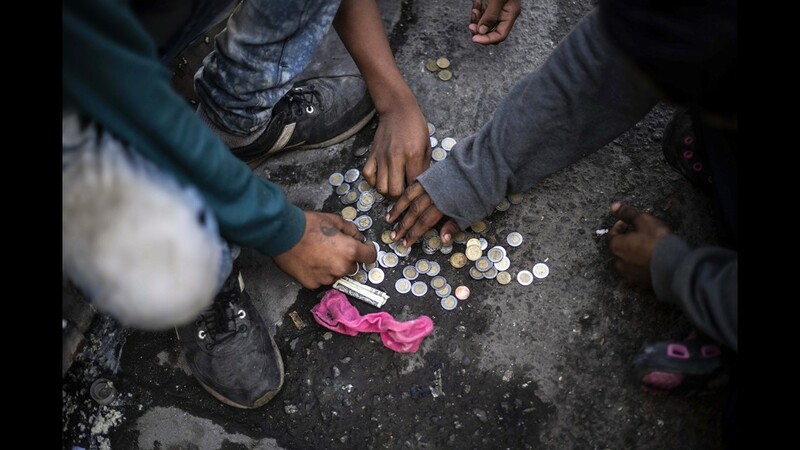 Central American migrants moving towards the United States in hopes of a better life, count coins at the Alfa y Omega shelter, in Mexicali, Baja California state, Mexico, on Nov. 17, 2018. 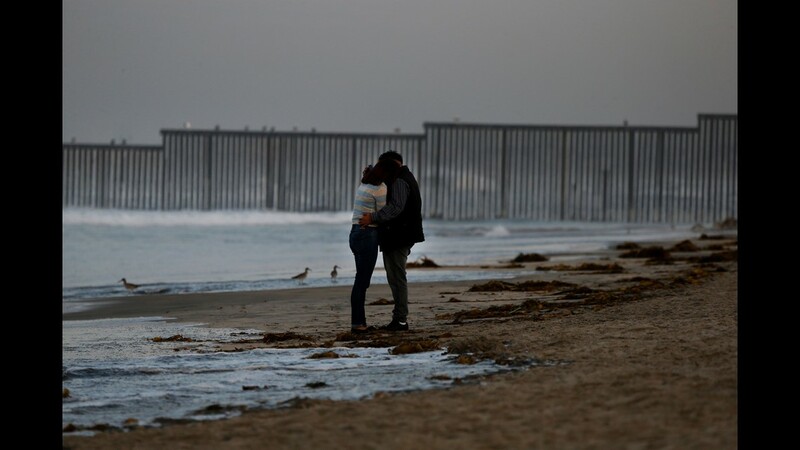 A couple embrace on the shore of Playa Tijuana backdropped by the barriers separating Mexico and the United States, where the border meets the Pacific Ocean, Saturday, Nov. 17, 2018. 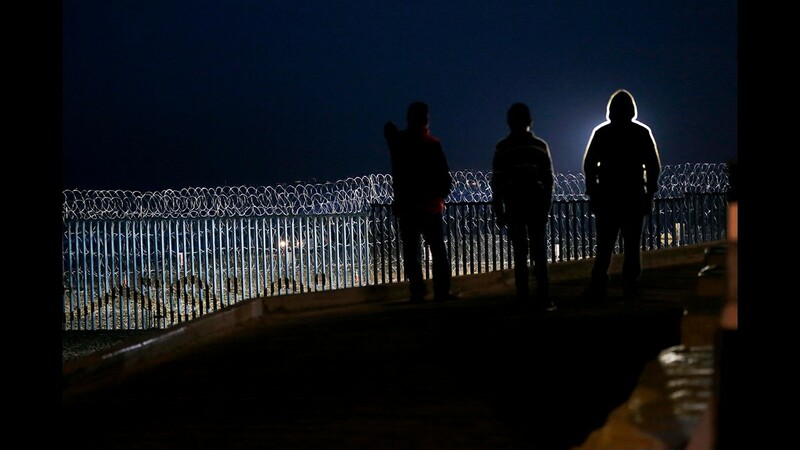 Residents stand on a hill before barriers, wrapped in concertina wire, separating Mexico and the United States, where the border meets the Pacific Ocean, in Tijuana, Mexico, Saturday, Nov. 17, 2018. 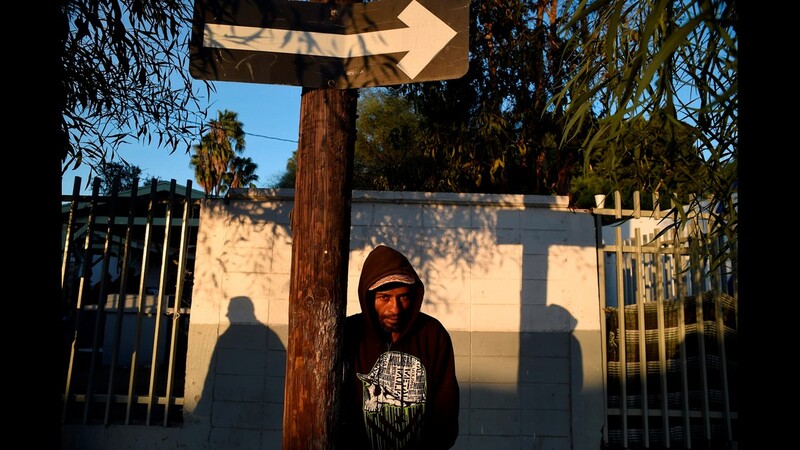 Many of the nearly 3,000 migrants have reached the border with California. The mayor has called the migrants' arrival an "avalanche" that the city is ill-prepared to handle. 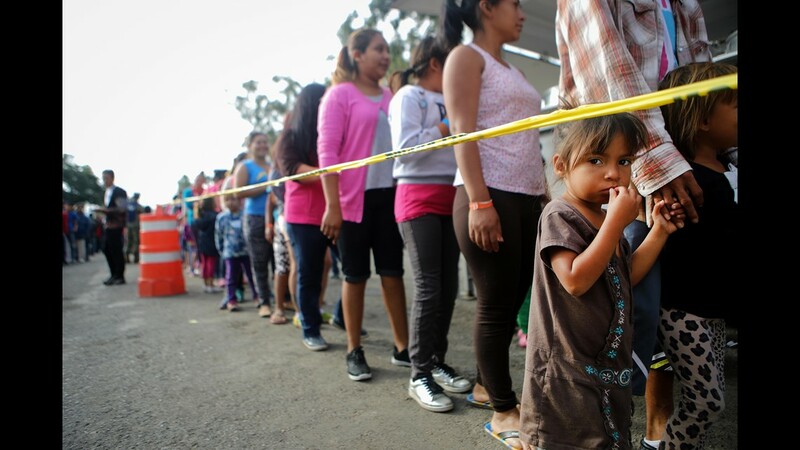 Members of the migrant caravan wait in line to turn in requests for political asylum at the U.S.-Mexico border on Nov. 17, 2018 in Tijuana, Mexico. Members of the migrant caravan walk to make requests for political asylum at the U.S.-Mexico border on Nov.17, 2018 in Tijuana, Mexico. 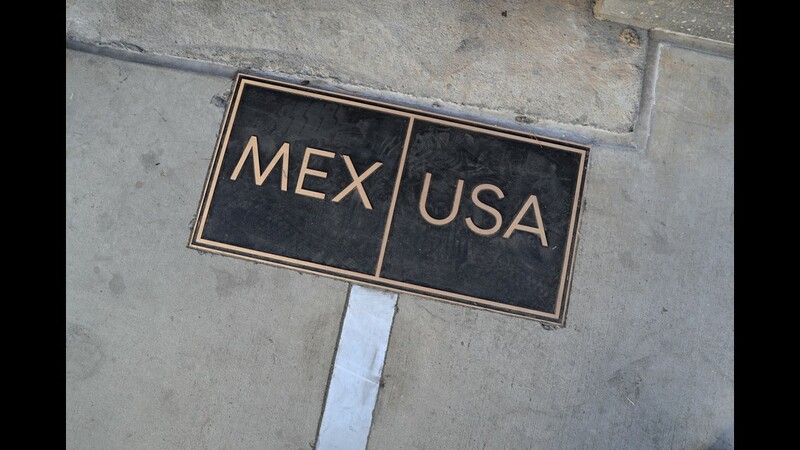 The U.S.-Mexico border is marked on Nov. 16, 2018 in San Ysidro, CA. 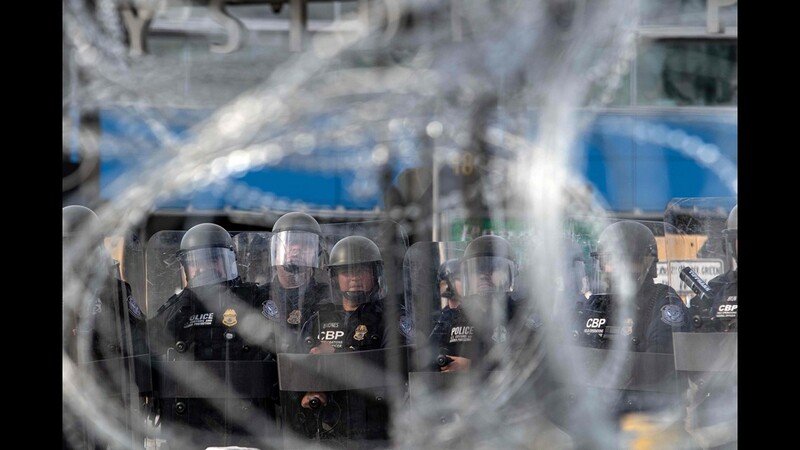 U.S. border agencies continued to fortify the border with razor wire and additional personnel as members of the migrant caravan arrived to Tijuana across the border. 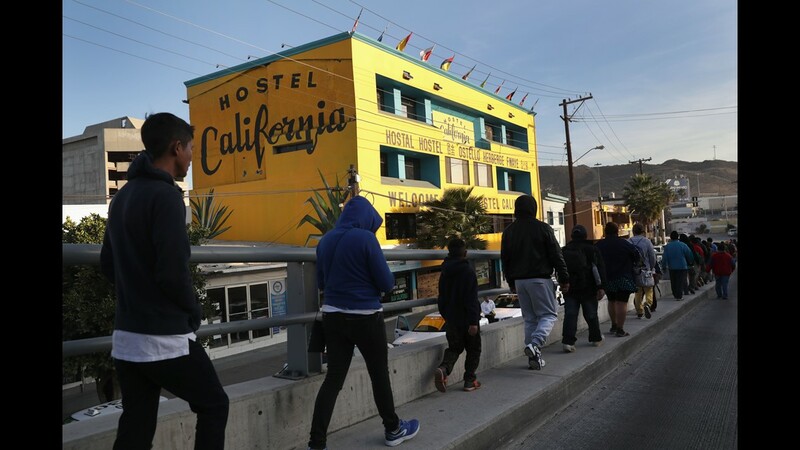 Members of the caravan of Central American migrants walk on a street in Tijuana, state of Baja California, Mexico on Nov. 16, 2018. 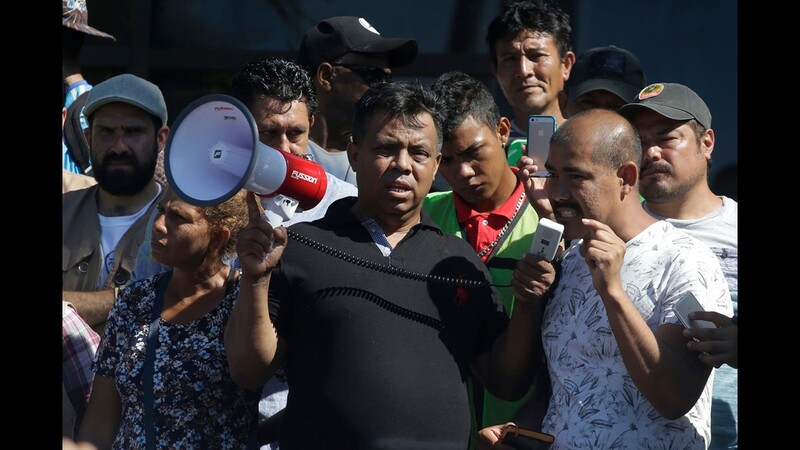 Tension over the arrival of Central American migrants to the Mexican city of Tijuana increased when the Mayor of Tijuana, Juan Manuel Gastelum, accused the federal government of being 'indolent' for allowing them to enter the country, he announced a public consultation on their stay and declared 'zero tolerance' for those who violate the law. People who are part of the migrant caravan rest at a shelter in Tijuana, Baja California, Mexico on Nov. 16, 2018. 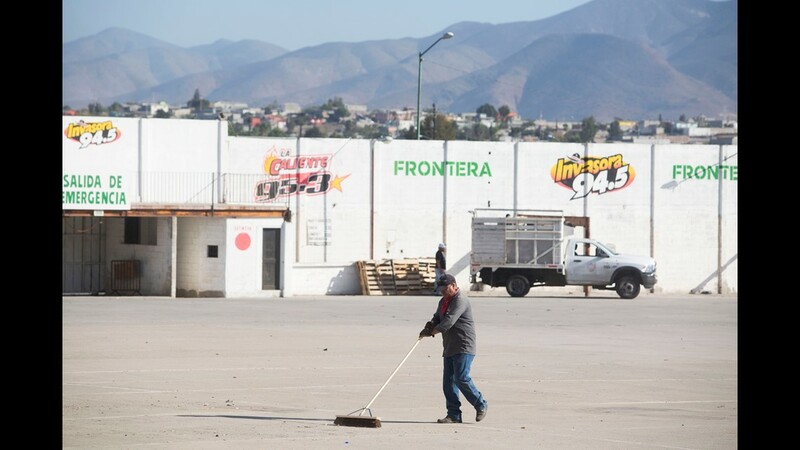 Tijuana prepares to host Central American migrants for months before the foreseeable difficulties they will have in order to cross the border to the United States. 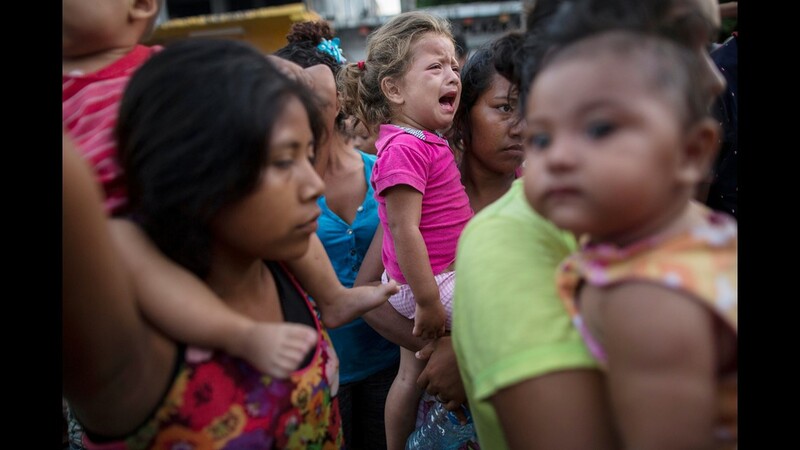 A Central American migrant child moving with a caravan towards the United States in hopes of a better life, cries as she embraces a woman at the Alfa y Omega shelter in Mexicali, Baja California state, Mexico, on Nov. 16, 2018. 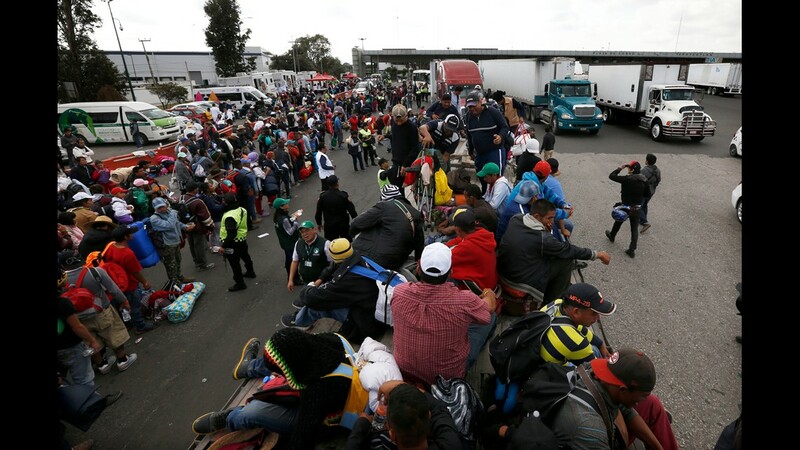 The Central American migrant caravan trekking toward the United States converged on the US-Mexican border Thursday after more than a month on the road, undeterred by President Donald Trump's deployment of thousands of American troops near the border. 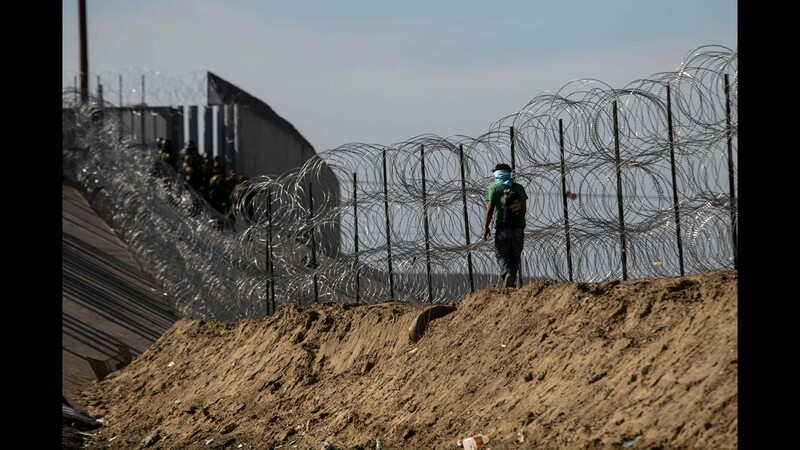 A member of the US military stands in front of the border fence that divides the US and Mexico at Friendship Park on Nov. 16, 2018 in San Diego, Calif.
Central American migrants, part of the caravan hoping to reach the U.S. border, pray at a temporary shelter in Tijuana, Mexico, Friday, Nov. 16, 2018. Sairy Hueso, part of the Central American migrant caravan, carries her daughter Etzabe Ponce, as she stands next to her husband while waiting in line to receive a number as part of the process to apply for asylum in the United States, at the border in Tijuana, Mexico Tijuana, Mexico, Friday, Nov. 16, 2018. 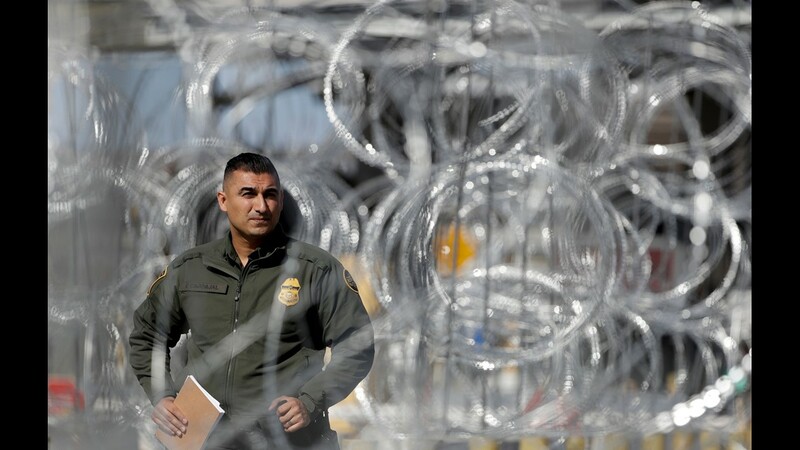 A U.S. Border Patrol agent looks through concertina wire during a tour of the San Ysidro port of entry Friday, Nov. 16, 2018, in San Diego. 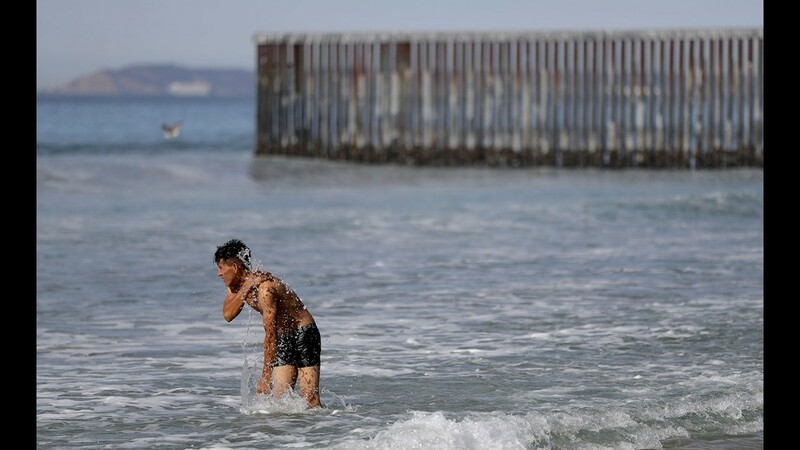 Selvin Velazquez, a migrant from Honduras, bathes in the Pacific Ocean near the border structure in Tijuana, Mexico, Thursday, Nov. 15, 2018. 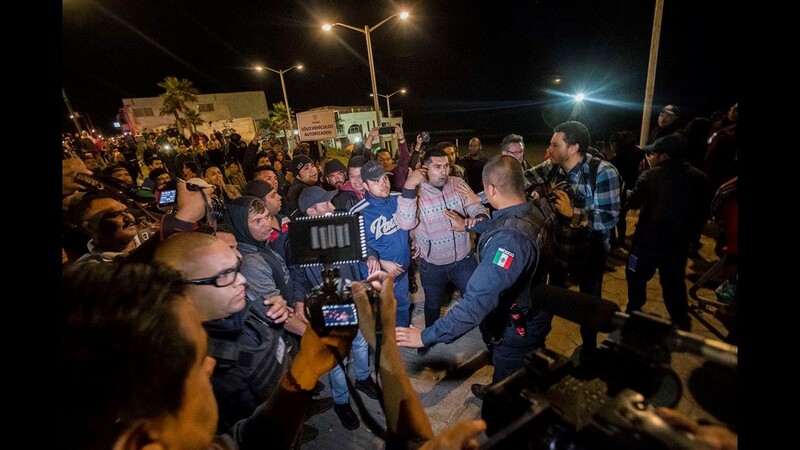 Members of a migrant caravan from Central America started to meet some local resistance as they continued to arrive by the hundreds in the Mexican border city of Tijuana, where a group of residents clashed with migrants camped out by the U.S. border fence. 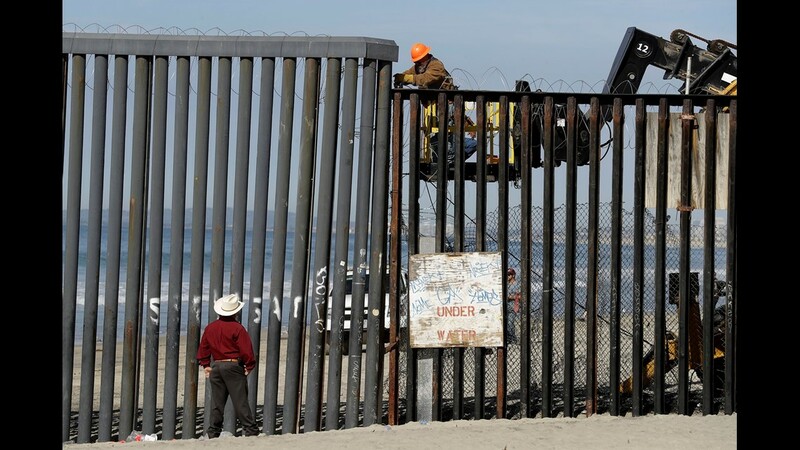 A man on the U.S. side of the border, top, works on the border structure as a man looks on, at the beach seen from Tijuana, Mexico, Thursday, Nov. 15, 2018. 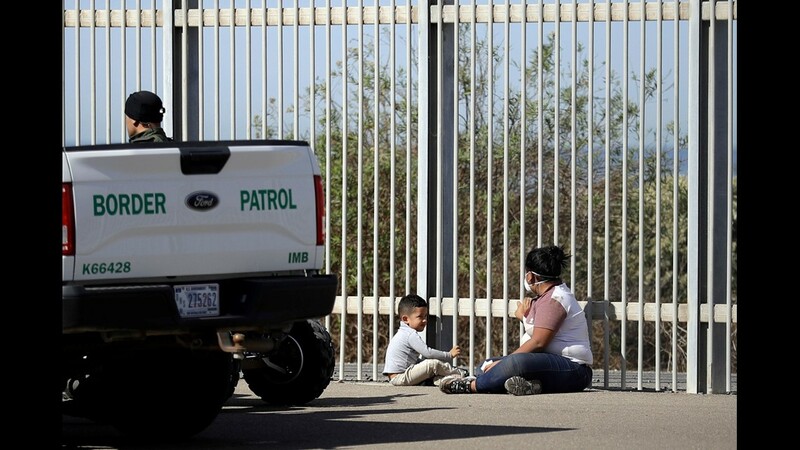 A woman and child are detained by U.S. Border Patrol agents as they sit between two border structures located on the U.S. side, seen from Tijuana, Mexico, Thursday, Nov. 15, 2018. 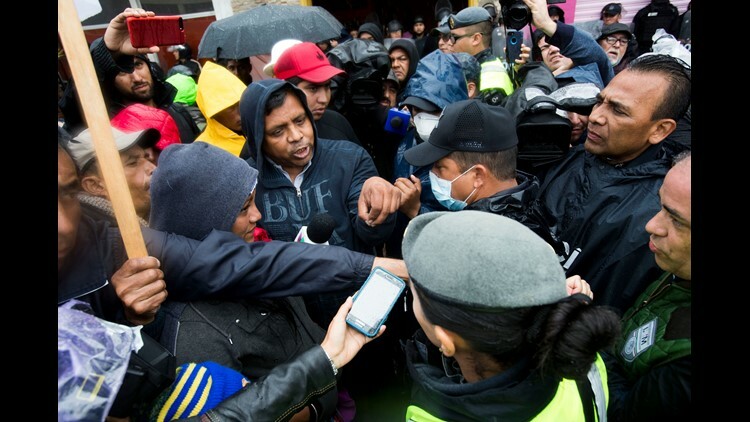 It is unknown if the two are members of a migrant caravan, but migrants from a first of three caravans continue to arrive by the hundreds in Tijuana. 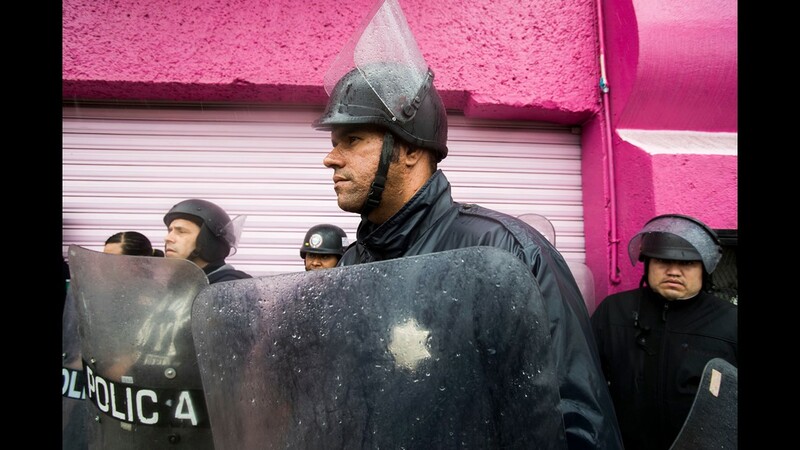 Mexican Federal Police stop a fight between Honduran immigrants and Mexican residents of Playas De Tijuana. 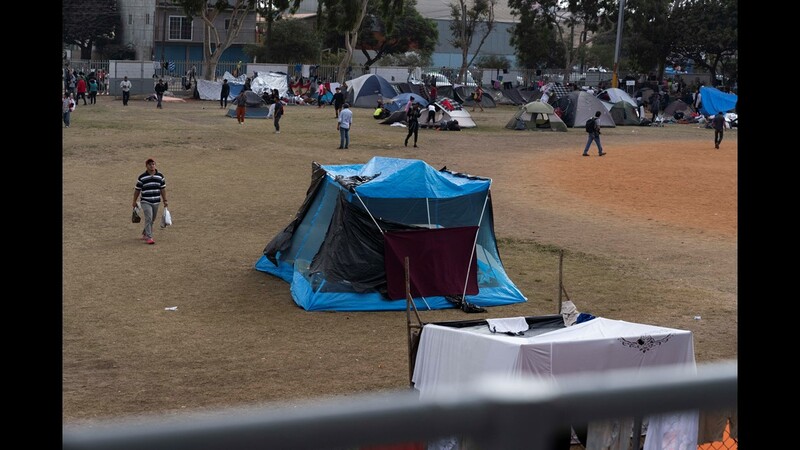 The migrants had set up a makeshift camp at "Friendship Park" in Playas De Tijuana on Nov 14, 2018. The Mexican residents demanded that the the migrants leave the area and threaten the migrants if they did not leave. 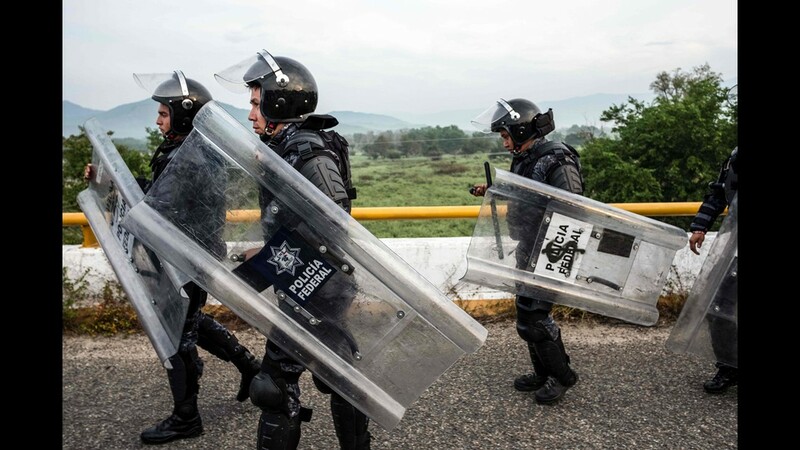 Federal and Municipal Mexican police kept both groups separated and some incidents of violence broke out throughout the night. 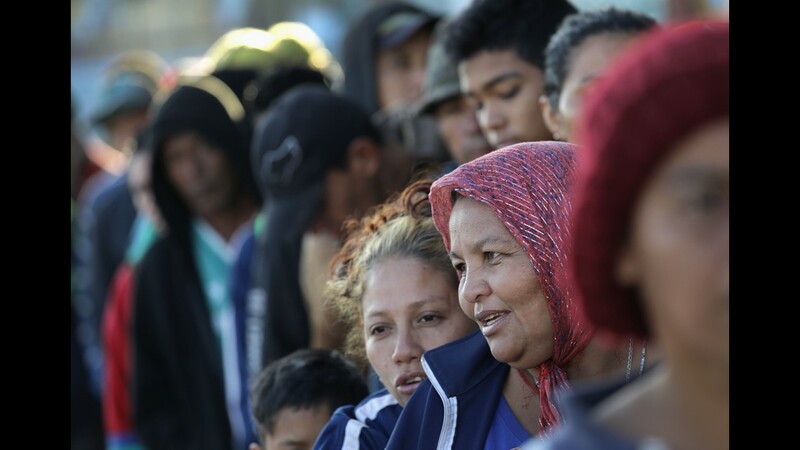 Honduran immigrants look on as Mexican residents of Playas De Tijuana confronted the migrants who had set up a makeshift camp at "Friendship Park" in Playas De Tijuana on Nov 14, 2018. U.S. Customs and Border Protection officer keep an eye on Members of the fist wave of the migrant caravan as they visit Playas De Tijuana after arriving in Tijuana, Mexico on Nov. 13, 2018. 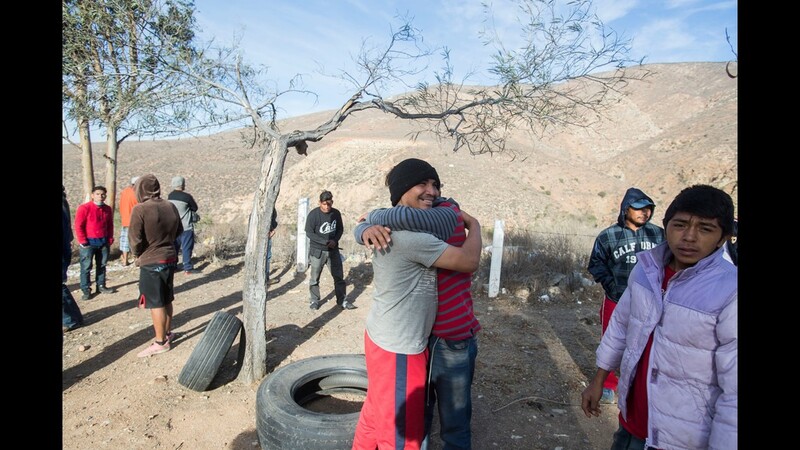 The group of 350 migrants traveled in 9 buses on the last part of the trip from Hermosillo, Sonora. 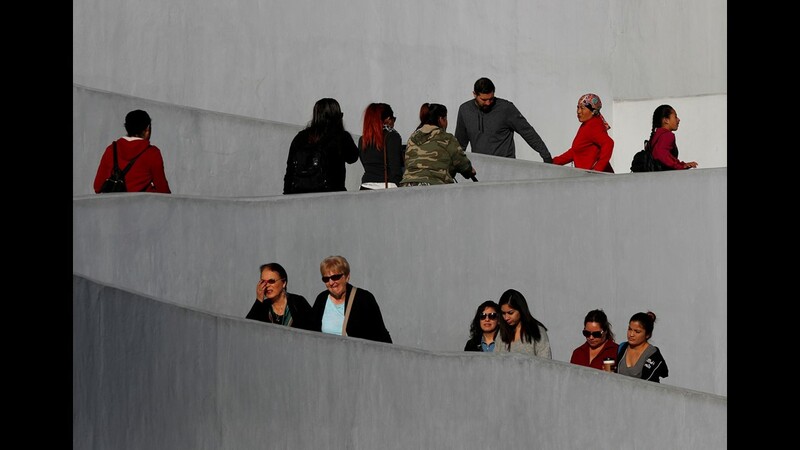 Members of the fist wave of the migrant caravan visit Playas De Tijuana after arriving in Tijuana, Mexico on Nov. 13, 2018. 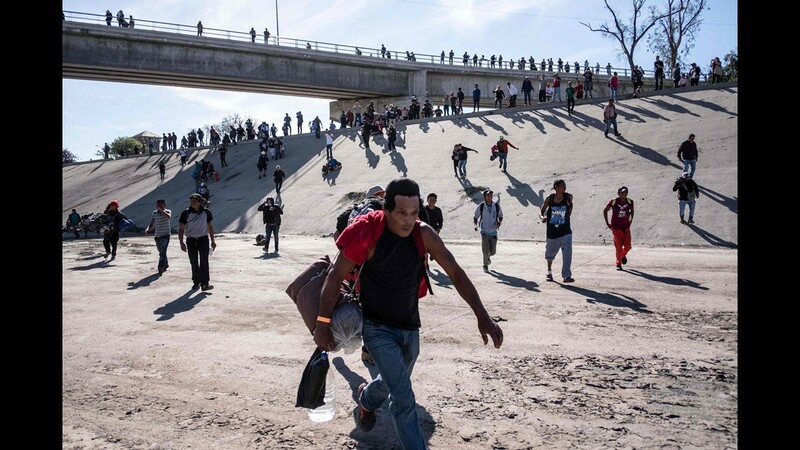 Members of the migrant caravan arrive on the outskirts of Tijuana, Mexico on Nov. 13, 2018. The group of 350 migrants traveled in 9 buses on the last part of the trip from Hermosillo, Sonora. 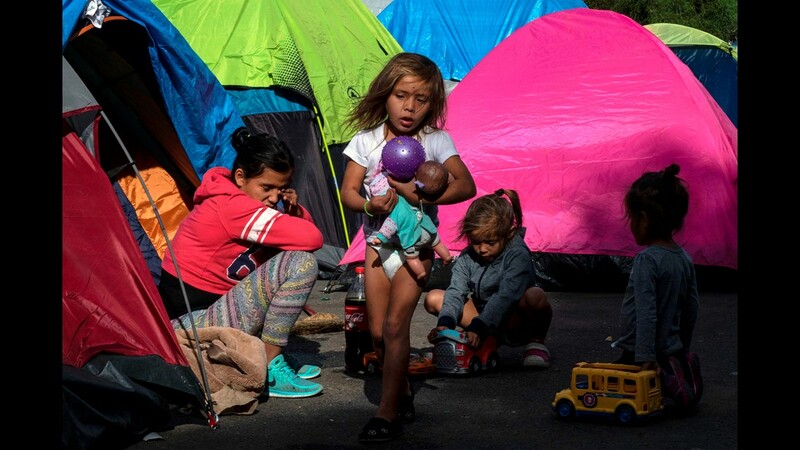 Members of the migrant caravan arrive on the outskirts of Tijuana, Mexico on Nov. 13, 2018. 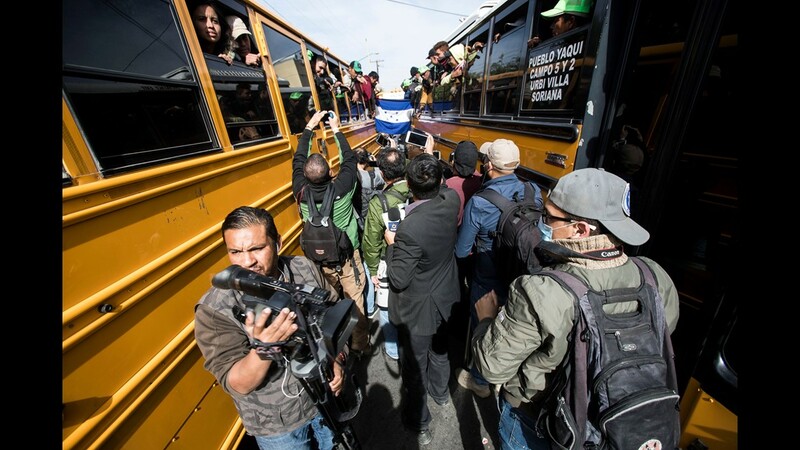 Mexican media swarm members of the fist wave of the migrant caravan as they arrive in Tijuana, Mexico on Nov. 13, 2018. 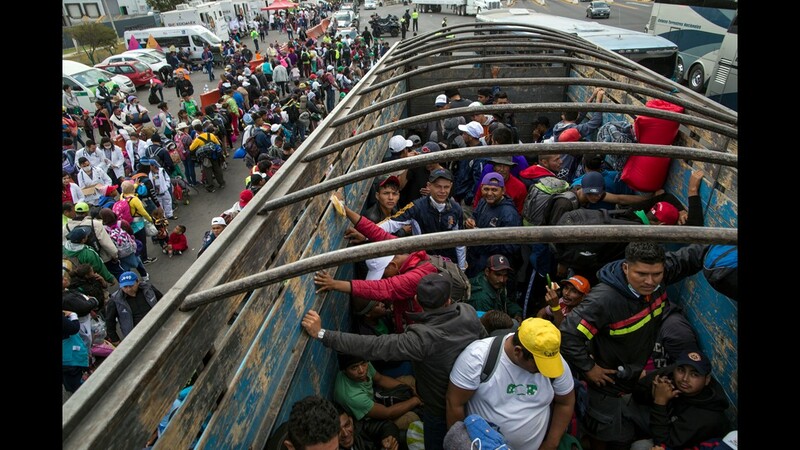 Members of the fist wave of the migrant caravan decided to head to Playas De Tijuana after arriving in Tijuana, Mexico on Nov. 13, 2018. Members of the caravan of Central American migrants prepare to leave Mexico City, Mexico, and resume their journey to the United States on Nov. 10, 2018. 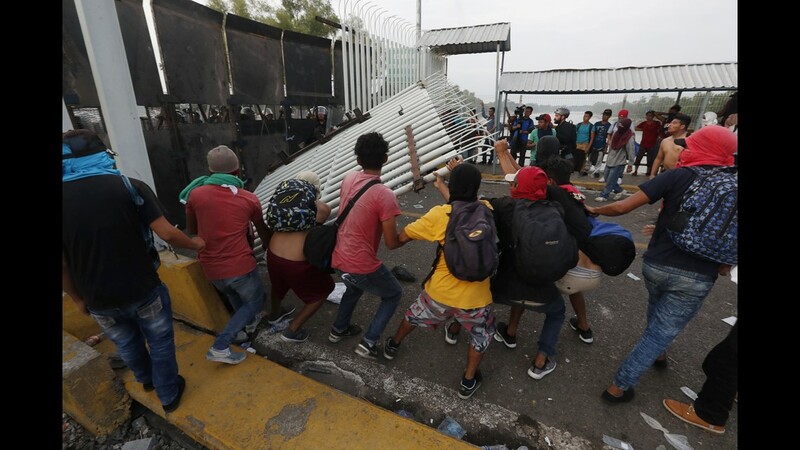 After failing to get the UN to provide free transportation, thousands of migrants from the caravan of Central Americans camped in Mexico City agreed to prepare to leave the capital on Saturday and resume their march on foot to the United States. 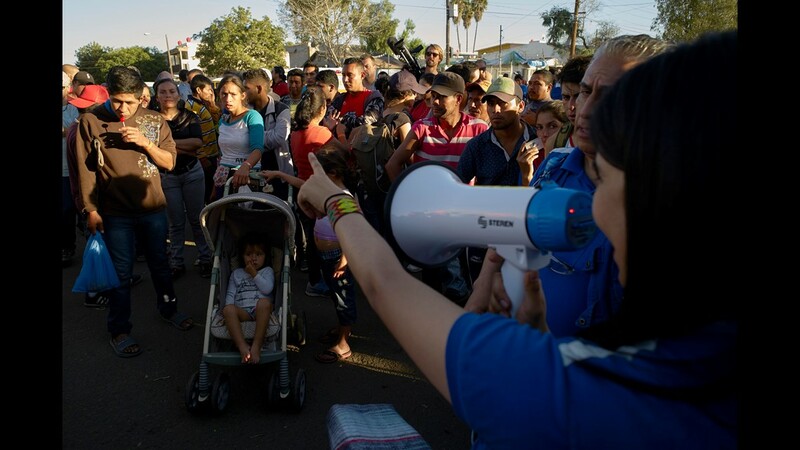 Groups of migrants, mostly young, did not comply with this decision and left early in the morning for Queretaro, north of the capital, although most of the approximately 5,000 people in the caravan remained in the camp, following the indications of Pueblo Sin Fronteras, the organization that accompanies them. 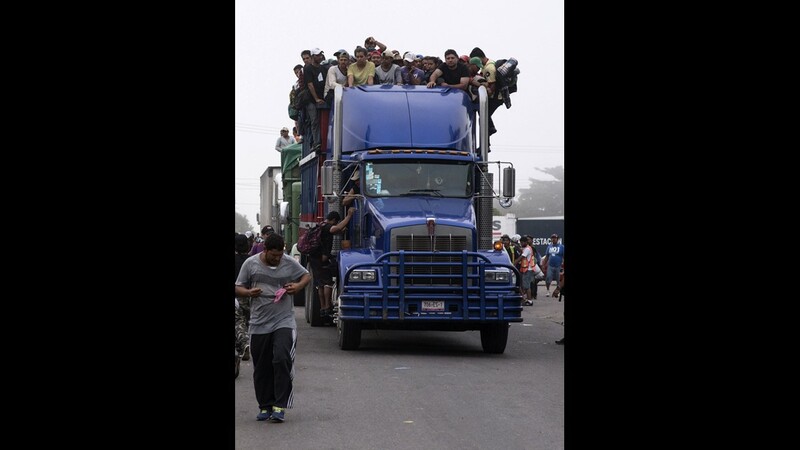 Central American migrants travel on a truck after hitching a ride in Tepotzotlan, Mexico, as they resume their journey north after leaving the temporary shelter in Mexico City, Saturday, Nov. 10, 2018. 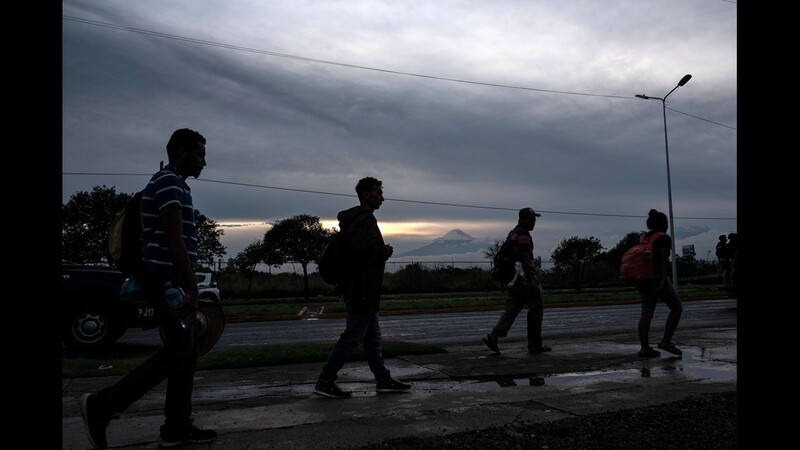 Central American migrants stand in line hoping to hitch a ride in Tepotzotlan, Mexico, as they resume their journey north after leaving the temporary shelter at the Jesus Martinez stadium, Saturday, Nov. 10, 2018. 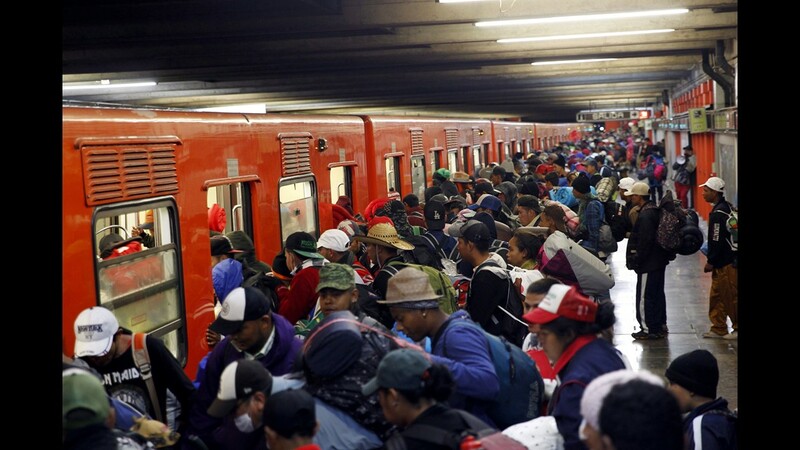 Thousands of Central American migrants were back on the move toward the U.S. border Saturday, after dedicated Mexico City metro trains whisked them to the outskirts of the capital and drivers began offering rides north. 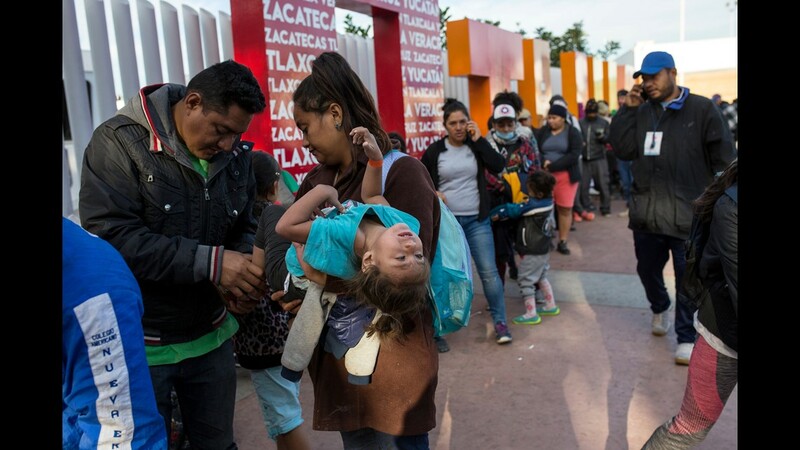 Central American migrants arrive in Tepotzotlan, Mexico, as they resume their journey north after leaving a temporary shelter in Mexico City, Saturday, Nov. 10, 2018. 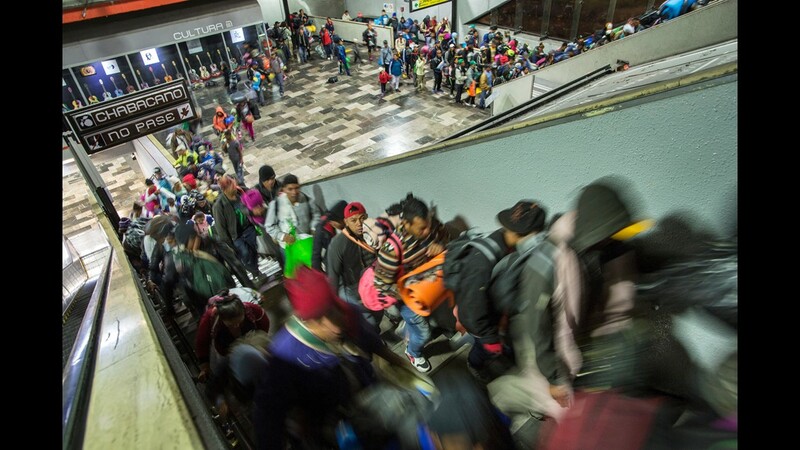 Central American migrants ride an escalator at a subway station as they resume their journey north after leaving the temporary shelter at the Jesus Martinez stadium, in Mexico City, Saturday, Nov. 10, 2018. Members of the second migrant caravan depart from the municipality of Matias Romero Oaxaca, to the state of Veracruz, Mexico on Nov. 9, 2018. 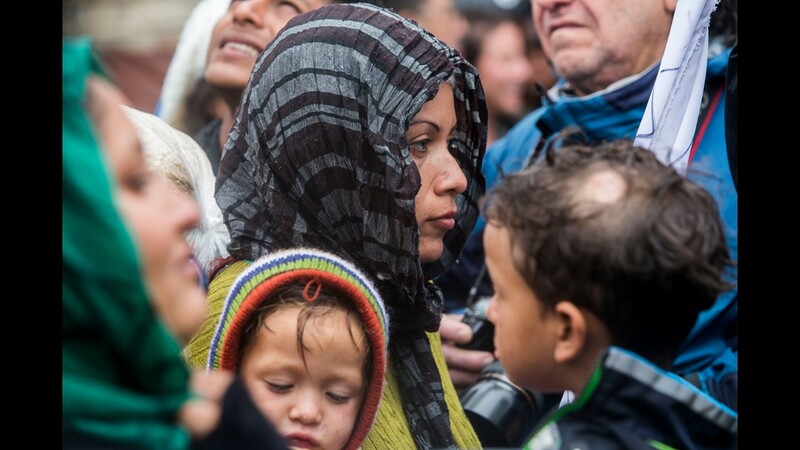 After failing to get the UN to provide them with free transportation, thousands of migrants agreed to prepare to leave the capital on November 10 and resume their march on foot to the United States. 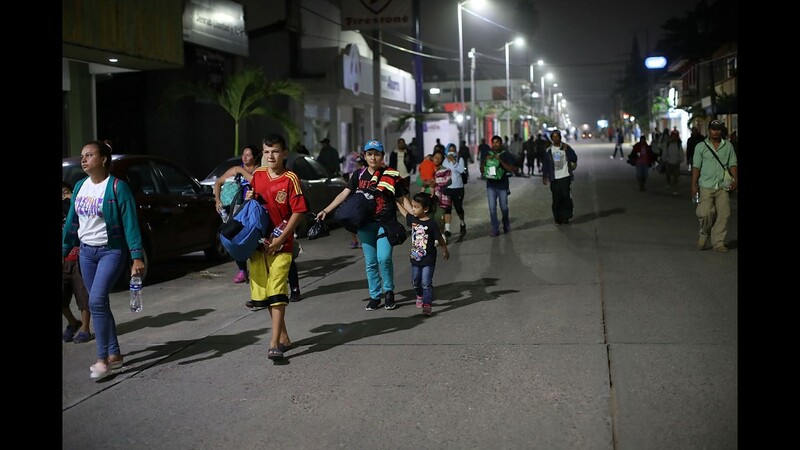 Hundreds of members of the Central American migrant caravan move in the early hours toward their next destination on Nov. 04, 2018, in Isla, Mexico. 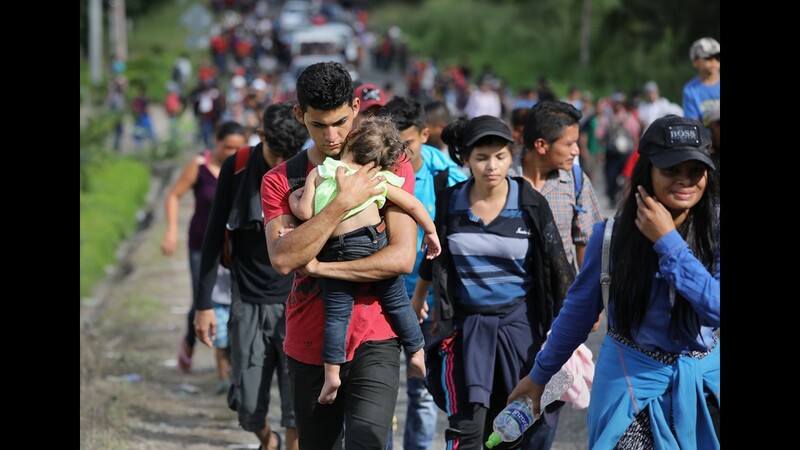 The group of migrants, many of them fleeing violence in their home countries, last took a rest day on Wednesday and have resumed their march to the United States border. As fatigue from the heat, distance and poor sanitary conditions has set in, the number of people participating in the march has slowly dwindled, but a significant group are still determined to get to the United Sates. The U.S. will deploy more than 5,000 active-duty troops to the U.S.-Mexico border in an effort to prevent members of the migrant caravan from illegally entering the country. Migrants from Central American countries headed towards the United States in hopes of a better life or to escape violence make a stop at a temporary shelter at a sports complex in Mexico City, on Nov. 4, 2018. A man bathes in the rain outside a temporary shelter set up for a splinter group of a migrant caravan hoping to reach the U.S. border, in Cordoba, Veracruz state, Mexico, Sunday, Nov. 4, 2018. 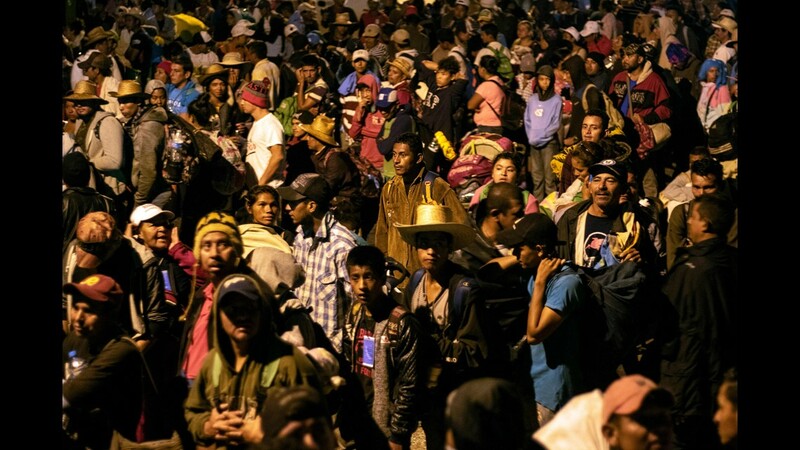 Hundreds of members of the Central American migrant caravan move in the early hours toward their next destination on Nov. 04, 2018 in Isla, Mexico. 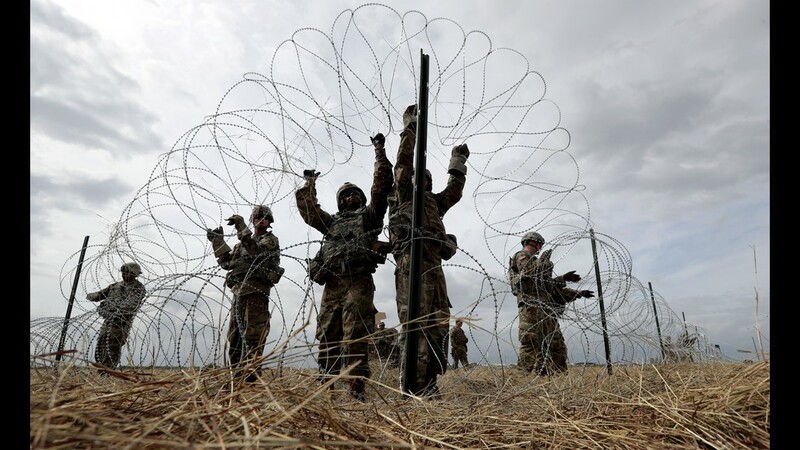 U.S. Army soldiers from Ft. Riley, Kansas string razor wire near the port of entry at the U.S.-Mexico border on Nov. 4, 2018 in Donna, Texas. 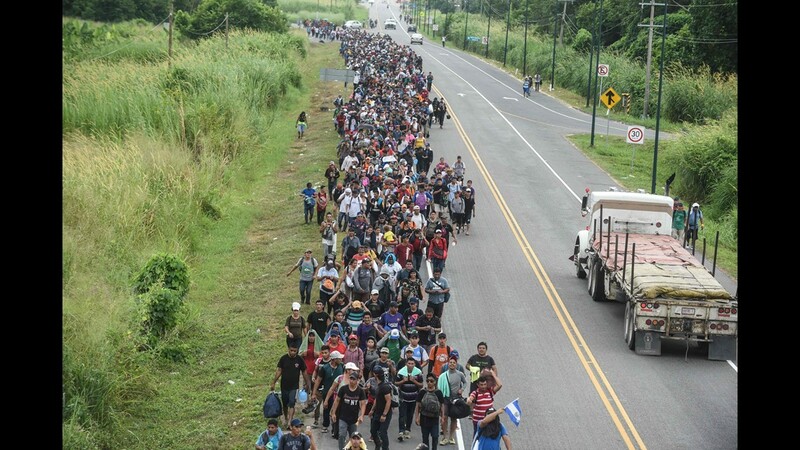 President Trump ordered the troops to border areas ahead of the possible arrival of an immigrant caravan in upcoming weeks. Migrant hands hold on inside a truck as hundreds of members of the Central American migrant caravan move in the early hours toward their next destination on Nov. 04, 2018 in Isla, Mexico. 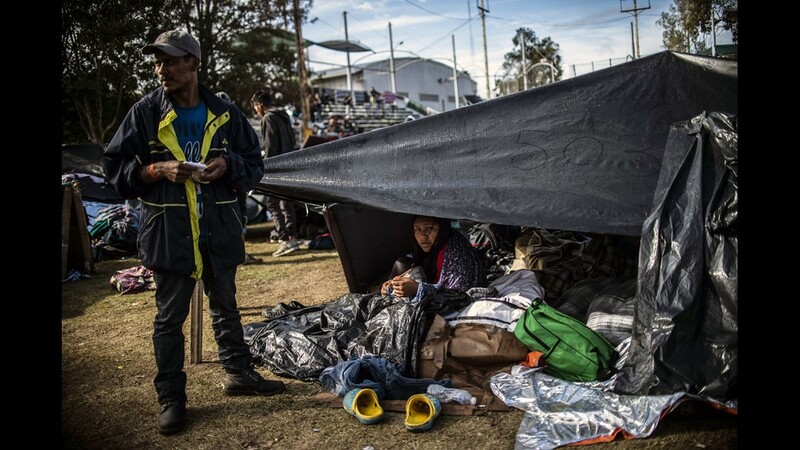 Migrants -mostly Hondurans- taking part in a caravan heading to the US, rest at the Asuncion temple -fitted out as a temporary shelter- in Puebla, Puebla state, Mexico, on Nov. 4, 2018. 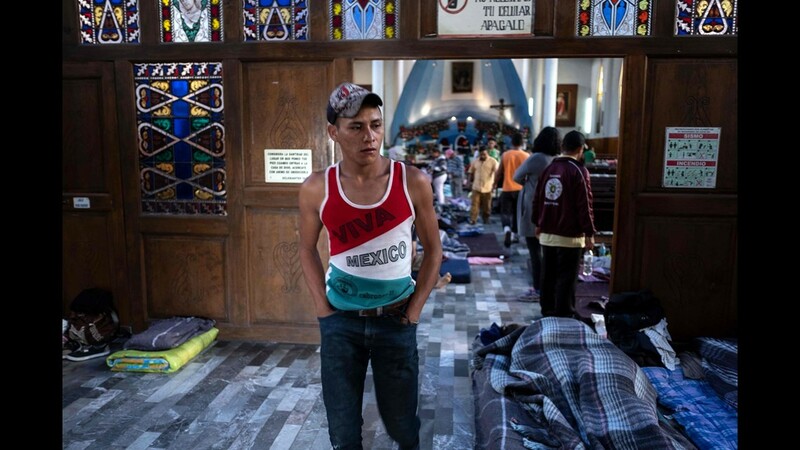 A migrant taking part in a caravan heading to the US, stands in the Asuncion temple, outfitted as a temporary shelter, in Puebla, Puebla state, Mexico, on Nov. 4, 2018. 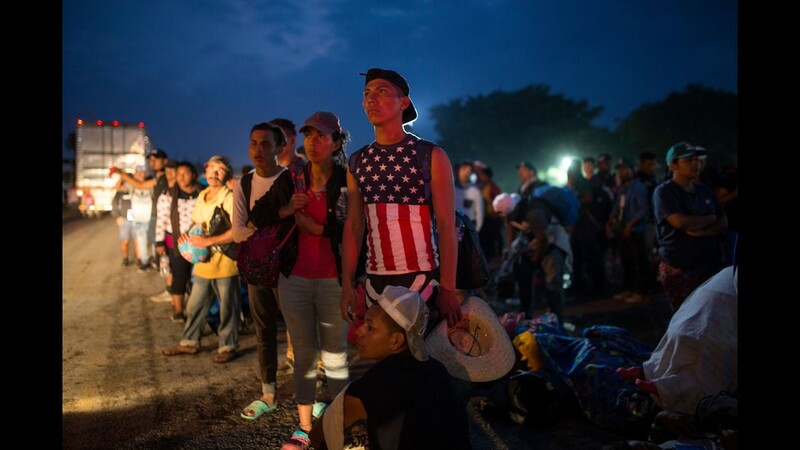 Members of the migrant caravan continue to make their way from Ciudad Isla, in the state of Veracruz, to the state of Puebla, in Mexico. 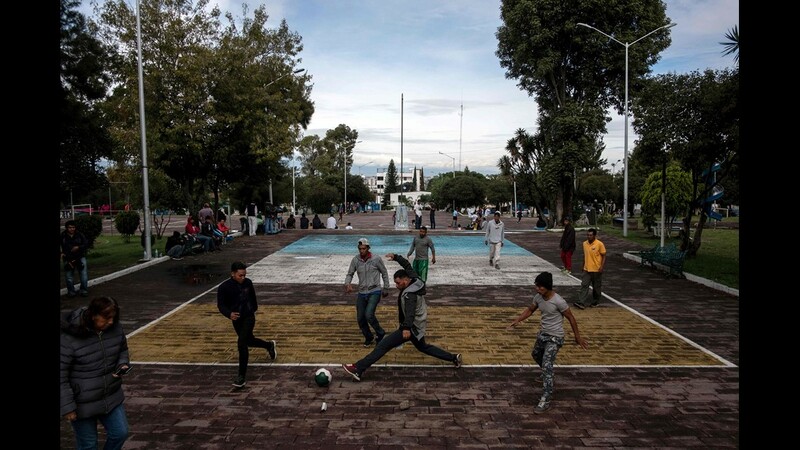 Migrants taking part in a caravan heading to the U.S., play at a park outside at the Asuncion temple in Puebla, Puebla state, Mexico, on Nov. 4, 2018. 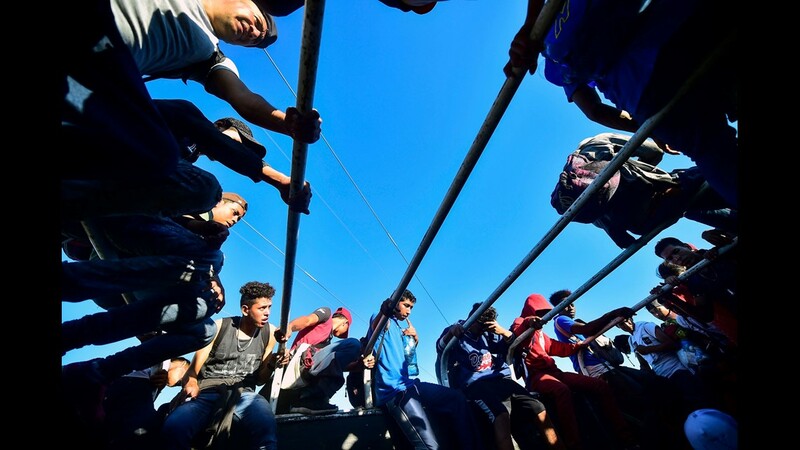 Central American migrants continue moving towards the United States in hopes of a better life or to escape violence, head to a shelter after arriving in Puebla, Mexico, on Nov. 4, 2018. 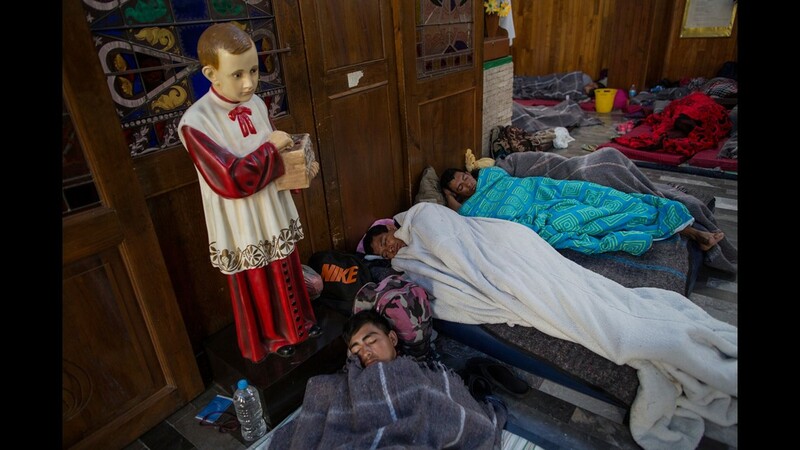 Members of the migrant caravan arrive at the shelter of the Church of the Assumption, in the city of Puebla, in Puebla state, Mexico, Nov. 4, 2018. 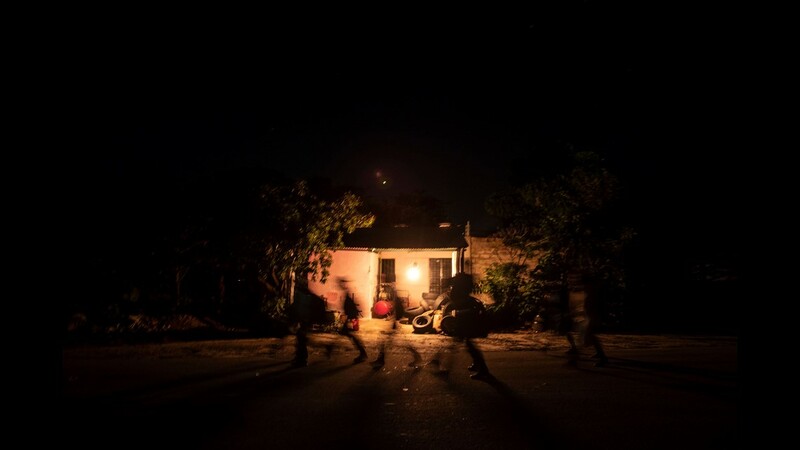 Members of the Central American migrant caravan move in the early hours towards their next destination on Nov. 04, 2018 in Isla, Mexico. 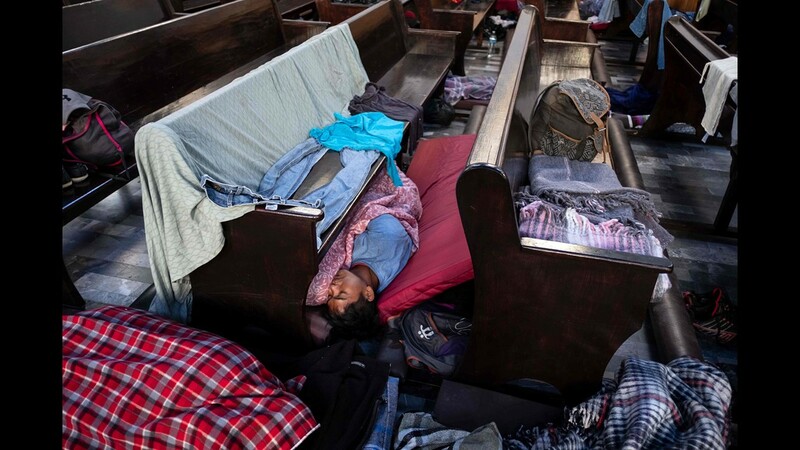 Central American migrants sleep inside a church that opened its doors to members of a caravan who splintered off the main group in order to reach the capital faster, in Puebla, Mexico, early Sunday, Nov. 4, 2018. 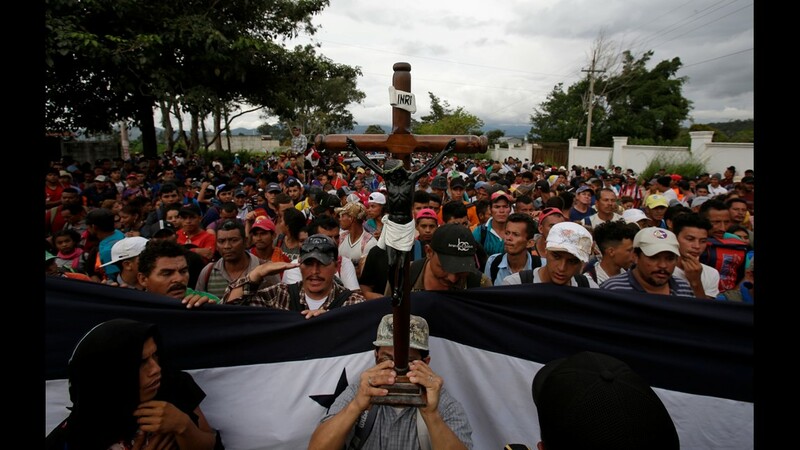 Thousands of Central American migrants resumed their push toward the United States on Sunday, a day after arguments over the path ahead saw some travelers splinter away from the main caravan, which is entering a treacherous part of its journey through Mexico. 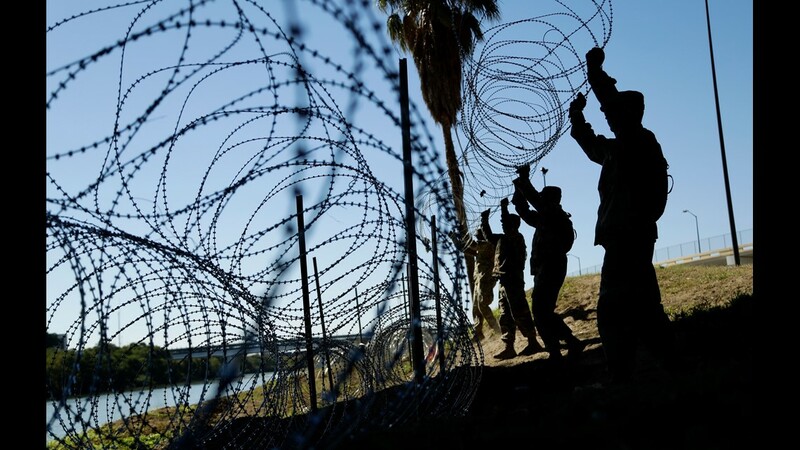 Members of a U.S Army engineering brigade place Concertina wire around an encampment for troops, Department of Defense and U.S. Customs and Border Protection near the U.S.-Mexico International bridge, Sunday, Nov. 4, 2018, in Donna, Texas. 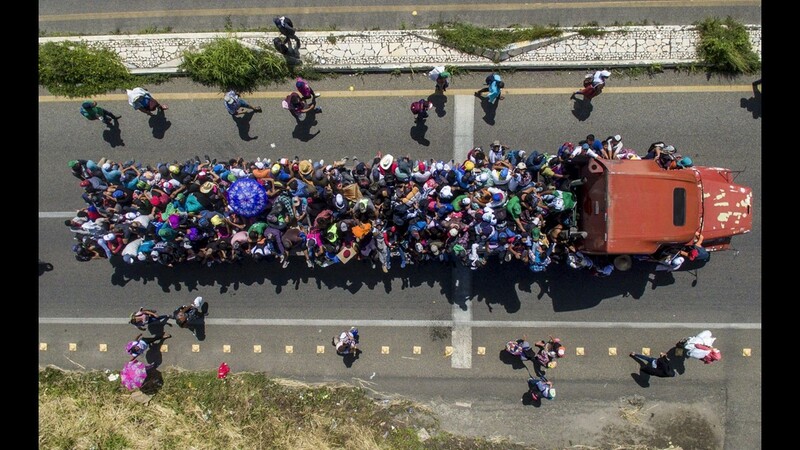 Aerial view of migrants taking part in a caravan heading to the U.S., on their way to Isla, Veracruz State, Mexico, on Nov. 3, 2018. 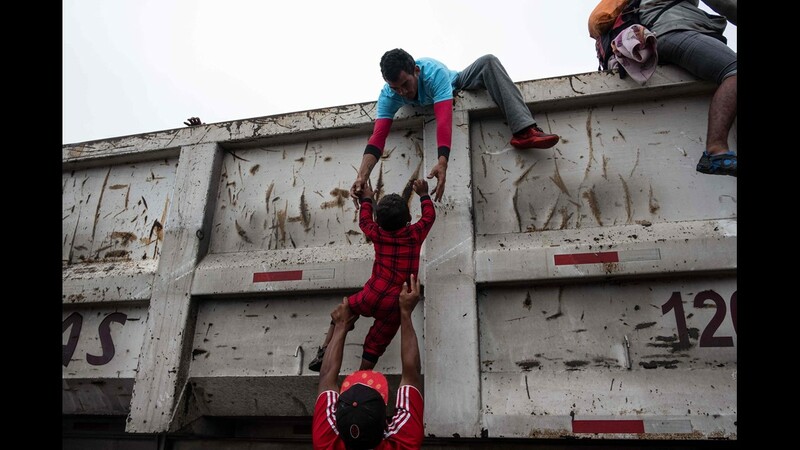 Migrants heading in a caravan to the U.S., help a child catch a ride on a truck on the road linking Sayula de Aleman and Isla, Veracruz state, Mexico, on Nov. 3, 2018. 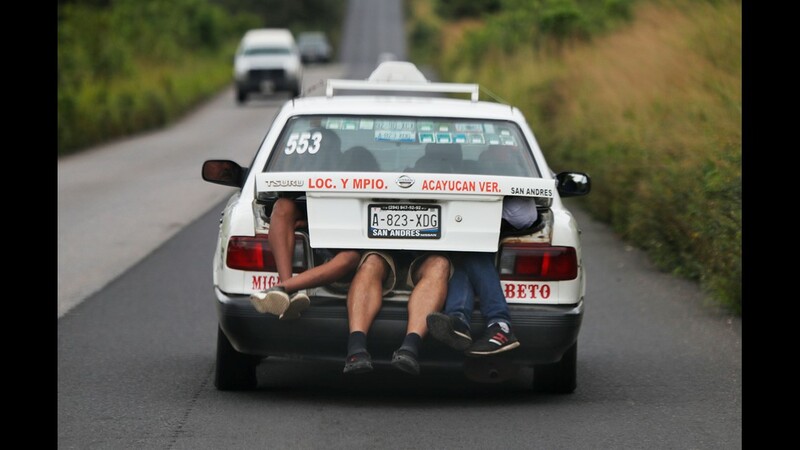 Central American migrants, part of the caravan hoping to reach the U.S. border, a ride on in the trunk of a taxi, in Acayucan, Veracruz state, Mexico, Saturday, Nov. 3, 2018. 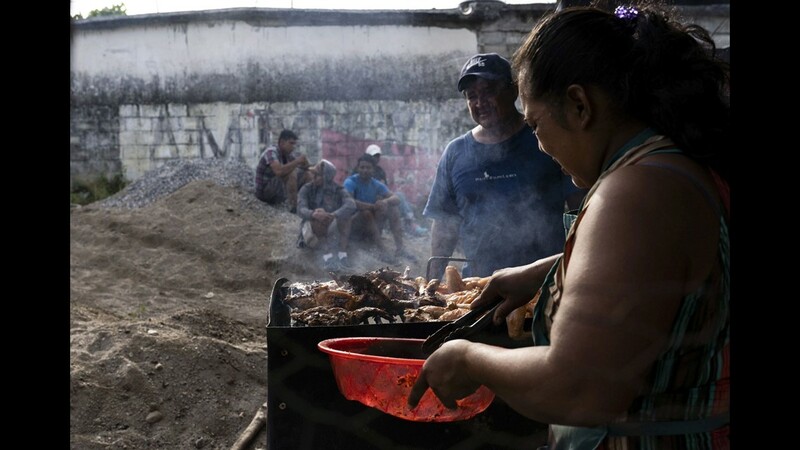 The migrant caravan continues their journey to the United States through Ciudad Isla, state of Veracruz, Mexico, Nov. 3, 2018. Members of the migrant caravan continue their journey to the United States through Ciudad Isla, state of Veracruz, Mexico, on Nov. 3, 2018. 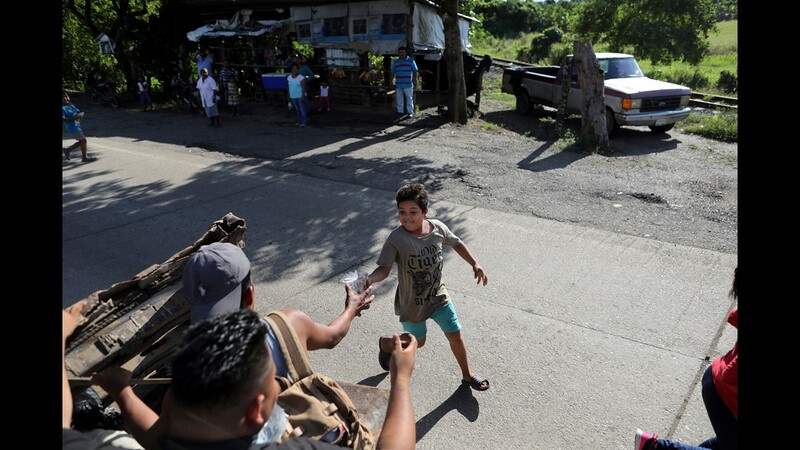 A boy gives food to central American migrants, part of the caravan hoping to reach the U.S. border, as they travel on a truck, in Loma Bonita, Oaxaca state, Mexico, Saturday, Nov. 3, 2018. 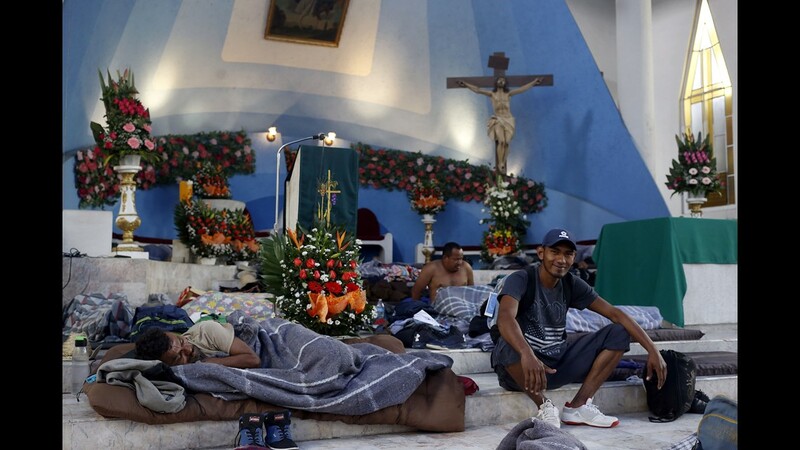 Members of the migrant caravan rest in a church upon their arrival in the city of Puebla, Mexico, Nov. 4, 2018. Migrants, mostly Hondurans, taking part in a caravan heading to the US, catch a ride on the road on their way to Isla, Veracruz State, Mexico, on Nov. 3, 2018. Members of the Central American migrant caravan move towards their destination of the United States border on Nov. 03, 2018 in Sayula de Aleman, Mexico. 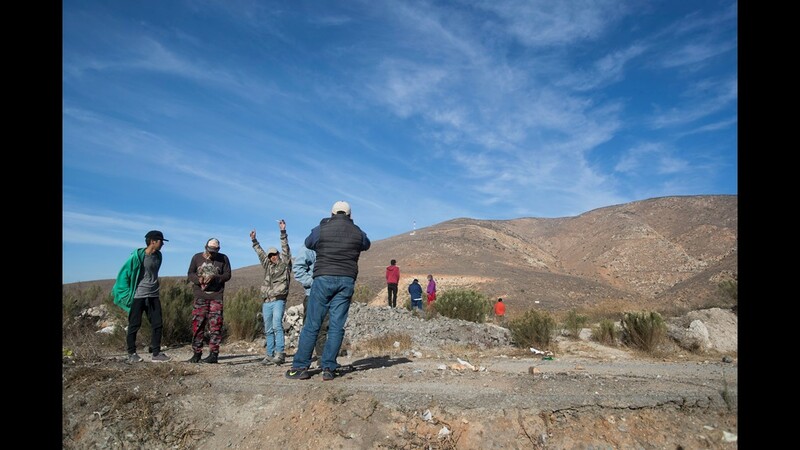 The group of migrants, many of them fleeing violence in their home countries, last took a rest day on Wednesday and has resumed their journey. 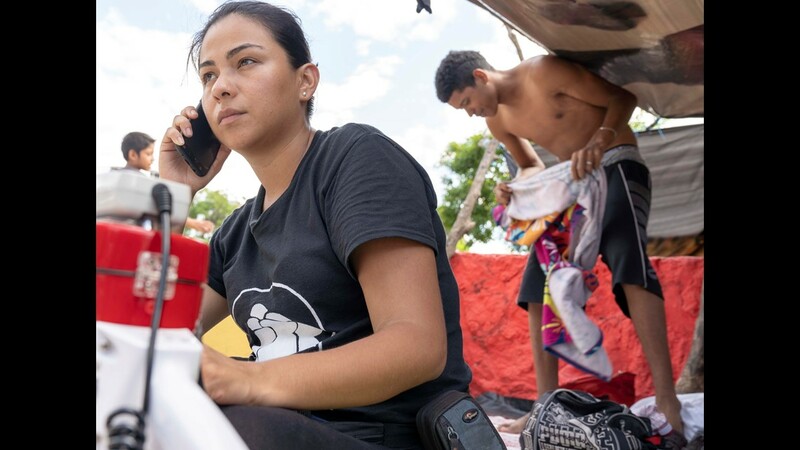 As fatigue from the heat, distance and poor sanitary conditions has set in, the numbers of people participating in the trek has slowly dwindled but a significant group are still determined to get to the United States. 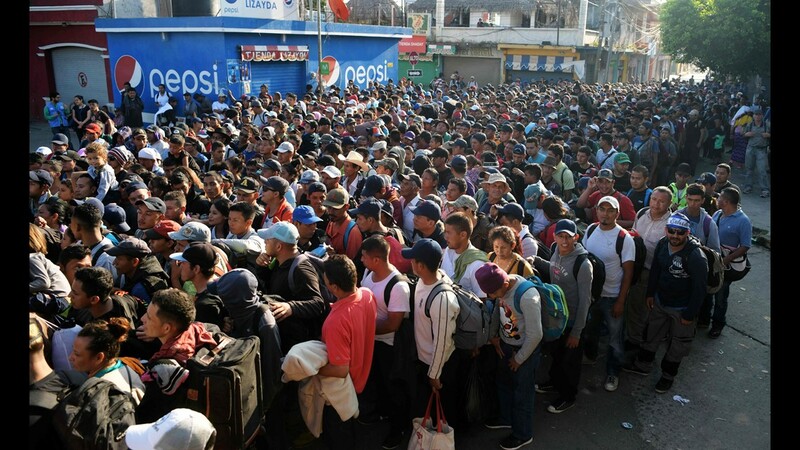 President Donald Trump said Wednesday as many as 15,000 troops may be deployed to the U.S.-Mexico border in an effort to prevent members of the migrant caravan from illegally entering the country. 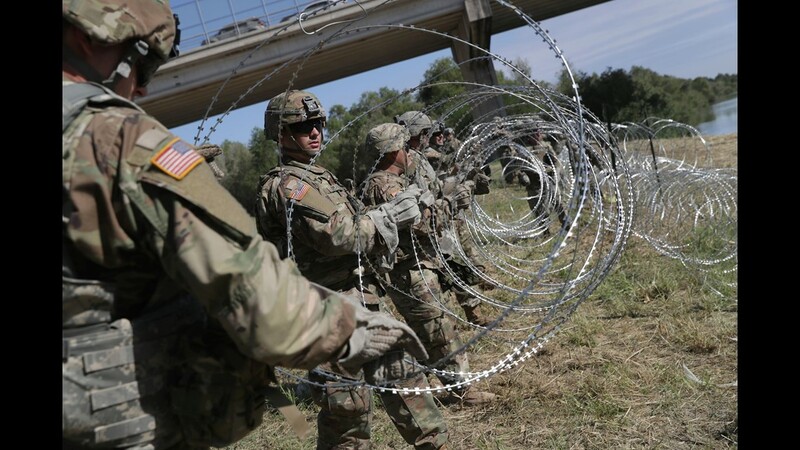 U.S. Army active duty troops from Ft. Riley, Kansas, 97th MP Battalion install protective wire along the Rio Grande at the U.S.-Mexico border on Nov. 2, 2018 in Hidalgo, Texas. 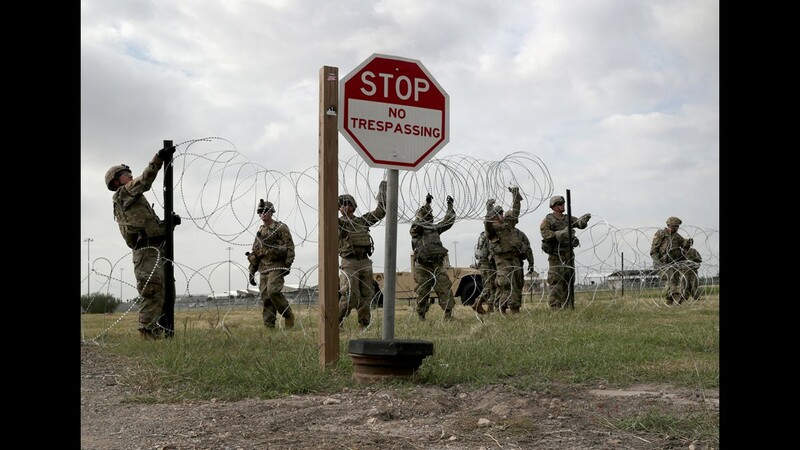 U.S. President Donald Trump ordered the troops to the border to bolster security at points of entry where an immigrant caravan may attempt to cross in upcoming weeks. 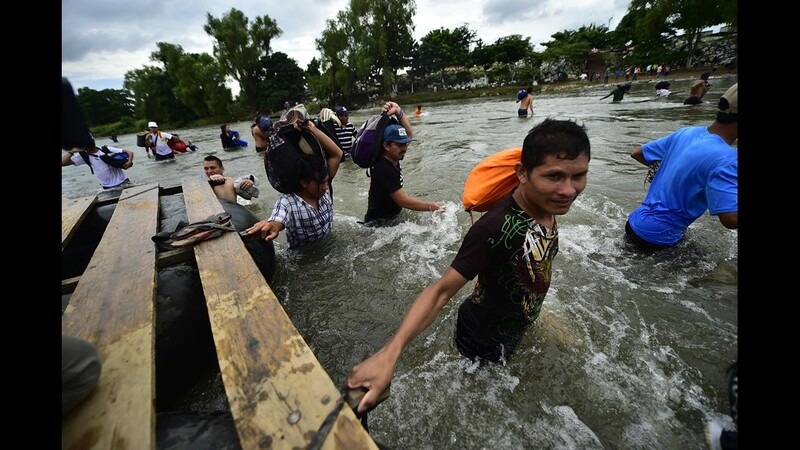 Salvadorian migrants heading in a caravan to the US, cross the Suchiate River to Mexico, from Ciudad Tecun Uman, Guatemala, on Nov. 02, 2018. 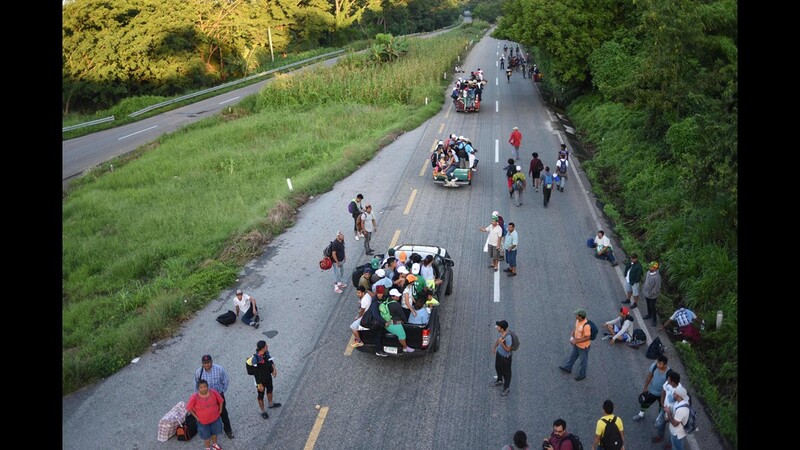 According to the Salvadorian General Migration Directorate, over 1,700 Salvadorians left the country in two caravans and entered Guatemala Wednesday, in an attempt to reach the US. 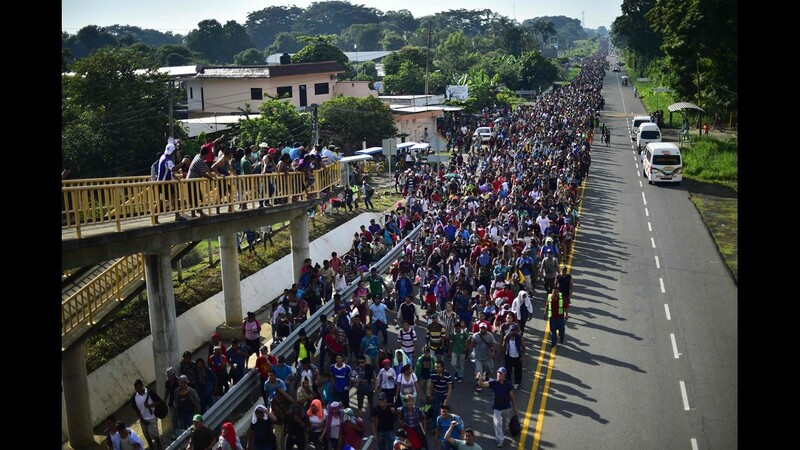 Hundreds of migrants -mostly Hondurans- taking part in a caravan heading to the US, gather before deciding to take the road on their way to Isla, Veracruz State, Mexico, on Nov. 3, 2018. President Donald Trump on Thursday warned that soldiers deployed to the Mexican border could shoot Central American migrants who throw stones at them while attempting to cross illegally. 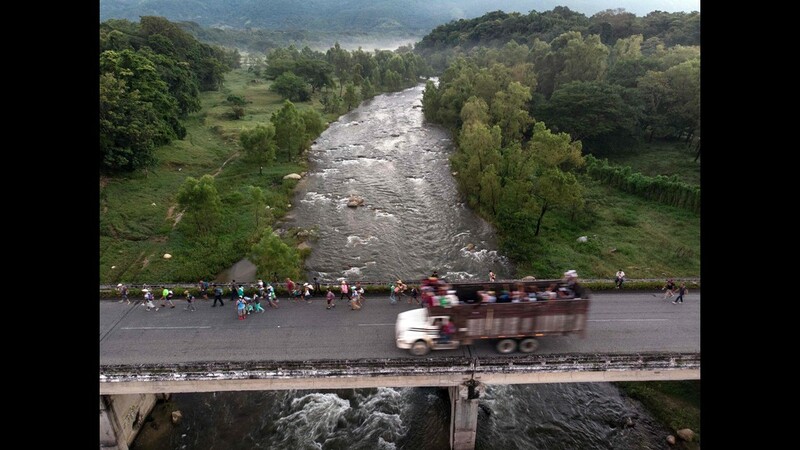 Salvadorian migrants heading in a caravan to the US, cross the Suchiate River to Mexico, as seen from Ciudad Tecun Uman, Guatemala, on Nov. 02, 2018. 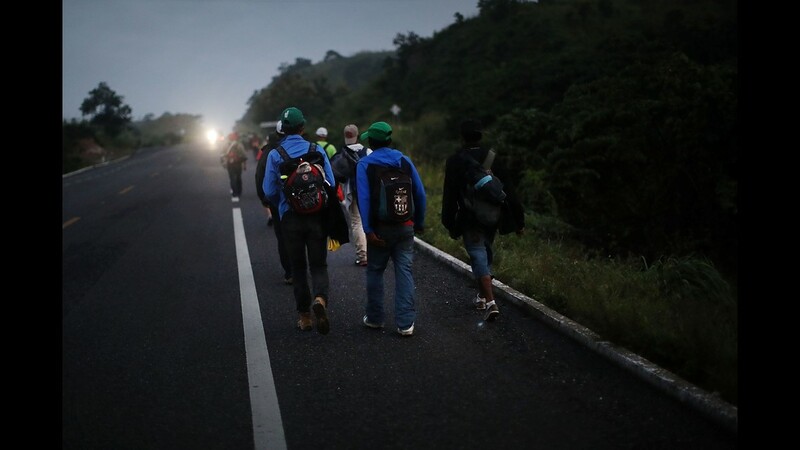 Salvadorian migrants heading in a caravan to the US, walk alongside the route, between Ciudad Hidalgo and Tapachula in Mexico on Nov. 02, 2018. 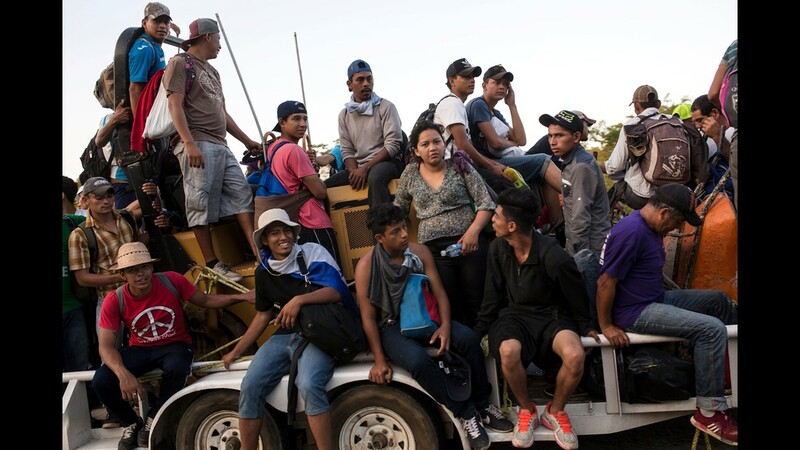 Central American migrants, part of the caravan hoping to reach the U.S. border, get a ride on a truck in Donaji, Oaxaca state, Mexico, Friday, Nov. 2, 2018. 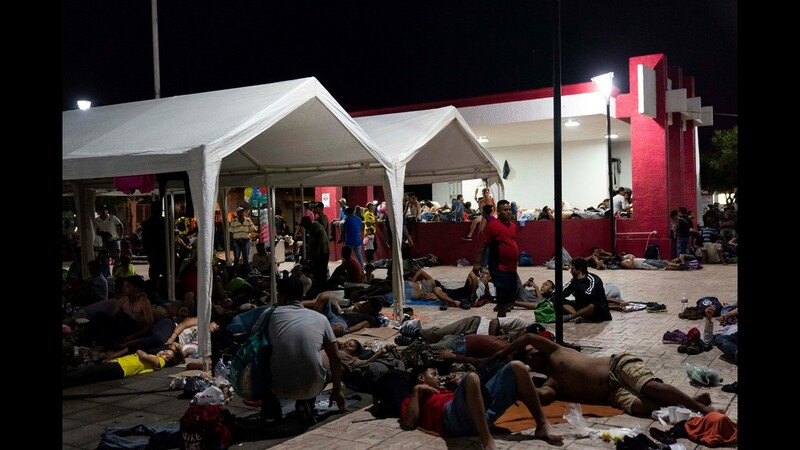 The migrants had already made a grueling 40-mile trek from Juchitan, Oaxaca, on Thursday, after they failed to get the bus transportation they had hoped for. But hitching rides allowed them to get to Donaji early, and some headed on to a town even further north, Sayula. Central American migrants, part of the caravan hoping to reach the U.S. border, wait for a ride in Donaji, Oaxaca state, Mexico, Friday, Nov. 2, 2018. 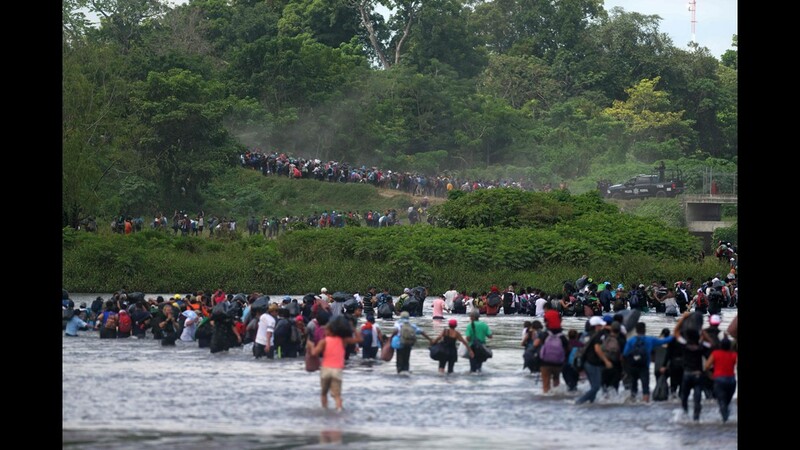 Salvadorian migrants heading in a caravan to the US, cross the Suchiate River to Mexico, as seen from Ciudad Tecun Uman, Guatemala, on Nov. 02, 2018. 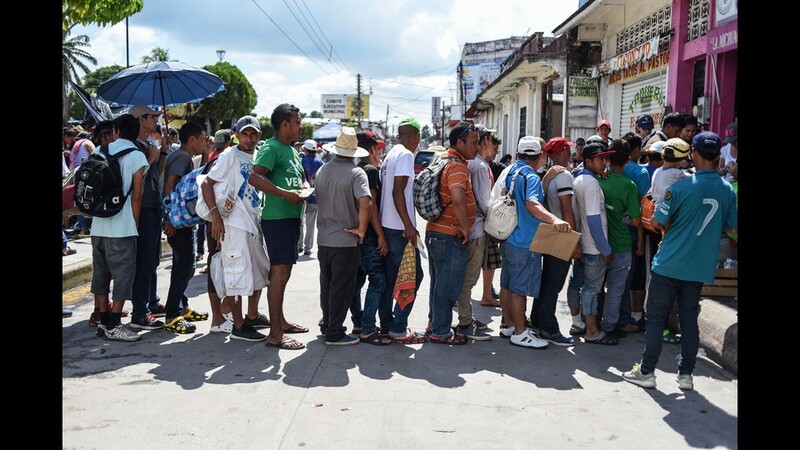 According to the Salvadorian General Migration Directorate, over 1,700 Salvadorians left the country in two caravans and entered Guatemala Wednesday, in an attempt to reach the US. 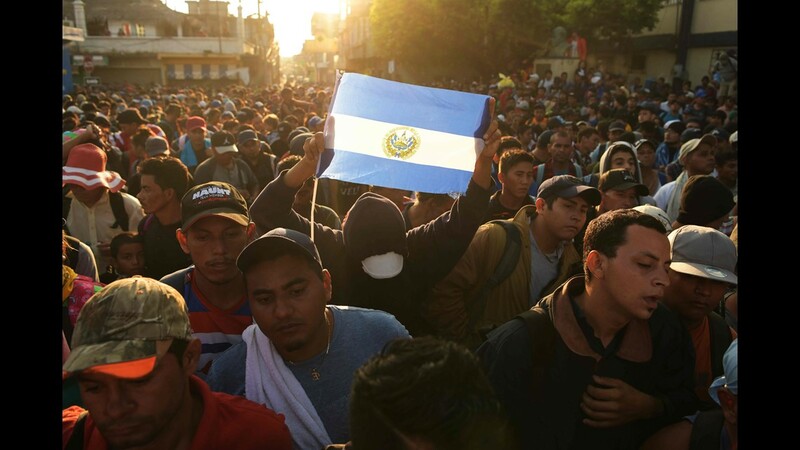 Salvadorian migrants with a national flag wait to enter the Guatemala-Mexico international border bridge in Ciudad Tecun Uman, Guatemala, on Nov. 2, 2018. 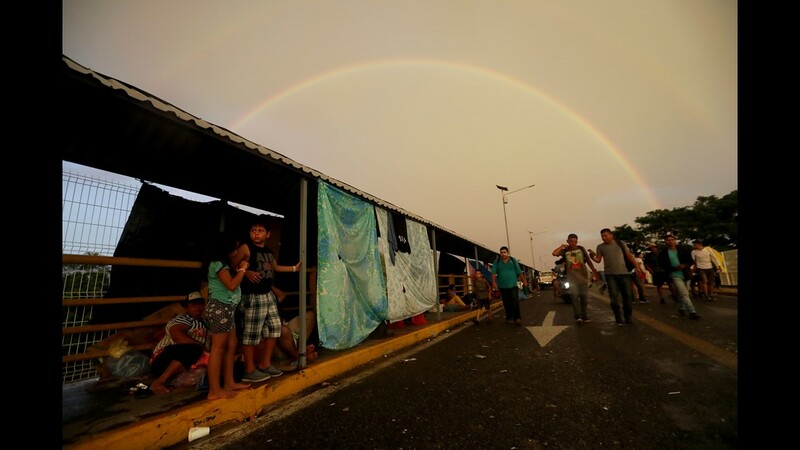 Salvadorian migrants wait to enter the Guatemala-Mexico international border bridge next to the customs building in Ciudad Tecun Uman, Guatemala, on Nov. 2, 2018. 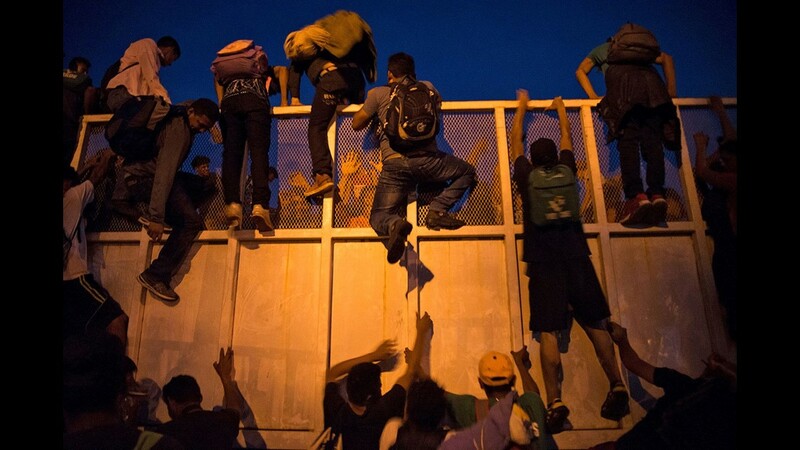 Salvadorian migrants climb and jump over a fence to get to the Guatemala-Mexico international border bridge in Ciudad Tecun Uman, Guatemala, on Nov. 2, 2018. 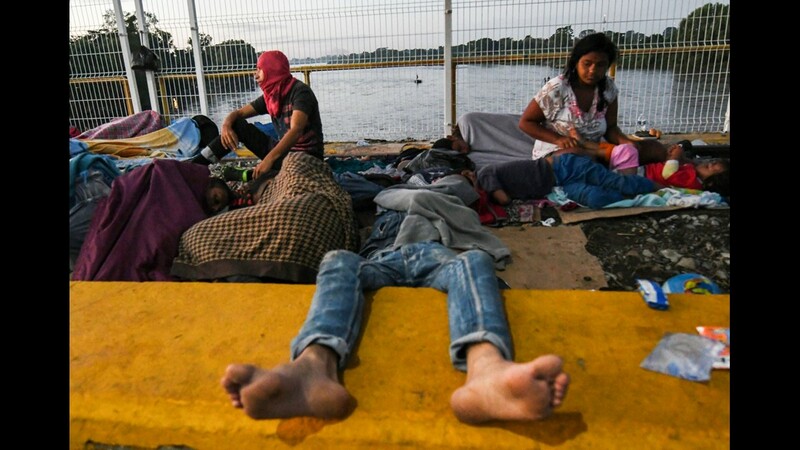 Salvadorian migrants wait to enter the Guatemala-Mexico international border bridge in Ciudad Tecun Uman, Guatemala, on Nov. 2, 2018. 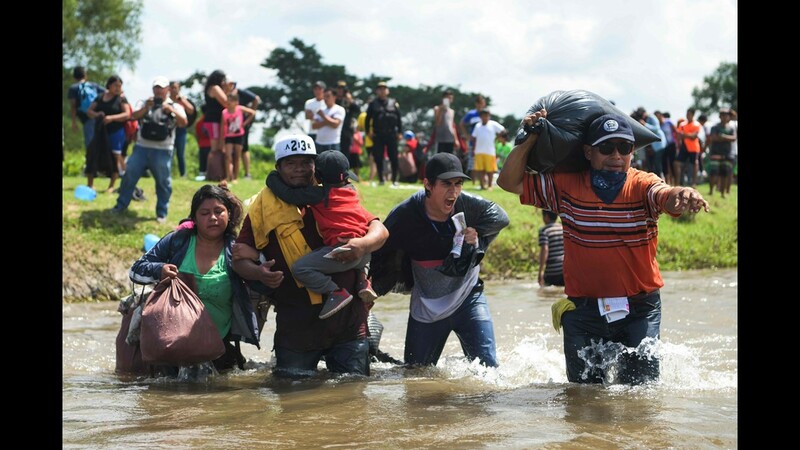 Honduran migrants heading in a caravan to the US, arrive in Ciudad Hidalgo, Mexico, after crossing the Suchiate River from Ciudad Tecun Uman, Guatemala, on Nov. 02, 2018. 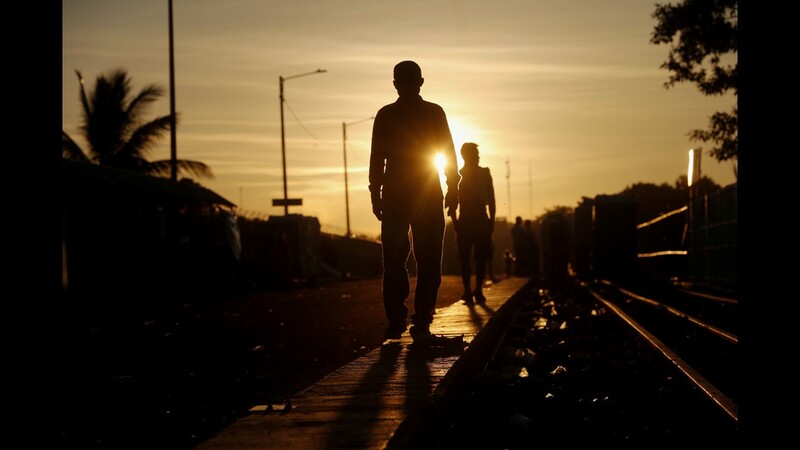 Members of the Central American migrant caravan move to the next town at dawn on Nov. 02, 2018 in Matias Romero, Mexico. 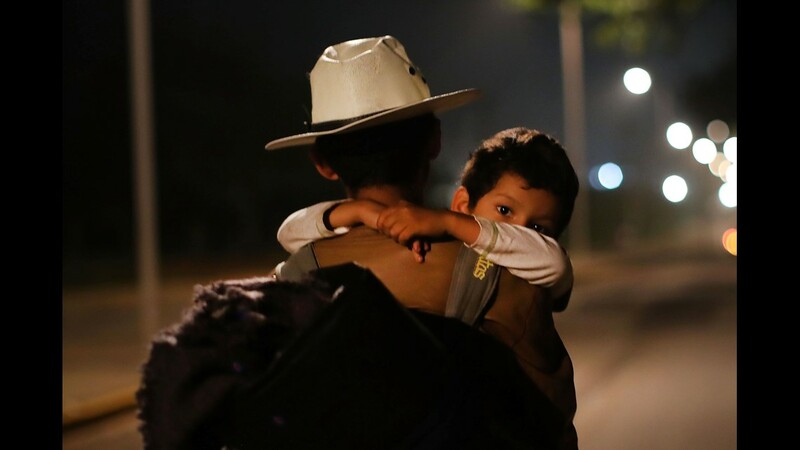 The group of migrants, many of them fleeing violence in their home countries, last took a rest day on Wednesday and has resumed their journey towards the United States border. 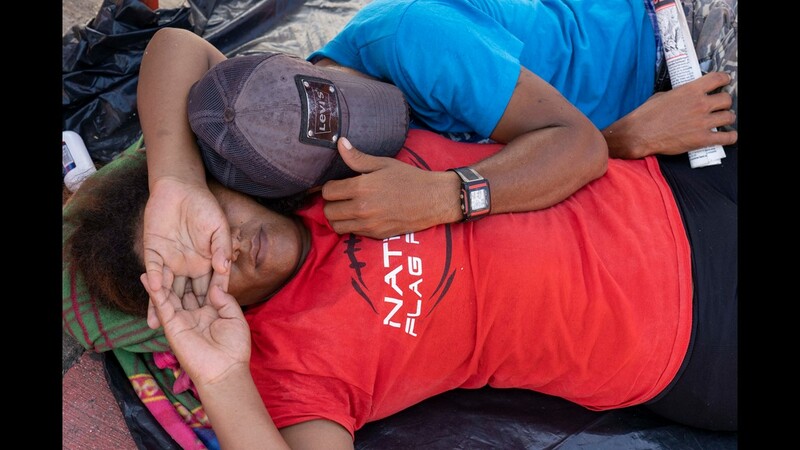 As fatigue from the heat, distance and poor sanitary conditions has set in, the numbers of people participating in the trek has slowly dwindled but a significant group are still determined to get to the United States. 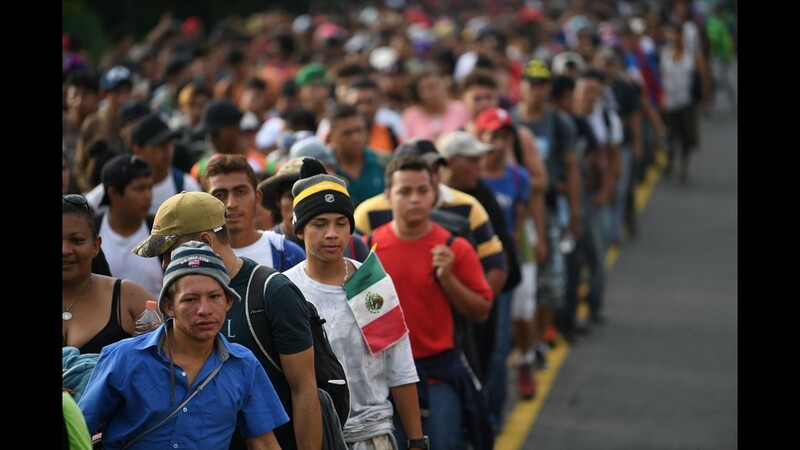 President Donald Trump said Wednesday as many as 15,000 active-duty troops may be deployed to the U.S.-Mexico border in an effort to prevent members of the migrant caravan from illegally entering the country. 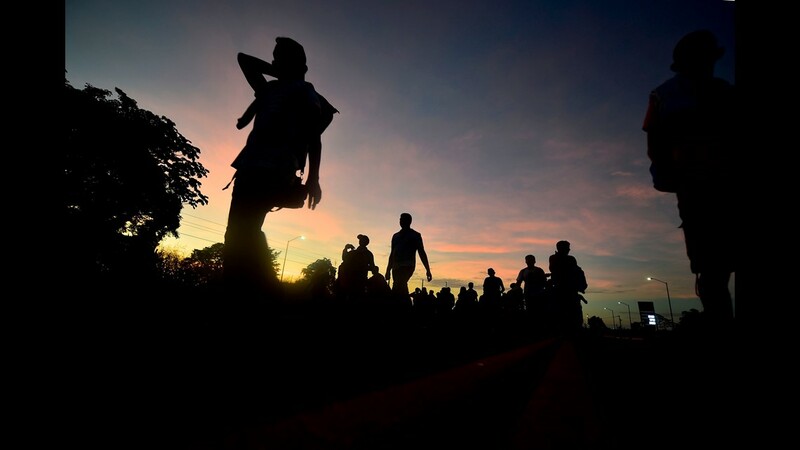 Members of the Central American migrant caravan move to the next town at dawn on Nov. 02, 2018 in Matias Romero, Mexico. 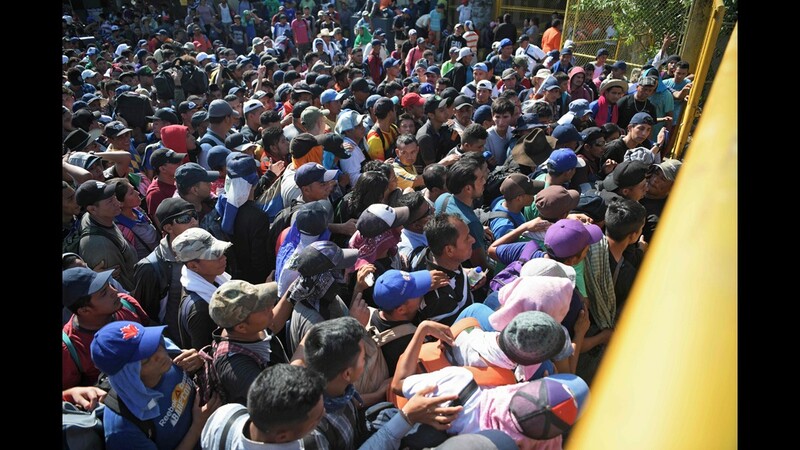 Another mass exodus of migrants, this time from El Salvador, in Tecun Uman, state of San Marcos, Guatemala was preparing to cross into Mexico from Thursday, Nov. 1, 2018. 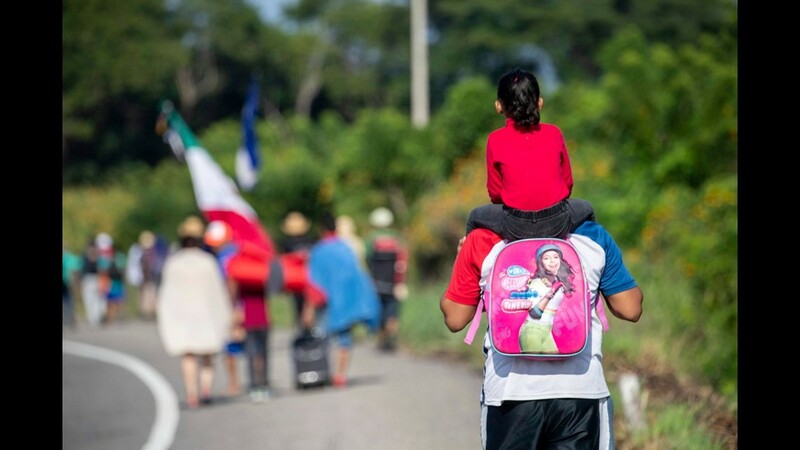 Mexican immigration officers have started allowing small groups of 50 to 200 migrants to cross the international bridge between Tecun Uman, Guatemala and Ciudad Hidalgo, to give them the chance to apply to remain in Mexico as refugees. Migrants attempt to cross the Suchiate River separating Mexico from Guatemala on Nov. 1, 2018. 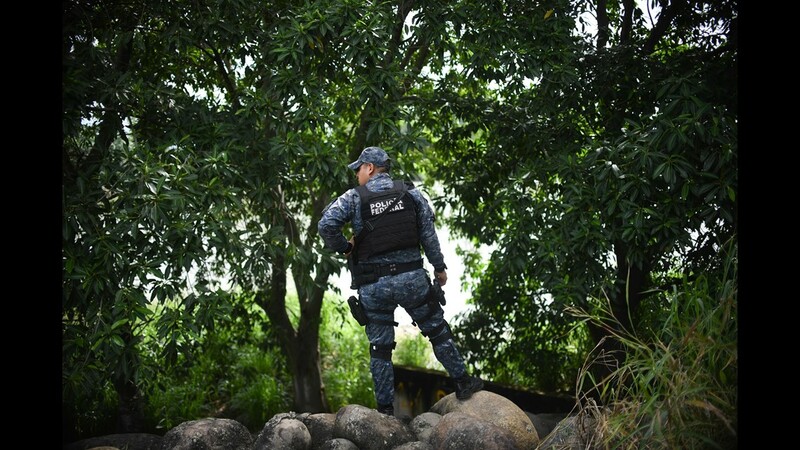 Mexican immigration officers, federal police stood on the banks and Mexican Marines patrolled the river by boat. 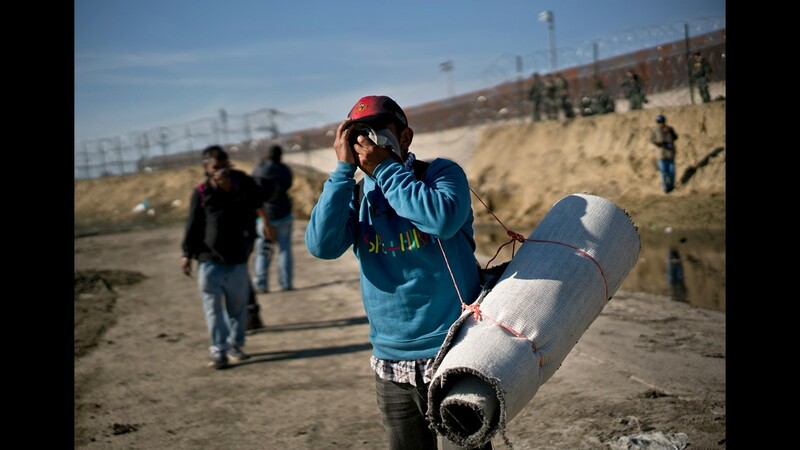 A Mexican immigration officer who was not authorized to speak said migrants from Central America are being offered the chance to apply for asylum to remain in Mexico as long as they can produce passports from their home countries or other documents ration. 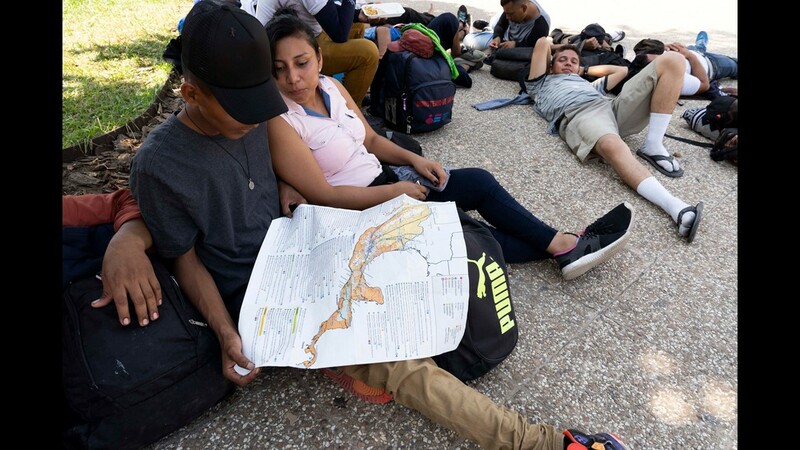 Kevin Vladimir, from El Salvador, looks at the route map while he joined another mass exodus of migrants, this time from El Salvador, was preparing to cross into Mexico from Guatemala Thursday, the large wave in less than two weeks. 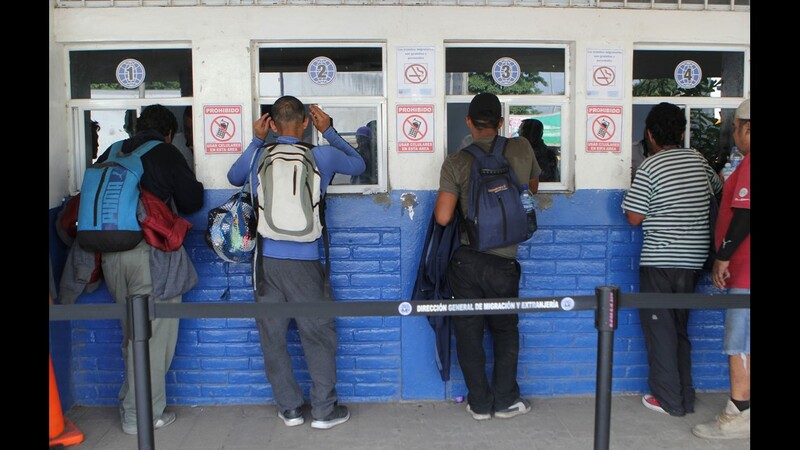 While Mexican immigration officers have started allowing small groups of 50 to 200 migrants to cross the international bridge between Tecun Uman, Guatemala and Ciudad Hidalgo, to give them the chance to apply to remain in Mexico as refugees, some migrants feared the offer was a trap to arrest and deport them. 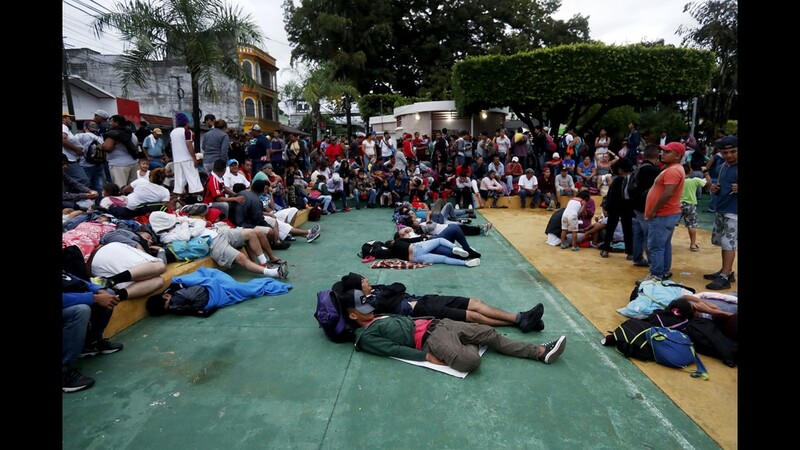 About 500 migrants lined the plaza of Tecun Uman, Guatamala. Some were waiting for a much larger group to arrive Thursday or Friday. Others said they didn’t want to wait and planned to cross at 4 p.m. Thursday. 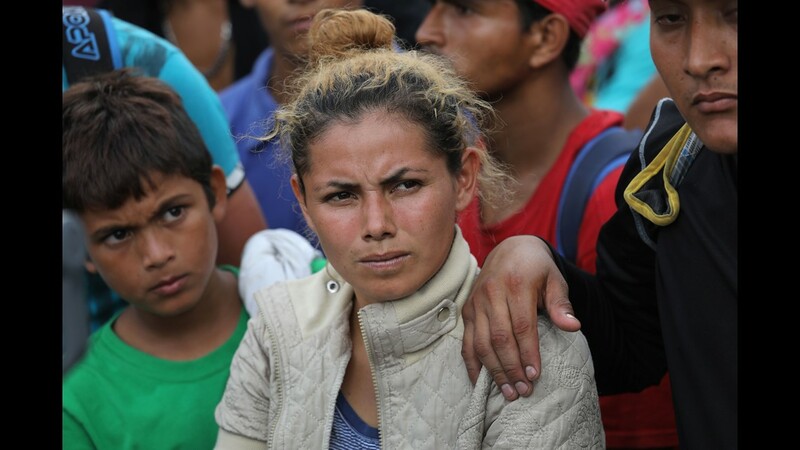 In Huixtla, Mexico, Yeni Cananero, 30, said she and her husband joined hundreds of migrants who waded across the chin deep river with their four children because the bridge was blocked. They said Mexican helicopters hovered over the water to create waves to deter the migrants from attempting to cross. She said her children almost drowned. 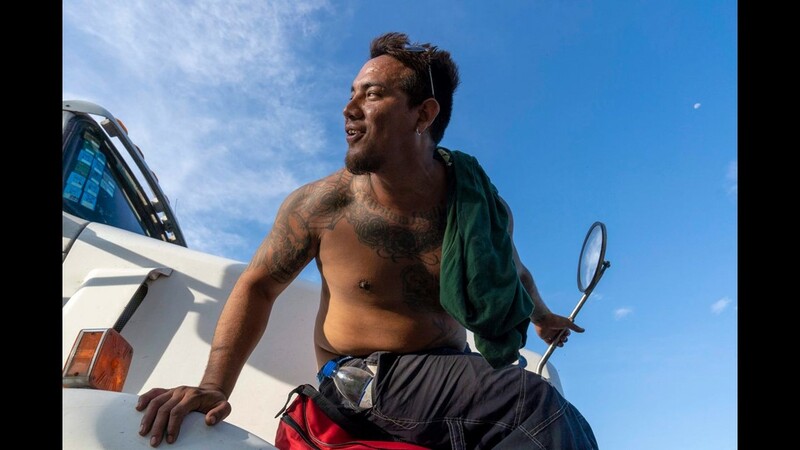 Cantanero said they fled Honduras because gangs had threatened to kill their family. 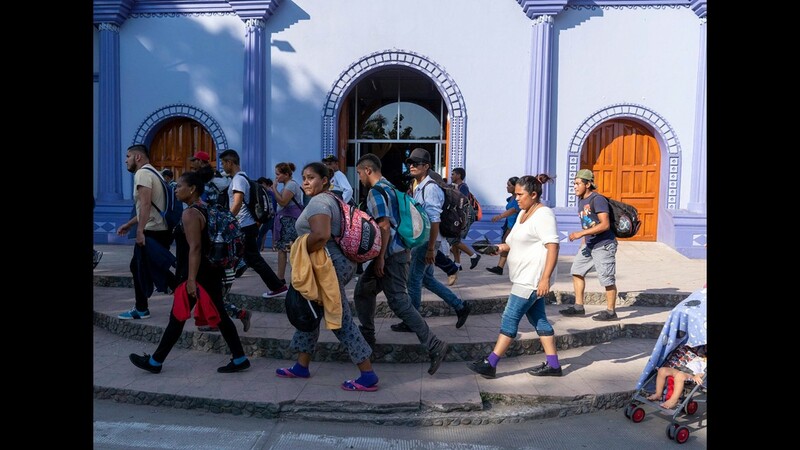 A second mass exodus of Central American migrants traveling in a caravan has entered Mexico and has reached the town of Huixtla about 50 miles north of the Guatemalan border. 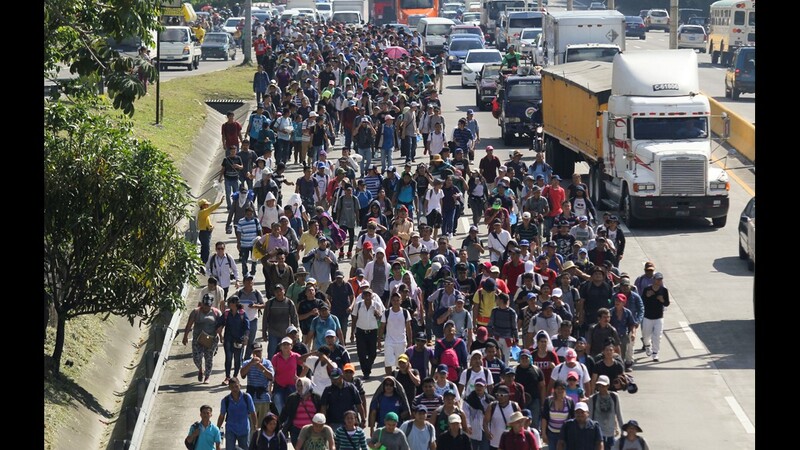 Migrants traveling with the group said 2,00O to 3,000 migrants are traveling in the caravan. 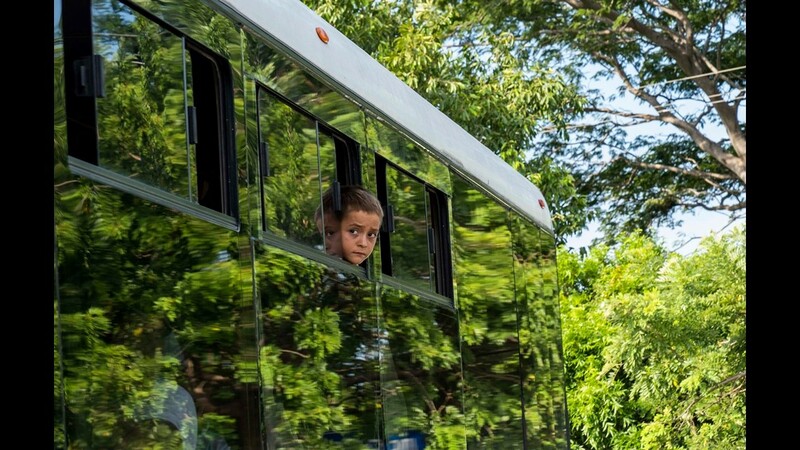 For the first time buses were used to transport migrant women and children arrives in Juchitan de Zaragoza on Oct. 30, 2018. 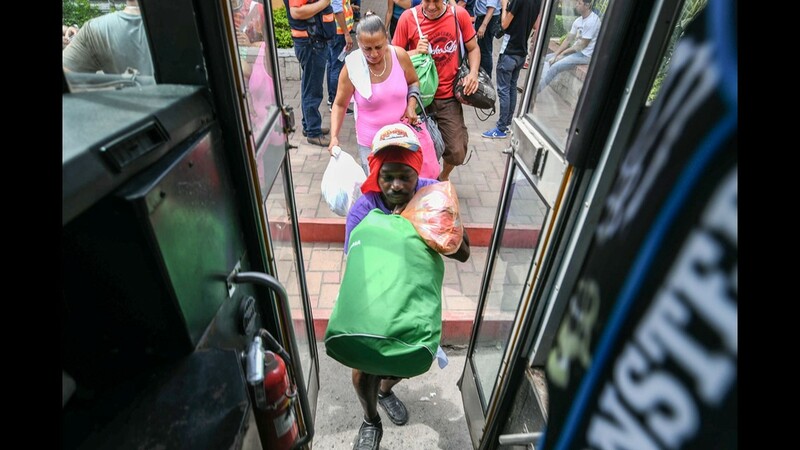 The president of the municipality has converted a vacant bus station into a temporary shelter for the migrants, offering the best conditions the migrants have experienced so far. A truck arrived packed with boxes filled with plastic bags already filled with snacks, water juice, and candy on On Oct. 30, 2018. Volunteers passed out plastic foam cups of coffee and bread in Juchitan de Zaragoza, Mexico. 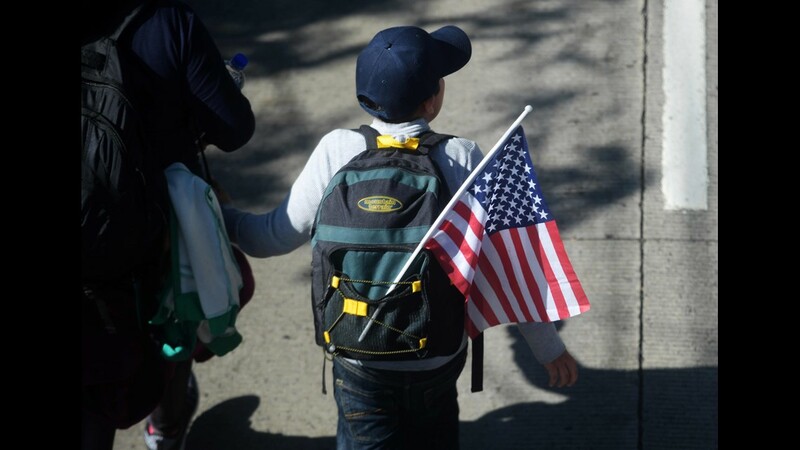 A boy with a US flag joins Salvadoran migrants embarking on a journey in caravan to the United States, in San Salvador on Oct. 31, 2018. 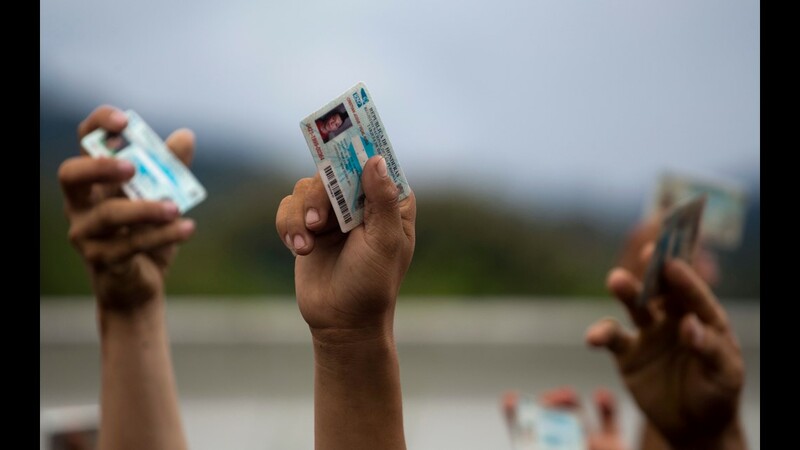 Many Salvadorians inspired by the much larger Honduran caravan already in Mexico and striving to reach the United States, are heading for the border with Guatemala in the hope of eventually realizing the "American dream" and reaching the US. Migrants -mostly Hondurans- taking part in a caravan heading to the US, begin their day at a temporary shelter in Juchitan, Oaxaca State, Mexico, on Oct. 31, 2018. 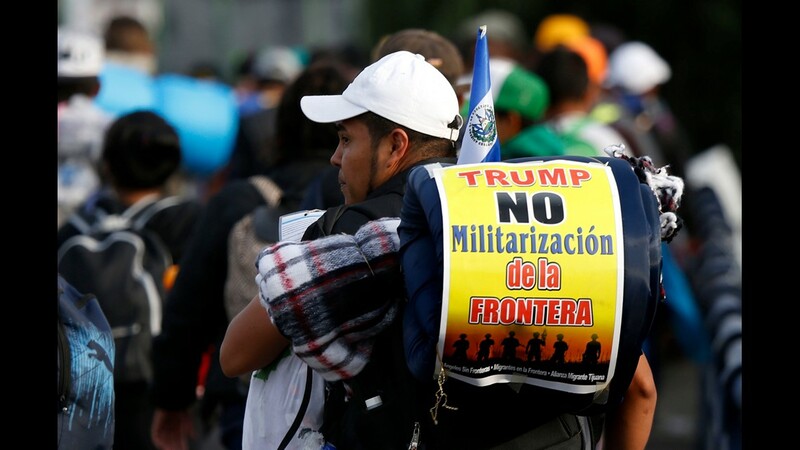 President Donald Trump kept up the pressure on Mexico on Wednesday to halt groups of migrants heading to the American border, as the US enters the final stretch of campaigning before key midterm elections. Trump ordered thousands of troops to the southern border and threatened to end automatic citizenship for US-born children of immigrants. 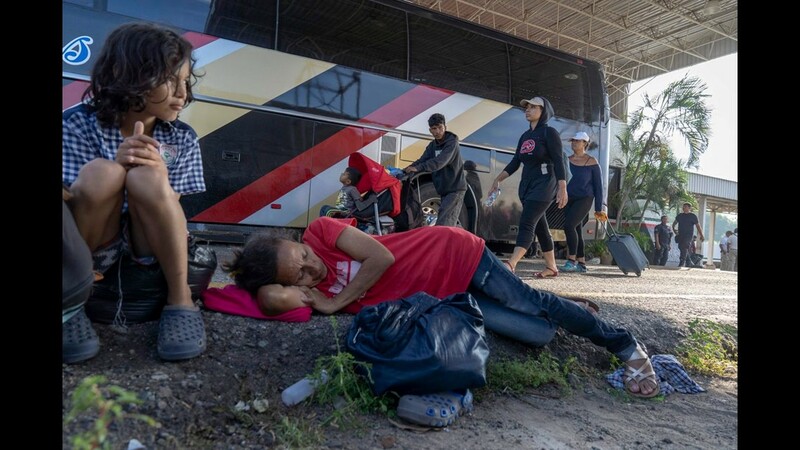 Migrants from El Salvador wait to be attended by Salvadoran migration authorities in La Hachadura, El Salvador, Wednesday, Oct. 31, 2018. A fourth group of about 700 Salvadorans set out from the capital, San Salvador, with plans to walk to the U.S. border, 1,500 miles away. Migrants from El Salvador start on their way to the United States, in San Salvador, El Salvador, Wednesday, Oct. 31, 2018. 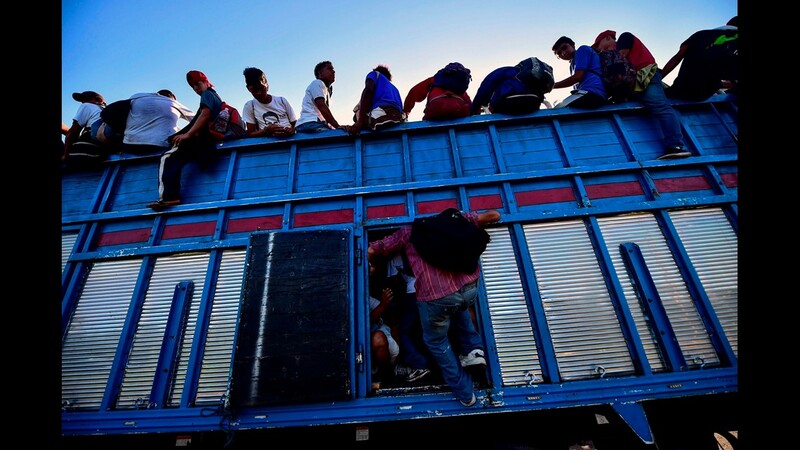 Migrants from El Salvador board a truck as they start on their way to the United States, from San Salvador, El Salvador, Wednesday, Oct. 31, 2018. 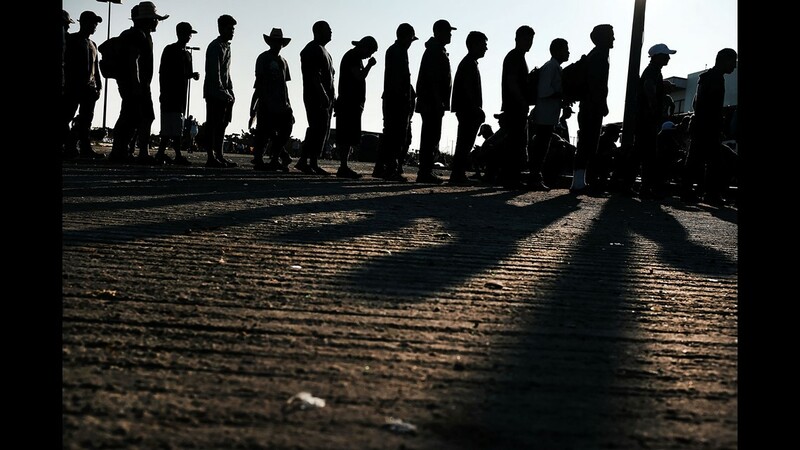 Members of the Central American caravan line up at dawn for food in a camp on Oct. 31, 2018 in Juchitan de Zaragoza, Mexico. 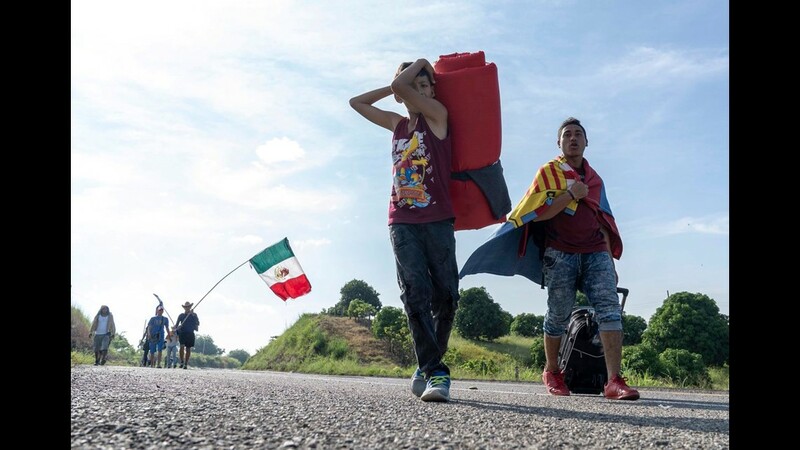 The group of migrants, many of them fleeing violence in their home countries, took a rest day on Wednesday and plan to resume their march towards the United States border on Thursday. As fatigue from the heat, distance and poor sanitary conditions has set in, the numbers of people participating in the march has slowly dwindled, but a significant group are still determined to get to the United Sates. It has been widely reported that the Pentagon will deploy 5,200 active-duty troops to the U.S.-Mexico border in an effort to prevent members of the migrant caravan from illegally entering the country. 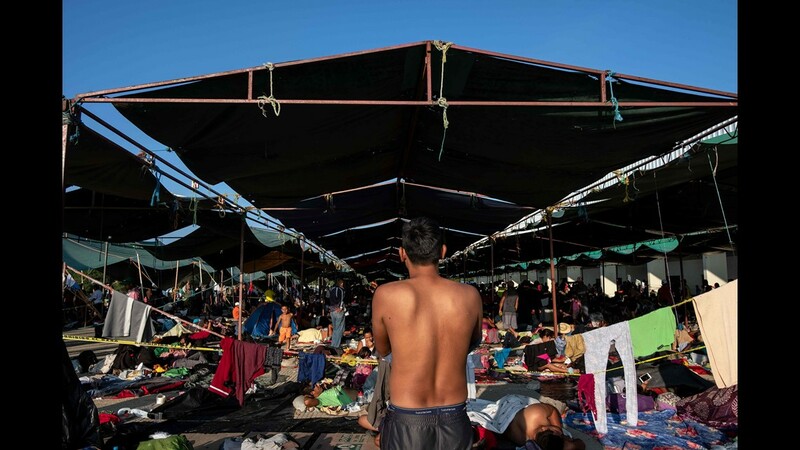 Members of the Central American caravan wake up at dawn in a camp on Oct. 31, 2018 in Juchitan de Zaragoza, Mexico. 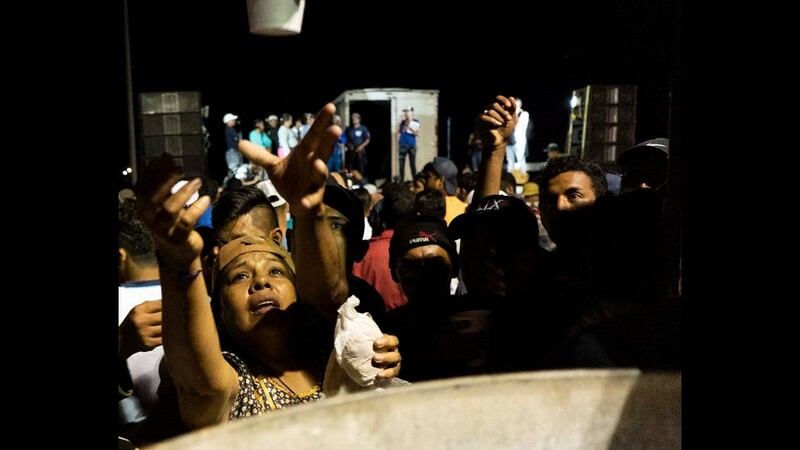 Thousands of Central American migrants traveling in a caravan that President Trump wants to stop at the US border began arriving in the city of Juchitan de Zaragoza before dawn on Tuesday, Oct. 30, 2018 in the state of Oaxaca in southern Mexico. 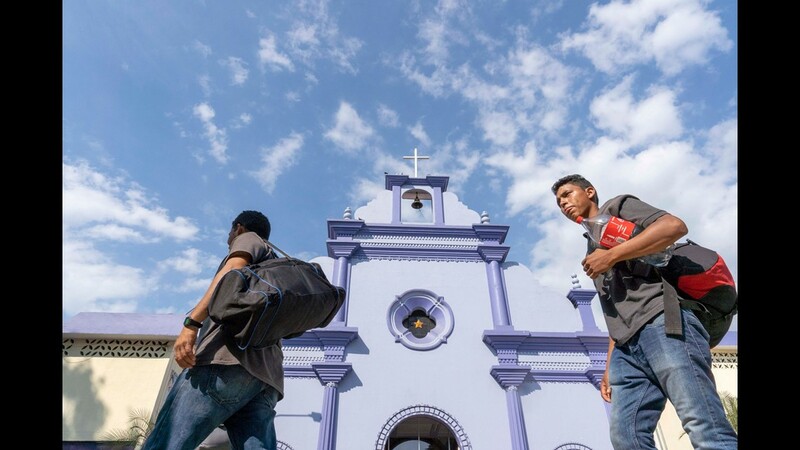 Central American migrants attempting to travel to the US border began arriving in the city of Juchitan de Zaragoza before dawn on Tuesday, Oct. 30, 2018 in the state of Oaxaca in southern Mexico. 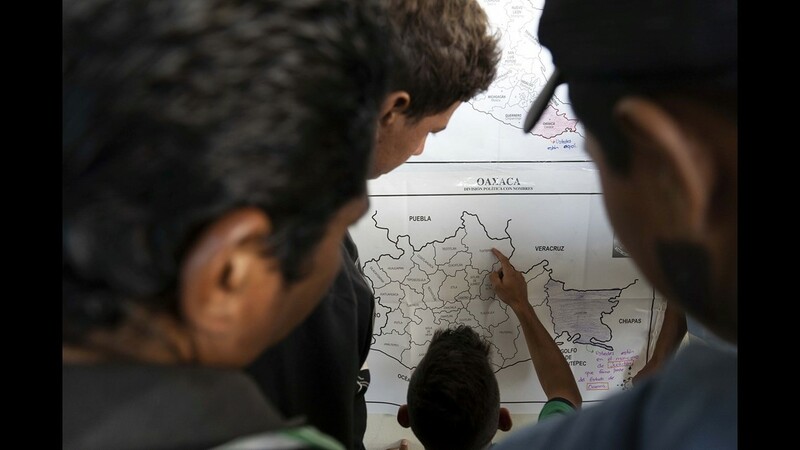 Central American migrants traveling in a caravan looks at Oaxaca map while they move north towards United States. 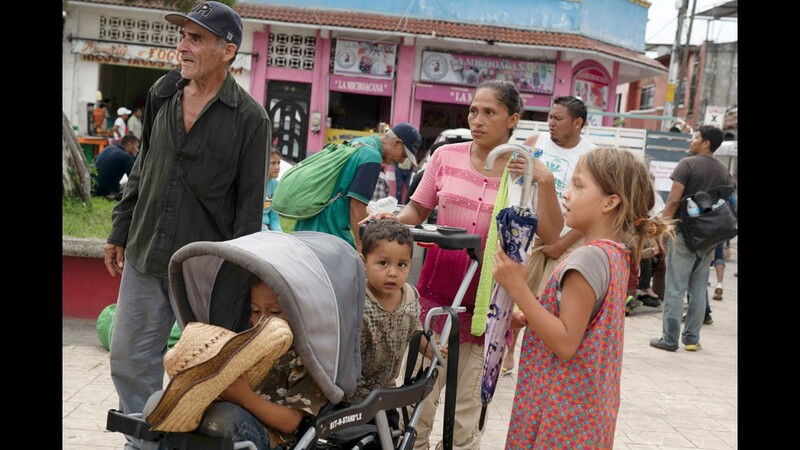 Migrants from Honduras and other Central American countries traveling in a caravan headed for the U.S. reached the town of Santiago Niltepec in the state of Oaxaca. The town is still recovering from a powerful 8.2 earthquake last year, but the resident even came out to offer food, water, and shelter in the town's central plaza. 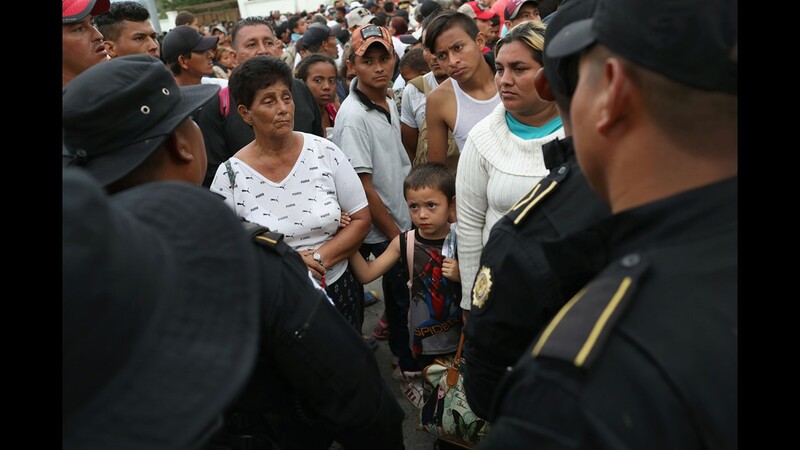 The caravan passed through a Mexican immigration checkpoint on the way, but immigration officials stood by and let them pass. 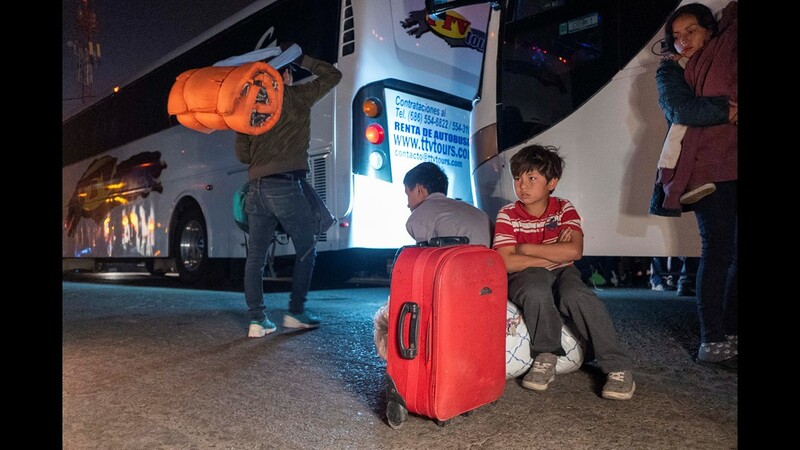 None of the migrants boarded buses that sat empty offering to take those who didn't want to go farther a chance to head back to their countries. 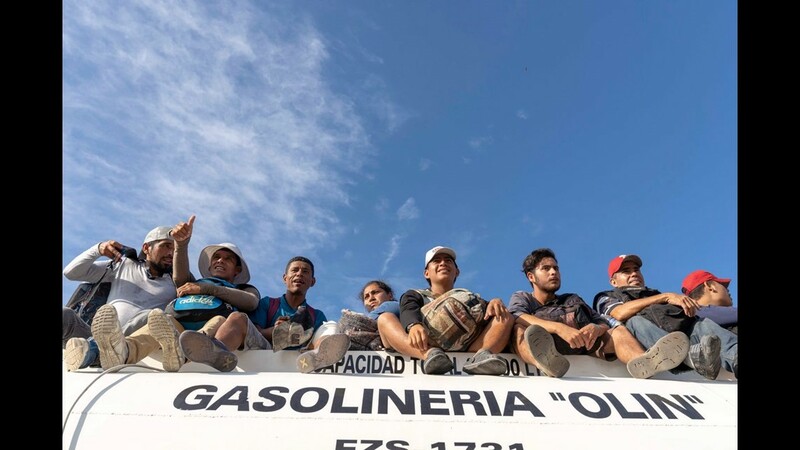 Instead, the migrants jumped on flat-bed trucks, gasoline tankers, pickups and any other vehicle that slowed down to give them rides, while immigration officials stood and watched. 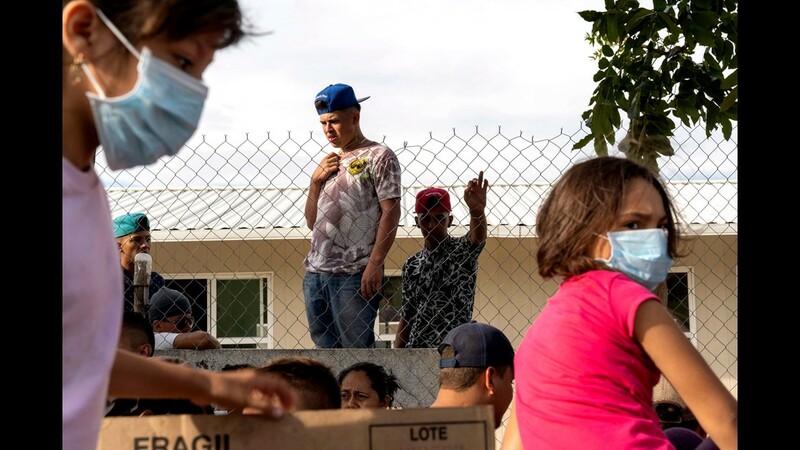 Migrants from Honduras and other Central American countries traveling in a caravan headed for the U.S. reached the town of Santiago Niltepec in the state of Oaxaca. 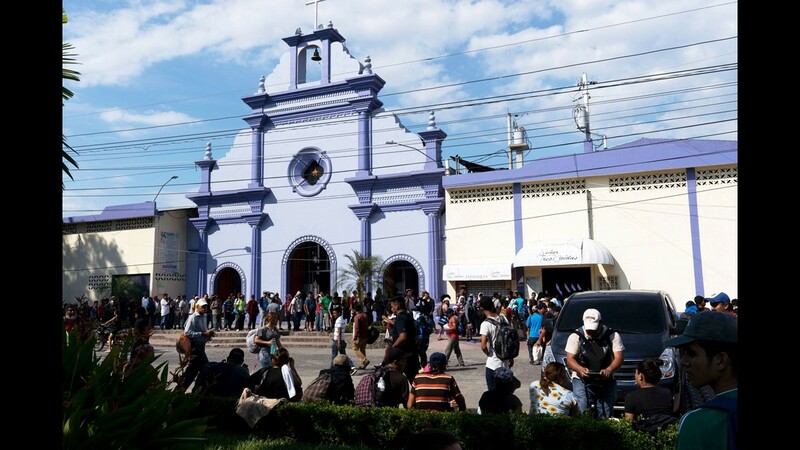 Migrants from Honduras and other Central American countries traveling in a caravan headed for the U.S. reached the town of Santiago Niltepec in the state of Oaxaca. 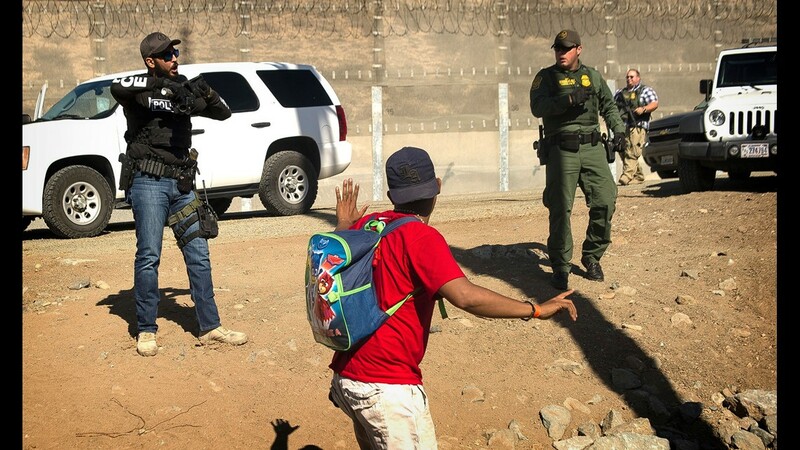 The caravan passed through a Mexican immigration checkpoint on the way, but immigration officials stood by and let them pass. 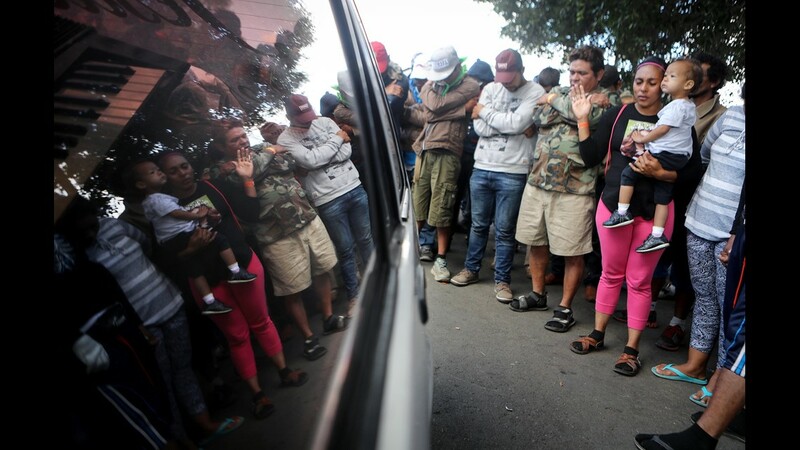 Migrants from Honduras and other Central American countries traveling in a caravan headed for the U.S. rest in the town of Santiago Niltepec in the state of Oaxaca. 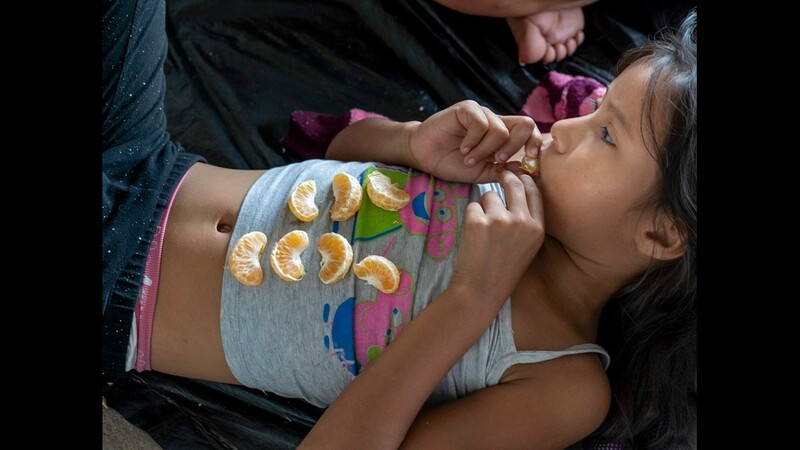 Alexandra Paisano Perez, 8, from Honduras eats orange given by humanitarian volunteers in Santiago Niltepec in the state of Oaxaca on Oct. 29, 2018. Most of the kids getting sick from heat exhaustion. Central American migrant Osiris Jackelin Lagos Funez, 38, plays Juego "doctorano" game with her son Lesnar Itai Bejarano Lagos, 5, in Santiago Niltepec in the state of Oaxaca on Oct. 29, 2018. Migrants are hitching rides on trucks, in pickups and cars at an immigration checkpoint as immigration officers watch in Tapanatepec, Oaxaca, Mexico, on Oct. 29, 218. 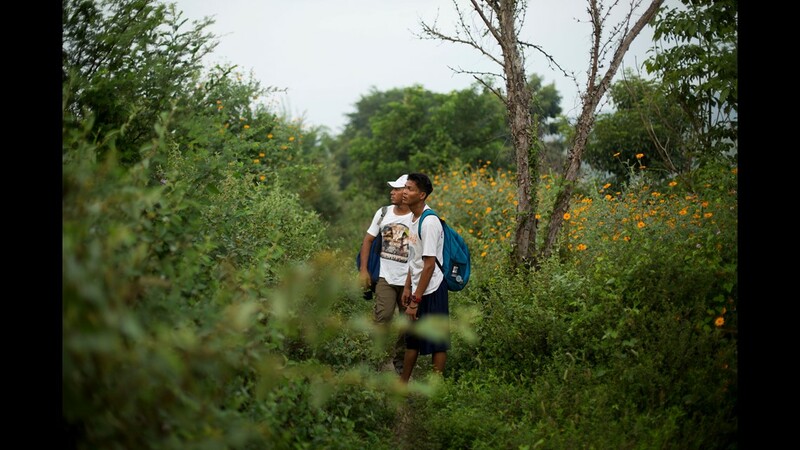 Migrants have more than 30 miles to go before reaching their destination in Santiago Niltepec in the state of Oaxaca. 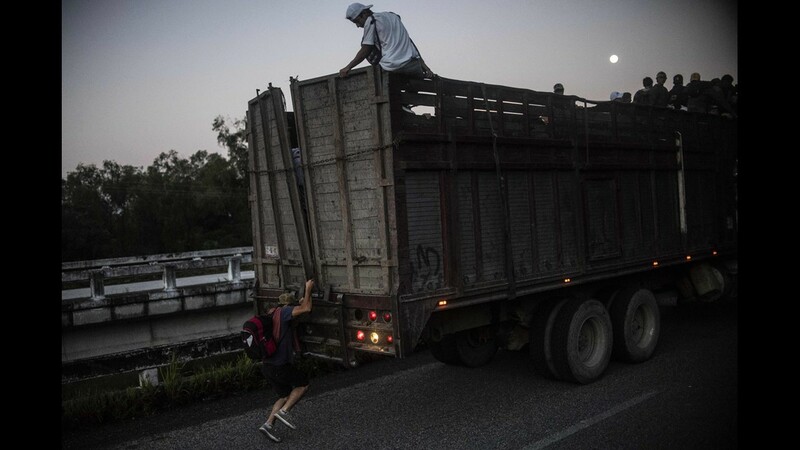 Migrants hitch rides on trucks in Tapanatepec, Oaxaca, Mexico, Monday. 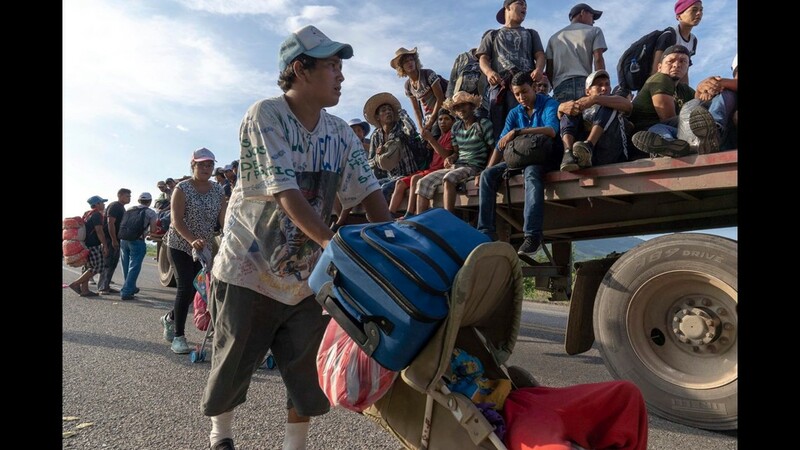 The caravan left at 3 am but still have more than 30 miles to go before reaching their destination in, Santiago Niltepec, in the state of Oaxaca. Migrants march from Tapanatepec, Oaxaca, Mexico, before reaching their destination in Santiago Niltepec in the state of Oaxaca. Coordinators from Pueblo Sin Fronteras say immigration authorities are trying to split up the caravan but so far have been unsuccessful. Migrants who break off from the caravan to travel on their own are being detained, coordinators said. 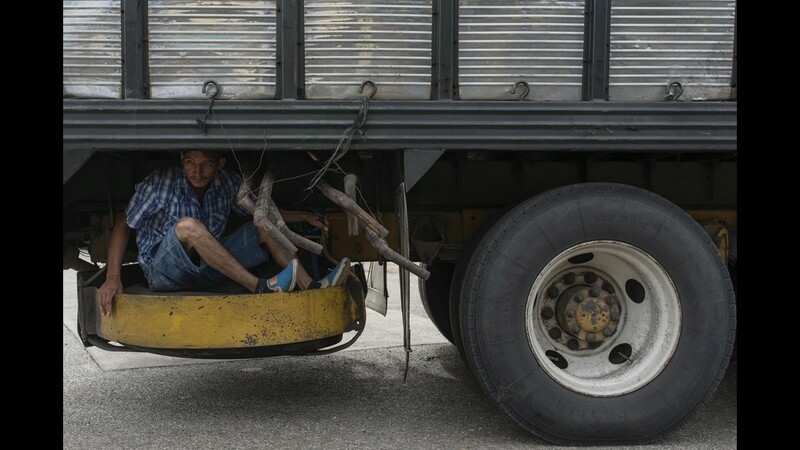 Hitching rides on trucks, migrants press on toward Santiago Niltepec in the state of Oaxaca. As long as the migrants pass through the checkpoint as a group no one stops them. 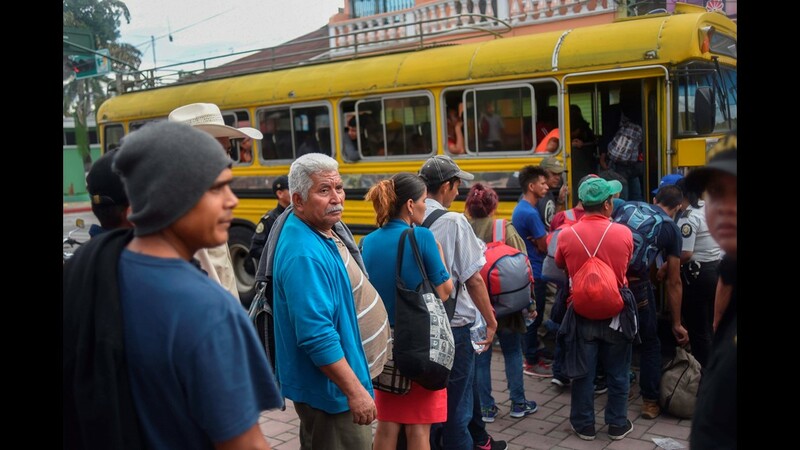 In Tapanatepec, Oaxaca, Mexico, Monday, immigration authorities parked buses at the checkpoint to deport migrants back to the border but no one got on. As long as the migrants pass through the checkpoint as a group no one stops them. The caravan of migrants pass through Tapanatepec, Oaxaca, Mexico on Monday. 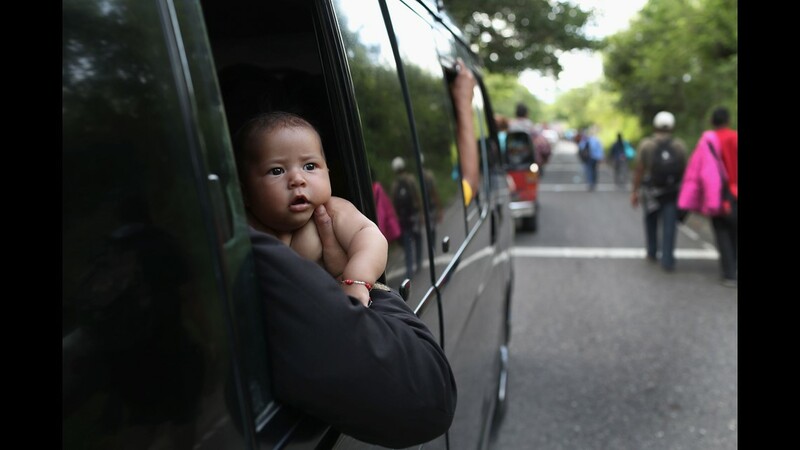 A small child gets a lift as the caravan procedes to Santiago Niltepec, Oaxaca, Monday. Caravan migrants hitch rides on trucks at an immigration checkpoint as immigration officers in Tapanatepec, Oaxaca, Mexico, Monday. 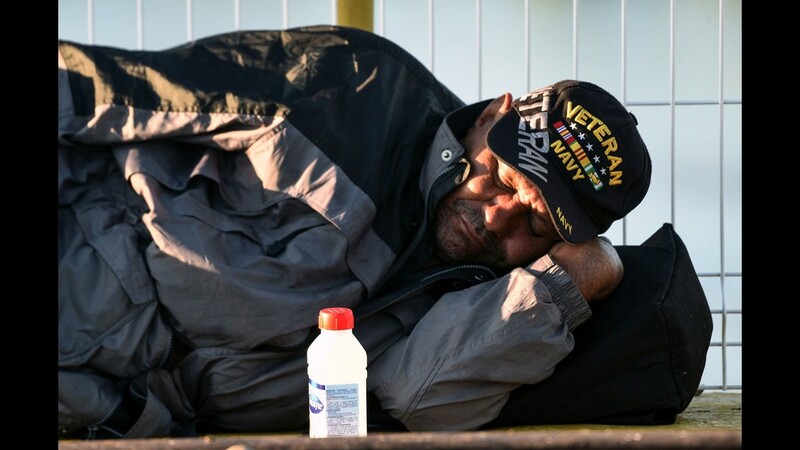 Some migrants have collapsed on the side of the road to rest or sleep. A woman lifts a baby carriage aboard a truck while she and others hitch a ride, Monday, in Tapanatepec, Oaxaca, Mexico. At least one migrant has died falling off a moving vehicle onto the pavement. 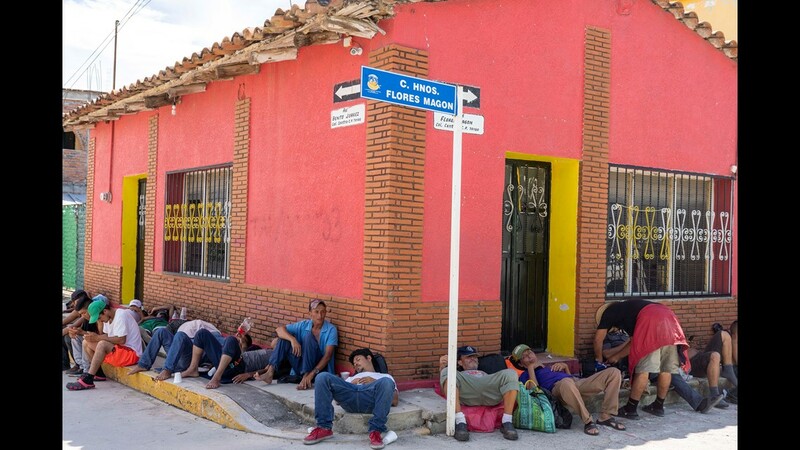 The migrants from Honduras and other Central American countries took a day off to rest on Oct. 28, 2018 in Tapanatepec, Mexico. 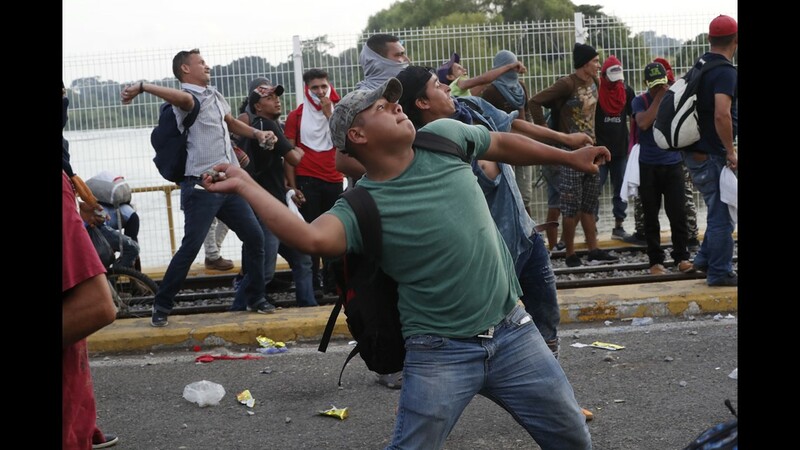 Coordinators decided to rest after a migrant from Guatemala was attacked by migrants from El Salvador, who mistook the man for a kidnapper, a sign of rising tensions as the caravan inches forward. Maria Estrada shaves her husband Alex's moustache while they bathe in a river with other migrants while taking a day off to rest on Oct. 28, 2018 in Tapanatepec, Mexico. 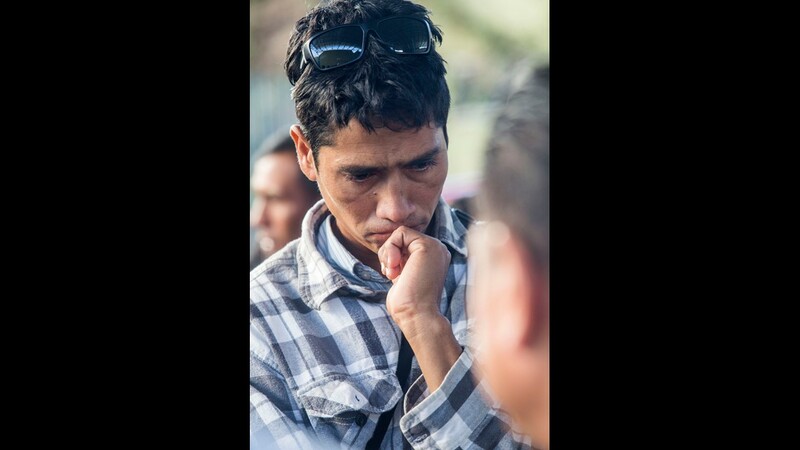 Edwin Enamorado, 35, from Honduras with a family of 6, took a day off to rest on Oct. 28, 2018 in Tapanatepec, Mexico. 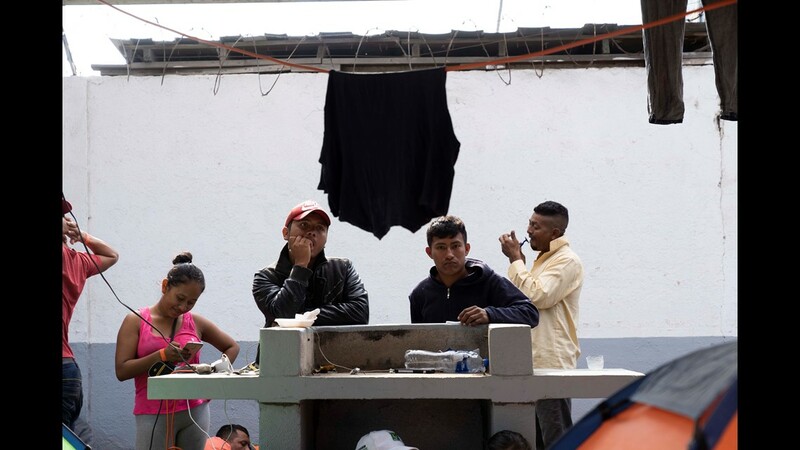 The migrants from Honduras and other Central American countries took a day off to rest on Oct. 28, 2018 in Tapanatepec, Mexico. Gina Garibo, one of the organizers of the migrant caravan works on details for tomorrow's journey on Oct. 28, 2018, in Tapanatepec, Mexico. Guatemalan security forces try to prevent Honduran migrants from reaching the Guatemala-Mexico international border bridge in Ciudad Tecun Uman, Guatemala, on Oct. 28, 2018. 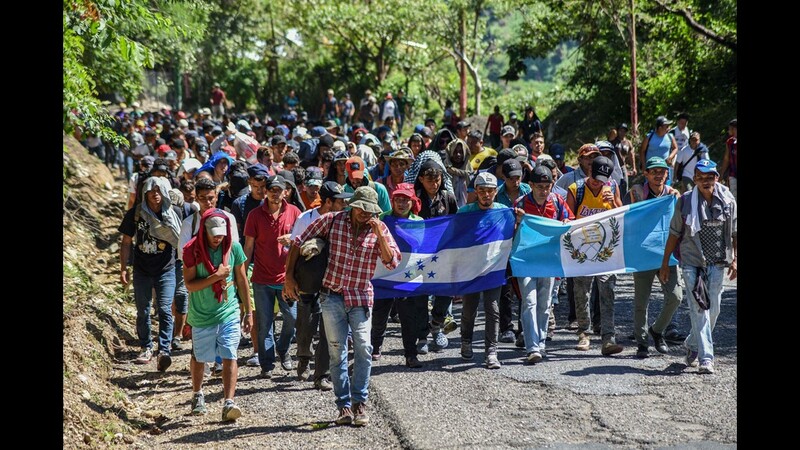 A new group of Honduran migrants is trying to reach and cross the Guatemalan border into Mexico in the hope of eventually reaching the United States. 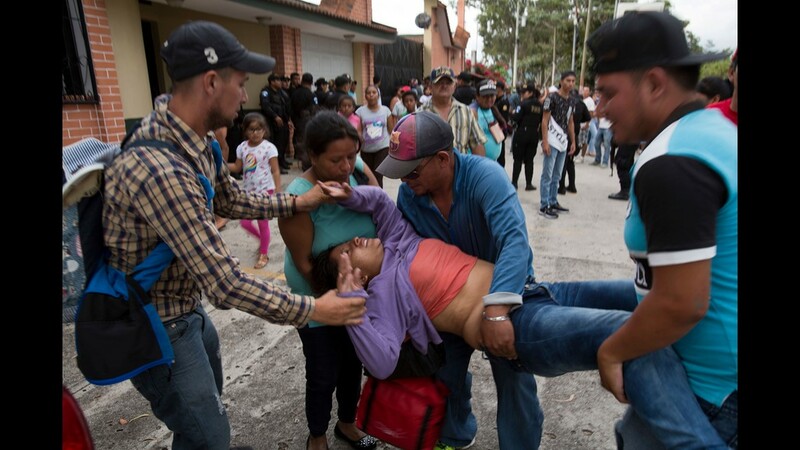 Migrants of the second caravan clash with the Guatemalan Police, in Tecun Uman, Guatemala on Oct. 28, 2018. 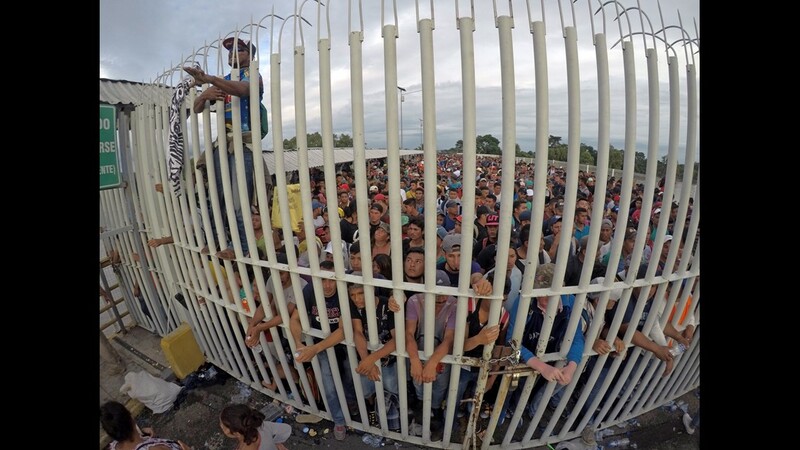 Thousands of migrants broke the border fence between Guatemala and Mexico and crossed into the Mexican territory. 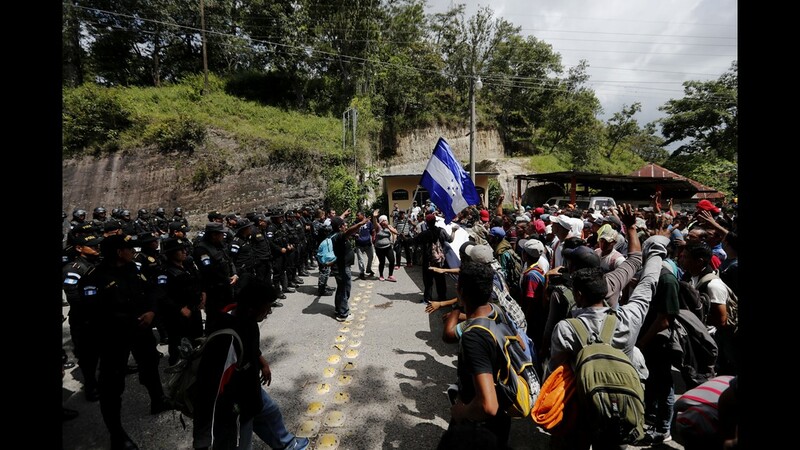 Central American migrants of the second caravan confront the police, in Tecun Uman, Guatemala on Oct. 28, 2018. 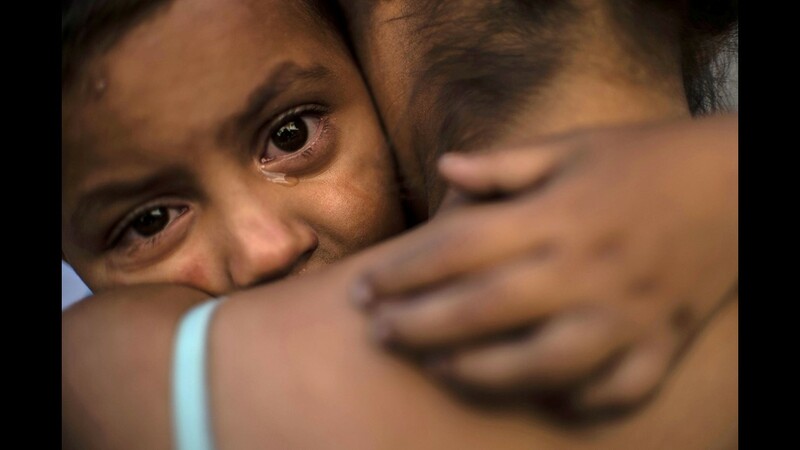 Delsy Alondra, 2, cries while waiting with her mother to receive donated food in Tapanatepec, Mexico on Oct. 28, 2018. 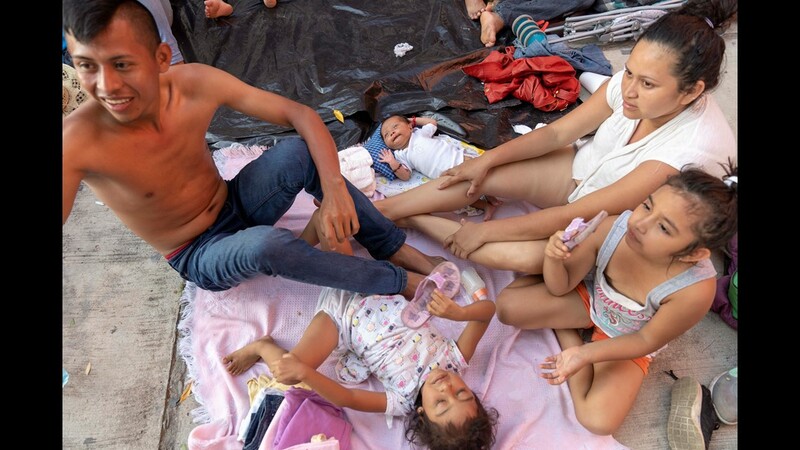 As of Oct. 27, Ernesto Martinez, 27, and his wife Yesenia, 23, have been traveling with their three daughters, including a baby who was just 17-days-old when they joined the caravan. 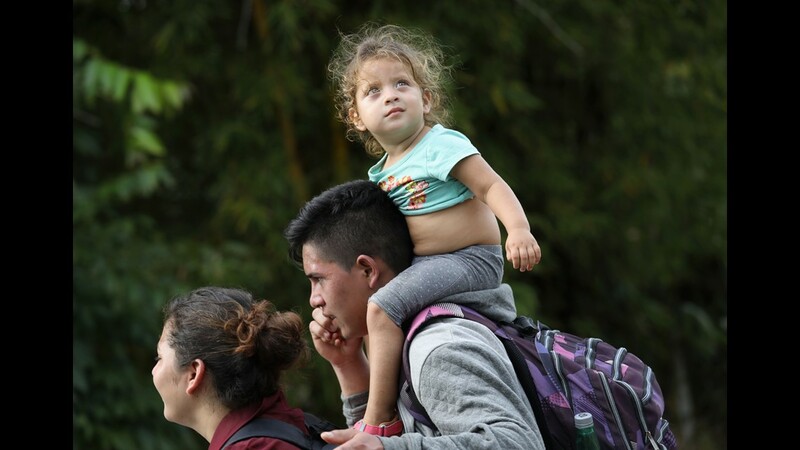 Ernesto Martinez, 27, and his wife Yesenia, 23, are traveling with their three daughters, including a baby who was just 17-days-old when they joined the caravan on Oct. 20. The family is from San Martin, Retalhuleu, Guatemala. 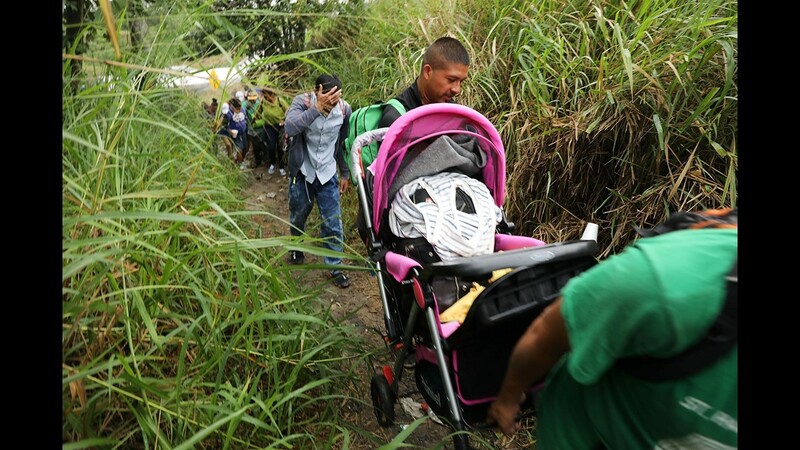 They have pushed the baby in a stroller more than 180 miles crossing through the state of Chiapas, before reaching the state of Oaxaca on Oct. 27, 2018. 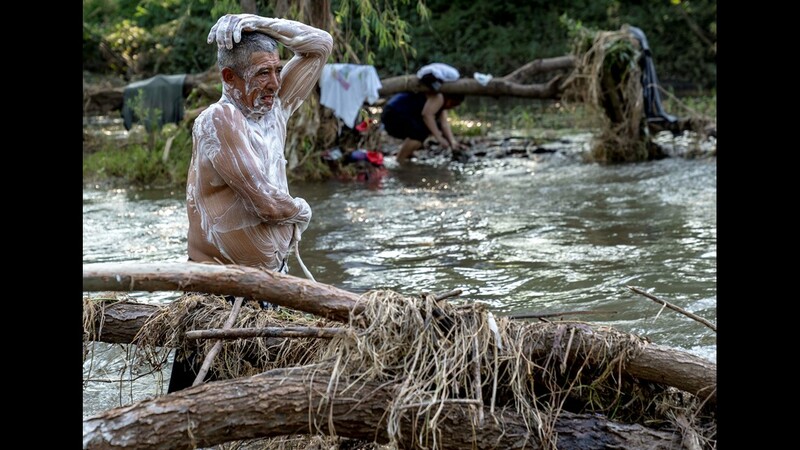 Bathing in the river offers a little relief from a day of walking in the oppressive heat for some of the thousands of migrants in the caravan on Oct. 27, 2018. 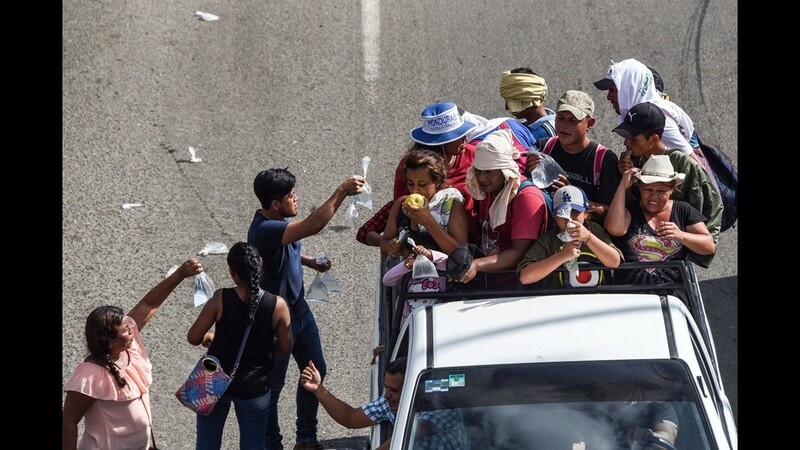 Thousands of migrants from Honduras and other Central American countries traveling in a caravan reached the state of Oaxaca on Oct. 27, 2018, after crossing through the entire state of Chiapas on their way to the U.S. border. Members of a US-bound migrant caravan cross a bridge between the Mexican states of Chiapas and Oaxaca after federal police briefly blocked them outside the town of Arriaga on Oct. 27, 2018. 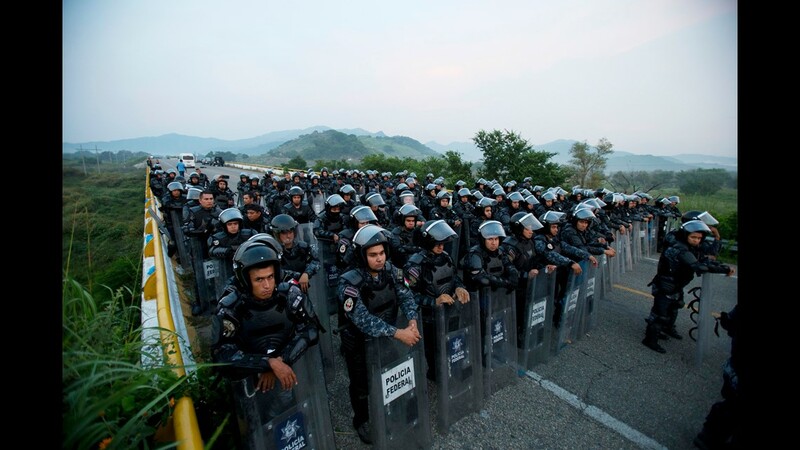 A wall of police in riot gear blocks the highway to stop a caravan of thousands of Central American migrants from advancing, outside Arriaga, Chiapas state, Mexico on Oct. 27, 2018. Eventually police let them pass, with the agreement that the dialogue with authorities would continue at their next stop. 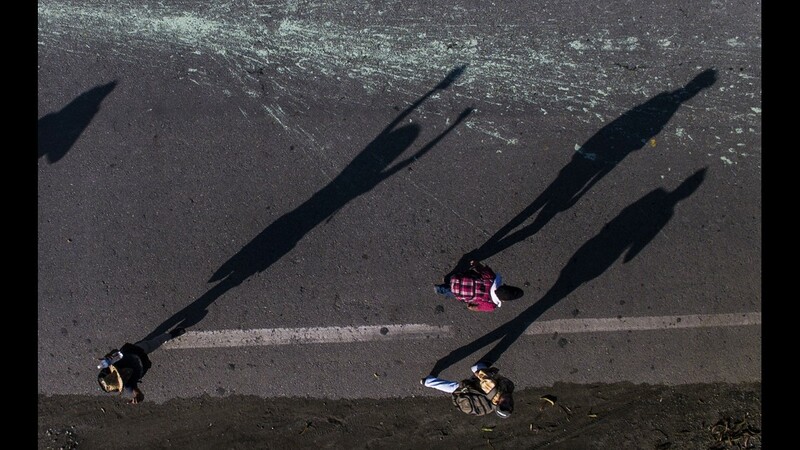 Members of a U.S.-bound migrant caravan stand on a road after federal police briefly blocked their way outside the town of Arriaga on Oct. 27, 2018. 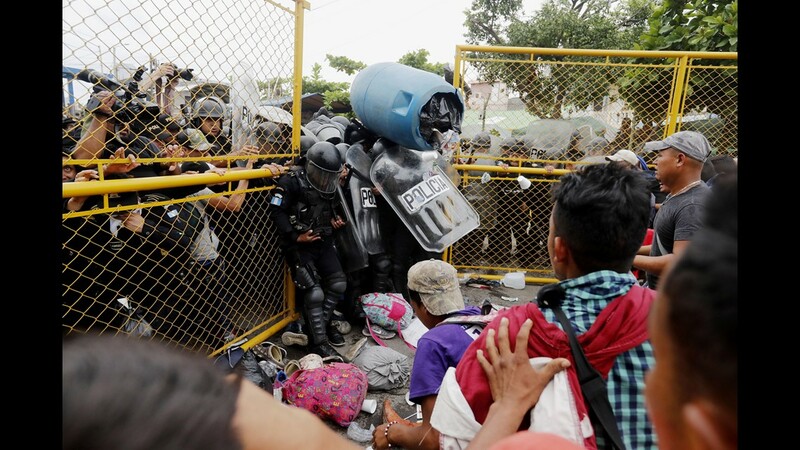 Hundreds of Mexican federal officers carrying plastic shields blocked the caravan from advancing toward the U.S. after several thousand of the migrants turned down the chance to apply for refugee status and obtain a Mexican offer of benefits. 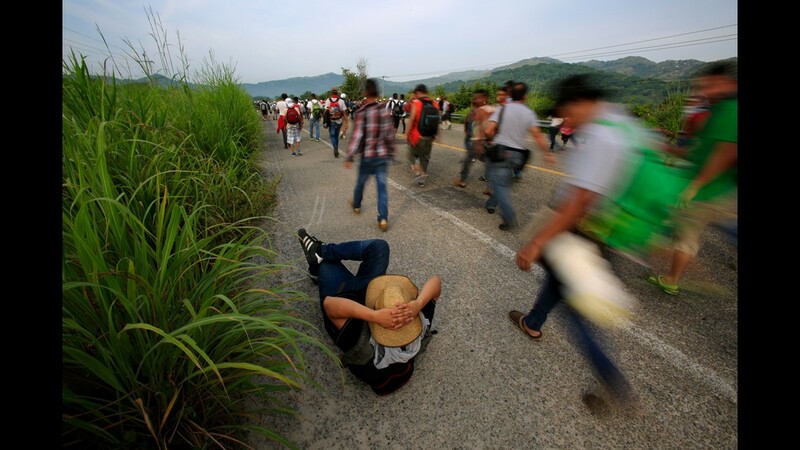 A man stops to rest as a caravan of thousands of Central American migrants walk along the highway outside Arriaga, Mexico on Oct. 27, 2018. Central American migrants wait on a path away from the the roadside after Mexican police in riot gear briefly blocked the highway to keep them from advancing, outside Arriaga, Chiapas state, Mexico on Oct. 27, 2018. 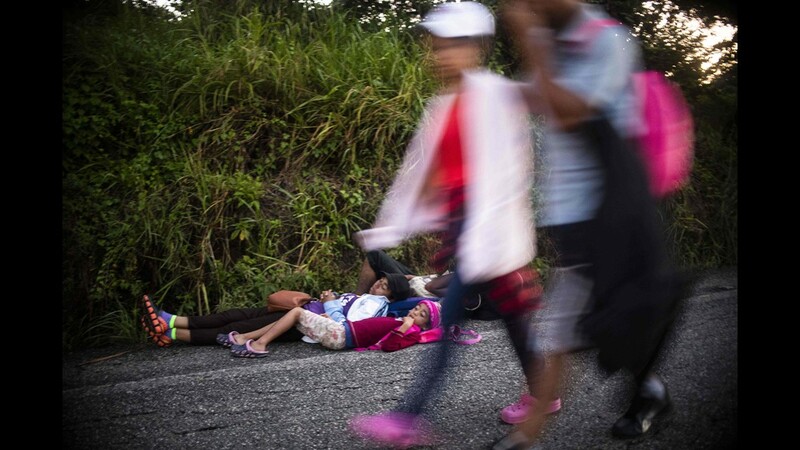 Honduran migrants taking part in a caravan heading to the U.S. wait on the road as they leave Arriaga on their way to San Pedro Tapanatepec, southern Mexico on Oct. 27, 2018. 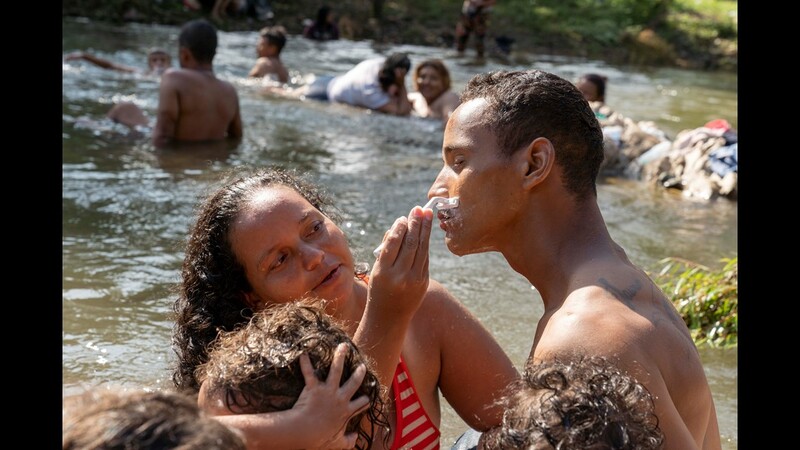 Members of the Central American caravan bathe in the municipality of Arriaga, state of Chiapas, Mexico, on Oct. 26, 2018. 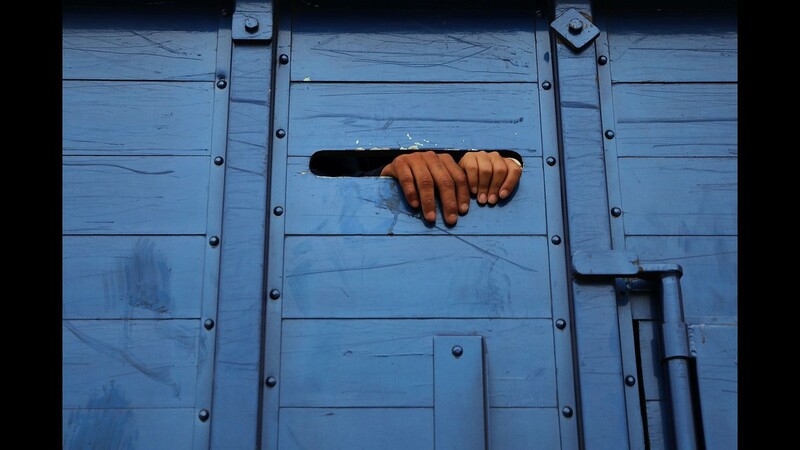 Mexican Federal Police officers allow the Honduran migrants to pass as they leave Arriaga on their way to San Pedro Tapanatepec, southern Mexico on Oct. 27, 2018. 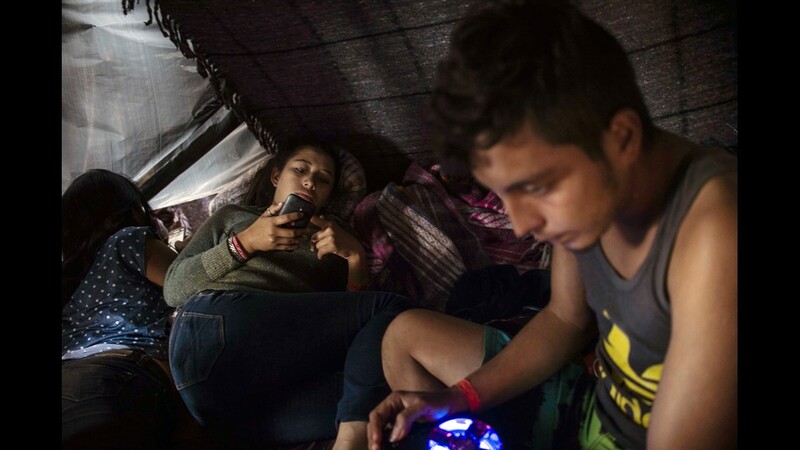 Angelica Esmeralda Sanchez,18, left, and her friend Ericka Martinez 28, both from El Salvador are with a new wave of several hundred migrants gathered near a park in Tecum Uman, Guatemala on Oct. 25, 2018. 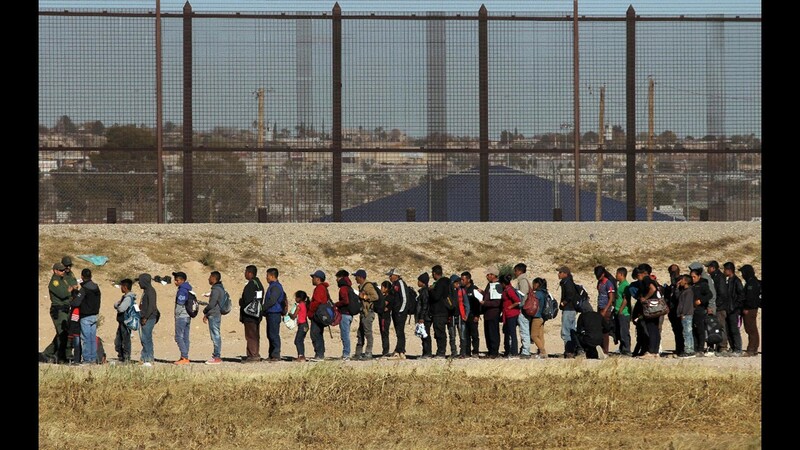 They are waiting to cross into Mexico and to head north to the United States. 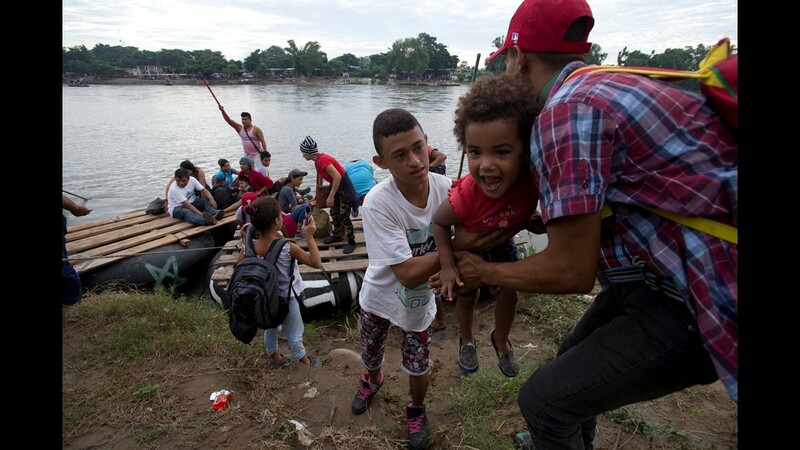 Migrants from Honduras and El Salvador cross from Guatemala to Mexico on a raft on Oct. 25, 2018. 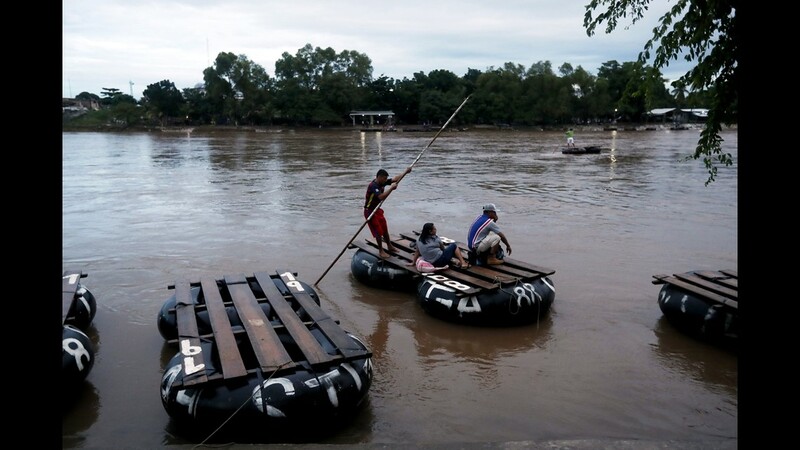 Border crossers from Guatemala, use a raft at cross the border into Mexico at Cuidad Hidalgo on Oct. 25, 2018. 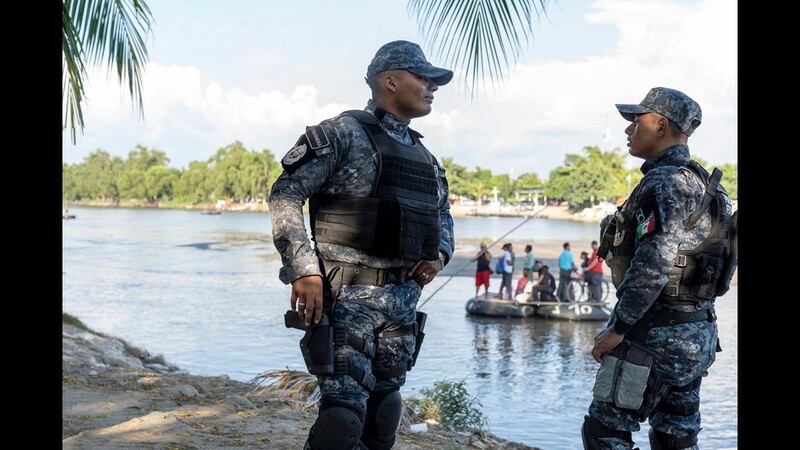 Mexican Federal Police and Immigration officers wait to check identification of the border crossers from Guatemala, who were crossing in a raft at Cuidad Hidalgo, Mexico on Oct. 25, 2018. 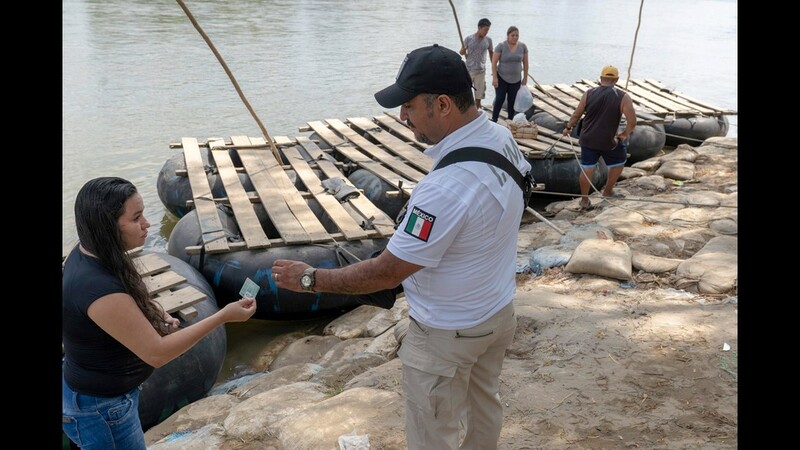 Mexican Federal Police and Immigration officers check identification of the border crossers from Guatemala, who were crossing in a raft at Cuidad Hidalgo, Mexico on Oct. 25, 2018. 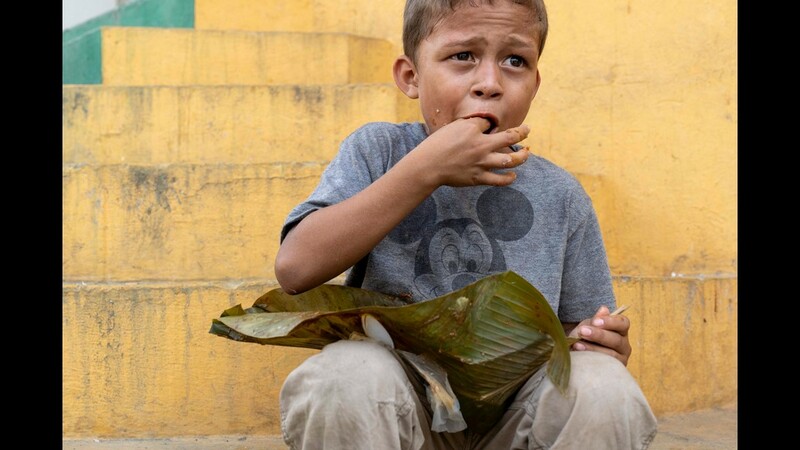 Gerson de Jesus Zelaya, 6, from Honduras, eats a donated lunch near a park in Tecum Uman, Guatemala as he waits to cross from Guatemala to Mexico and to head north to the United States on Oct 25, 2018. Several hundred migrants from Honduras and El Salvador gather near a park in Tecum Uman, Guatemala as they wait to cross into Mexico on Oct 25, 2018. 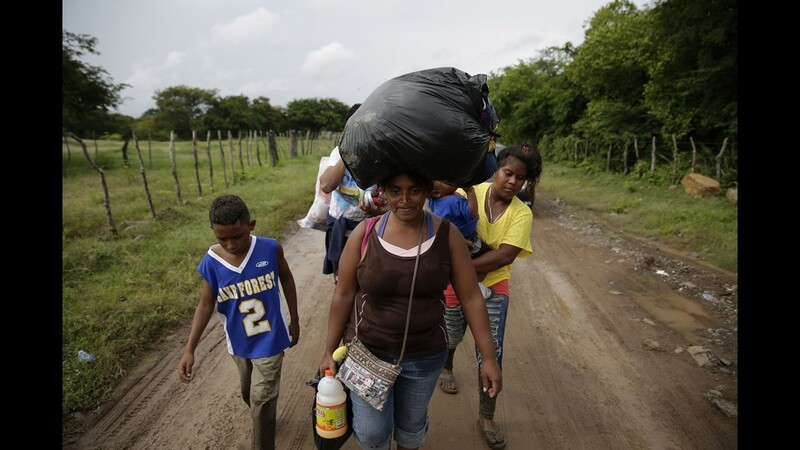 Central American migrants heading in a caravan to the U.S., walk near Mapastepec, southern Mexico, Oct. 25, 2018. 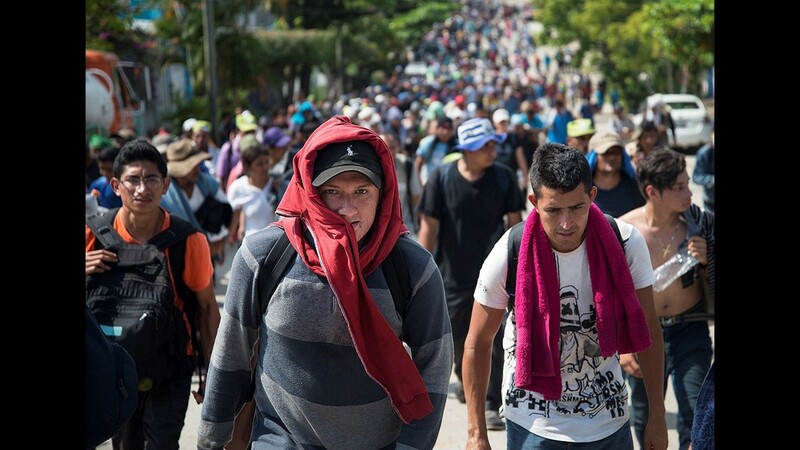 Thousands of Central American migrants crossing Mexico toward the United States in a caravan have resumed their long trek, walking about 12 hours to their next destination. 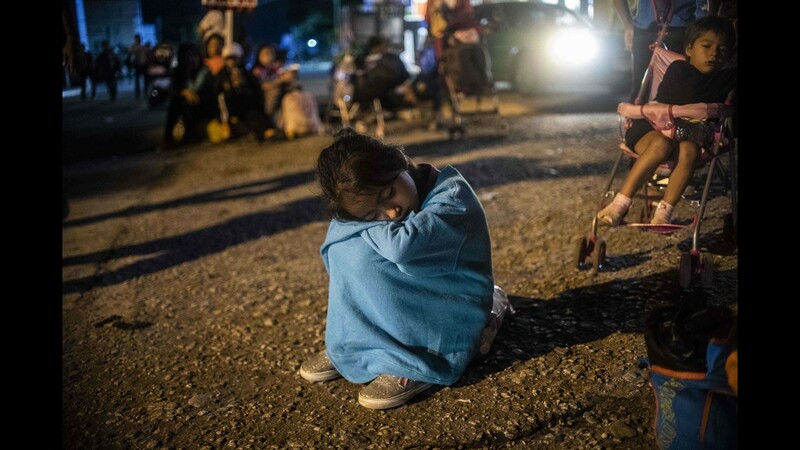 A girl rests while taking part in a U.S.-bound caravan traveling from Mapastepec to Pijijiapan Chiapas state, Mexico, Oct. 25, 2018. 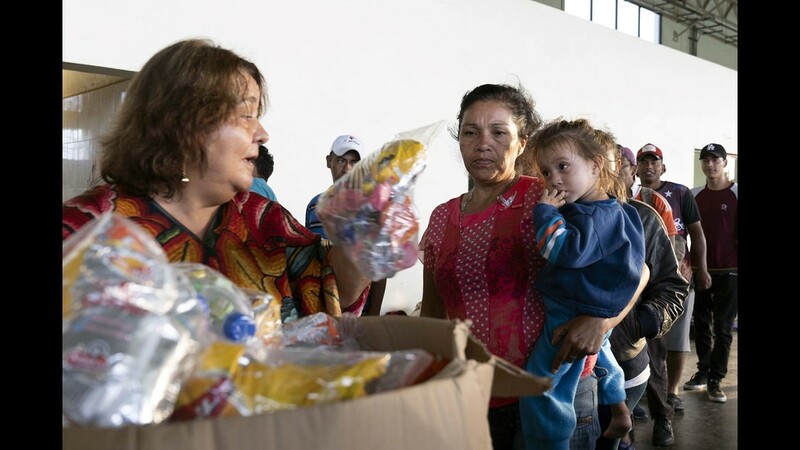 Central American migrants traveling with a caravan to the U.S. receive donated food outside the Catholic Church in Mapastepec, Mexico, Oct. 24, 2018. Central American migrants climb into a truck during a caravan to the U.S., near Mapastepec, Chiapas state, Mexico, Oct. 25, 2018. 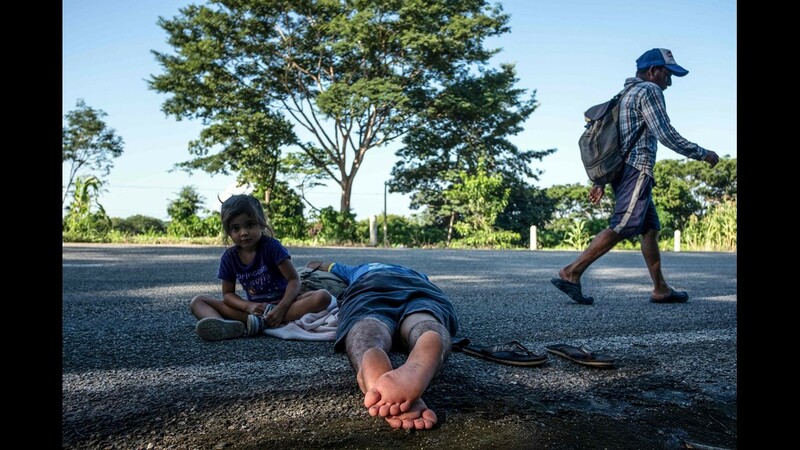 Central American migrants rest on the roadside near Mapastepec, southern Mexico, Oct. 25, 2018. 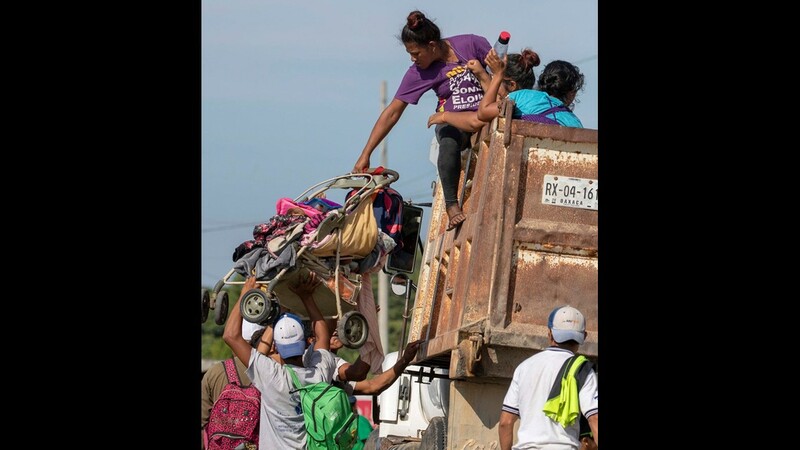 Central American migrants take part in a caravan toward the U.S., traveling on foot or atop vehicles in Mapastepec on their way to Pijijiapan Chiapas state, Mexico, Oct. 25, 2018. A Central American migrant walks along the road near Mapastepec, southern Mexico, Oct. 25, 2018. 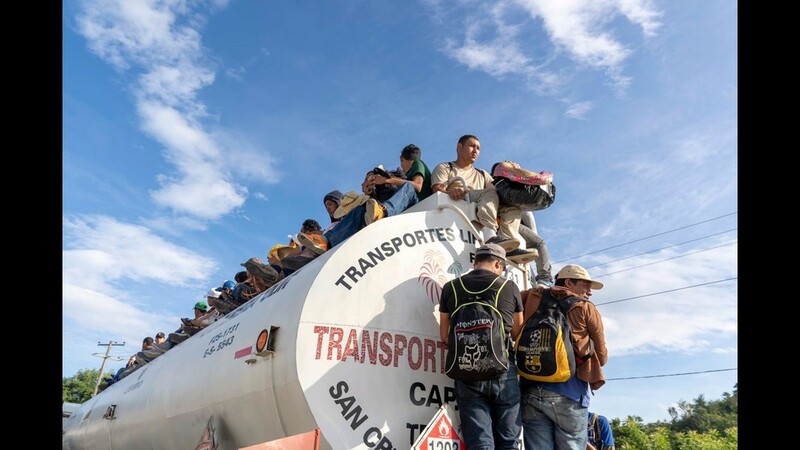 Central American migrants walk and traveling aboard a truck near Mapastepec, southern Mexico, Oct. 25, 2018. 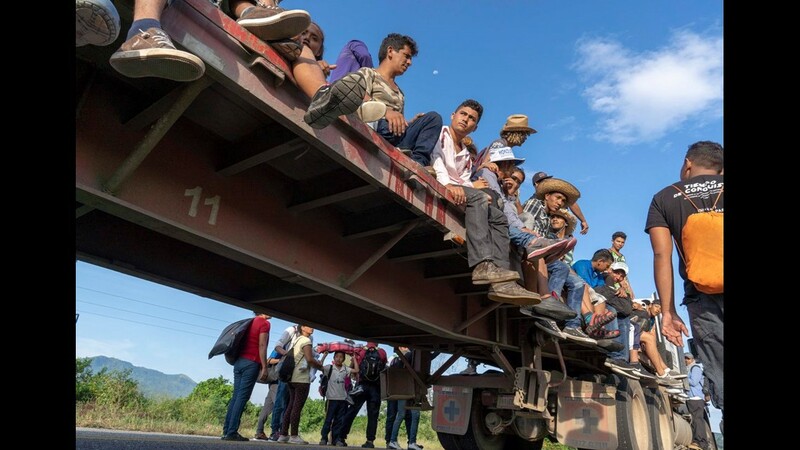 Central American migrants travel from Mapastepec to Pijijiapan Chiapas state, Mexico, Oct. 25, 2018. 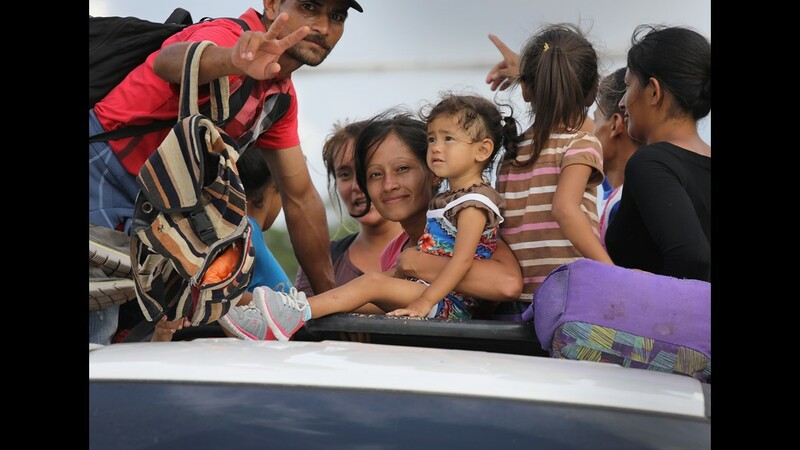 Central American travel standing on the back of a truck in Mapastepec on their way to Pijijiapan Chiapas state, Mexico, Oct. 25, 2018. 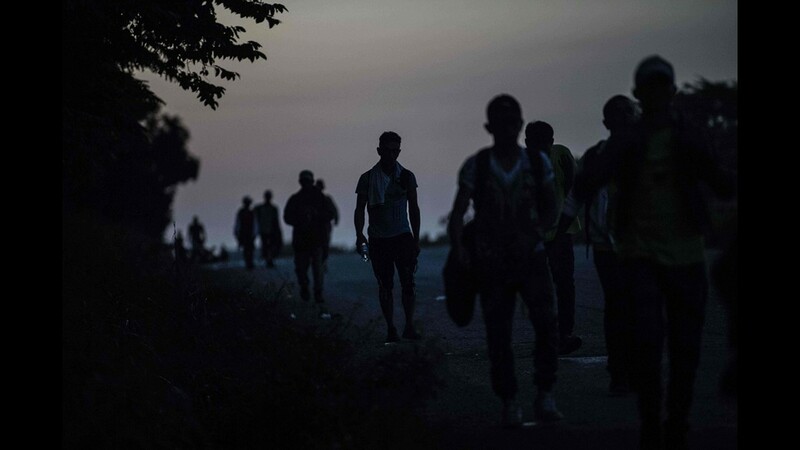 Central American migrants walk near Mapastepec, southern Mexico, Oct. 25, 2018. 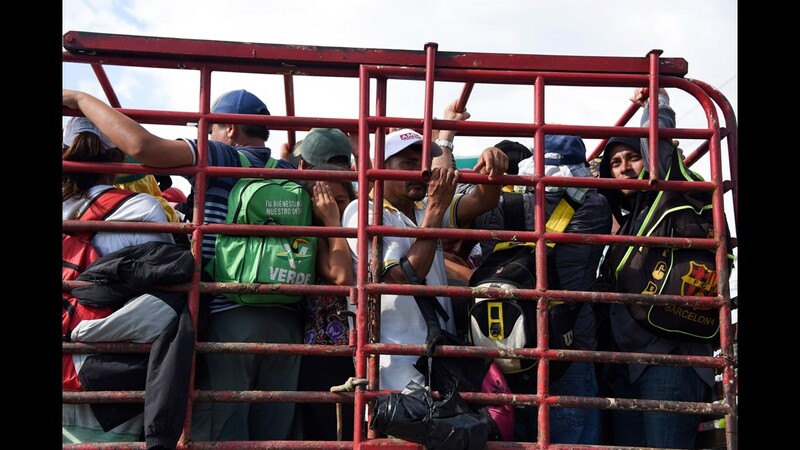 Central American migrants traveling with a caravan to the U.S. crowd onto a tractor as they make their way to Mapastepec, Mexico, Wednesday, Oct. 24, 2018. 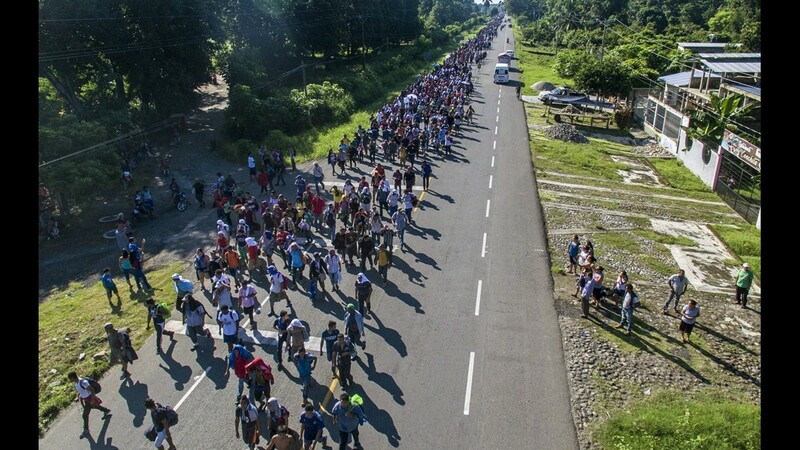 Thousands of Central American migrants renewed their hoped-for march to the United States on Wednesday, setting out before dawn with plans to travel another 45 miles of the more than 1,000 miles that still lie before them. Central American migrants taking part in a caravan heading to the U.S., walk in Huixtla, Chiapas state, Mexico, on Oct. 24, 2018. 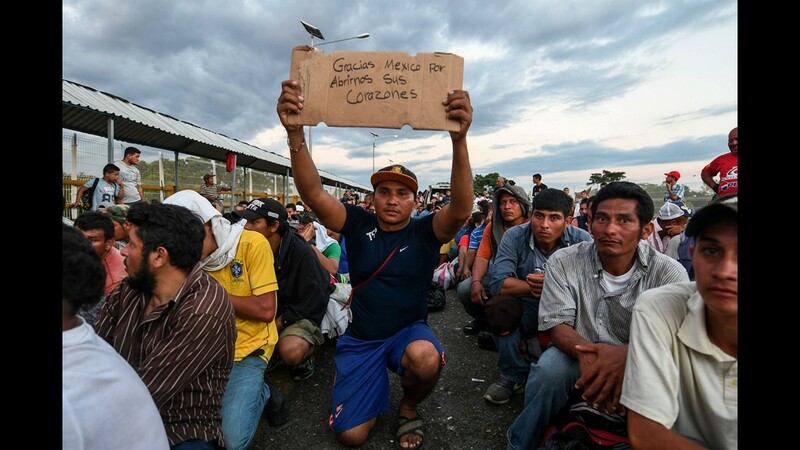 A Central American migrant taking part in a caravan heading to the U.S., holds up a sign reading "Thank you Mexico for opening your hearts to us," while he waits to cross the border from Ciudad Tecun Uman in Guatemala, to Ciudad Hidalgo, Mexico, Oct. 22, 2018. 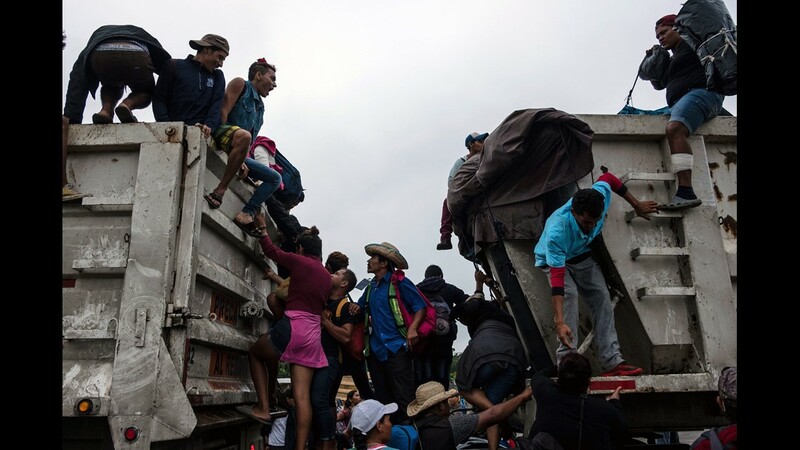 Central American migrants walking and aboard trucks head in a caravan to the U.S., in Huixtla, on their way to Mapastepec Chiapas state, Mexico, Oct. 24, 2018. 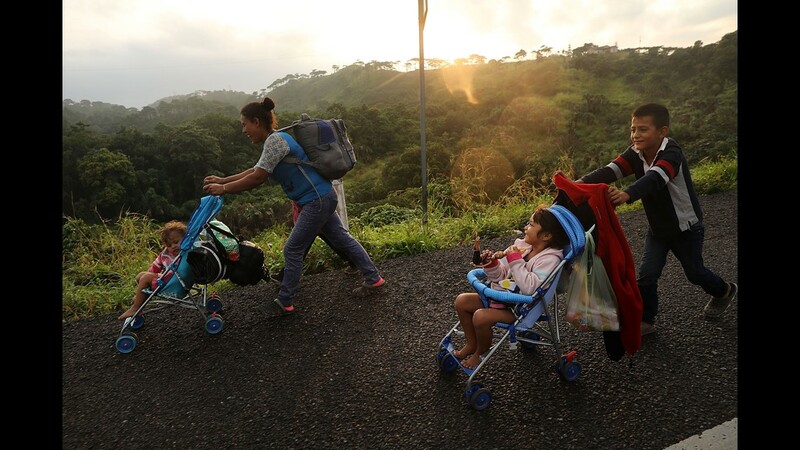 Central American migrant Cristian pushes a carriage occupied by his daughters; Karen, 5, left, and Beiyi, 4, as they make their way to Mapastepec, Mexico, Wednesday, Oct. 24, 2018, in a caravan headed to the U.S.
Central American migrants heading in a caravan to the U.S., walk in Escuintla on their way to Mapastepec Chiapas state, Mexico, Oct. 24, 2018. 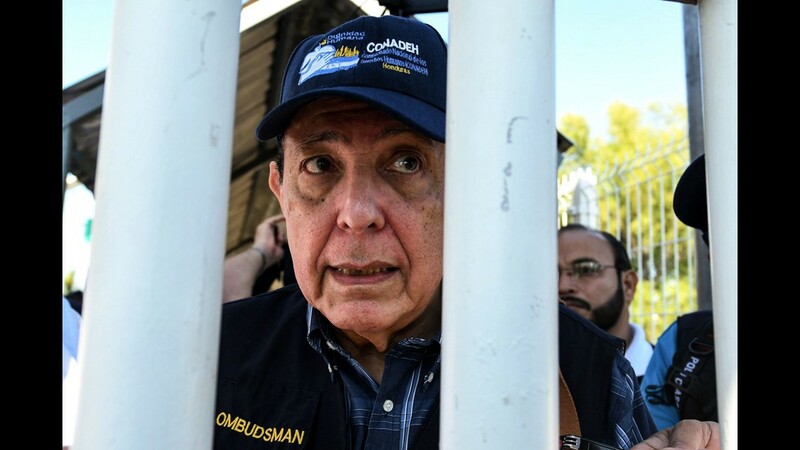 Honduras' Human Rights National Commissioner Roberto Herrera is pictured after being briefed on the situation regarding the recent passage of a massive caravan of Honduran migrants, at the Guatemala-Mexico border bridge, in Ciudad Tecun Uman, Guatemala, on Oct. 23, 2018. 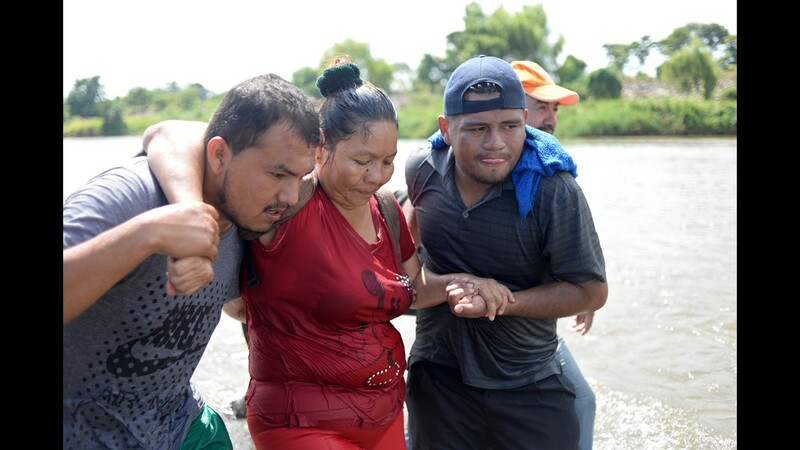 Late Monday, Mexico allowed another group of about 400 migrants to enter the country after they spent days packed onto a bridge over the Suchiate River, which forms Mexico's southern border with Guatemala. 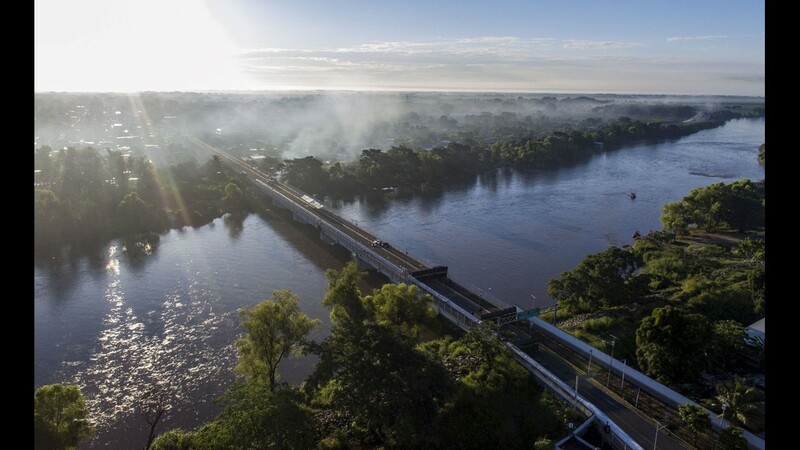 Aerial view of the Guatemala-Mexico international bridge in Ciudad Hidalgo, Chiapas state, Mexico, on Tuesday. The bridge remains empty a day after a caravan of Honduran migrants heading to the U.S. crossed it. 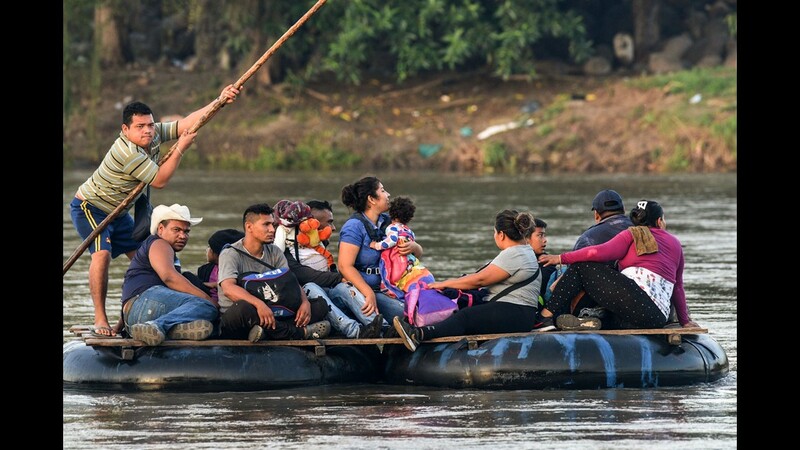 The United Nations said more than 7,000 people were now heading toward the U.S., as more migrants joined the original group, including some Central Americans who were already in Mexico. 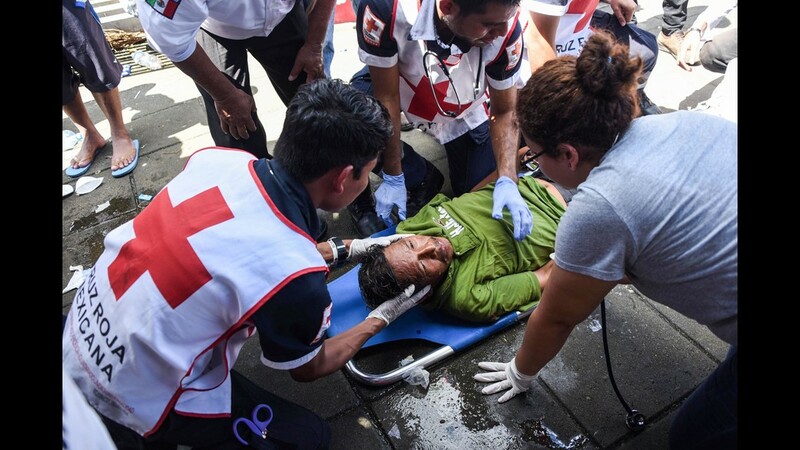 A Honduran migrant is assisted after having a convulsion during a stop in Huixtla, Chiapas state, Mexico, on Tuesday. 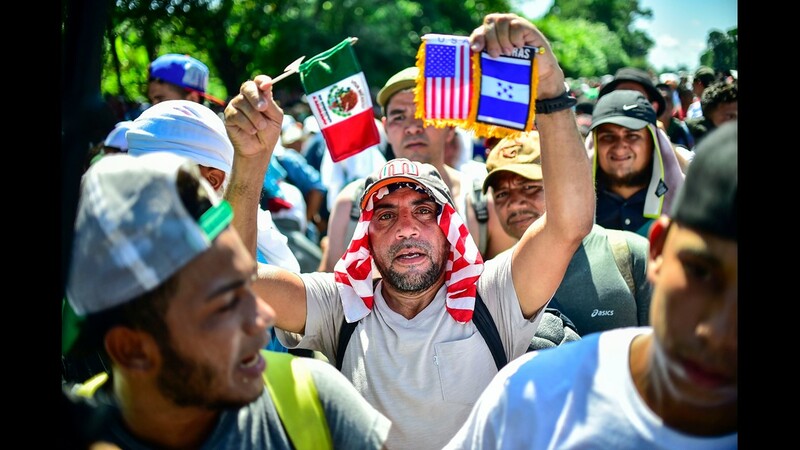 Thousands of mainly Honduran migrants heading to the United States -- a caravan President Donald Trump has called an "assault on our country" -- stopped to rest Tuesday after walking for two days into Mexican territory. 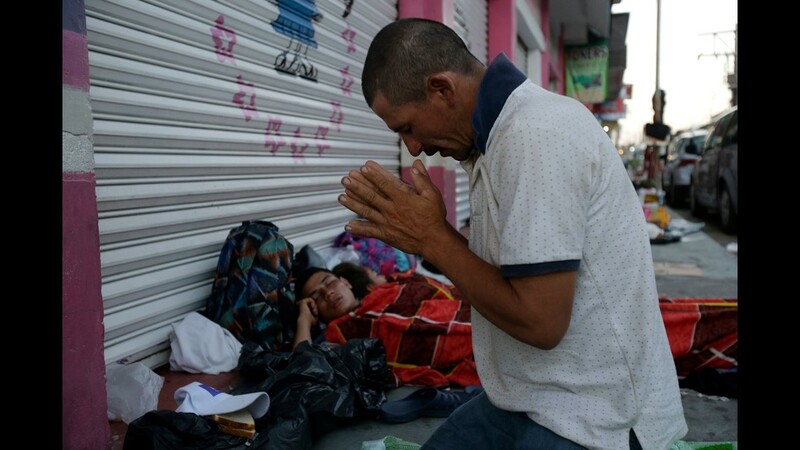 Marvin Sanabria, a Central American migrant traveling with a caravan to the U.S., kneels in prayer after waking up, in Huixtla, Mexico, Tuesday. 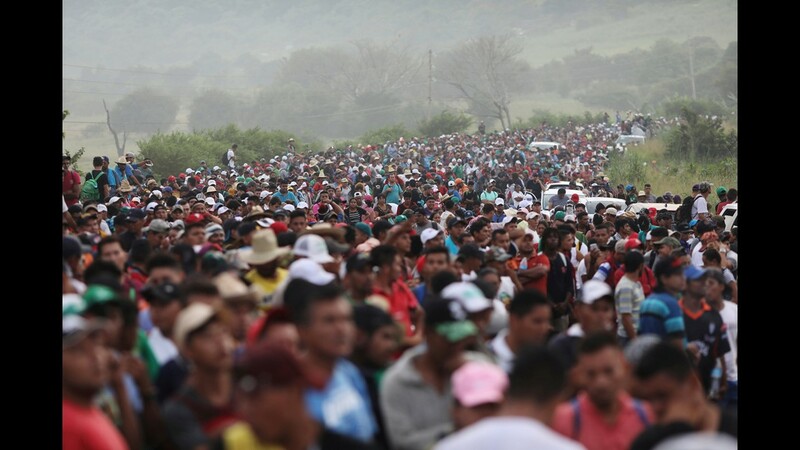 The caravan, estimated to include more than 7,000 people, had advanced but still faced more than 1,000 miles, and likely much further, to the end of the journey. 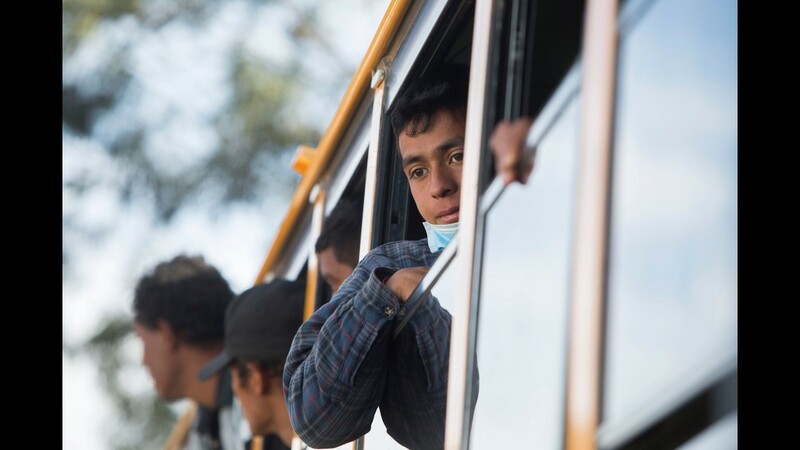 Honduran migrants who were heading to the U.S., get on a bus to return to their country, after abandoning the caravan in Ciudad Tecun Uman, Guatemala, border with Mexico. 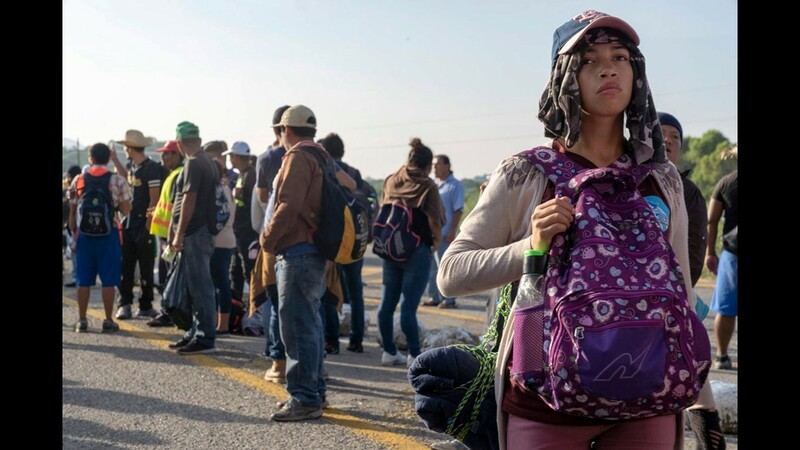 - At least 25 Hondurans taking part in the migrant caravan, returned back to their country after reaching the Guatemalan border with Mexico. 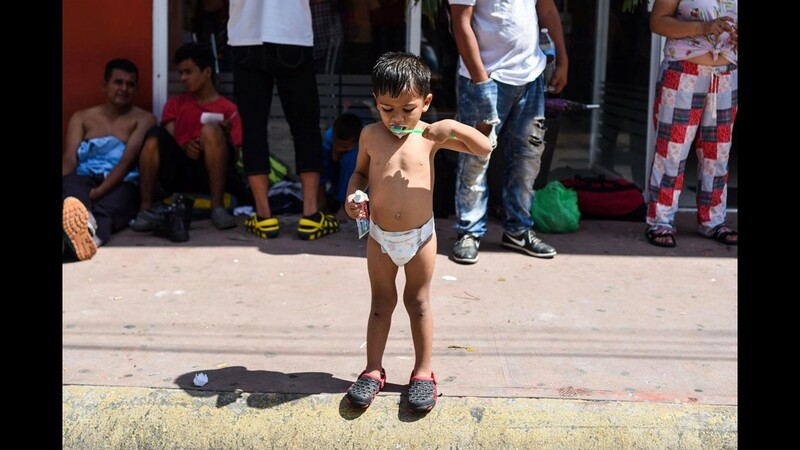 A Honduran migrant child brushes his teeth during a stop in their journey, in Huixtla, Chiapas state, Mexico, on Tuesday. 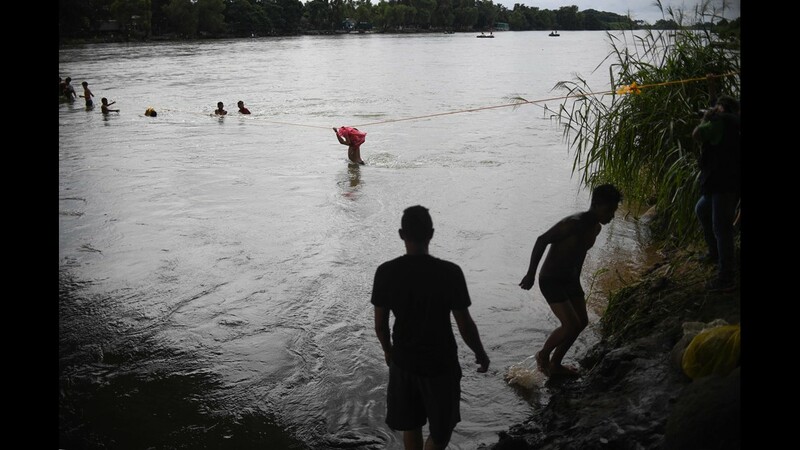 Honduran migrants taking part in a caravan heading to the U.S., take a bath in the Huixtla river, in Huixtla, Chiapas state, Mexico. 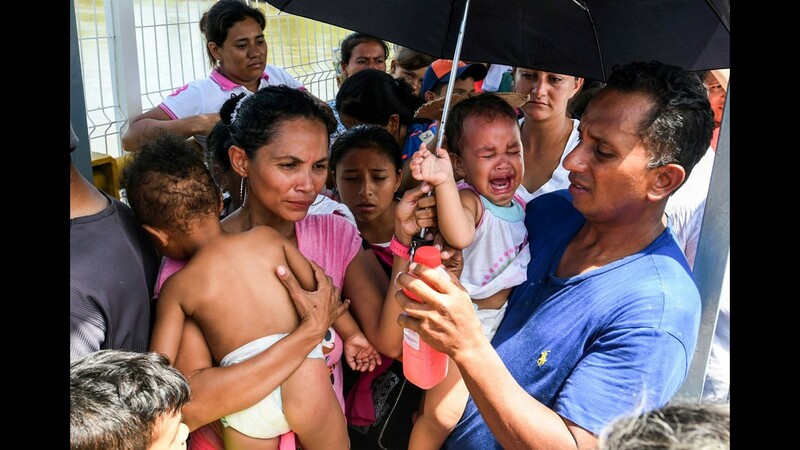 Forced by the violence and poverty of their country, desperate parents have exposed hundreds of babies and children to travel in a migrant caravan crossing Mexico to the United States, showing the cruelest face of this "exodus". 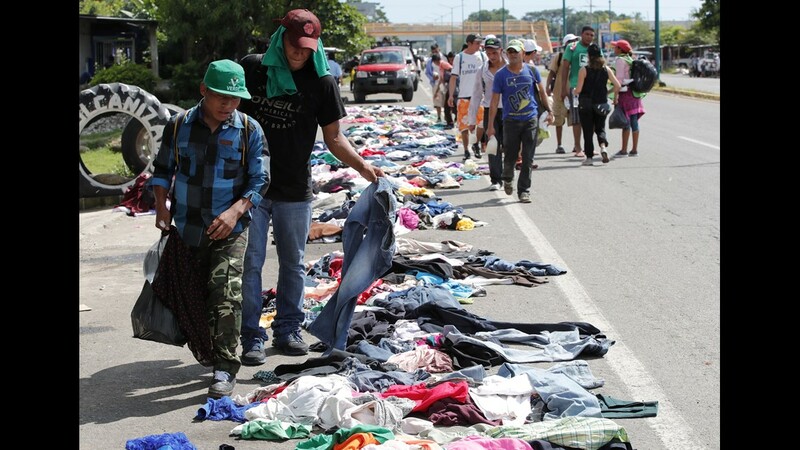 Migrants select clothing placed along the road by Mexican citizens during their journey to the United States, in Huixtla, Mexico. 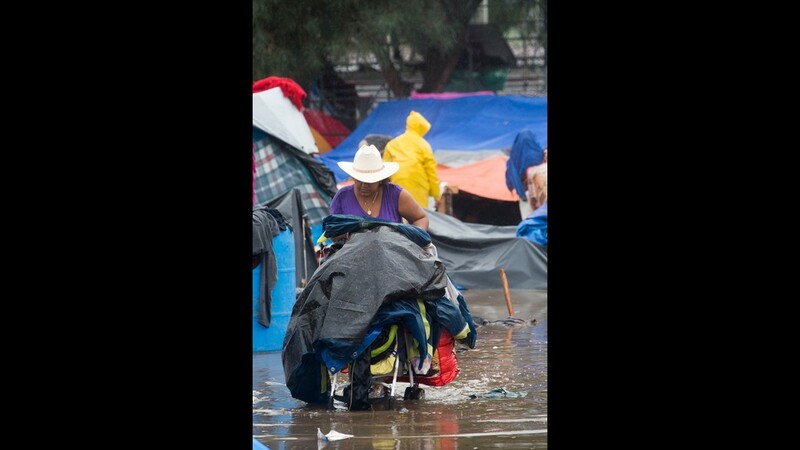 Hundreds of Mexicans distribute, altruistically from vehicles or on foot, food, water, medicine or clothing. 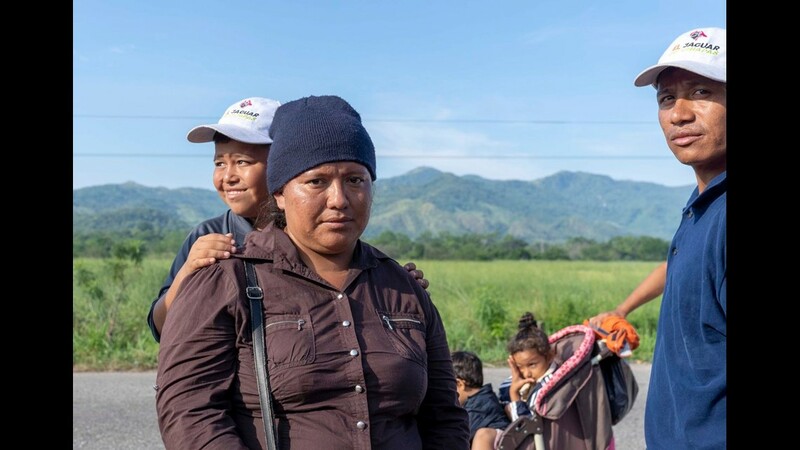 'The heart hurts when you see the children and there we feel the humanity of them, and how the Government does nothing', says Reina Lucia Ochoa, an inhabitant of the southeastern state of Chiapas. 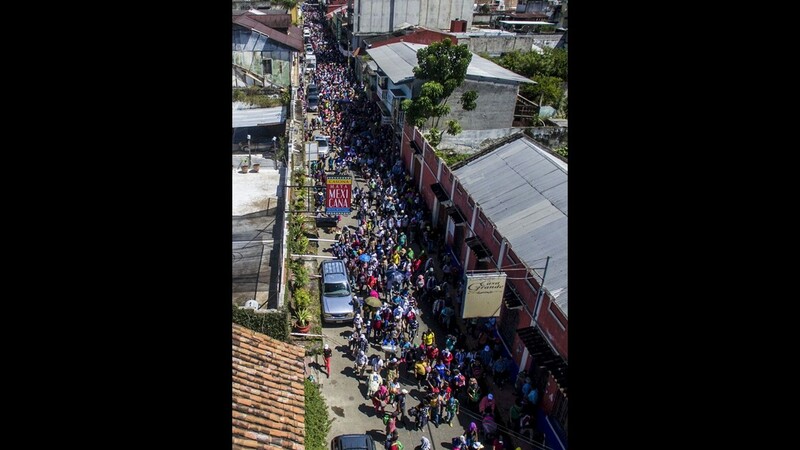 Migrants queue, Tuesday, to receive food during a stop in their journey, in Huixtla, Chiapas state, Mexico. 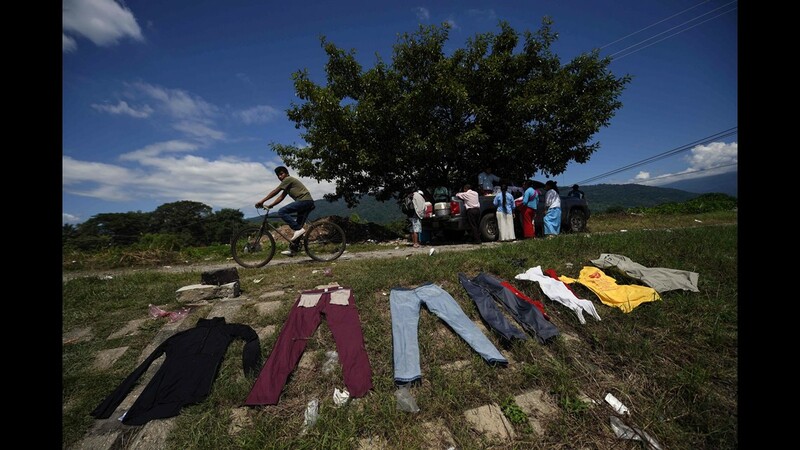 Clothes dry in the sun by the bank of the Huixtla river, in Huixtla, Chiapas state, Mexico. 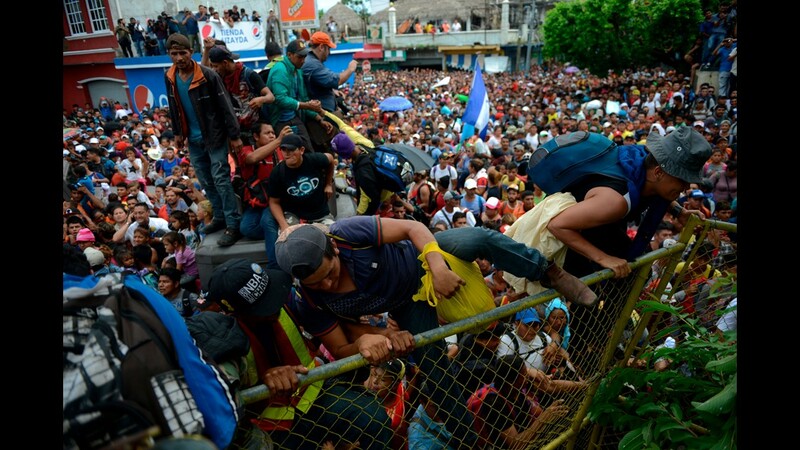 Thousands of mainly Honduran migrants head to the United States -- a caravan President Donald Trump has called an "assault on our country." 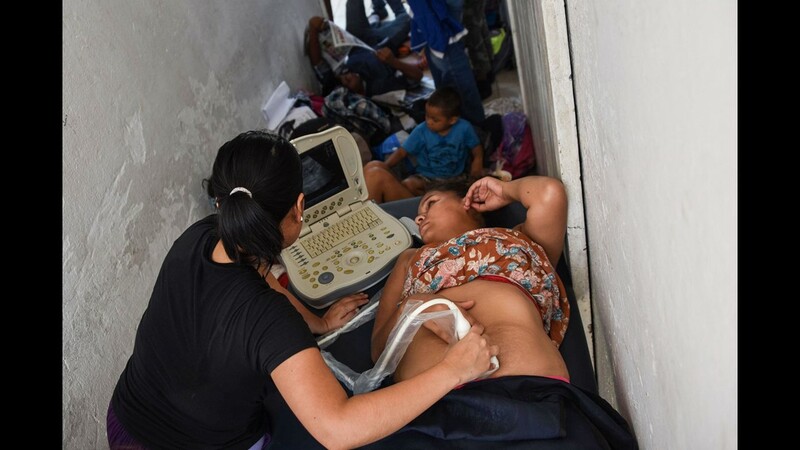 A Honduran migrant woman has an ultrasound done to check his pregnancy, on Tuesday, during a stop in their journey at the Central Park in Huixtla, Chiapas state, Mexico. 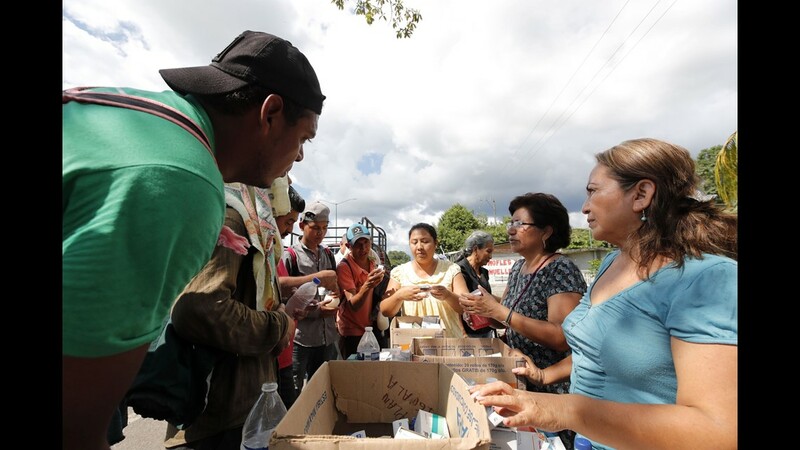 Mexican citizens distribute medicines to Honduran migrants, Tuesday, during their journey to the United States, in Huixtla, Mexico. 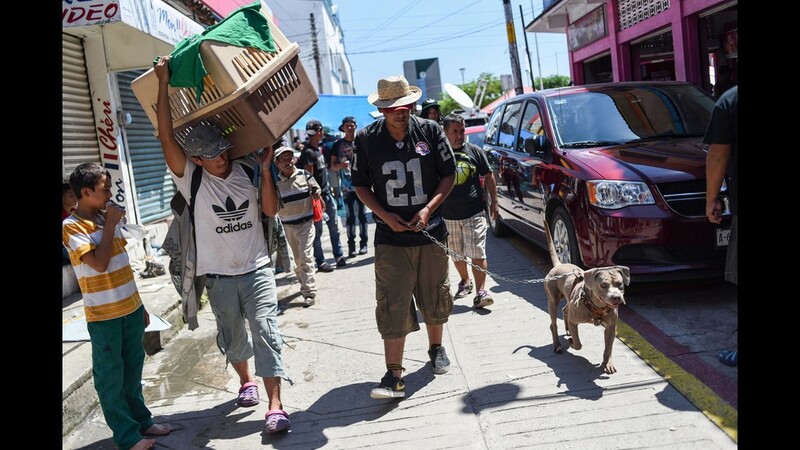 Honduran migrant, Luis Lopez, taking part in a caravan heading to the U.S., walks with his dog during a stop in their journey, in Huixtla, Chiapas state, Mexico. 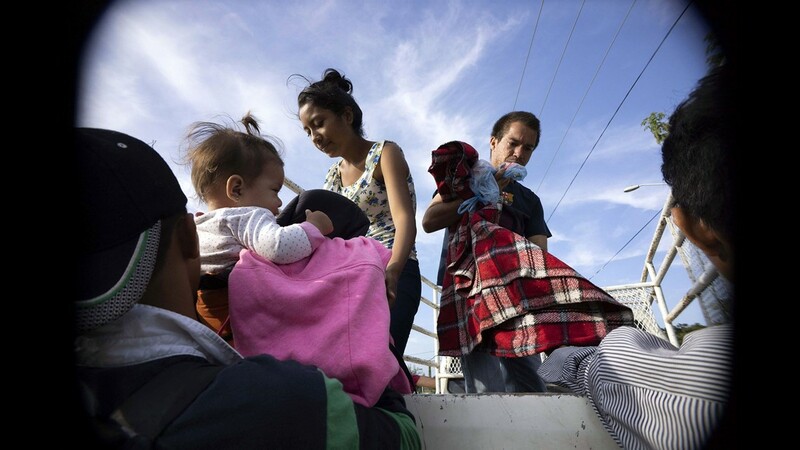 A Honduran migrant couple and their five kids taking part in a caravan heading to the US, wait to cross the border from Ciudad Tecun Uman in Guatemala, to Ciudad Hidalgo, Mexico, on Oct. 22, 2018. 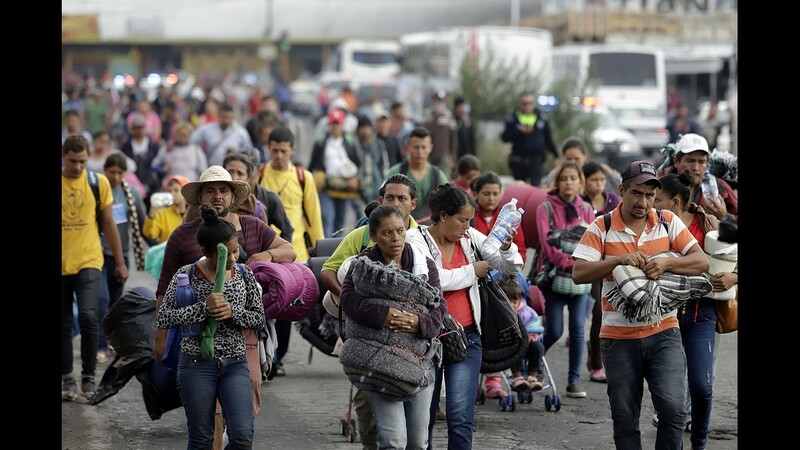 President Donald Trump on Monday called the migrant caravan heading toward the US-Mexico border a national emergency, saying he has alerted the US border patrol and military. 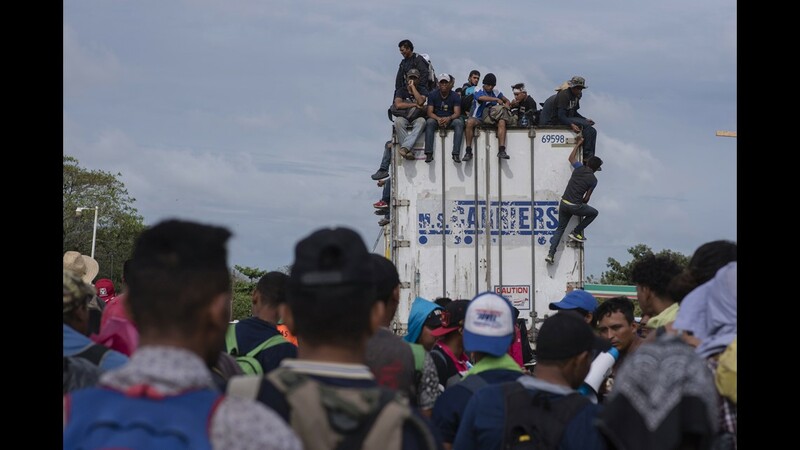 Honduran migrants taking part in a caravan heading to the US, aboard a truck in Metapa on their way to Tapachula, Chiapas state, Mexico, Monday. 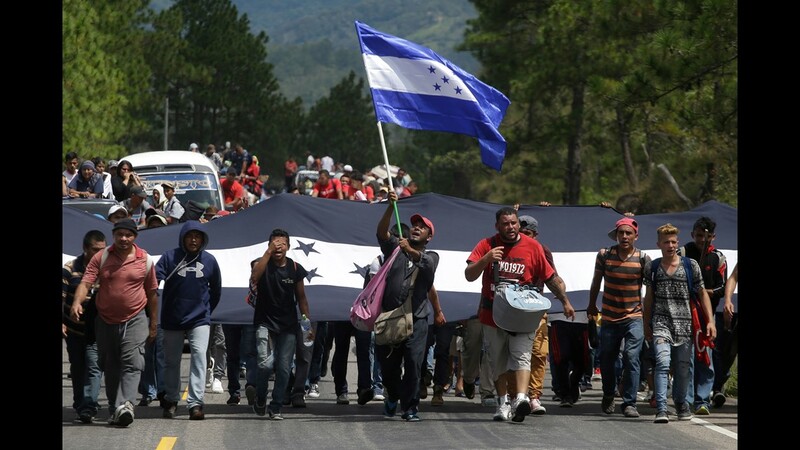 Migrants take part in a new caravan, Monday, heading to the US with Honduran and Guatemalan national flags in Quezaltepeque, Chiquimula, Guatemala. 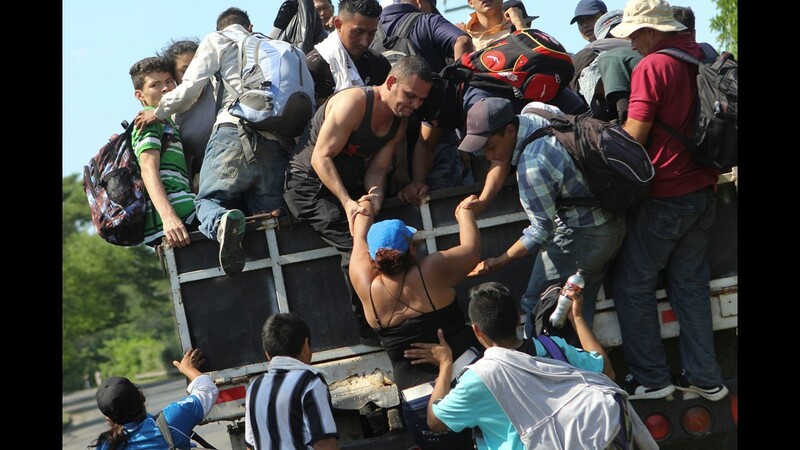 A truck in Metapa takes Honduran migrants on their way to Tapachula, Chiapas state, Mexico. 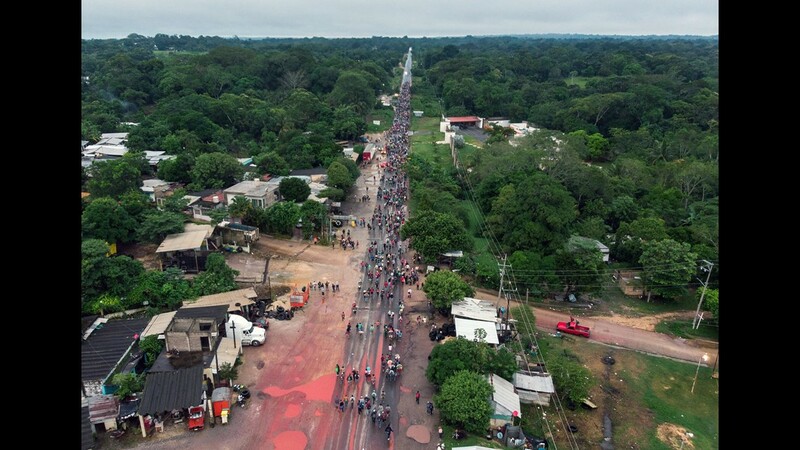 An aerial view of Honduran migrants heading in a caravan to the US, Sunday, on the road linking Ciudad Hidalgo and Tapachula, Chiapas state, Mexico. 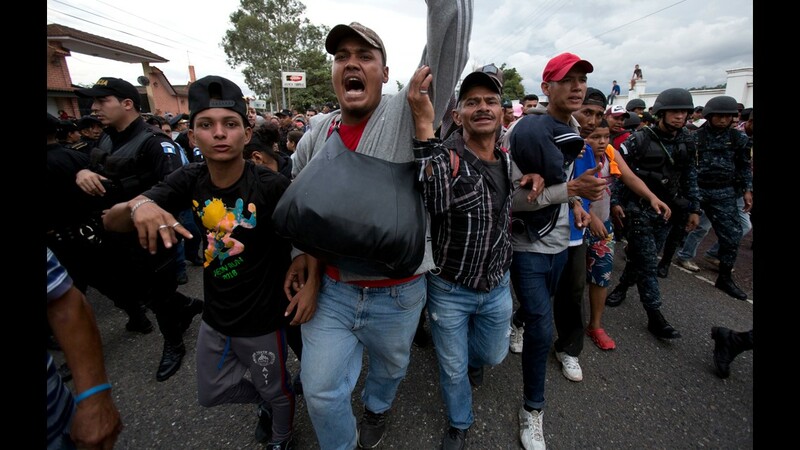 President Trump called the caravan's approach a national emergency and said he has alerted the US border patrol and military, setting the stage for a confrontation when the swelling mass of migrants reach the border. "We will now begin cutting off, or substantially reducing, the massive foreign aid" that the United States provides to Guatemala, Honduras and El Salvador, he said. 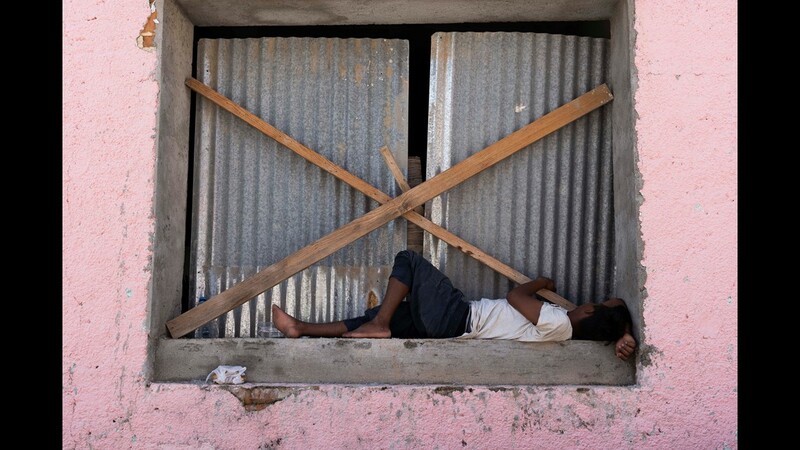 A Honduran migrant rests as he waits to cross the border from Ciudad Tecun Uman in Guatemala, to Ciudad Hidalgo, Mexico. A mirant rests in a tent at the International Mesoamerican Fair's venue in Tapachula, Chiapas state, Mexico. 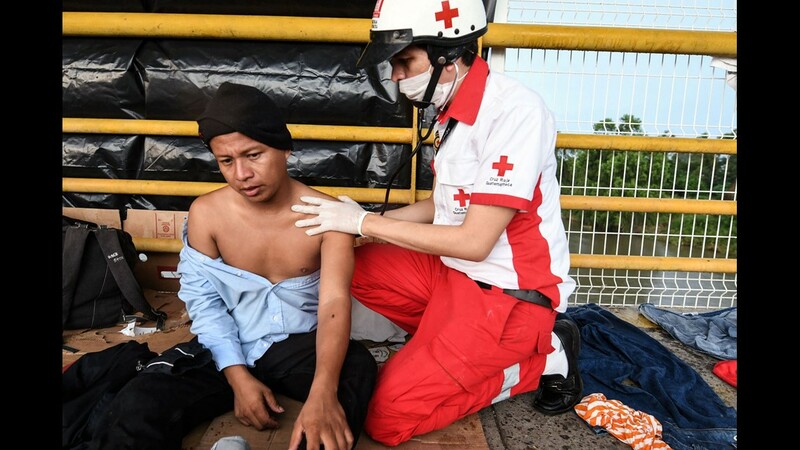 A member of the Guatemalan Red Cross attends an Honduran migrant heading in a caravan to de US, in Ciudad Tecun Uman, Guatemala. 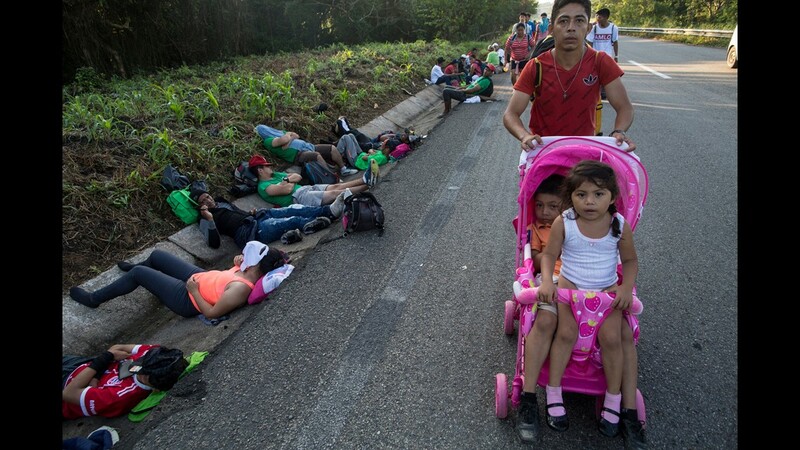 Migrants are heading in a caravan to the US, in Tapachula, Chiapas state, Mexico, Monday. Migrant activist Irineo Mujica, center, holds a megaphone as a Central American migrant speak to reporters during a press conference in Tapachula, Mexico, Monday, Oct. 22, 2018. "It is a shame that a president so powerful uses this caravan for political ends," said Mujica of the group Pueblo Sin Fronteras or People Without Borders, which works to provide humanitarian aid to migrants. 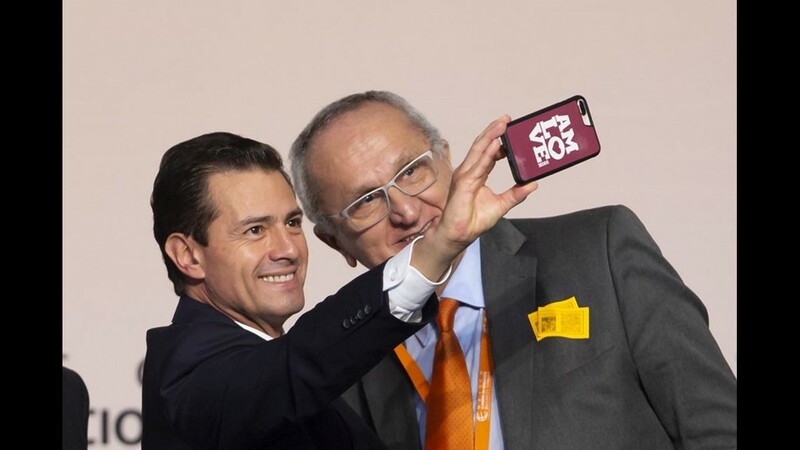 Mexican President Enrique Pena Nieto takes a selfie with the next negotiator of the North American Free Trade Agreement (NAFTA) Jesus Seade Kuri (R) during the 17th Mexico Business Summit 'Facing the strategic challenges of Mexico and the Region', at the Guadalajara Expo, in Jalisco, Mexico, Monday. Pena Nieto warned that the Central American migrants of the caravan heading to the United States who do not respect the law will be unable to reach the country or remain in Mexico. Construction workers are seen by a reinforced section of the U.S.-Mexico border fence in Tijuana, Baja Calif. state, Mexico. 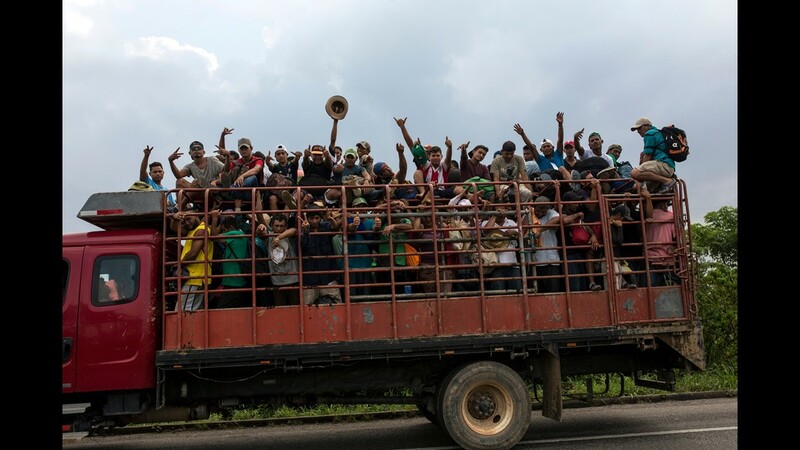 Migrants onboard a truck take part in a caravan heading to the US, near Huehuetan, on their way from Tapachula to Huixtla, Chiapas state, Mexico. 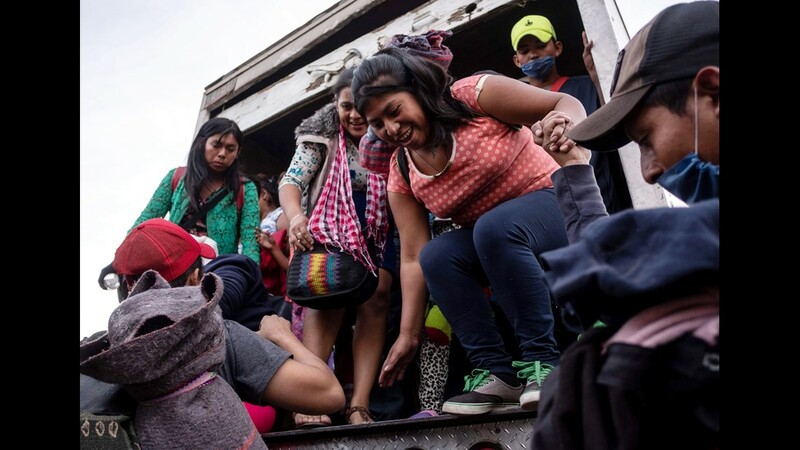 Migrants packed in the bed of a truck take part in a caravan heading to the US, near Huehuetan, on their way from Tapachula to Huixtla, Chiapas state, Mexico. 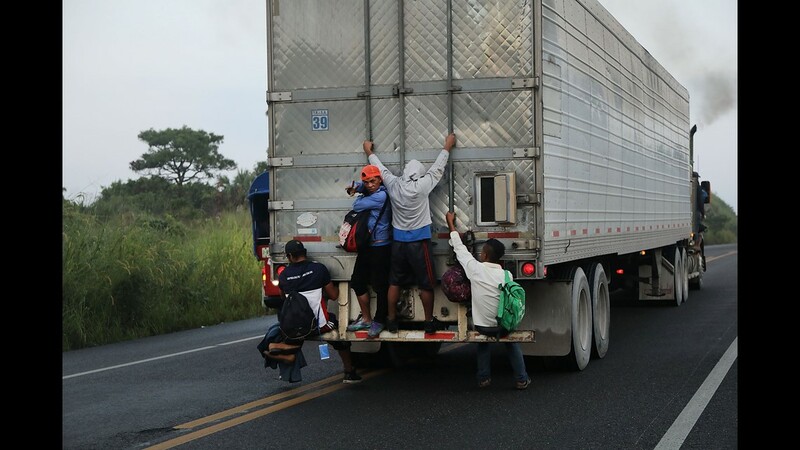 Miigrants hitch a ride on a truck as they take part in a caravan heading to the US, in the outskirts of Tapachula, on their way to Huixtla, Chiapas state, Mexico. Migrants to the wait to cross the border from Ciudad Tecun Uman in Guatemala, to Ciudad Hidalgo, Mexico, Monday. Caravan participants bathe using water from a fire hydrant at the main plaza in Tapachula, Mexico, Monday. 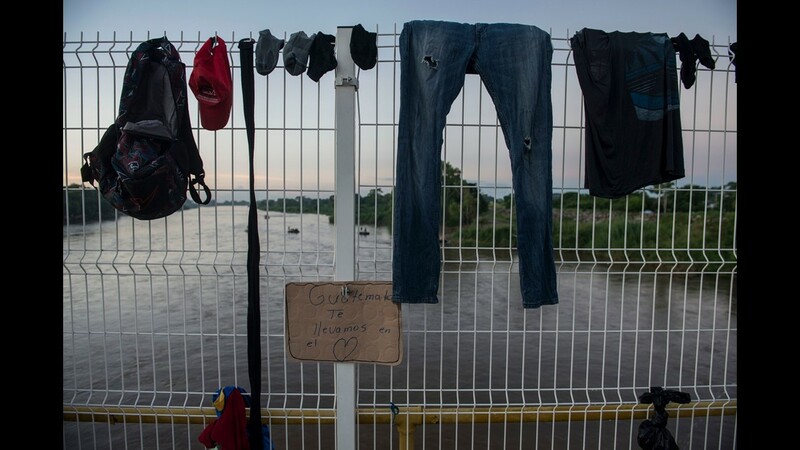 Clothes belonging to a Honduran migrant hangs to dry on the fence of a border bridge that stretches over the Suchiate River, connecting Guatemala and Mexico, in Tecun Uman, Guatemala, Monday. Hundreds of migrants, who are part of a caravan bound for the U.S.-Mexico border are waiting on the border bridge to be attended by Mexican immigration authorities. 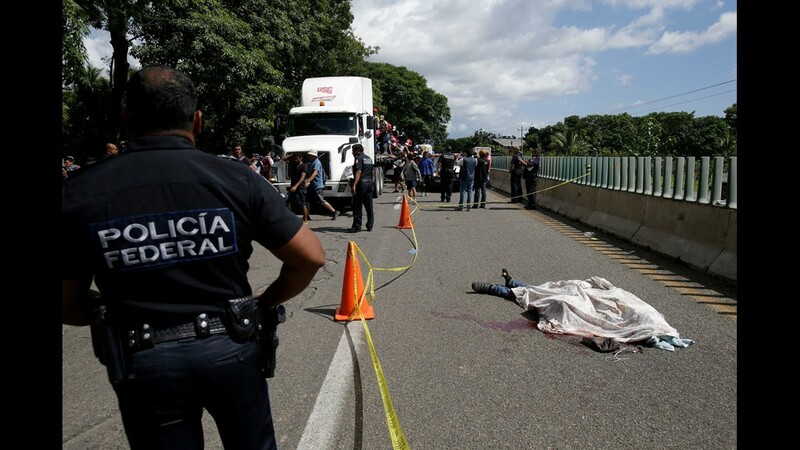 A Central American migrant, who fell from the back of a moving vehicle and died, lies on a highway covered by a sheet outside of Tapachula, Mexico, Monday. 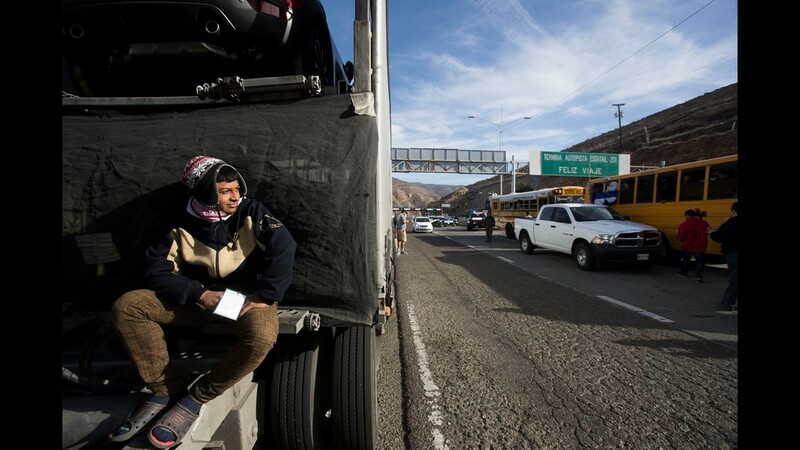 Motorists in pickups and other vehicles have been offering the Central American migrants rides, often in overloaded truck beds, as the group of about 7,000 people heads to the U.S. border. 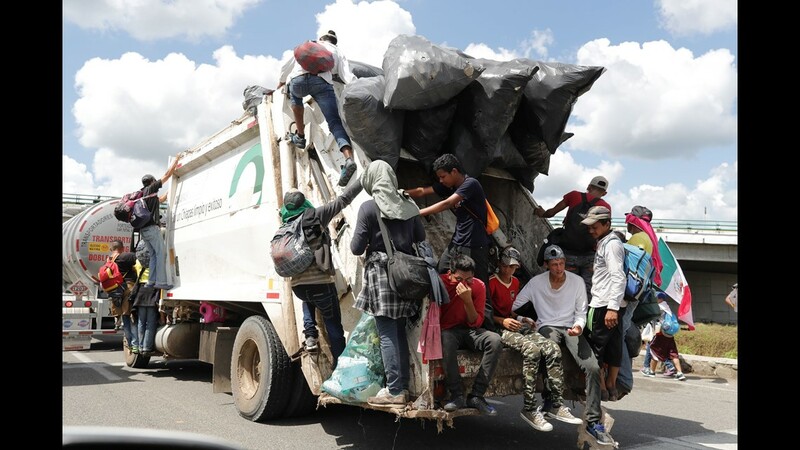 Migrants hitch rides on all sorts of on vehicles, as they continue on another stretch of Mexican territory towards the United States, in this case a garbage truck. 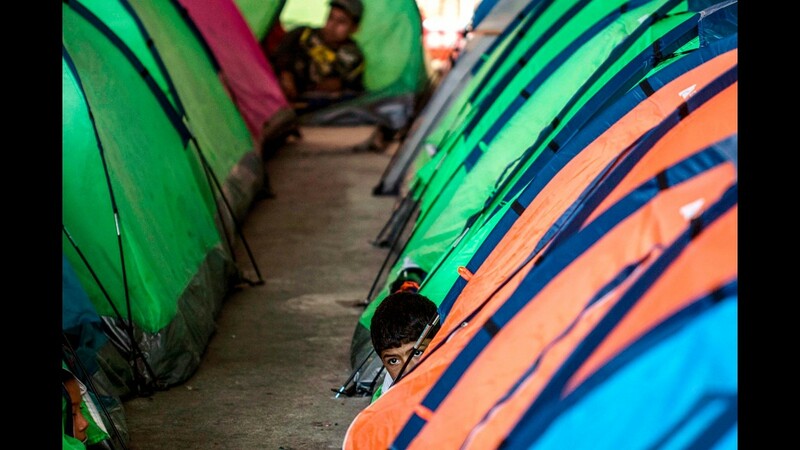 A Mexican migrant boy remains next to tents at a shelter in Tijuana, Baja California state, Mexico, in the border with the US. 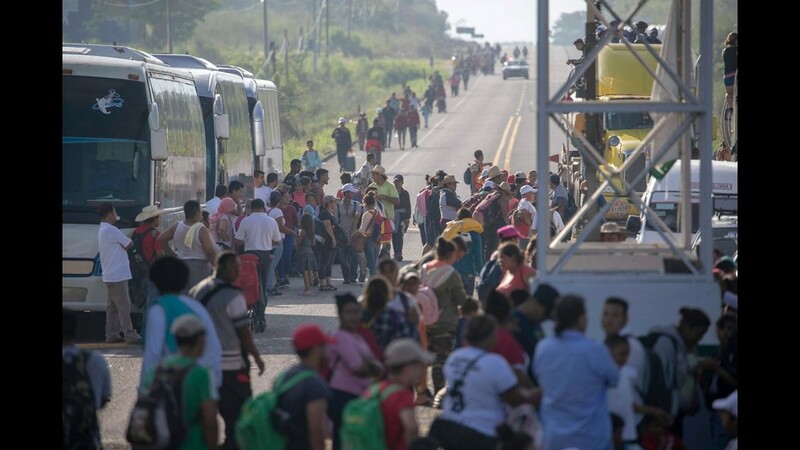 Honduran migrants heading in a caravan to the US, arrive in Ciudad Hidalgo, Chiapas state, Mexico after crossing the Suchiate River from Guatemala, on October 20, 2018. 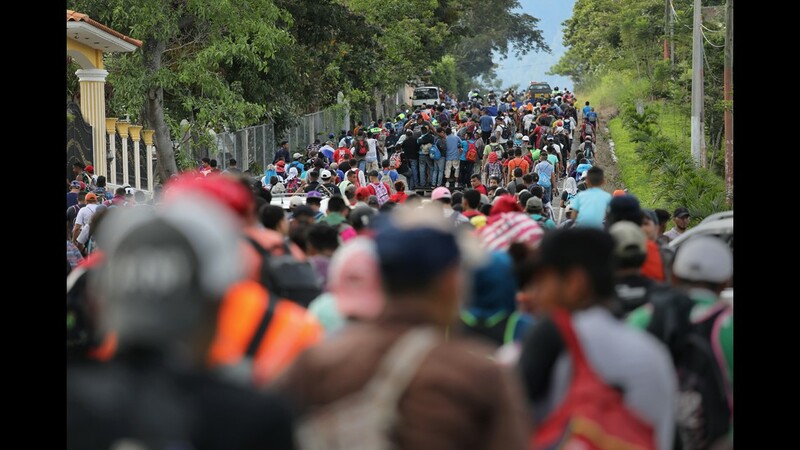 - Thousands of migrants who forced their way through Guatemala's northwestern border and flooded onto a bridge leading to Mexico, where riot police battled them back, on Saturday waited at the border in the hope of continuing their journey to the United States. epa07110455 Honduran migrants wait at the border bridge between Guatemala and Mexico in Tecun Uman, Guatemala, 21 October 2018. 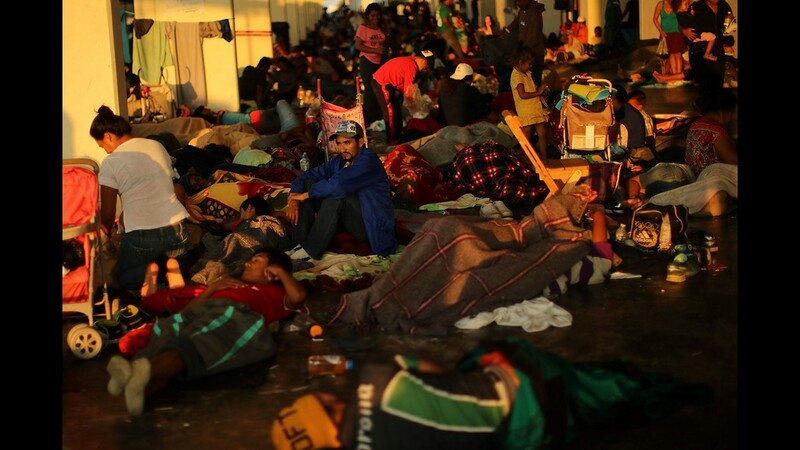 Around 200 Honduran migrants spent the night on the bridge between Guatemala and Mexico. 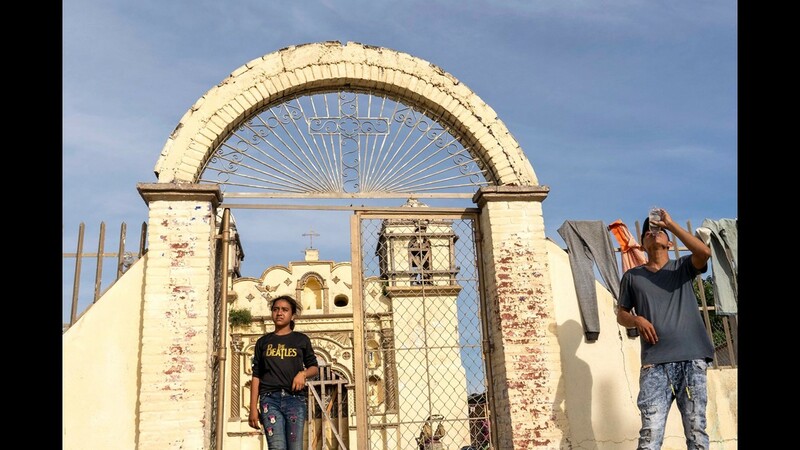 People, including children, are still waiting to enter Mexican territory and continue their journey to the United States, as many thousands have done before. 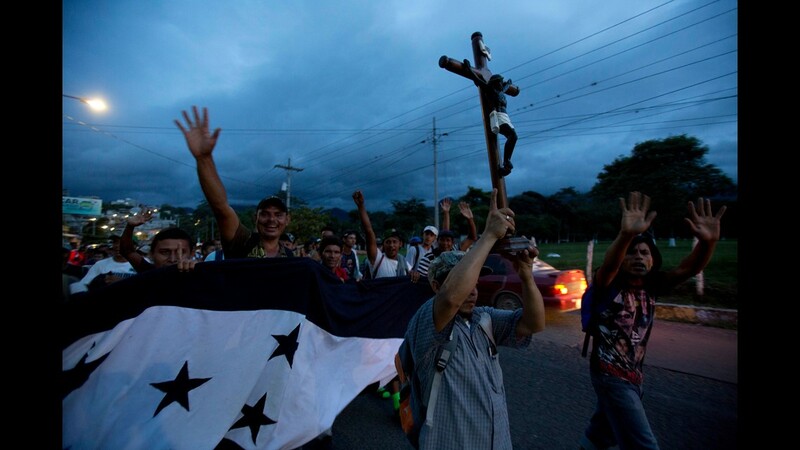 Honduran migrants take part in a caravan heading to the US on the road linking Ciudad Hidalgo and Tapachula, Chiapas state, Mexico on October 21, 2018. 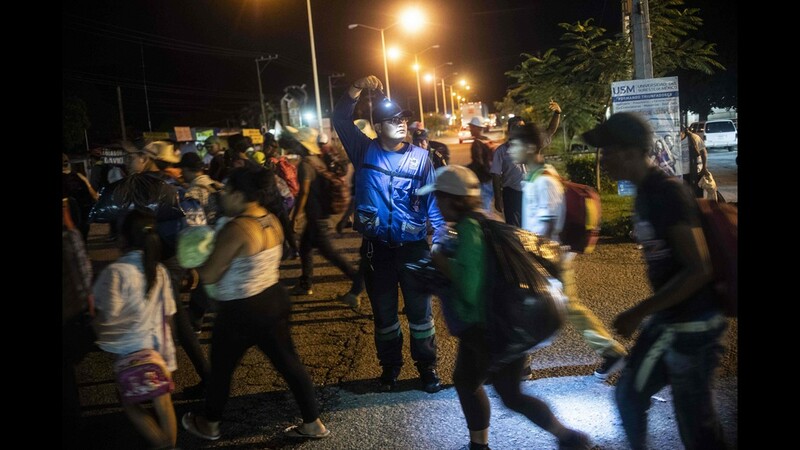 - Thousands of Honduran migrants resumed their march toward the United States on Sunday from the southern Mexican city of Ciudad Hidalgo, AFP journalists at the scene said. A Honduran migrant covers his face with sunscreen standing over a bridge that stretches over the Suchiate River connecting Guatemala and Mexico, in Tecun Uman, Guatemala, Sunday, Oct. 21, 2018. 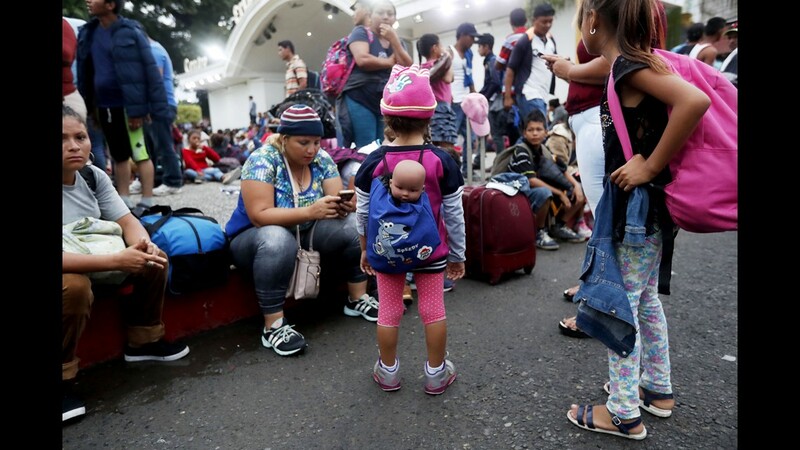 Guatemala's migration agency confirmed that another group of about 1,000 migrants crossed into the country from Honduras on Sunday. 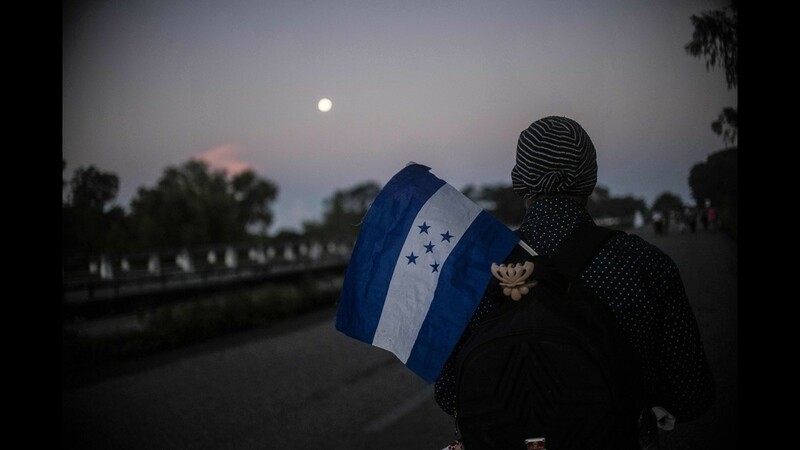 A migrant heading in a caravan to the US, holds Mexican, US and Honduran national flags on the road linking Ciudad Hidalgo and Tapachula, Chiapas state, Mexico, on October 21, 2018. 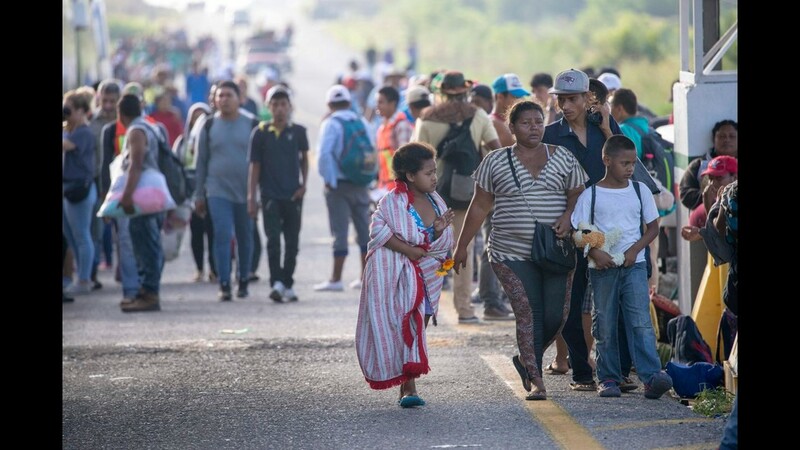 - Thousands of Honduran migrants resumed their march toward the United States on Sunday from the southern Mexican city of Ciudad Hidalgo, AFP journalists at the scene said. 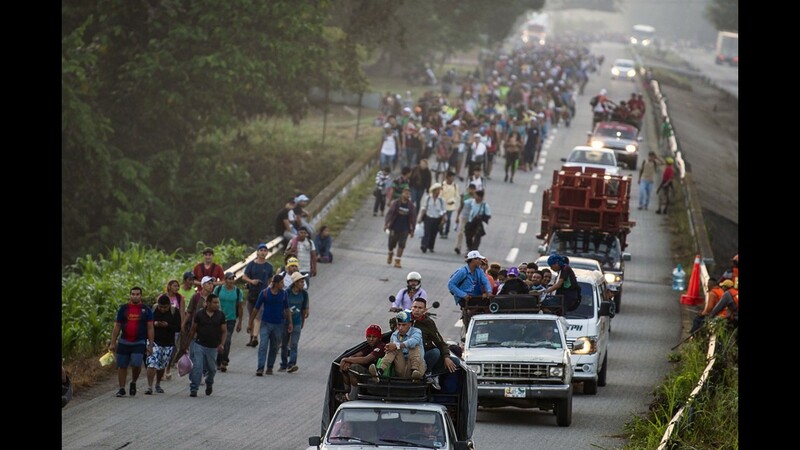 Honduran migrants take part in a caravan heading to the US on the road linking Ciudad Hidalgo and Tapachula, Chiapas state, Mexico, Oct. 21, 2018.Thousands of Honduran migrants resumed their march toward the United States on Sunday from the southern Mexican city of Ciudad Hidalgo, according to news reports. 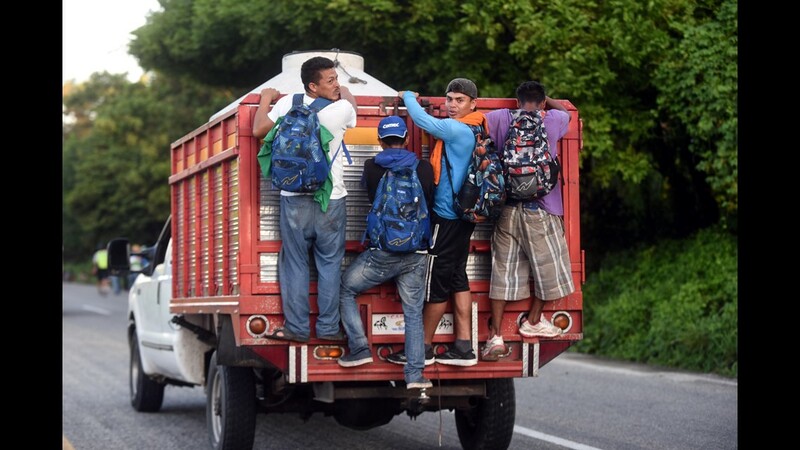 Honduran migrants take part in a caravan heading to the US on the road linking Ciudad Hidalgo and Tapachula, Chiapas state, Mexico, Oct. 21, 2018. 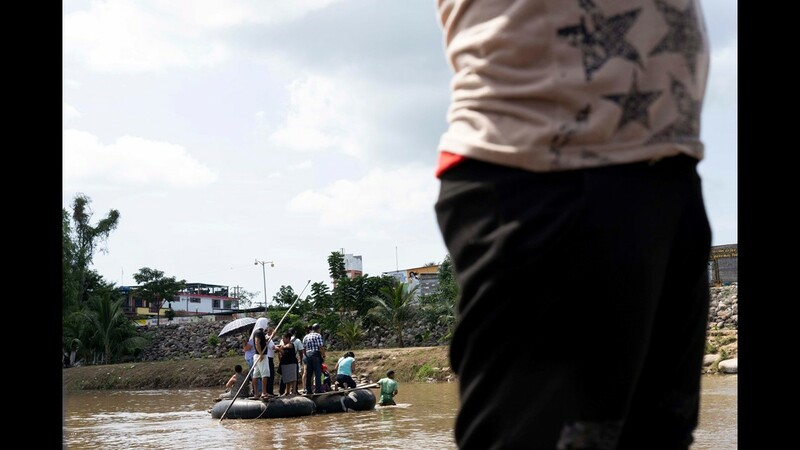 Honduran migrants taking part in a caravan heading to the US, cross the Suchiate River, the natural border between Guatemala and Mexico, in makeshift rafts, in Ciudad Tecun Uman, Guatemala, Oct. 21, 2018. 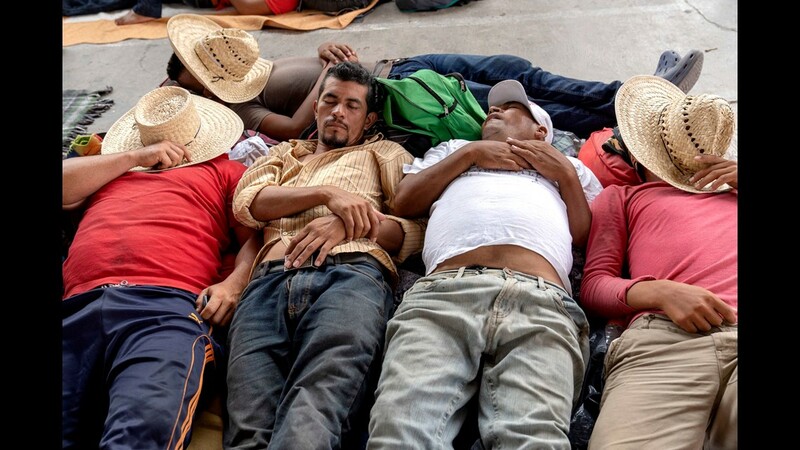 Honduran migrants taking part in a caravan heading to the US, rest on the border of Guatemala and Mexico, in Ciudad Tecun Uman, Guatemala, Oct. 21, 2018. 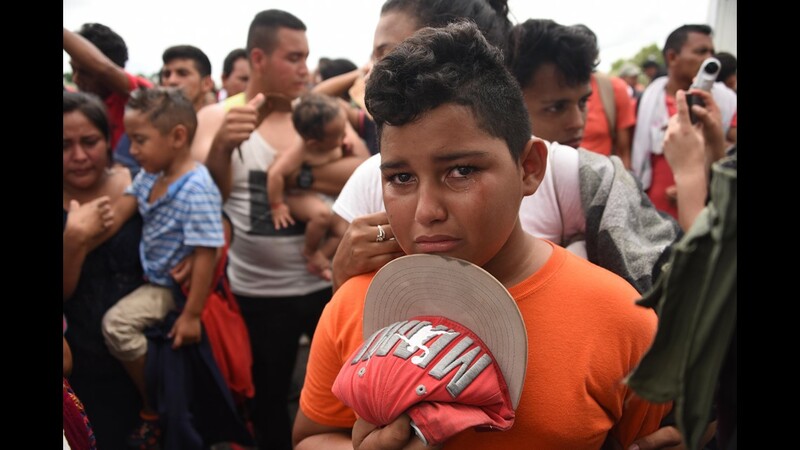 A Honduran migrant boy taking part in a caravan heading to the U.S., cries as he waits on the Guatemala-Mexico border bridge, in Ciudad Tecun Uman, Guatemala, Oct. 20, 2018. 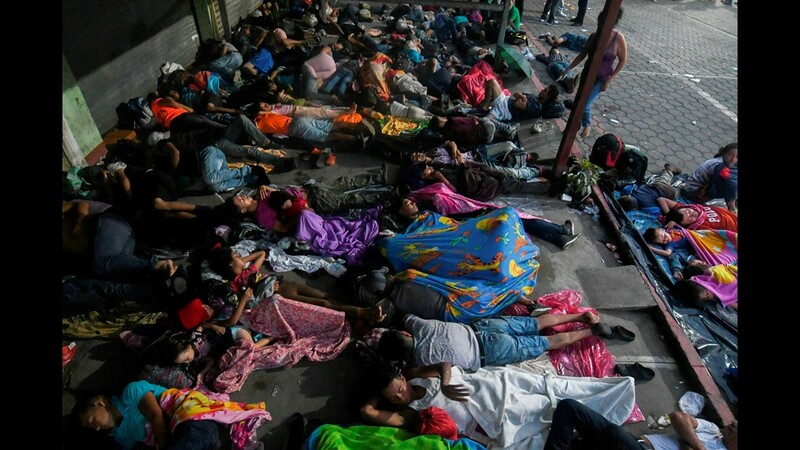 Honduran migrants taking part in a caravan heading to the US, sleep in the main square of Ciudad Tecun Uman, Guatemala, in the border with Mexico, on Oct. 20, 2018. 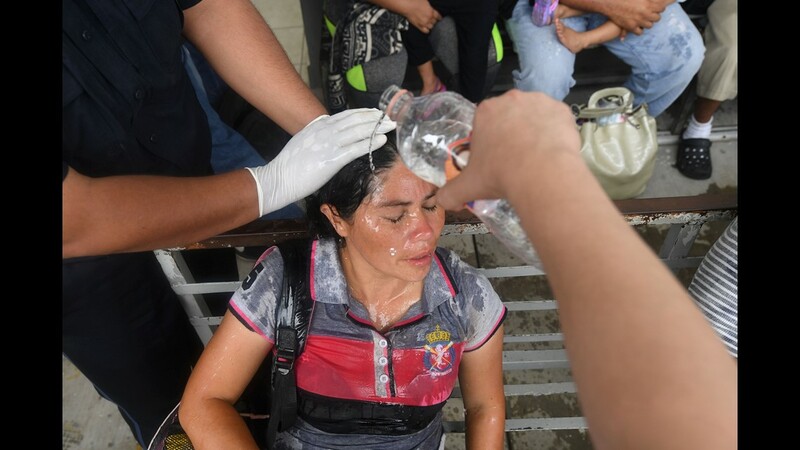 Thousands of migrants who forced their way through Guatemala's northwestern border and flooded onto a bridge leading to Mexico, where riot police battled them back, on Saturday waited at the border in the hope of continuing their journey to the United States. 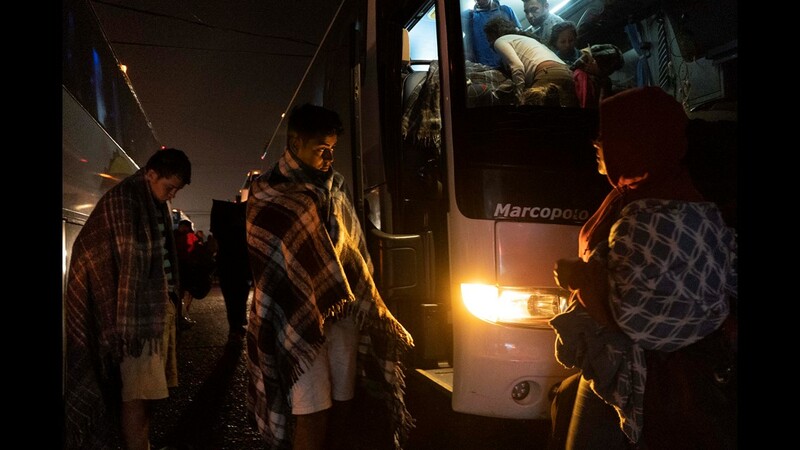 Honduran migrants, who were taking part in a caravan heading to the US, board a bus to return to Honduras, in Ciudad Tecun Uman, Guatemala, on Oct. 20, 2018. 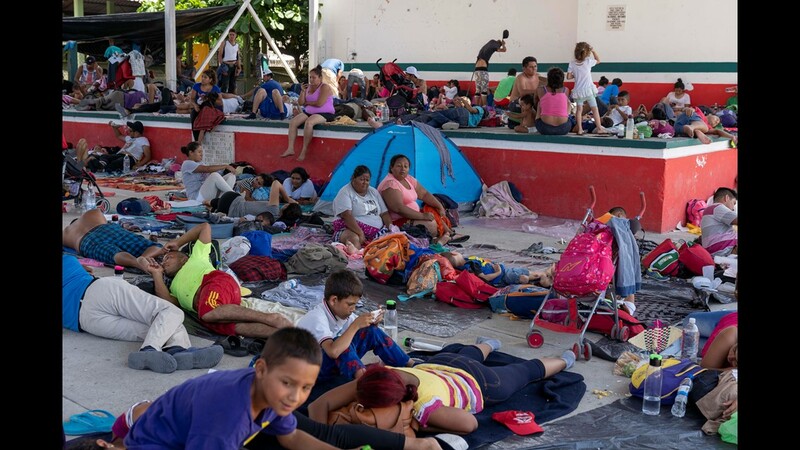 Some 220 Honduran migrants were returning to their country and some 130 were waiting at a shelter Saturday, according to a police source, while thousands who forced their way through Guatemala's northwestern border and flooded onto a bridge leading to Mexico, were waiting at the border in the hope of continuing their journey. 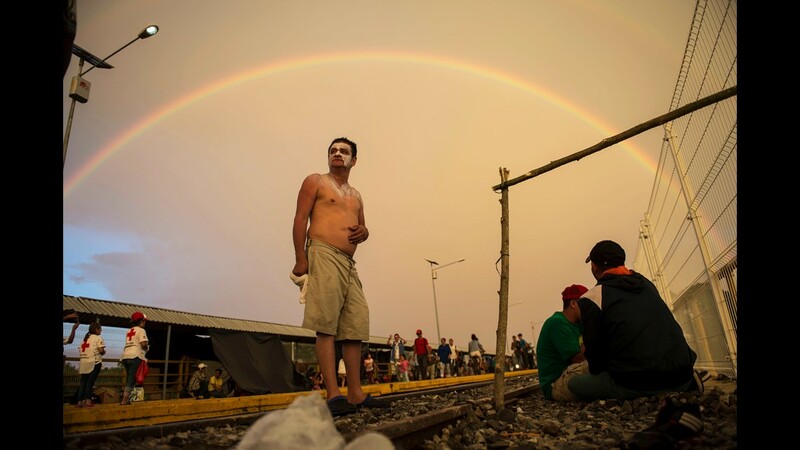 A Honduran migrant heading in a caravan to the US, prepares to jump to the Suchiate River from the Guatemala-Mexico international border bridge, near Mexican Federal Police officers, in Ciudad Hidalgo, Chiapas state, Mexico, on Oct. 20, 2018. 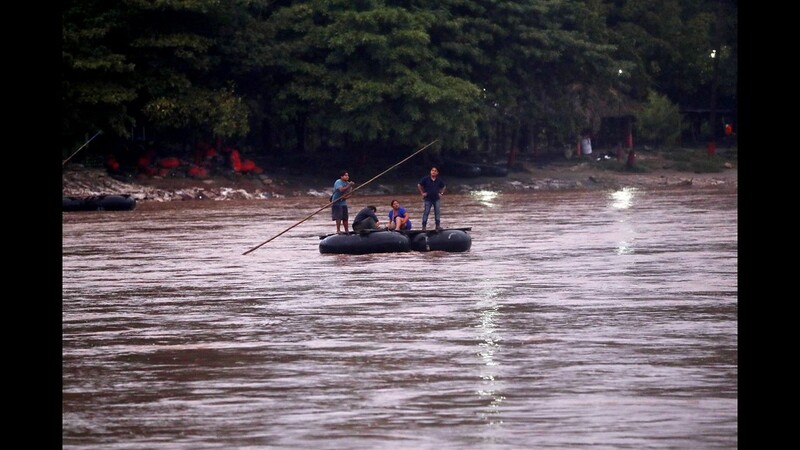 A Mexican Federal Police officer stands guard on the bank of the Suchiate River in Ciudad Hidalgo, Chiapas state, Mexico, while a caravan of Honduran migrants heading to the US tries to get to Mexican territory from Guatemala, on Oct. 20, 2018. 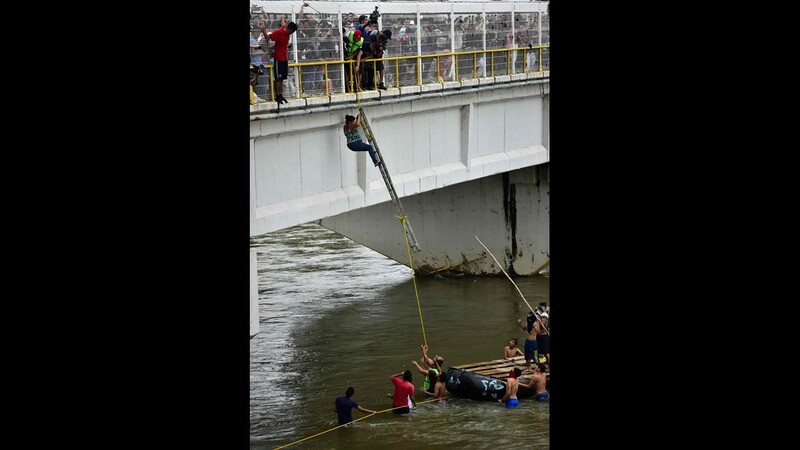 Honduran migrants heading in a caravan to the US, cross the Suchiate River, natural border between Guatemala and Mexico, helped by a rope, in Ciudad Hidalgo, Chiapas state, Mexico, on Oct. 20, 2018. 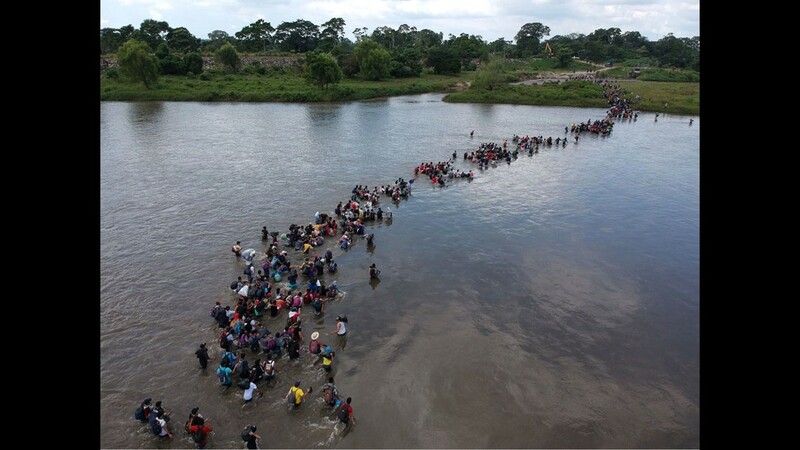 Honduran migrants heading in a caravan to the US, help others get down to the Suchiate River from the Guatemala-Mexico international border bridge, in Ciudad Hidalgo, Chiapas state, Mexico, on Oct. 20, 2018. 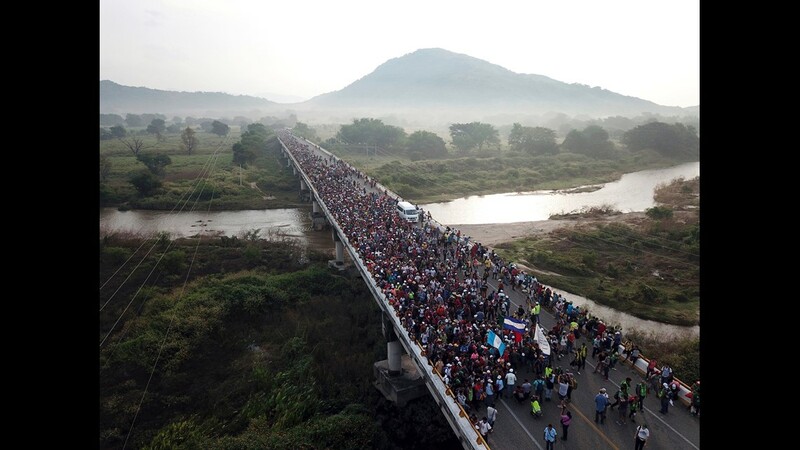 Aerial view of a Honduran migrant caravan heading to the US, on the Guatemala-Mexico international border bridge in Ciudad Hidalgo, Chiapas state, Mexico, on Oct. 20, 2018. 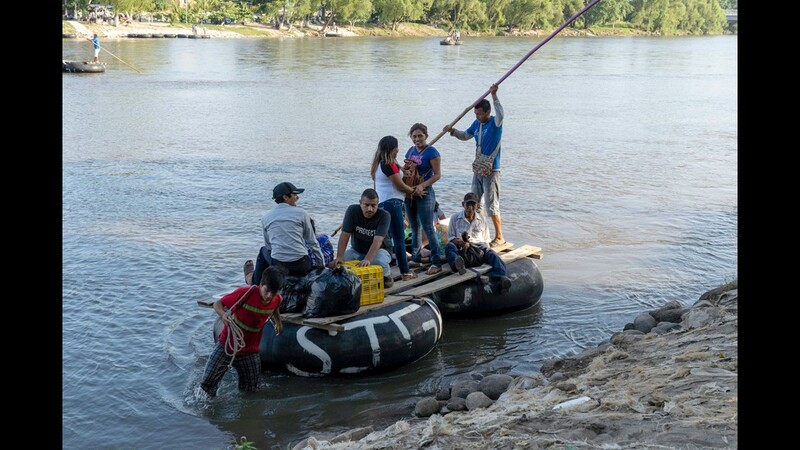 A group of Honduran migrants arrives to the Mexican side of the border after crossing the Suchiate River aboard a raft made out of tractor inner tubes and wooden planks, on the the border with Guatemala, in Ciudad Hidalgo, Mexico, Saturday, Oct. 20, 2018. 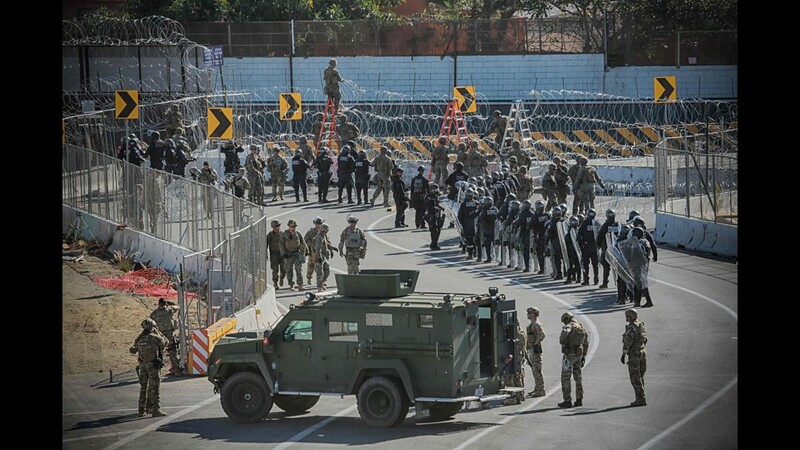 The entry into Mexico via the bridge that connects the two countries has been closed. The main group of migrants have moved about 30 feet back from the gate that separates them from Mexican police to establish a buffer zone. 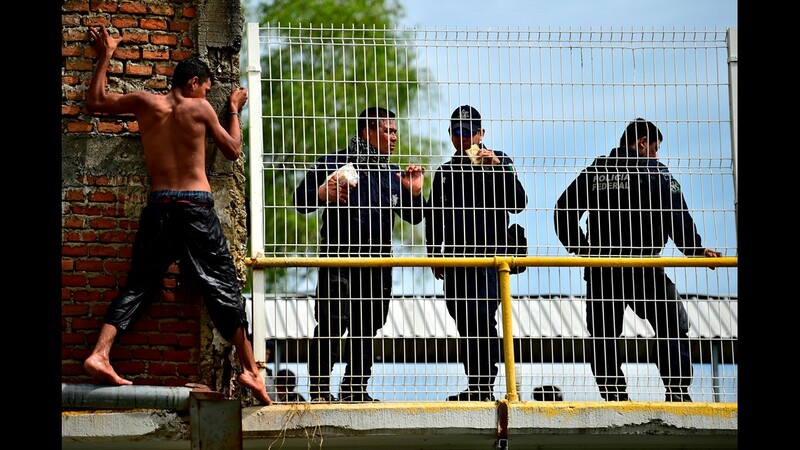 About 1,000 migrants now remain on the bridge between Guatemala and Mexico. 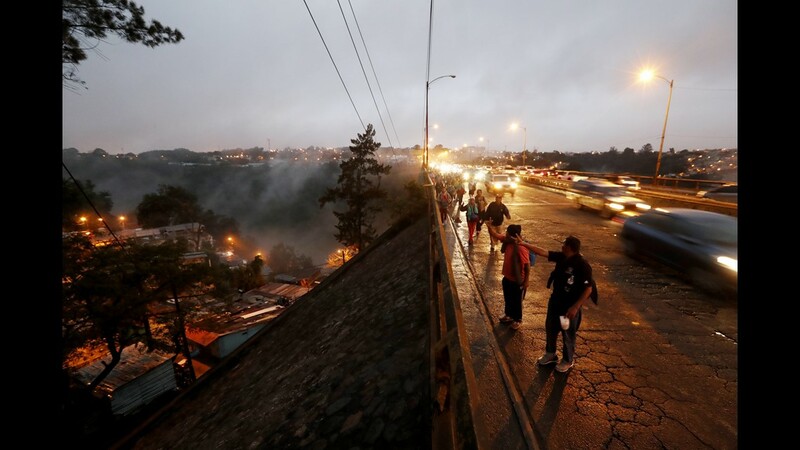 Honduran migrants await access on the bridge that crosses the Suchiate River after crossing the fence on the border with Guatemala to enter Mexico, in Ciudad Hidalgo, Mexico on Oct. 19, 2018. 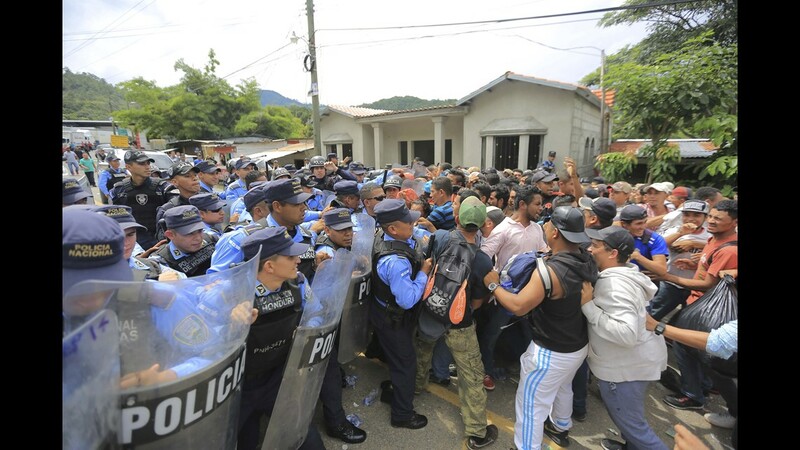 Police try to prevent hundreds of Honduran migrants to cross a police checkpoint to Guatemala, at the Agua Caliente border crossing, in Ocotepeque, Honduras on Oct. 19, 2018. 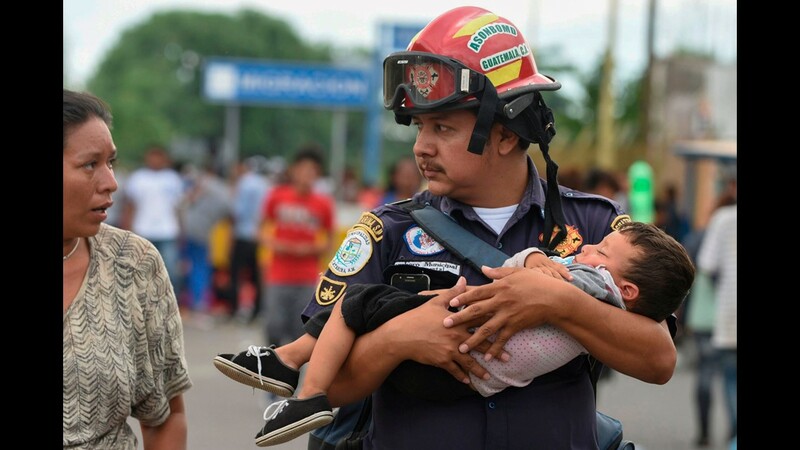 A Guatemalan firefighter carries an ailing baby, as an Honduran migrant caravan heading to the US, reaches the Guatemala-Mexico international bridge in Tecun Uman, Guatemala on Oct. 19, 2018. 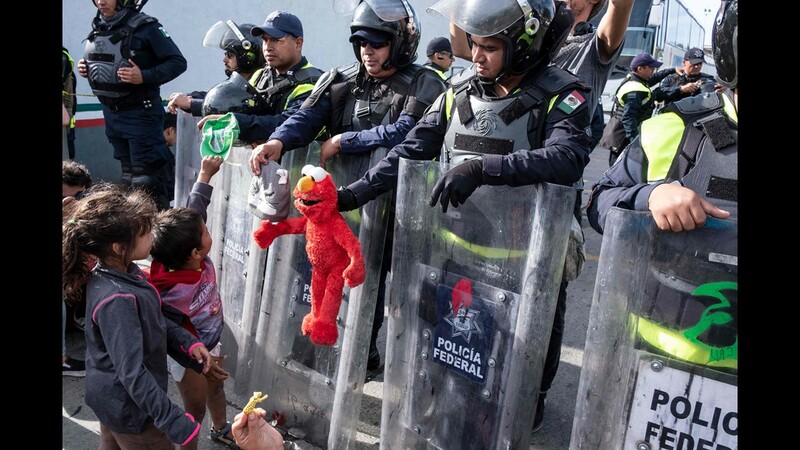 An Honduran migrant heading in a caravan to the US, is cooled down by police officers after struggling to cross one of the gates of the Guatemala-Mexico international border bridge in Ciudad Hidalgo, Chiapas state, Mexico, on Oct. 19, 2018. 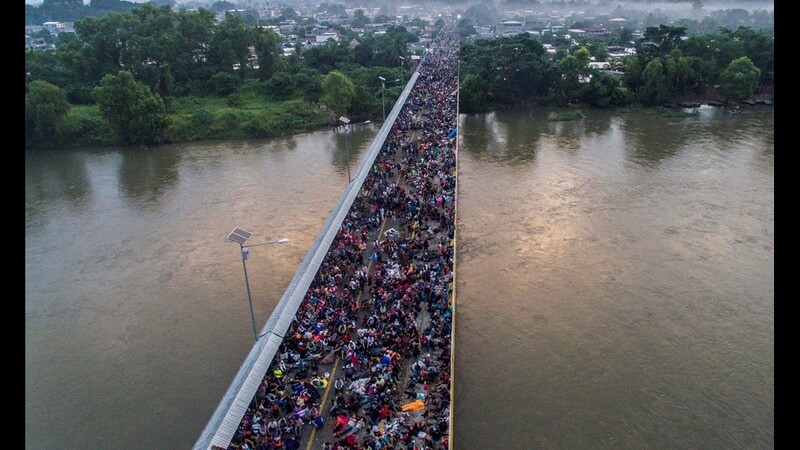 Thousands of Honduran migrants wait for access on the bridge that crosses the Suchiate River after crossing the fence on the border with Guatemala to enter in Ciudad Hidalgo, Mexico on Oct. 19, 2018. 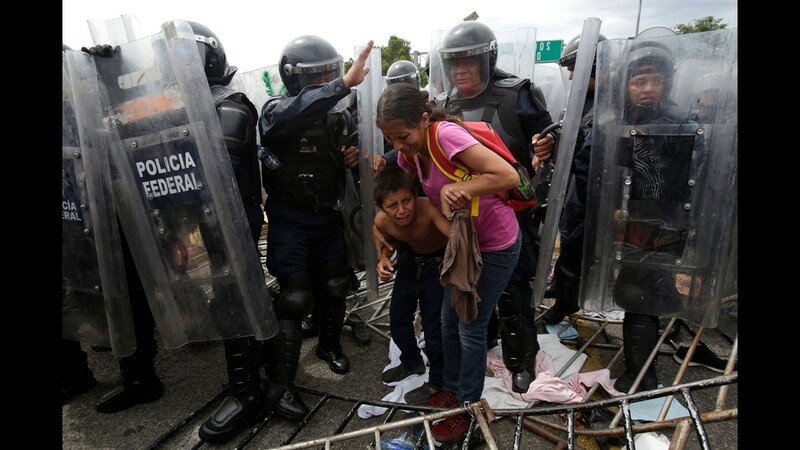 A Honduran migrant mother and child cower in fear as they are surrounded by Mexican Federal Police in riot gear, at the border crossing in Ciudad Hidalgo, Mexico, Friday, Oct. 19, 2018. 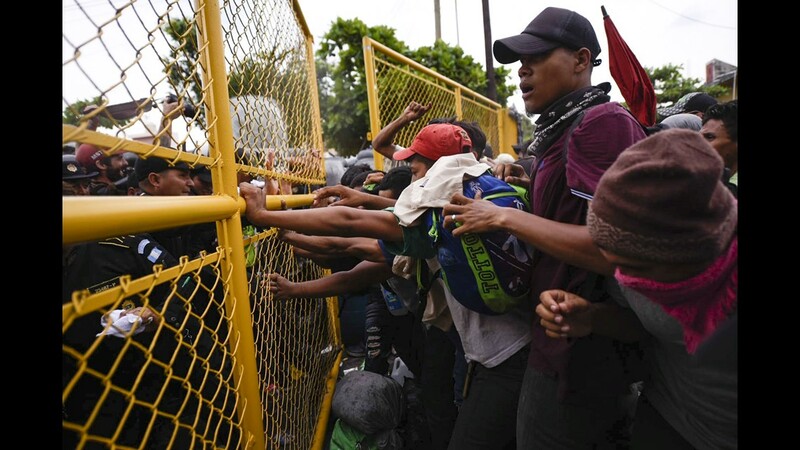 Central Americans traveling in a mass caravan broke through a Guatemalan border fence and streamed by the thousands toward Mexican territory, defying Mexican authorities' entreaties for an orderly migration and U.S. President Donald Trump's threats of retaliation. 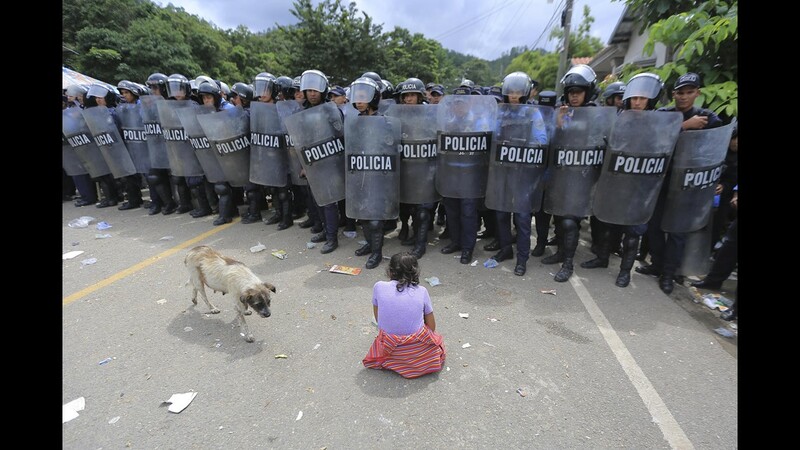 A Honduran migrant girl kneels in front of a police checkpoint at the Agua Caliente border crossing in Ocotepeque, Honduras on Oct. 19, 2018. 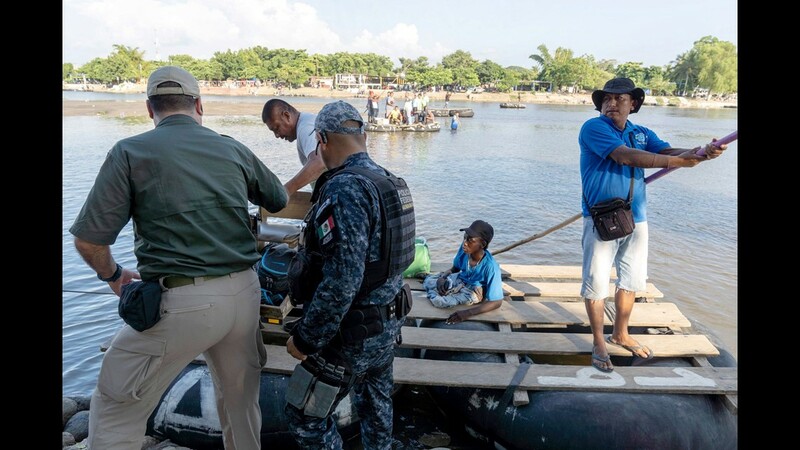 Honduran authorities intensified immigration control measures at the Agua Caliente point, bordering Guatemala, to prevent hundreds of Hondurans seeking to reach the USA from crossing into the neighboring country. Honduran migrants climb a border fence, in Tecun Uman, Guatemala, Friday, Oct. 19, 2018. 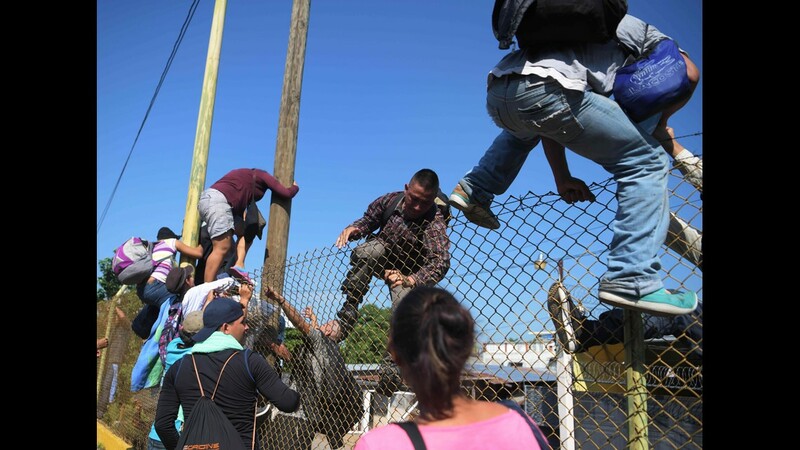 Migrants broke down the gates at the border crossing and began streaming toward a bridge into Mexico. After arriving at the tall, yellow metal fence some clambered atop it and on U.S.-donated military jeeps. Young men began violently tugging on the barrier and finally succeeded in tearing it down. 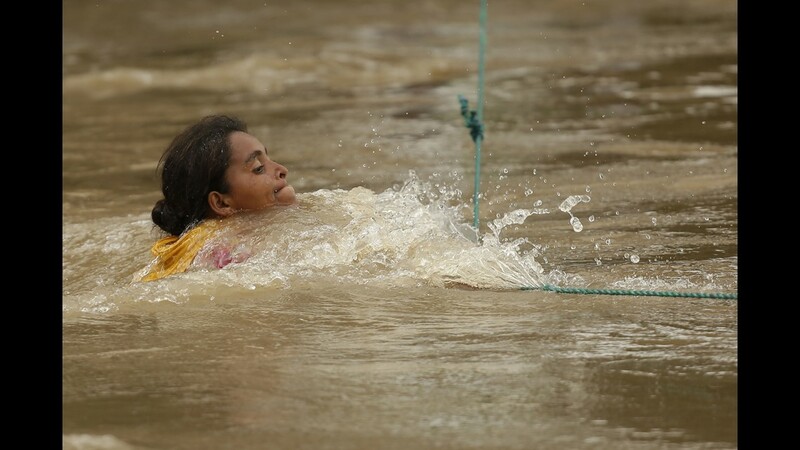 A woman, part of the group of Honduran migrants on the border of Honduras with El Salvador crosses the Goascoran River despite the increased flow caused by intense rains in the last hours, in El Amatillo, eastern Honduras, Oct. 18, 2018. 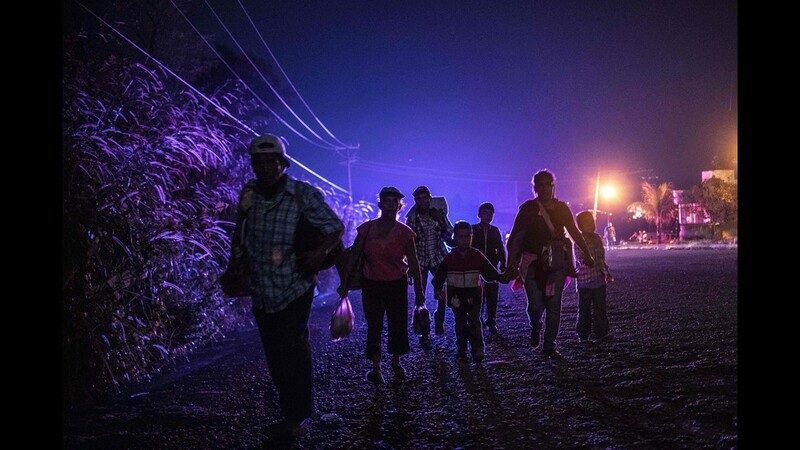 A group of Honduran migrants on the border of Honduras with El Salvador continue their journey to the US at El Amatillo, eastern Honduras, Oct. 18, 2018. 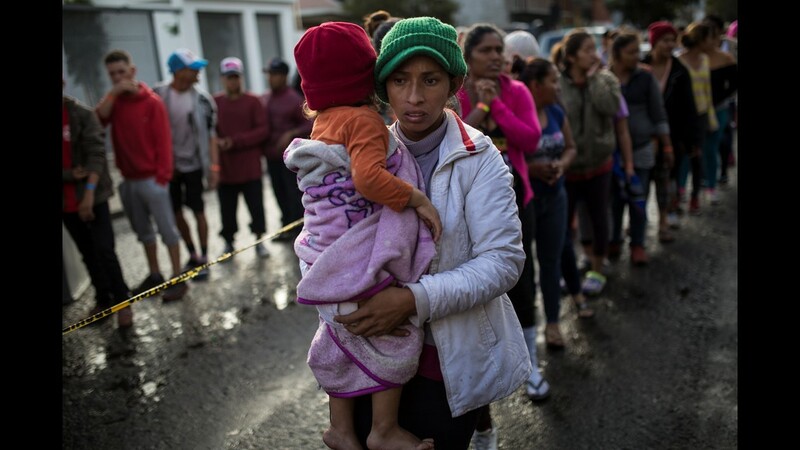 Honduran migrants continue their march to the department of Escuintla to approach the border with Mexico leaving the Casa del Migrante shelter in Guatemala City, Guatemala, Oct. 18, 2018. 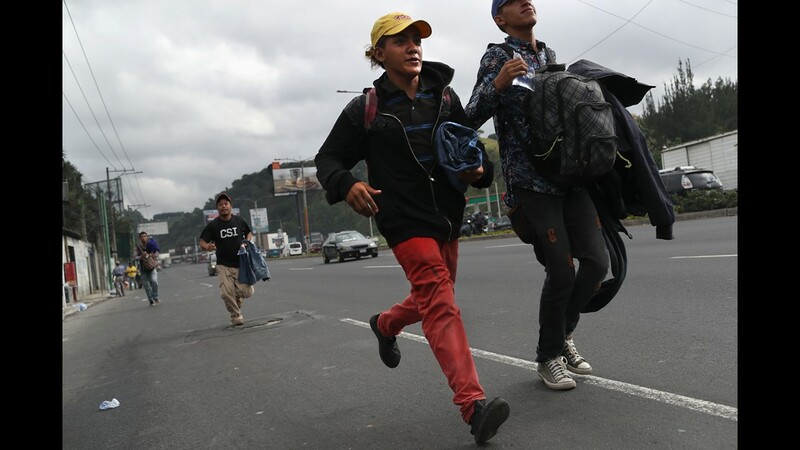 Migrants run to board a bus as part of a caravan of immigrants en route to the Mexican border in Guatemala City, Guatemala. Oct. 18, 2018. 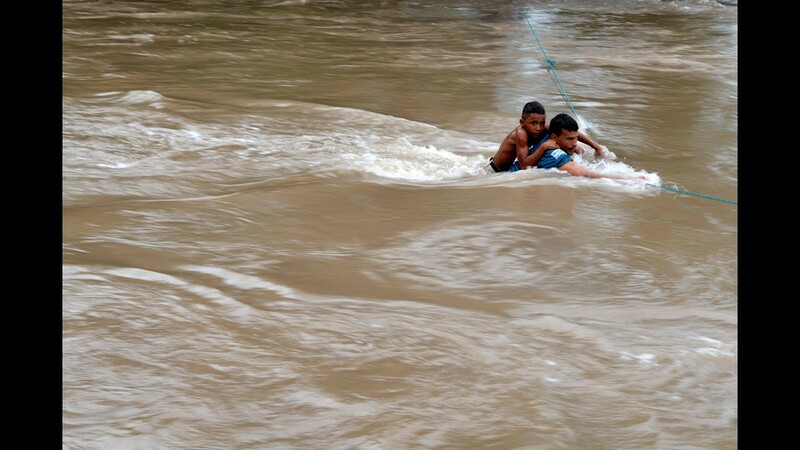 Honduran migrants attempt to cross the border Goascoran River to enter illegally to El Salvador, in Goascoran, Honduras Oct. 18, 2018.